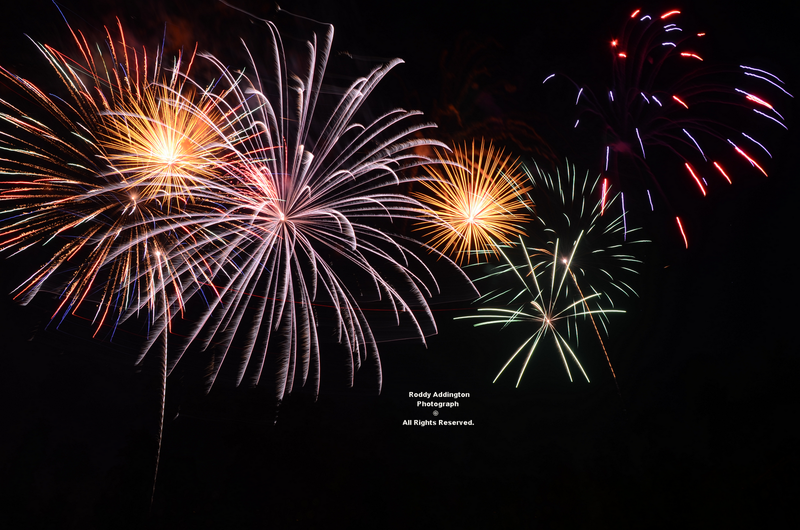 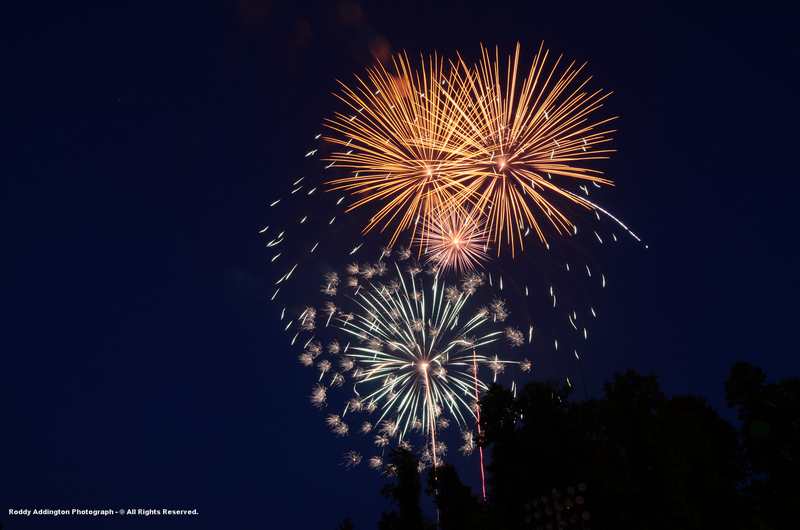 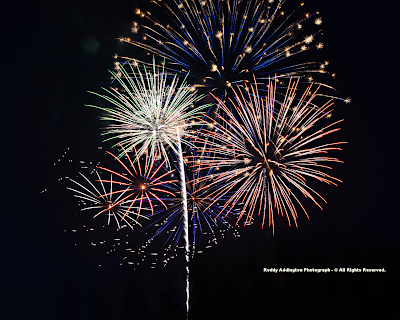 The High Knob Landform: July 2012 - Fireworks & Water!!! 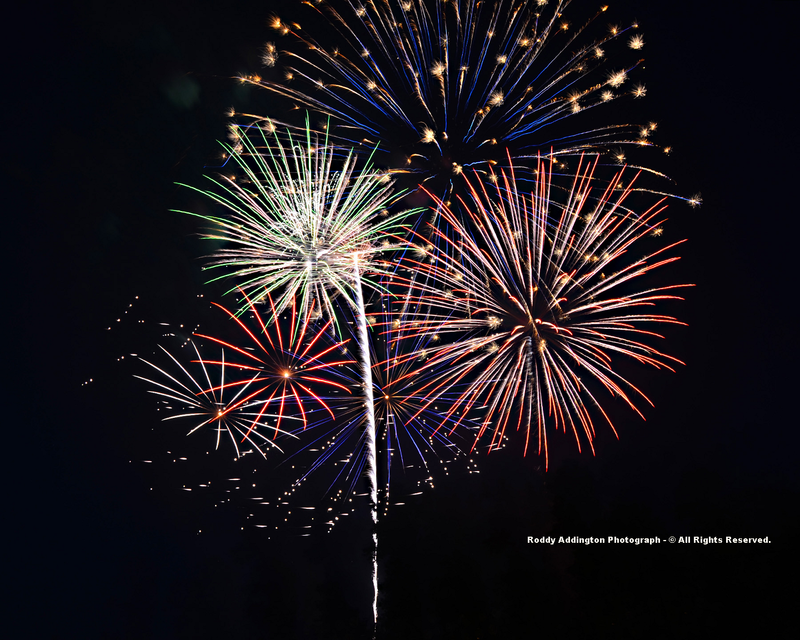 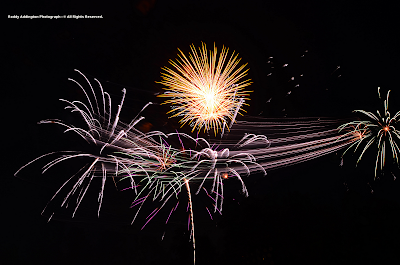 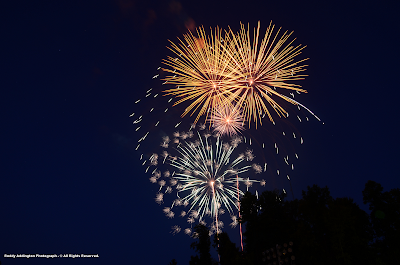 The beauty of Independence Day was captured by my friend and photographer Roddy Addington who attended the annual fireworks display in the town of Clintwood. 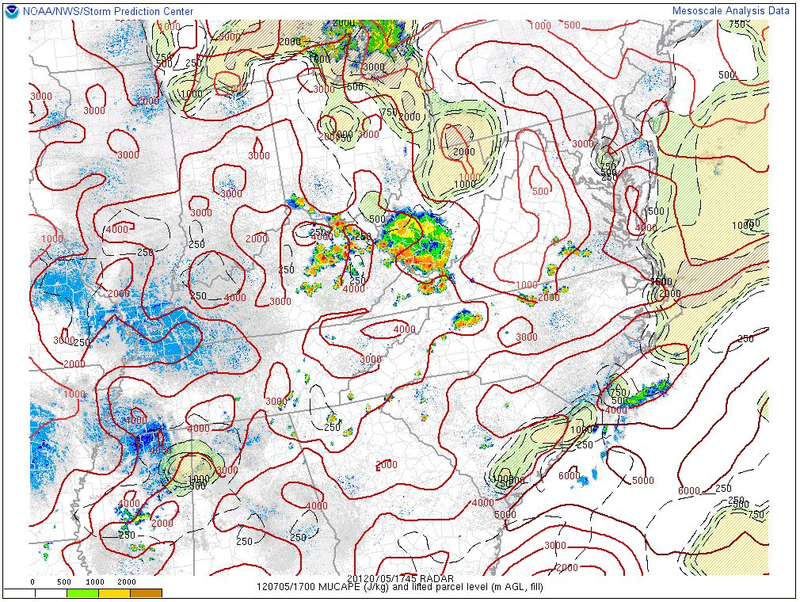 Mother Nature had already put on her convective dance during the day, with the High Knob Massif acting as the anchor for an array of hit-miss, backbuilding showers and downpours in thunderstorms. 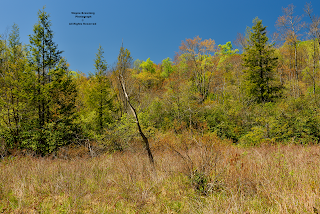 From start to finish the following time series documents a mysterious, fascinating, and also beautiful dance that has played out since before any radar, or human, was present in this ancient mountain landscape. 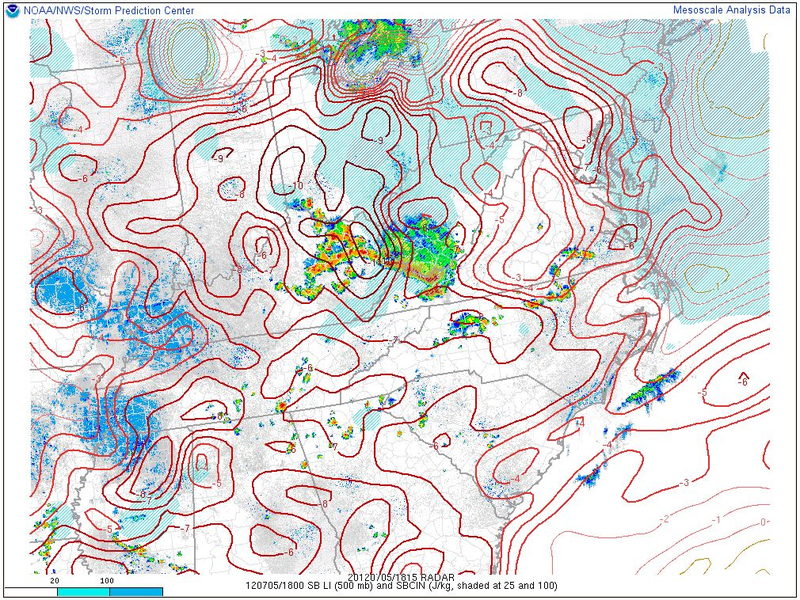 During all that time, most amazingly, it has likely never played out in exactly this manner; although, backbuilding and forcing of convection in the High Knob Massif area is well documented, no weather days ( like snowflakes ) are exactly the same. 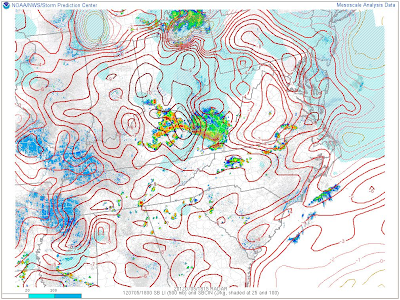 Such is the nature of convection and orographics amid complex topography! 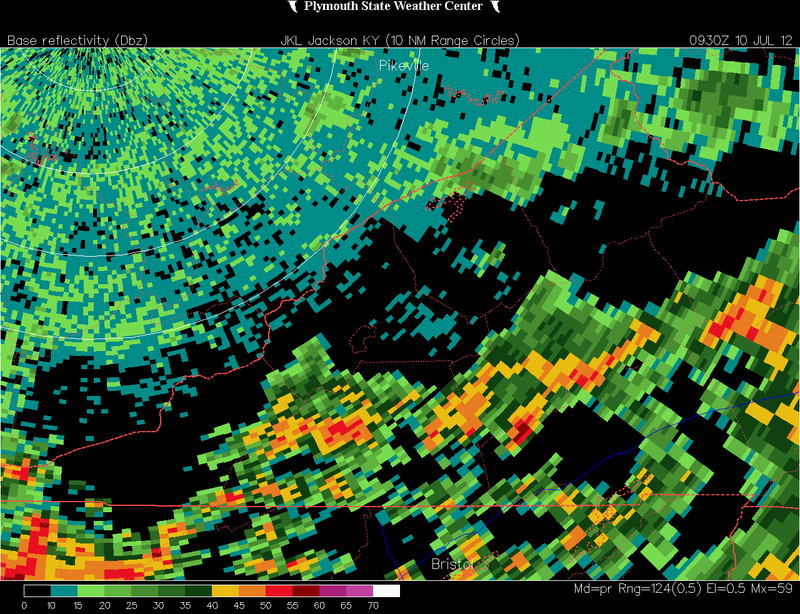 [ That is one reason I have chosen to extract frames from Doppler Loops and generate panels that you can click through at your own speed, stopping to hopefully look at many fascinating details which are revealed during these events in this area ]. 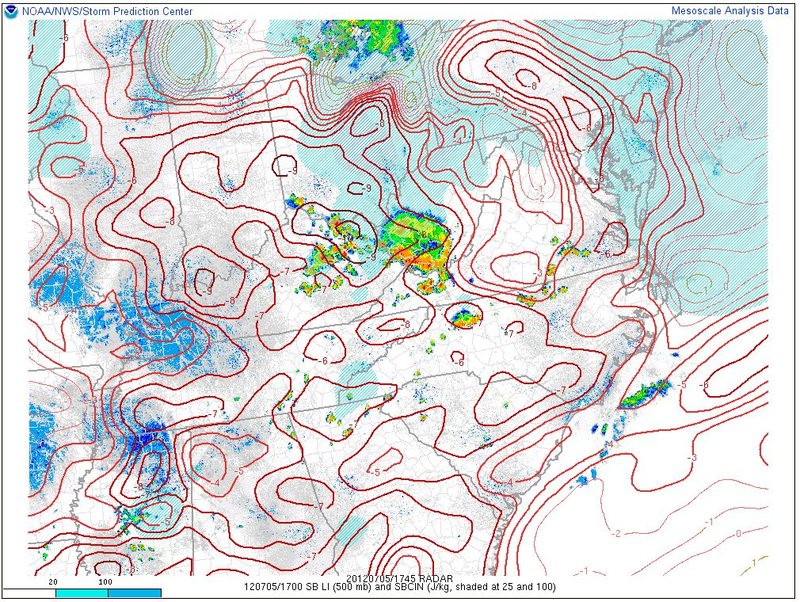 Such a scenario could be expected given low-level southerly inflow into the massif area at the surface beneath a mean NW flow in the 850-300 MB layer, supporting low-level convergence on the high terrain and a drift into and off it to the southeast. 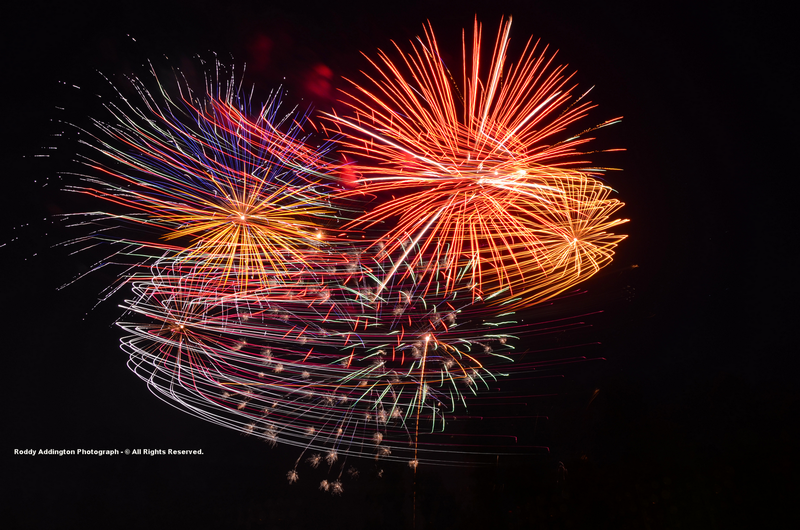 That has been documented many, many times in the past, but specific details and results are always different in how it all plays out. 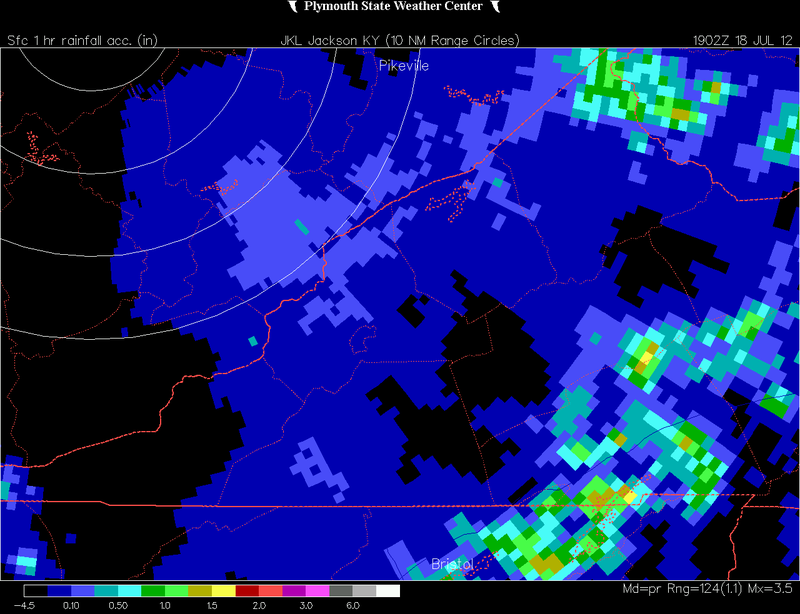 A significant area with Doppler estimated 1.00" to 2.00"+ rainfall amounts covered a large portion of Scott County, and localized places amid adjoining counties, in the wake of this convective dance of orographically forced formation and reformation of Independence Day showers and downpours in thunderstorms. 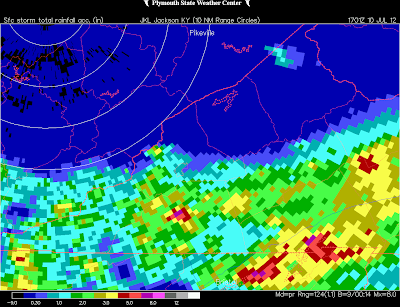 The next day would prove much different! ( compounding problems for those still without electricity or having just gotten it back from the major June 29 event ). 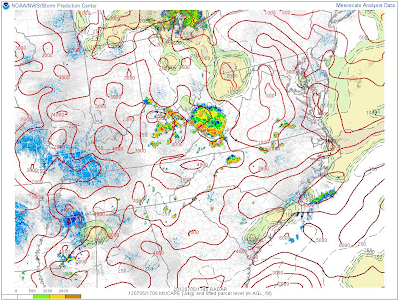 The MCS started developing around mid-day along and southwest of the I-64 corridor in West Virginia with rapid expansion west across northeastern Kentucky where the early afternoon air mass was becoming very unstable ( LI to -10 and MUCAPE to 4000 J/kg ). 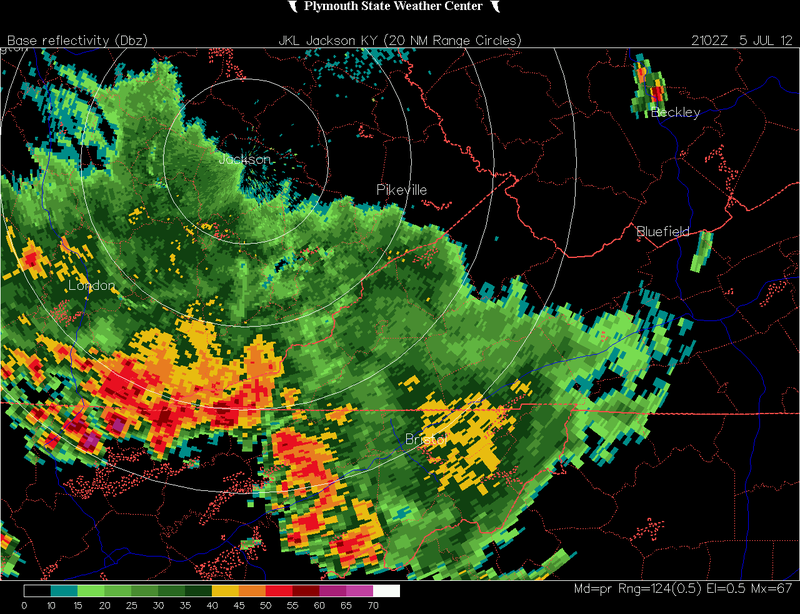 The MCS will be documented as it pushed across the Upper Tennessee River Basin and adjacent areas of far southwestern Virginia, southeastern Kentucky and extreme northern Tennessee. 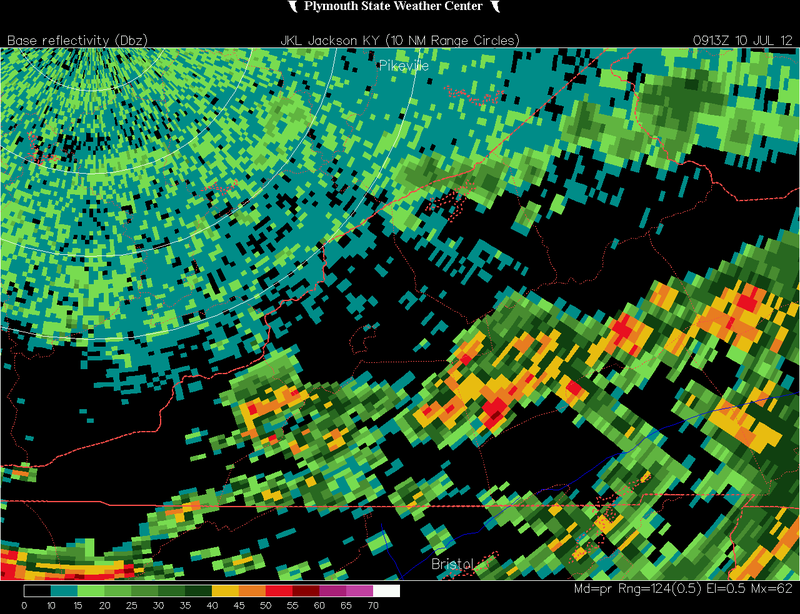 Following a steamy break in activity during July 6 some isolated convection fired over the High Knob Landform, southwest of the City of Norton, and along the Black mountains during afternoon hours of July 7 ( very isolated in Clinch-Holston valleys ). 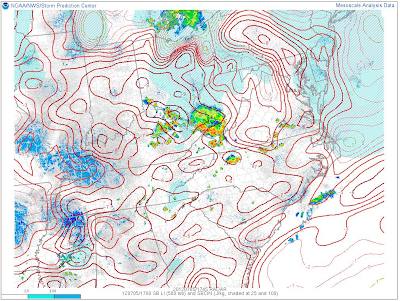 A relative lull in wake of the MCS of July 5 was followed by explosive thunderstorm development amid unseasonable July 8 heating, with action first developing along the Tennessee Valley Divide in southern Dickenson County before building southwest into the High Knob Massif. 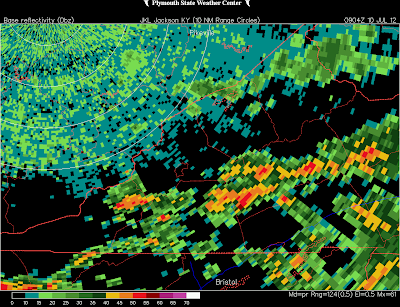 By 5:00 PM on July 8 a general 1.00" to 3.00"+ of Doppler estimated rainfall had occurred from Big A Mountain southwest along the Tennessee Valley Divide into the High Knob Massif, with localized heavy amounts in adjacent places. A broad scan of regional rainfall estimates revealed that this was likely only the beginning, with a new area of heavy rains developing along the Ohio River with a line of developing storms. 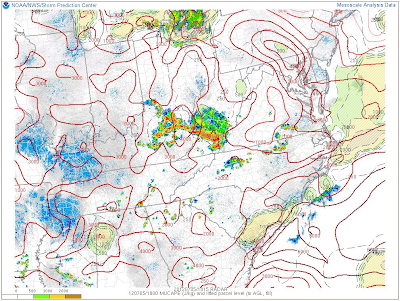 The storms were already putting out a distinct outflow boundary at 5:00 PM over Kentucky, which would prove to play a key role in explosive thunderstorm development ( once again ) as it pushed south into the higher terrain of the Cumberland Overthrust Block. 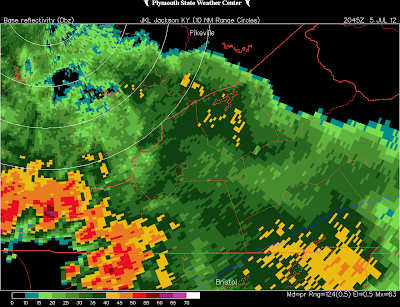 This would generate another natural display of fireworks with vivid lightning, booming thunder, and torrential downpours of rain. By 7:34 PM the outflow boundary was pushing into northern Wise & Dickenson counties and was near a Flat Gap to McClure line ( this is the same outflow boundary noted at 5:00 PM on the regional Doppler scan ). 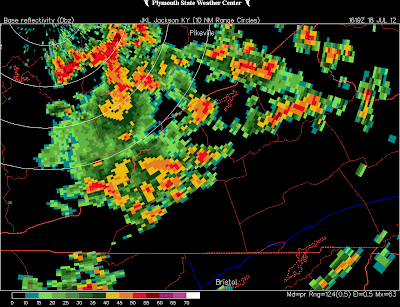 ( a combination of initial lifting by the outflow boundary + orographically forced lifting by lofty topography ). 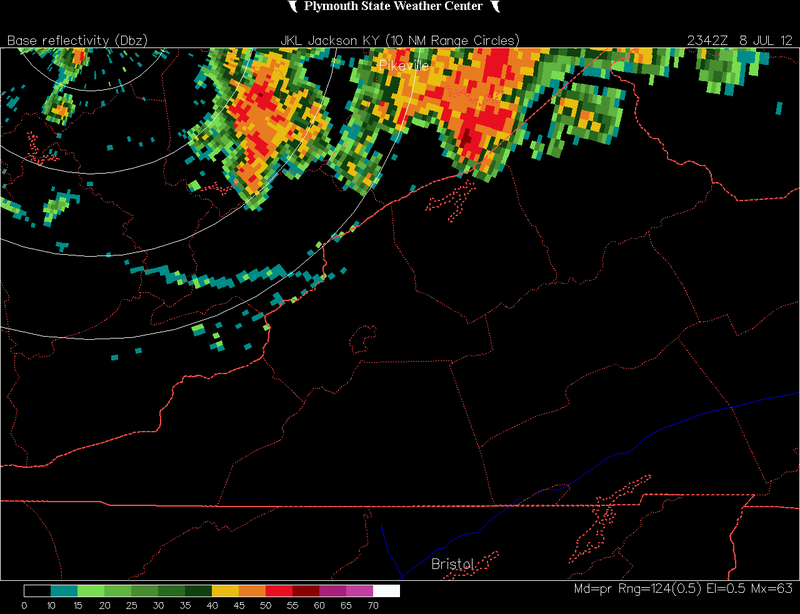 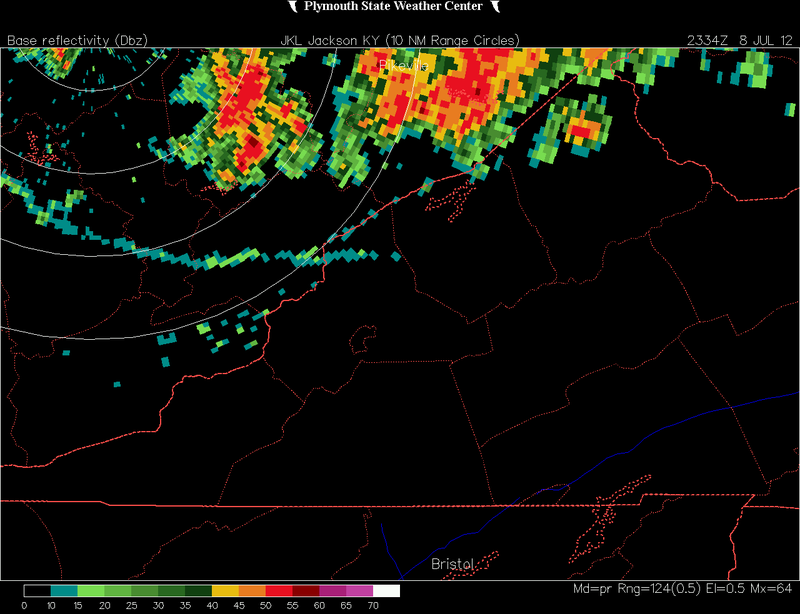 The outflow boundary acting like a mini-cold front. ( observe on following frames ). 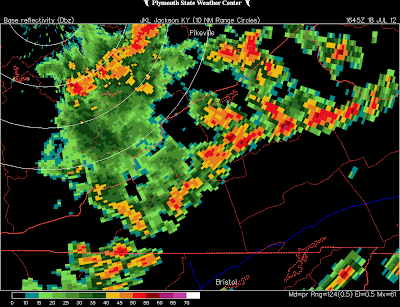 Eventually, new development occurred toward the southwest to push back into western-southern portions of the massif ( Wise, Scott, Lee border area ). 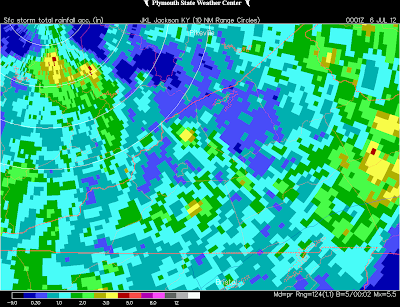 A general 1.00" to 4.00"+ of rainfall occurred during this event from east facing rims of Big Cherry Basin to Guest River Gorge and adjacent sections of Sandy Ridge to the north ( and the Clinch River Valley toward the south ). 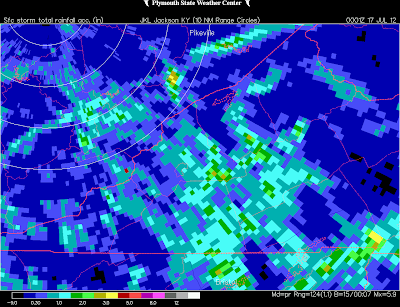 Rainfall accumulated amid a 12-hour period between 1:30 PM July 8 to 1:30 AM July 9. My friends Otis & Nancy Ward verified these Doppler estimated rainfall totals with a 3.45" rain gauge measurement in the Robinson Knob community of the High Knob Massif during morning hours of July 9. The cold frontal boundary which helped trigger excessive rainfall into July 9 stalled across the Mountain Empire with a continuation of wetness as waves of rain moved along the boundary. The most persistent and significant rains accumulating from the High Knob Landform southward into extreme northern portons of Tennessee, with sharp decreases in rain amounts toward the north. Significant rainfall moving along the stalled frontal boundary was generally restricted to locations along and south of the Tennessee Valley Divide and High Knob Landform, as illustrated by the Doppler estimated rainfall graphic below. 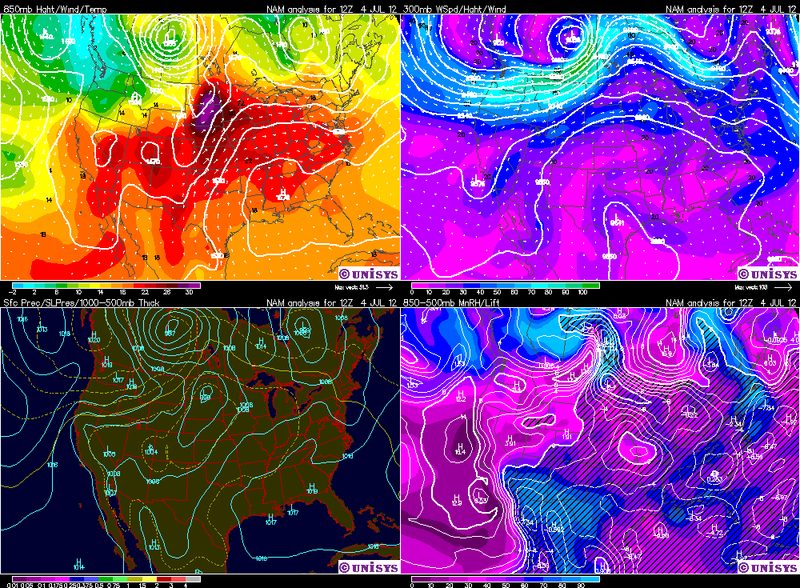 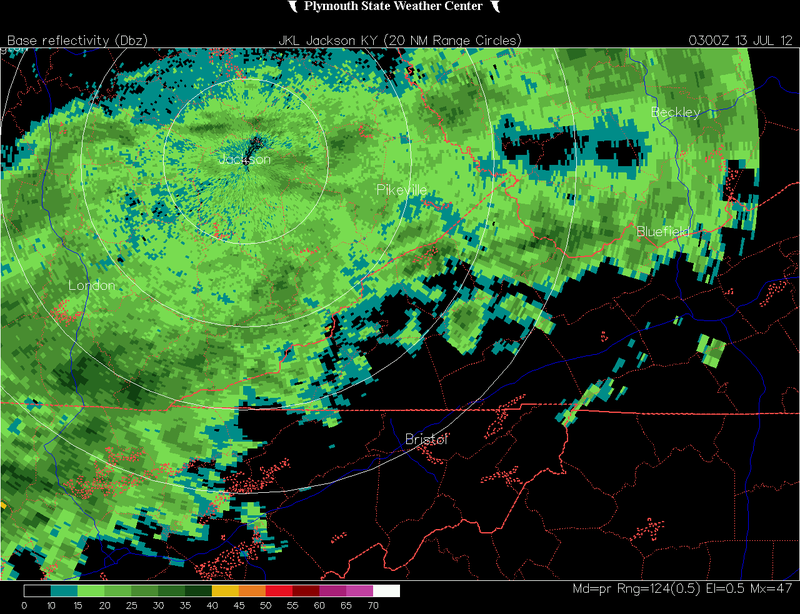 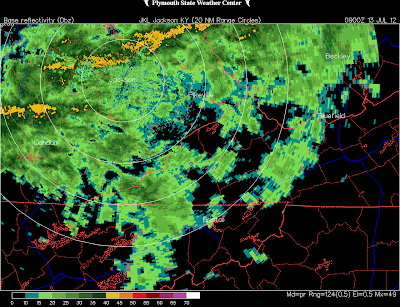 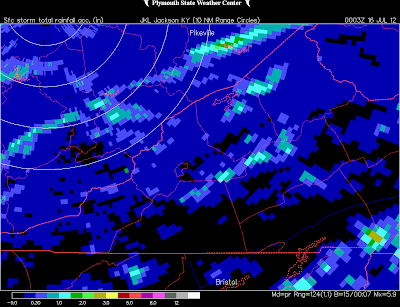 Note the well defined north to south rainfall gradient. 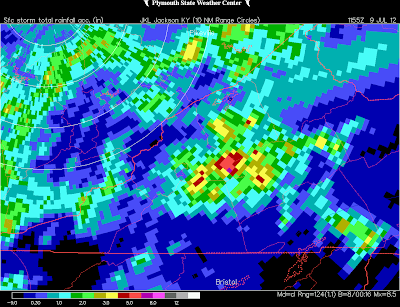 This generated significant 48-hour rainfall totals when combined with the heavy thunderstorms of July 8, as illustrated by the next Doppler graphic. Big Stone Gap Water Plant: 2.93"
Appalachia Lake Water Plant: 2.99"
Big Cherry Dam of High Knob Massif: 3.13"
Little Mountain of High Knob Massif: 3.62"
Robinson Knob of High Knob Massif: 4.65"
Both Doppler radar and rain gauges revealed a huge rainfall gradient across southwestern Virginia during this period, with the accuracy of Doppler verses hand-measurements suggesting that up to 7.00" could have fallen in parts of the High Knob Landform counties. 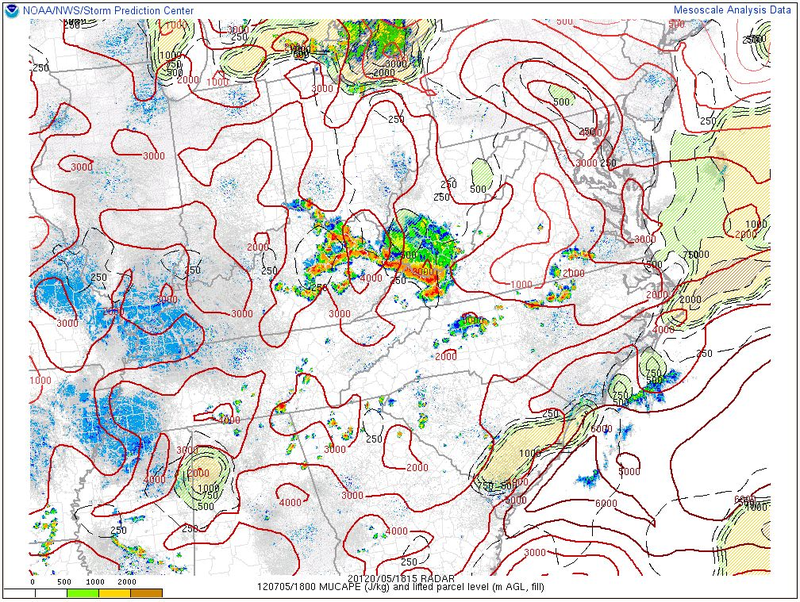 The next wave of liquid sunshine did not wait long as stratiform rainfall gave way to developing convection into afternoon hours of July 11, with a west to northwest propagation across the Tennessee Valley Divide and High Knob Massif. 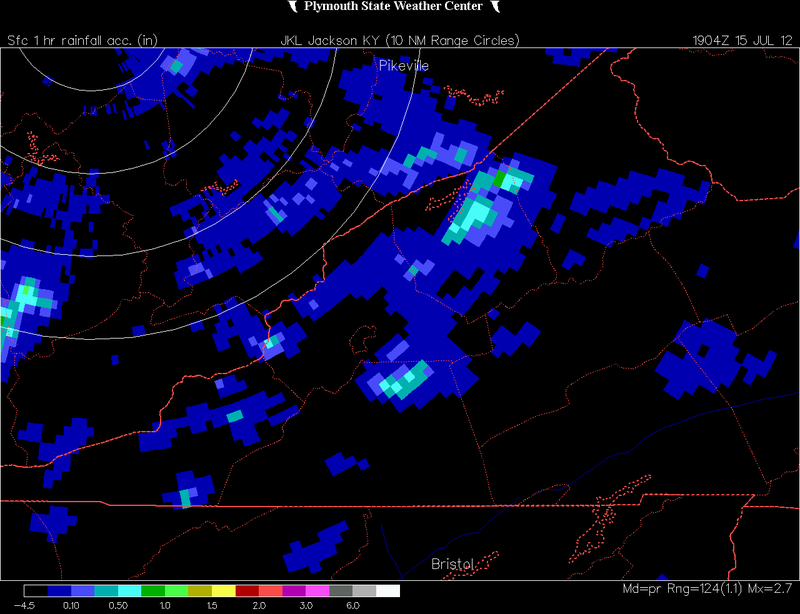 The most significant aspect of the following day was not total rainfall amounts but temperatures, which under low clouds, light rain, and mountain fog held in the 60s all day above 2000 feet. In fact, MAX temperatures reached only 60 to 65 degrees above 2700 feet in the High Knob Massif area on July 12. Robinson Knob of High Knob Massif: 0.84"
Big Stone Gap Water Plant: 1.51"
Appalachia Lake Water Plant: 1.66"
( AM ) period, reached 5.90" at the Coeburn Filter Plant, 6.32" at Appalachia Lake Water Plant and 7.04" in the Robinson Knob community of the High Knob Massif. 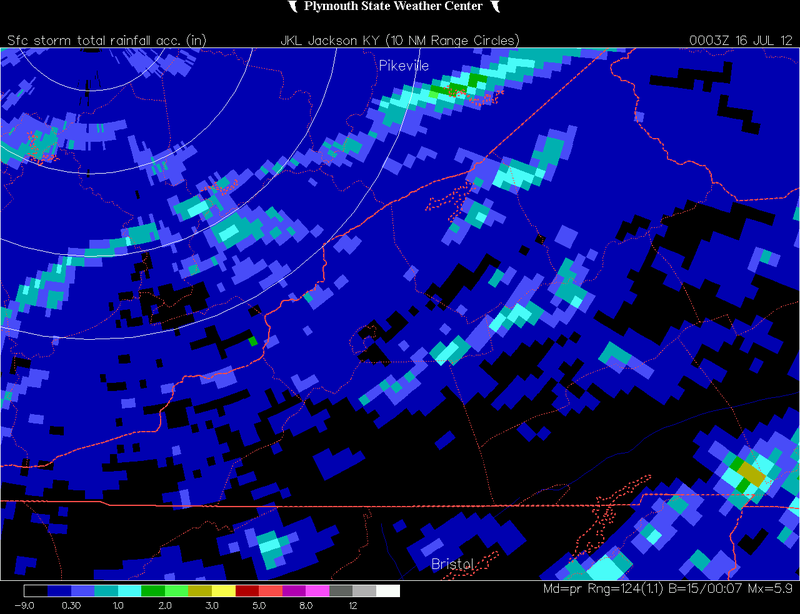 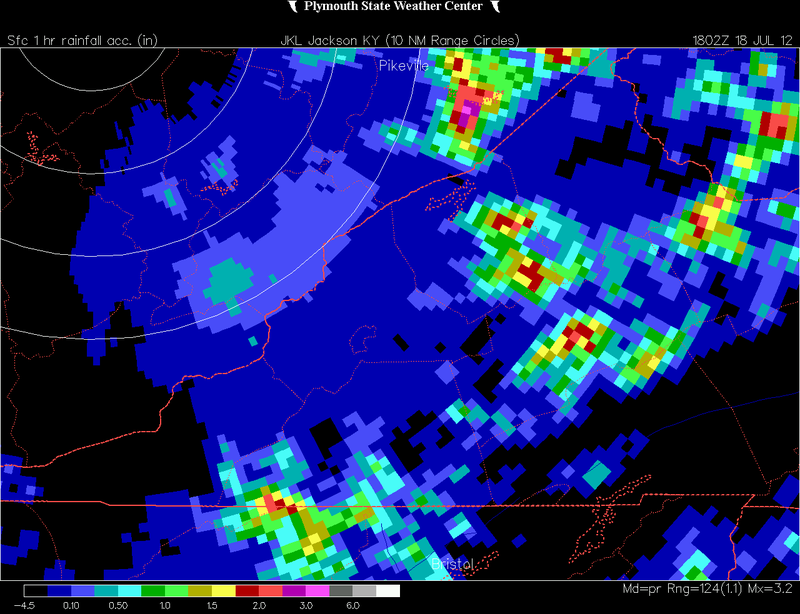 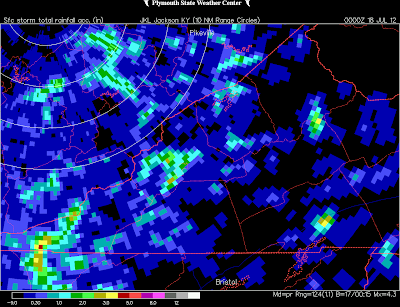 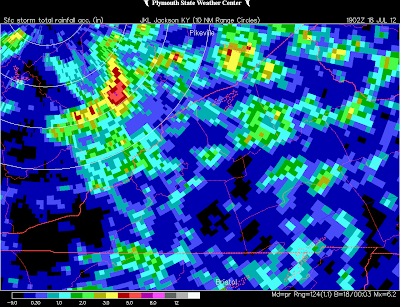 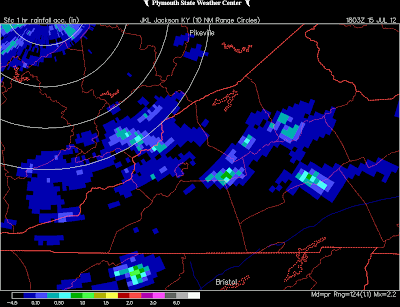 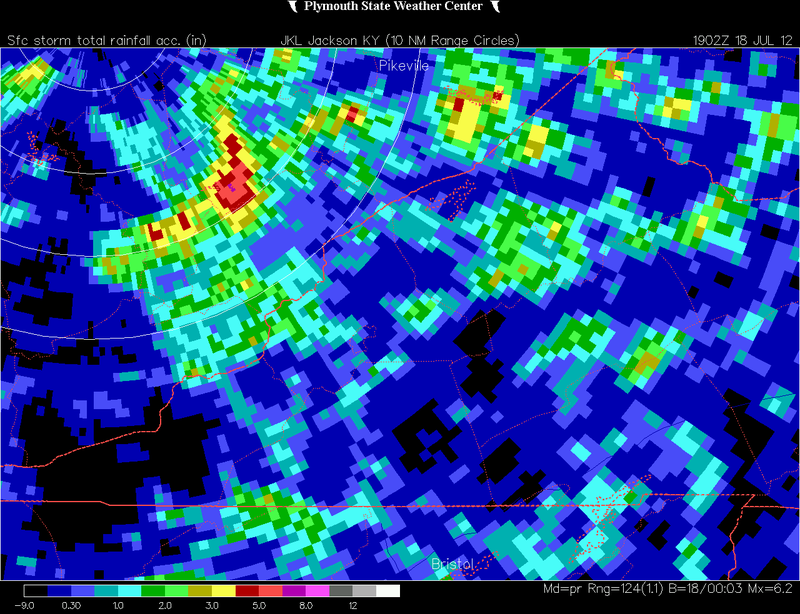 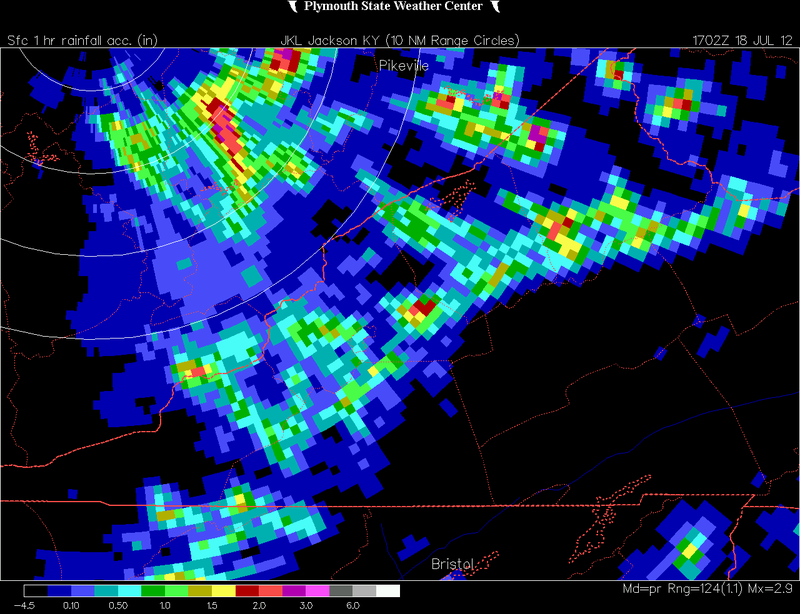 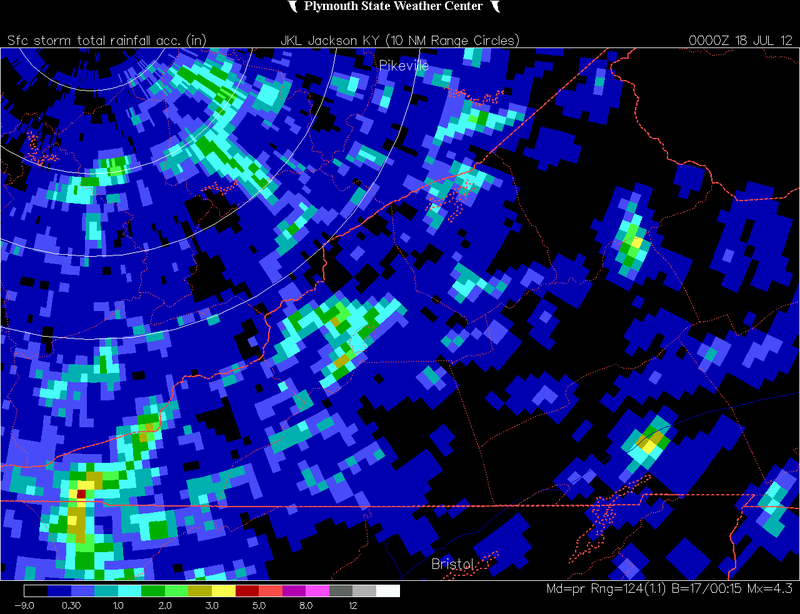 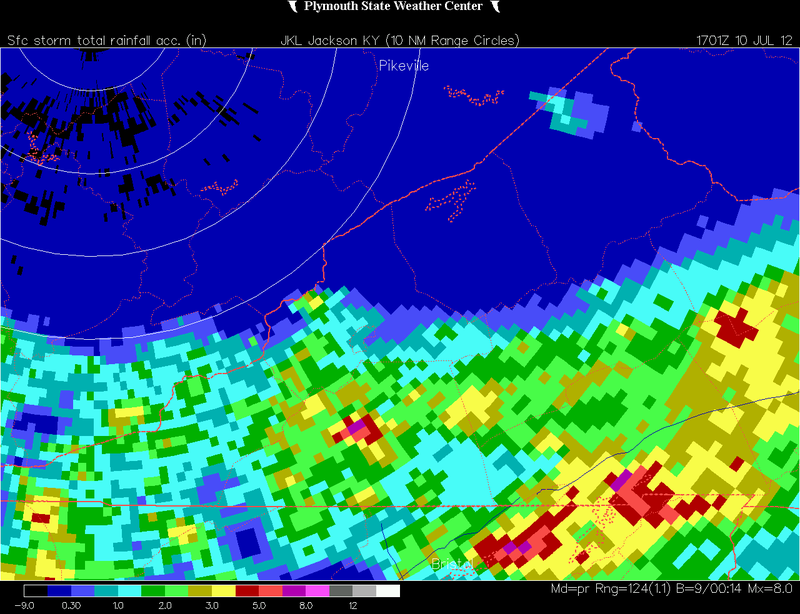 ( Local amounts topped 8.00" during these first 13 days of July 2012 across portions of Wise-Scott counties ). 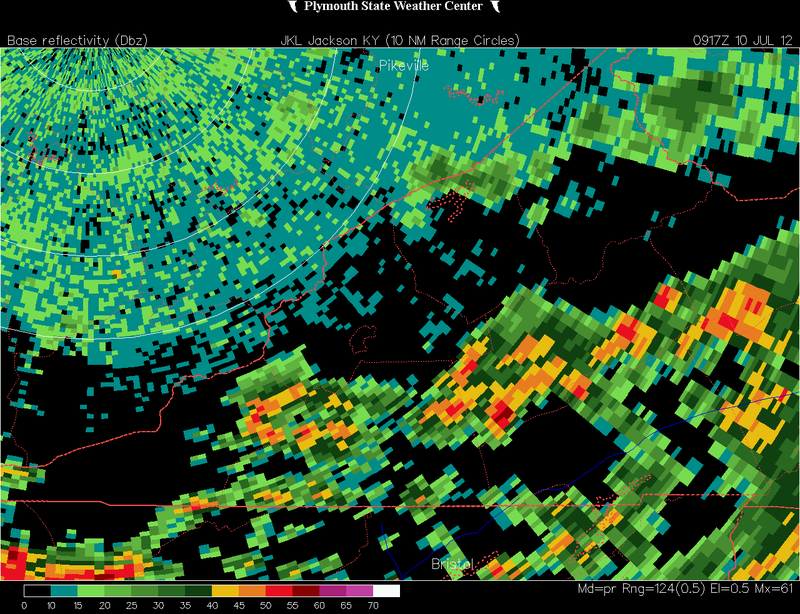 A scattered array of hit-miss showers and brief downpours in thundershowers developed with heating on July 14 before an eruption of much stronger storms during mid-late afternoon. 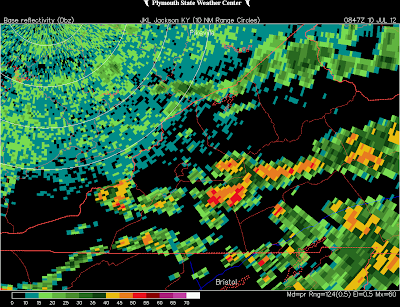 The hit and run nature of downpours up to early afternoon began changing after 3:00 PM as stronger thunderstorms over Dickenson and Buchanan counties began backbuilding across central Dickenson, with formation & reformation along the same corridor prompting a flash flood warning. 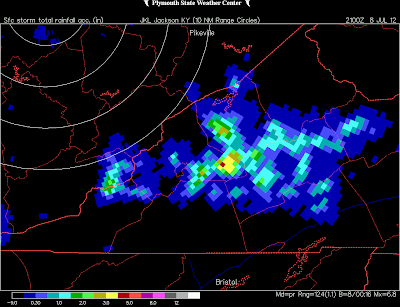 ( Reference later graphic of 1-hour rainfall rates ). Explosive convective development followed as a rather atypical V-shaped squall line of booming thunderstorms formed across the High Knob Massif - Black Mountain corridor, with the V-shaped storm line appearing to move backwards ( with respect to how such a bowed, V-shape is typically observed on Doppler ) even though it was propagating forwards ( from SSW to NNE ). 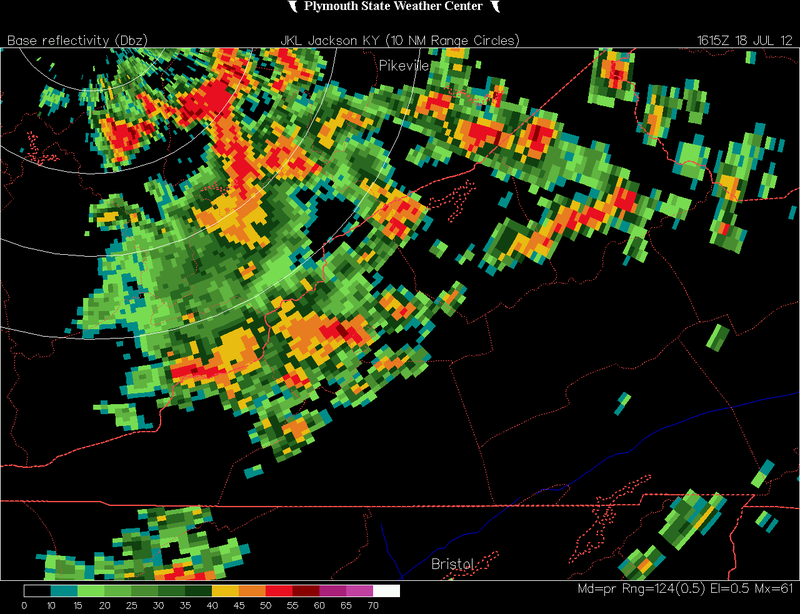 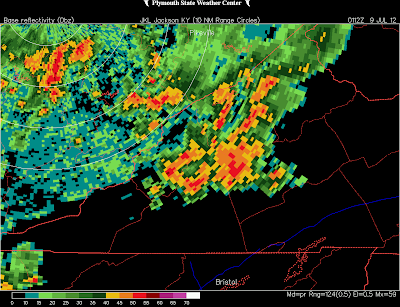 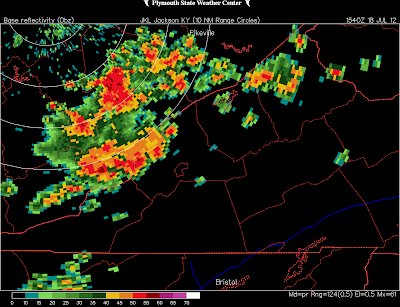 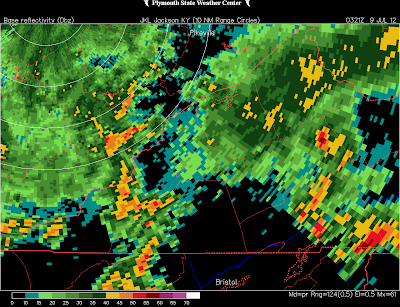 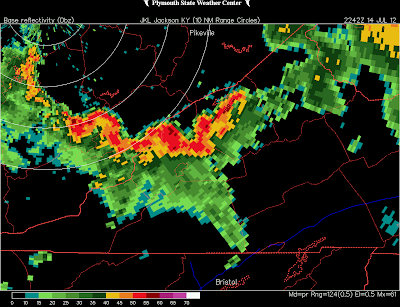 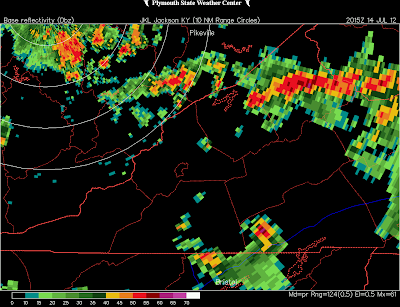 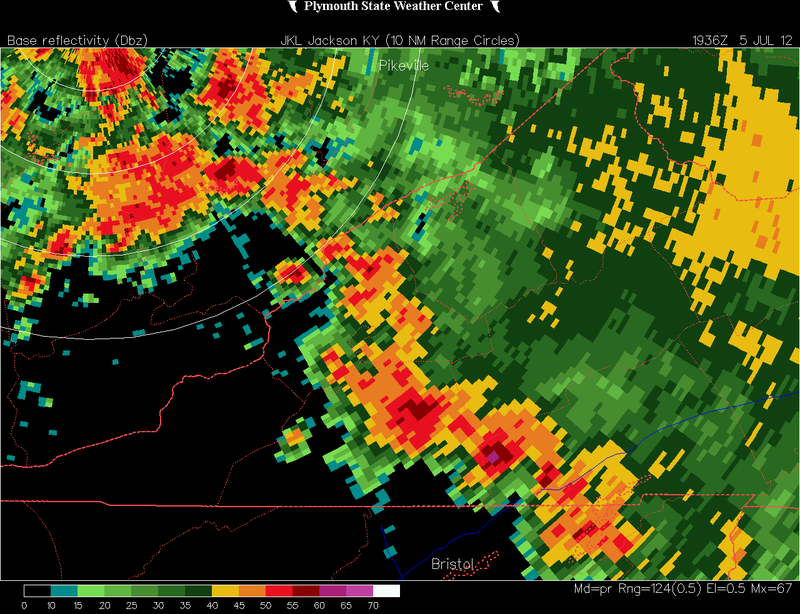 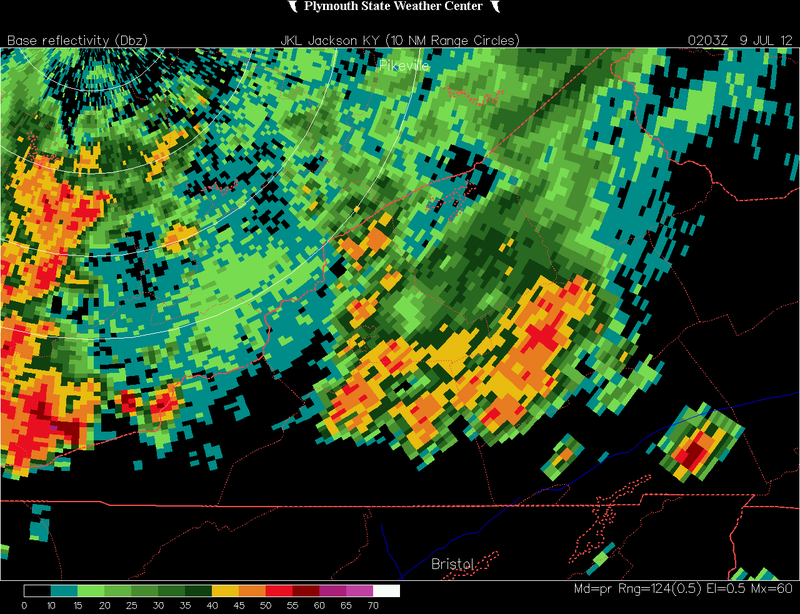 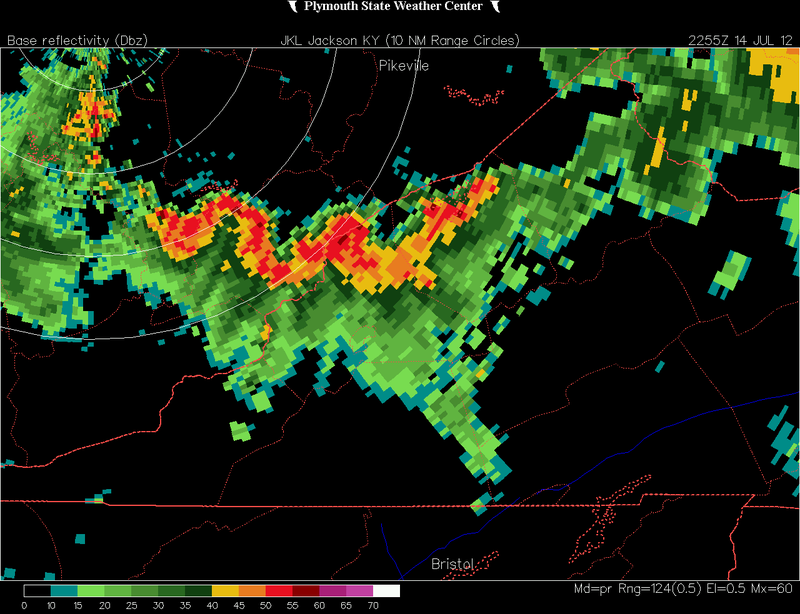 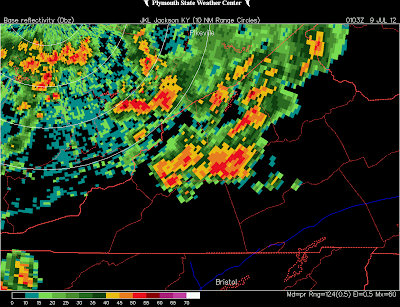 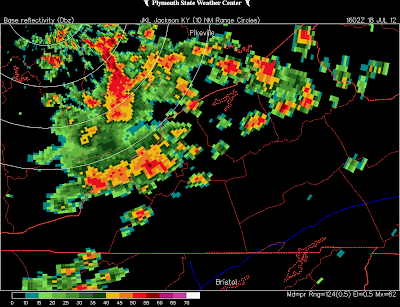 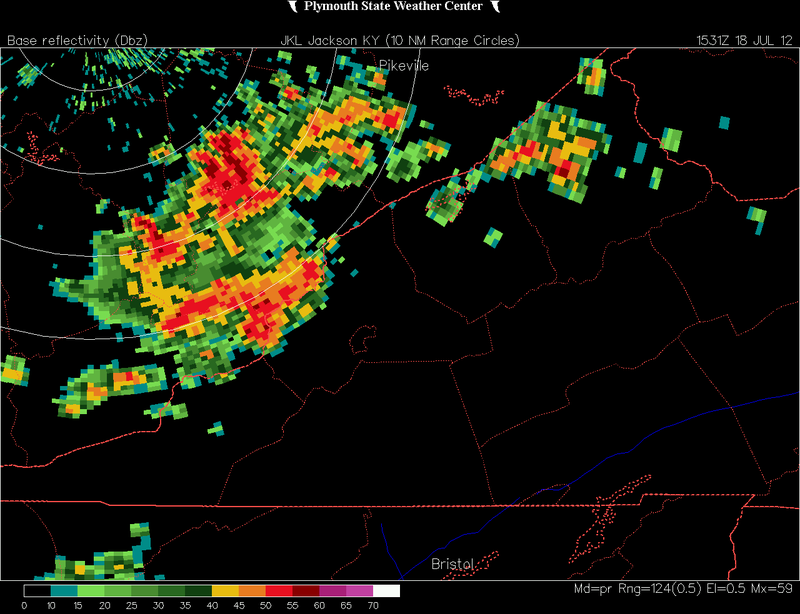 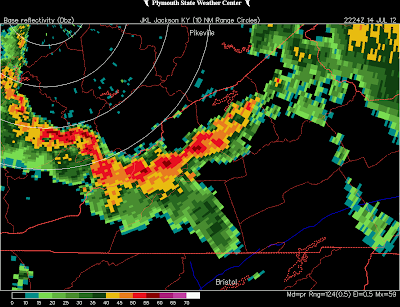 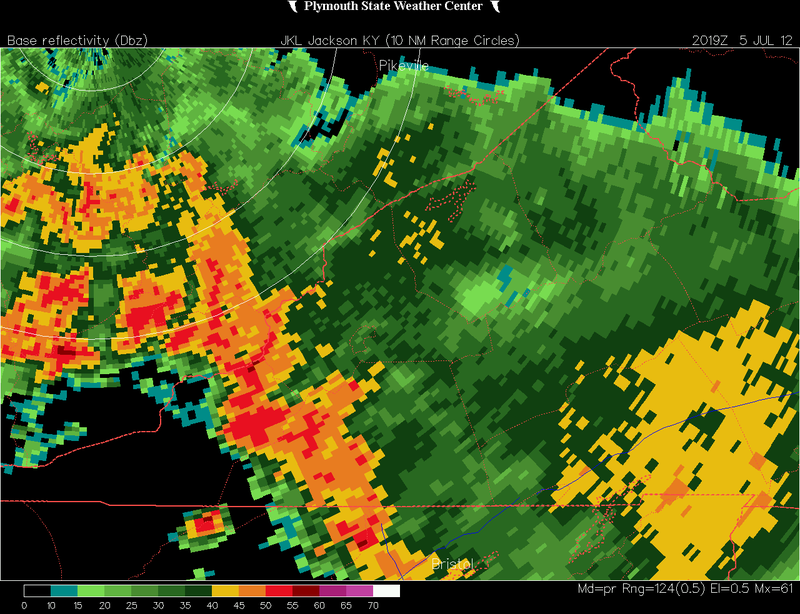 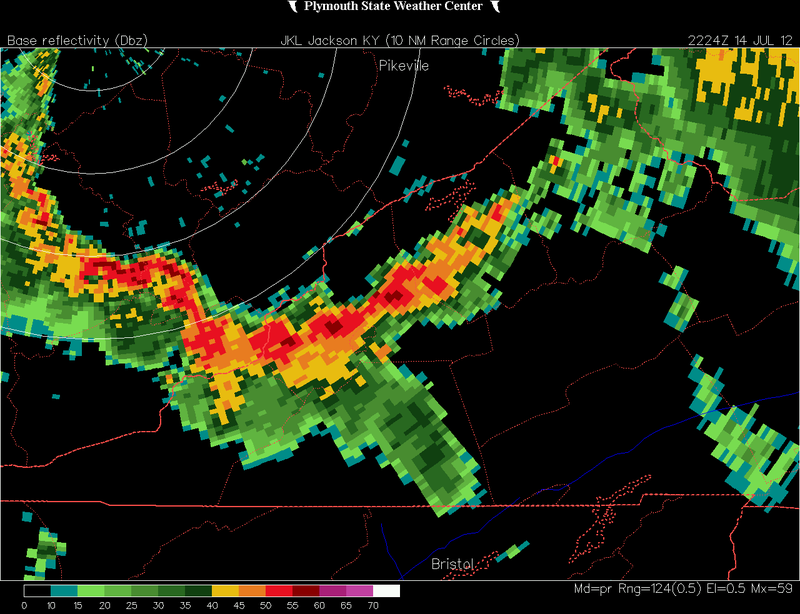 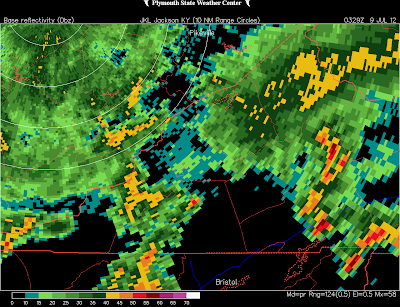 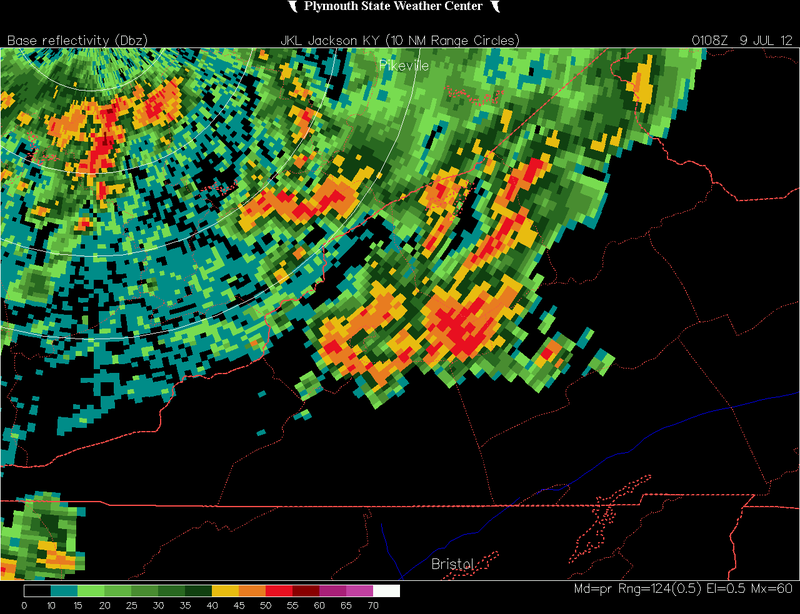 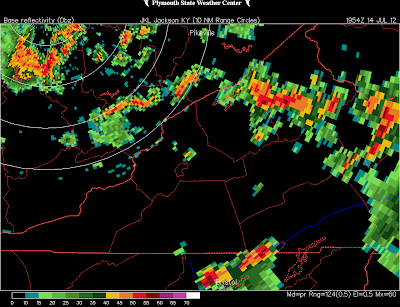 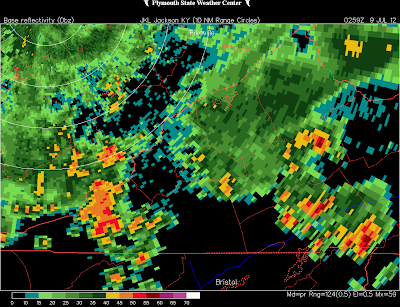 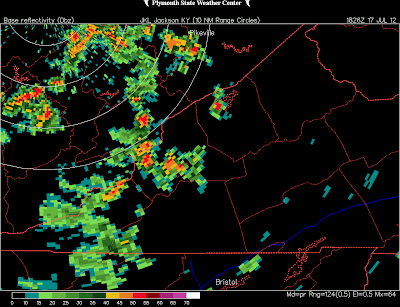 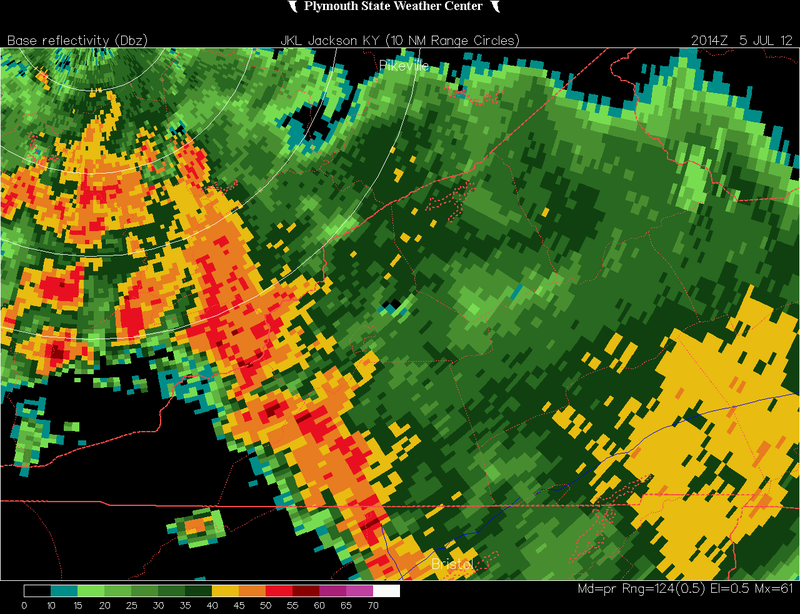 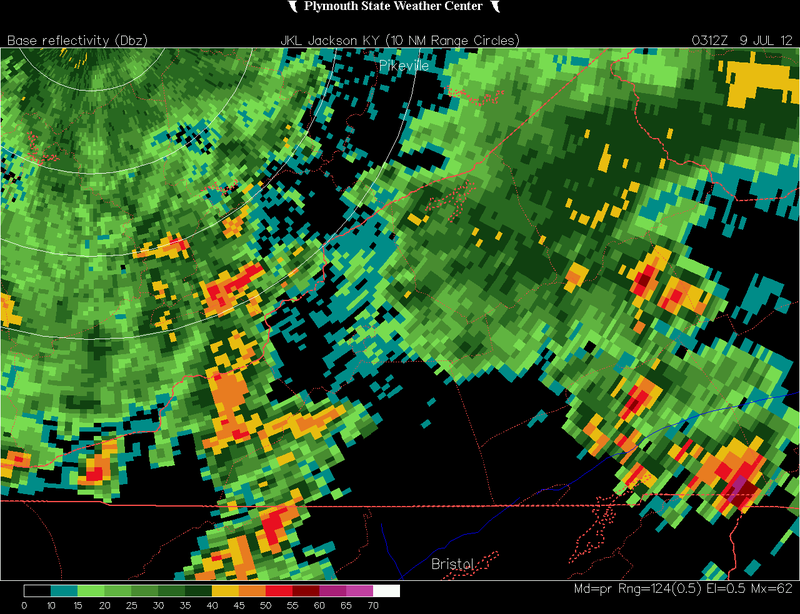 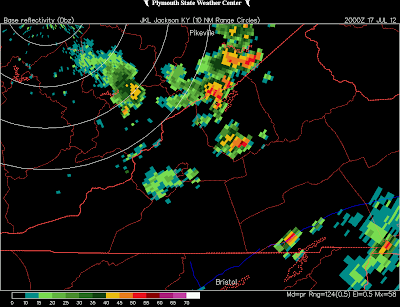 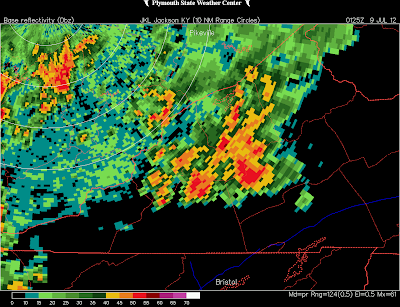 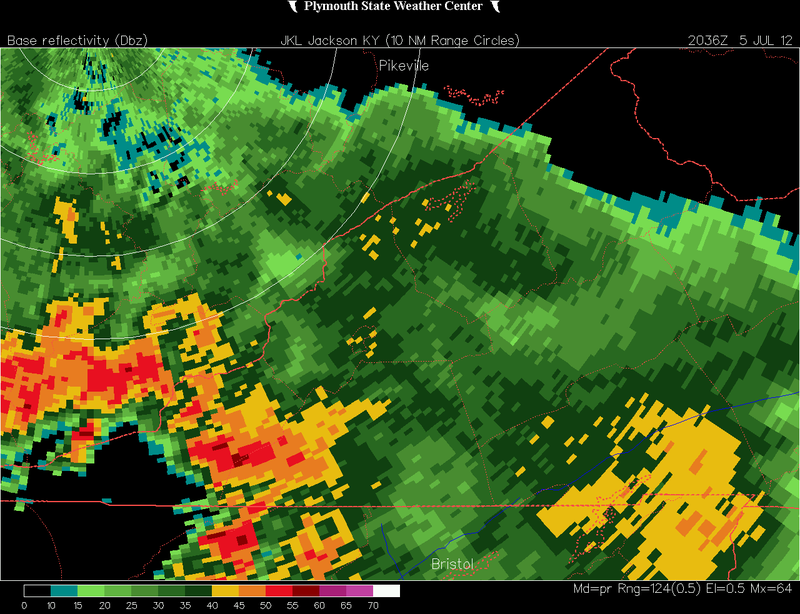 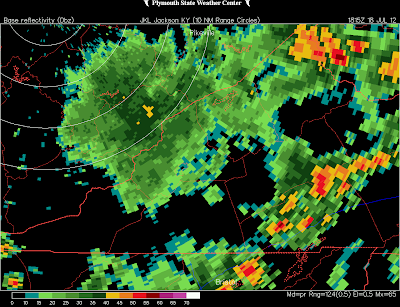 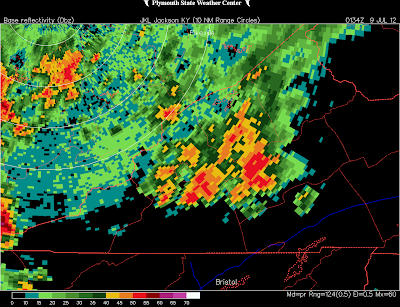 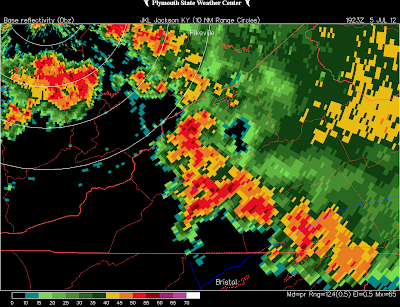 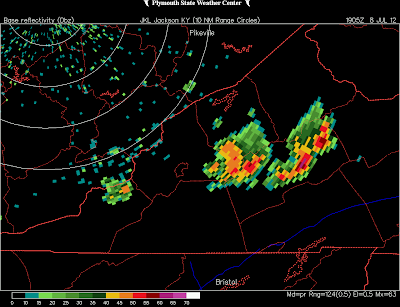 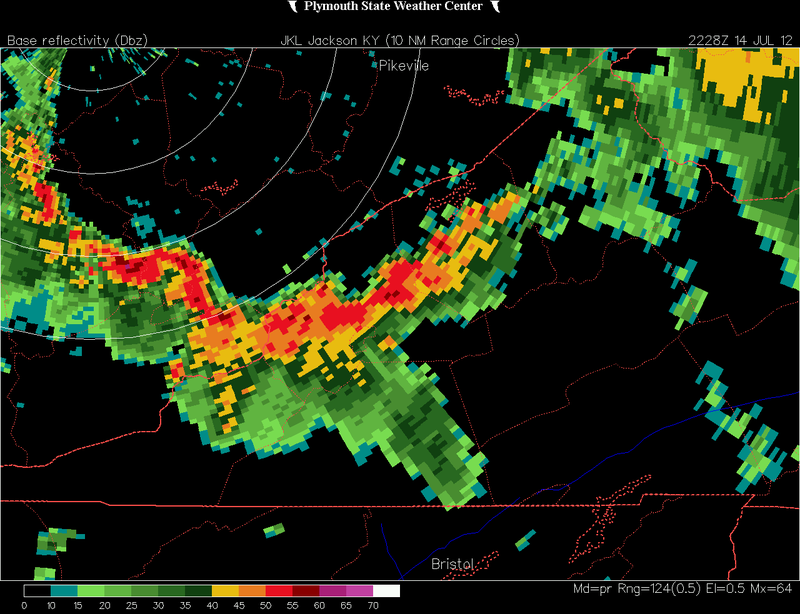 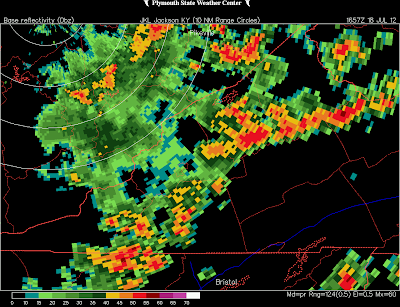 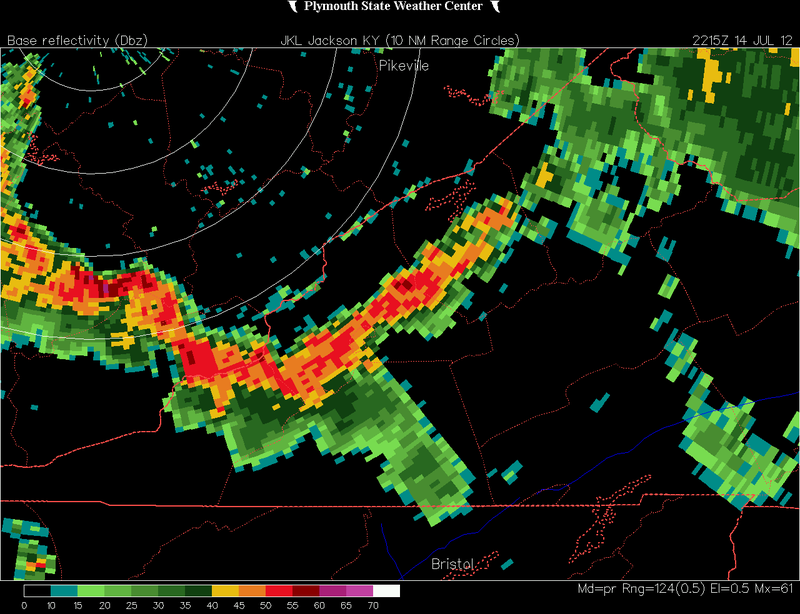 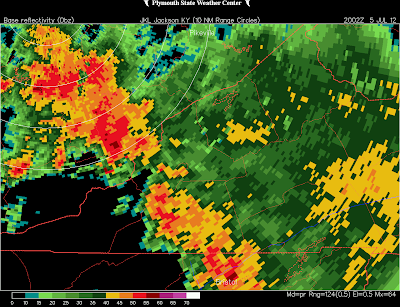 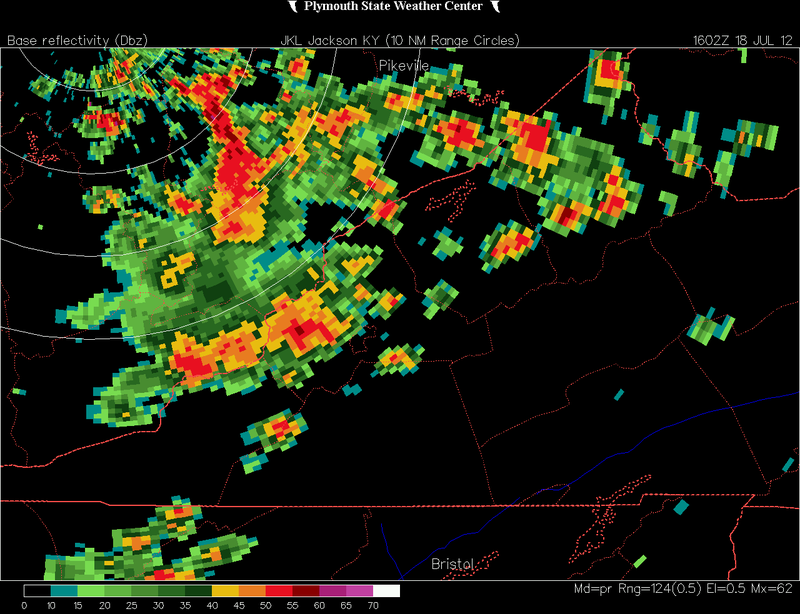 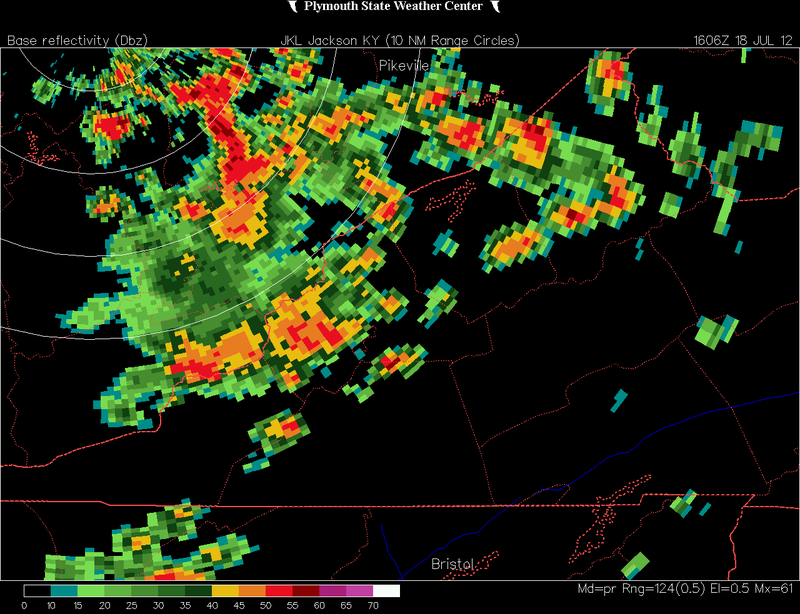 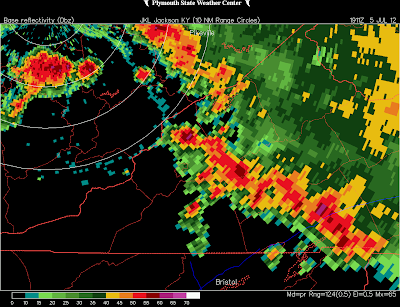 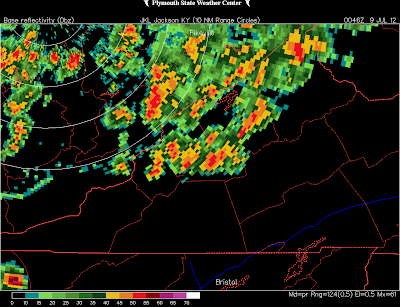 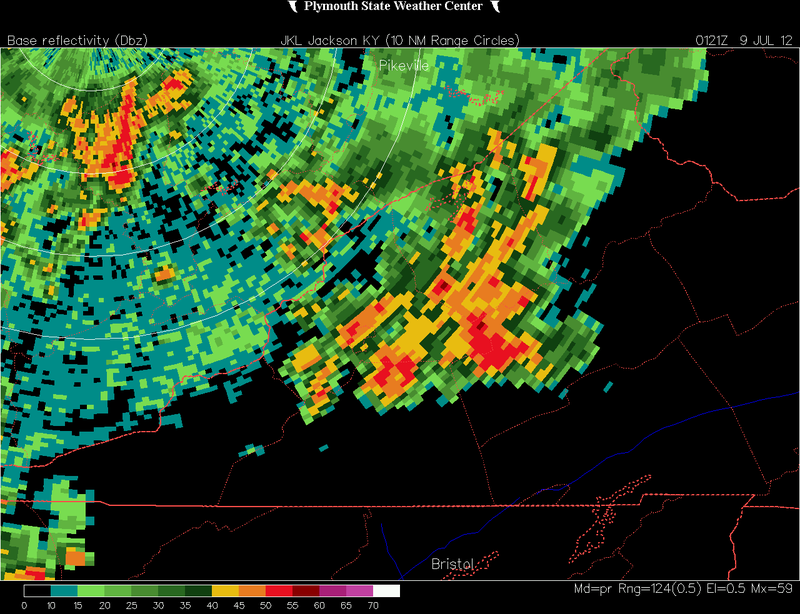 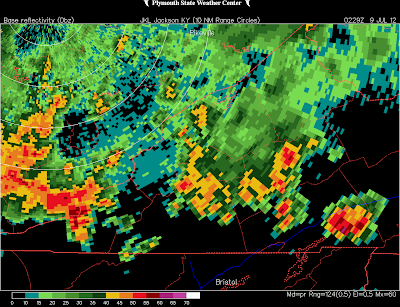 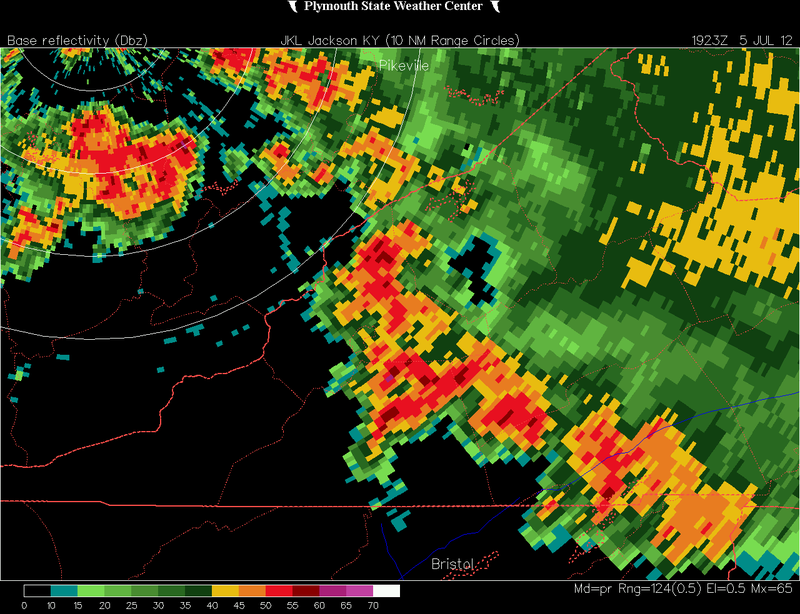 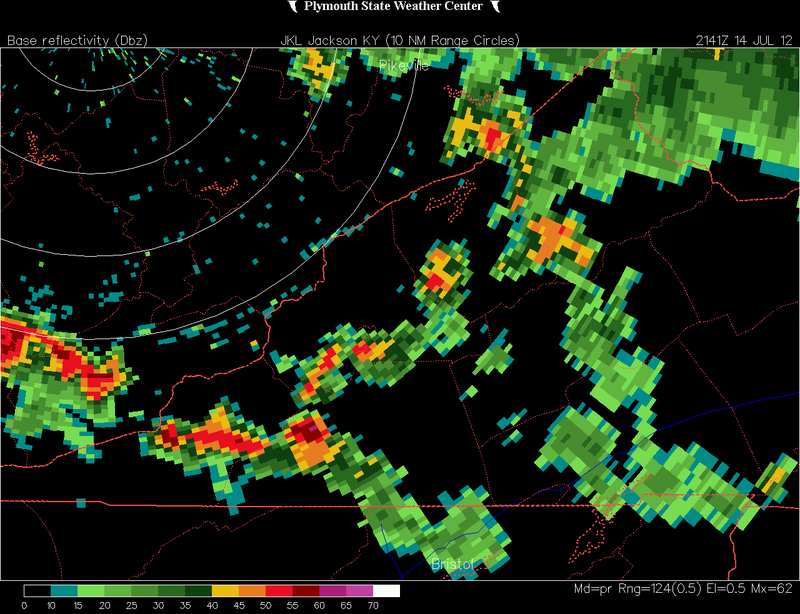 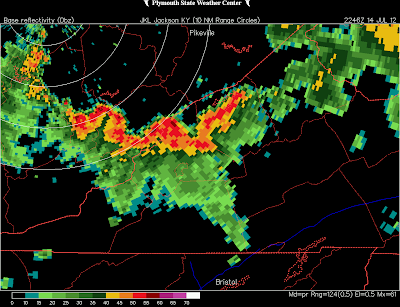 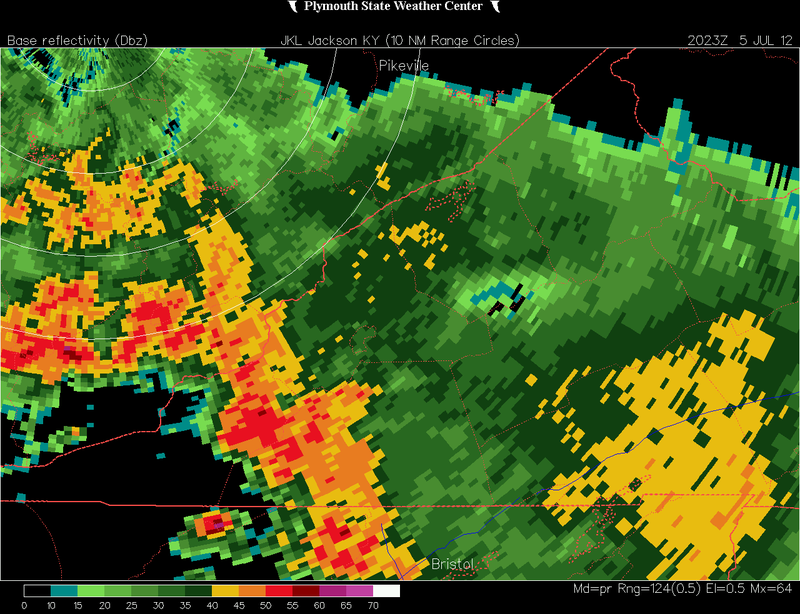 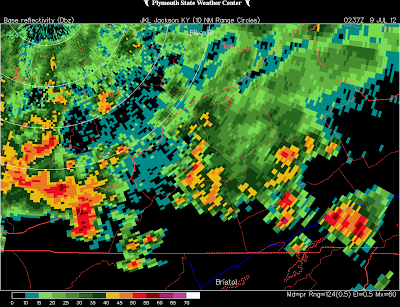 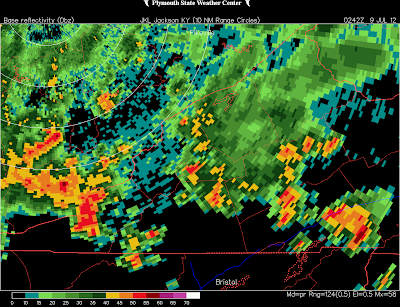 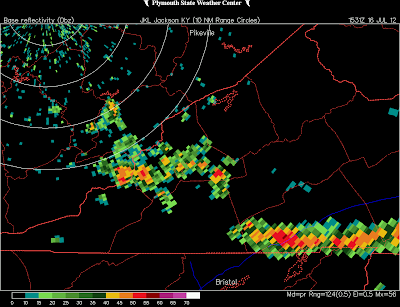 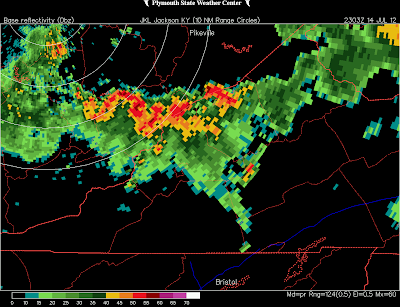 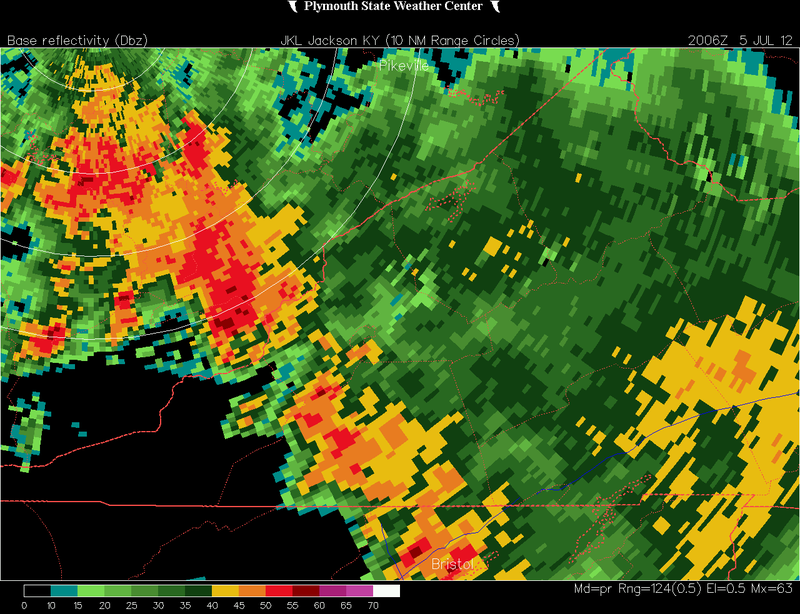 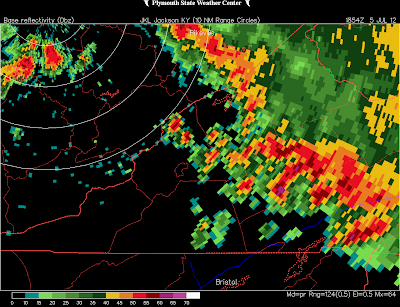 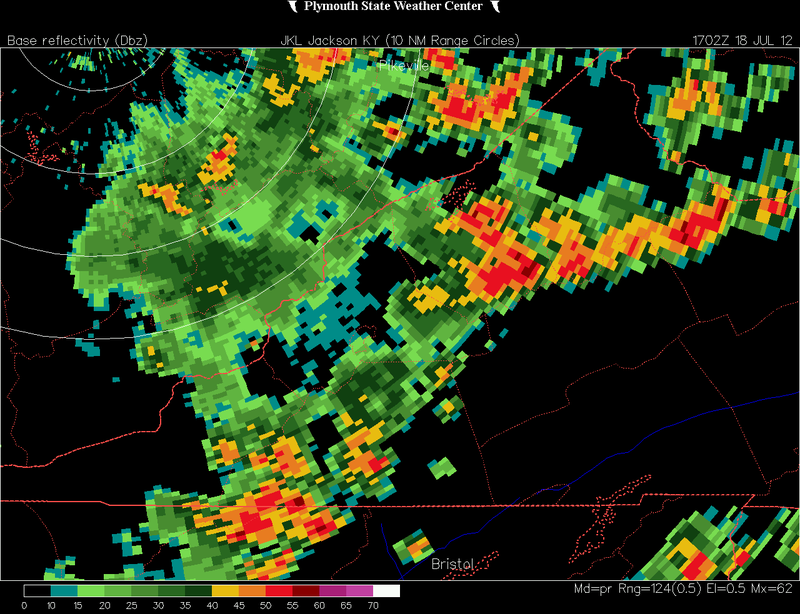 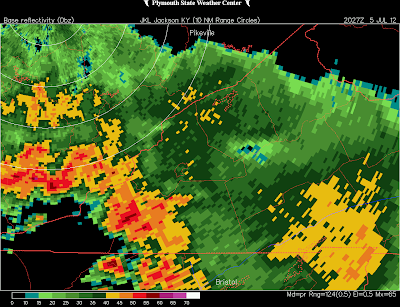 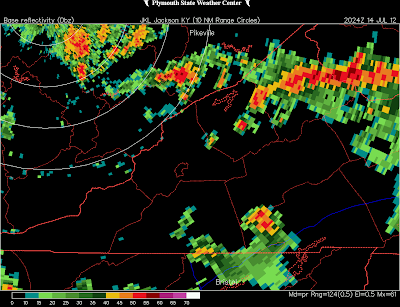 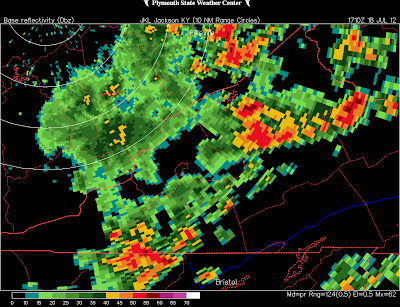 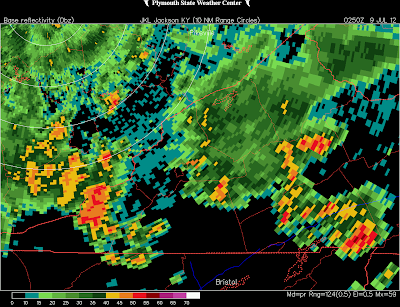 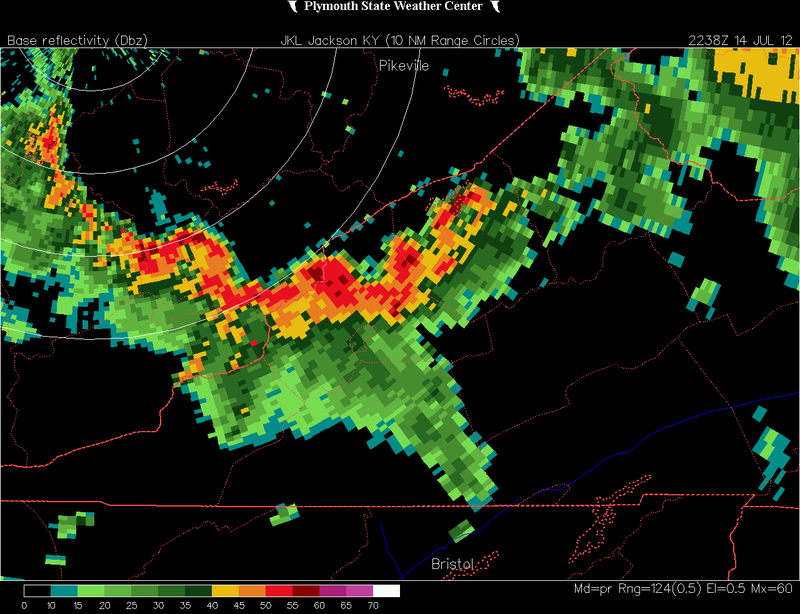 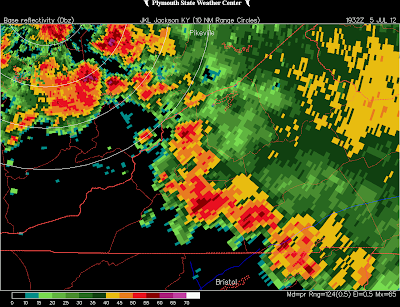 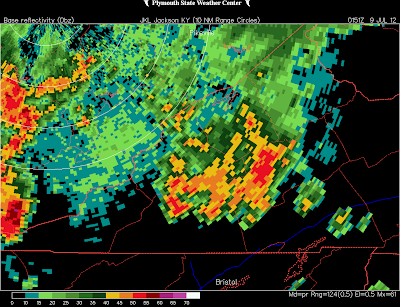 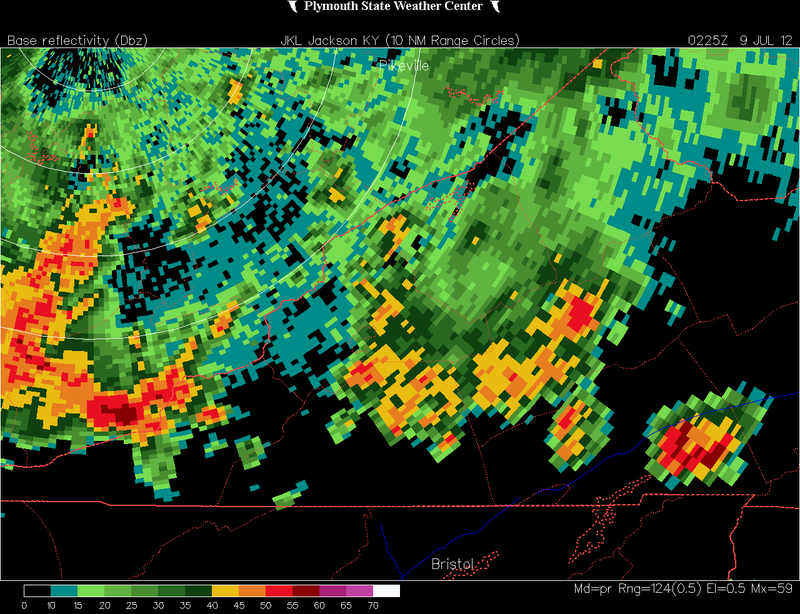 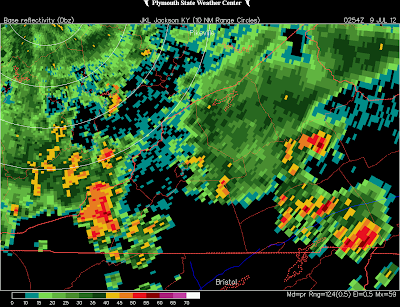 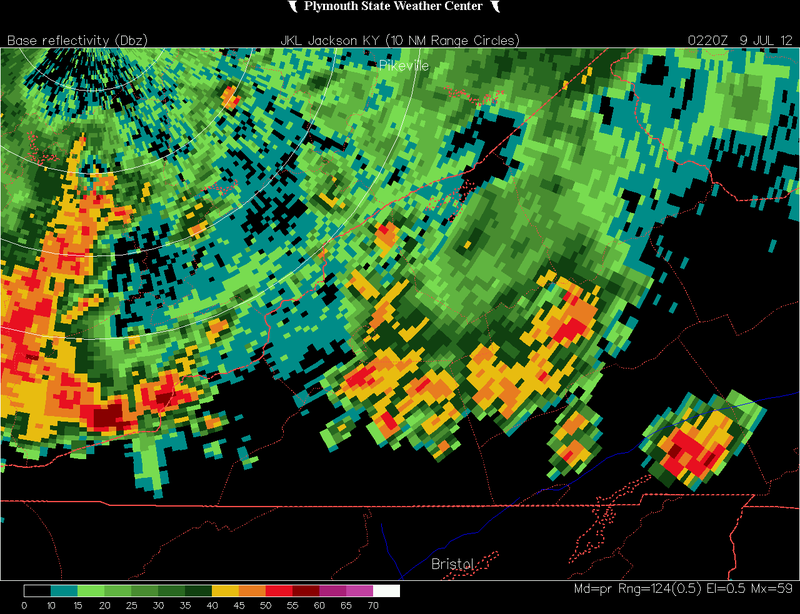 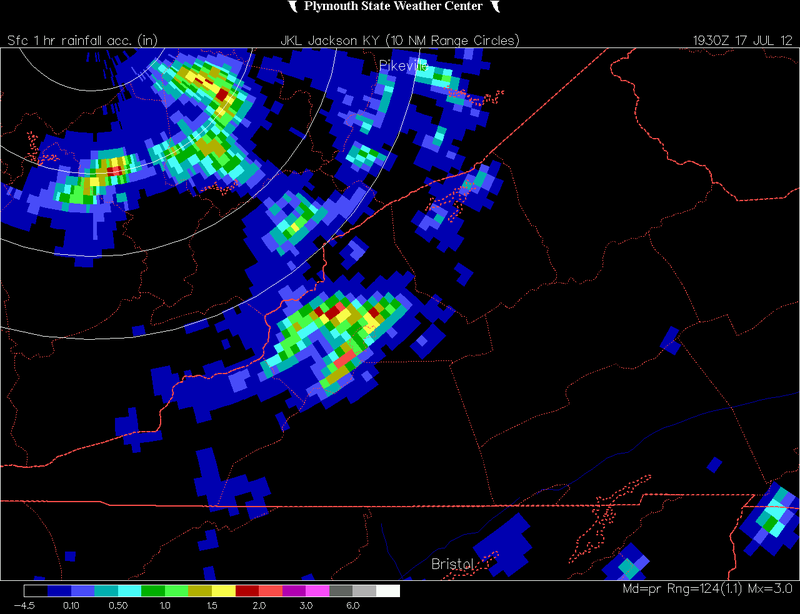 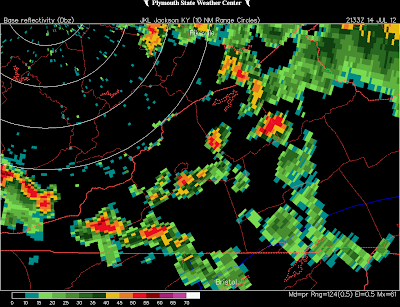 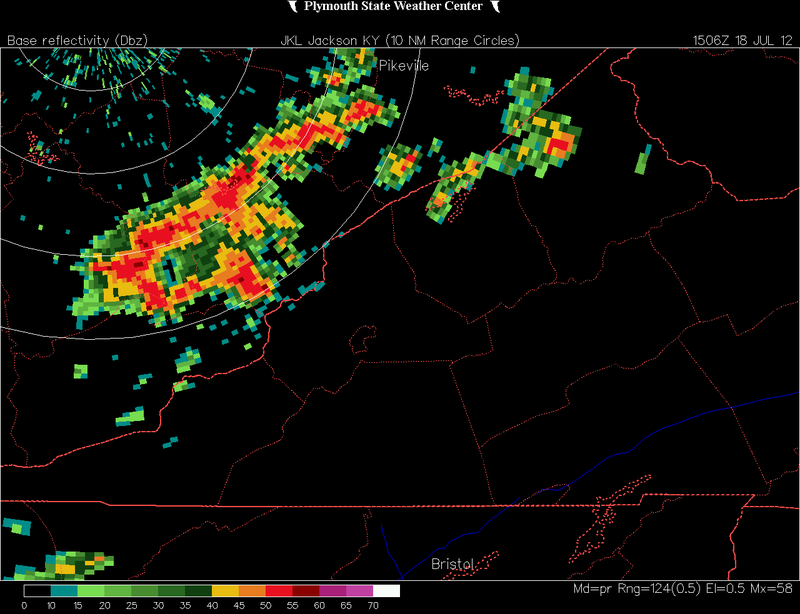 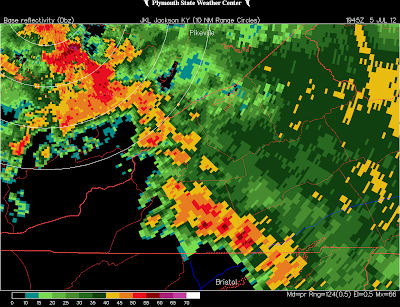 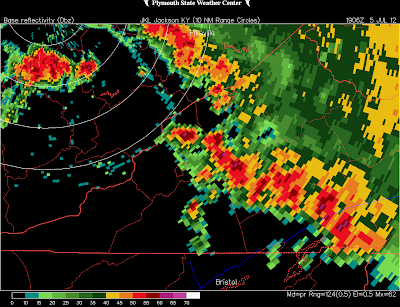 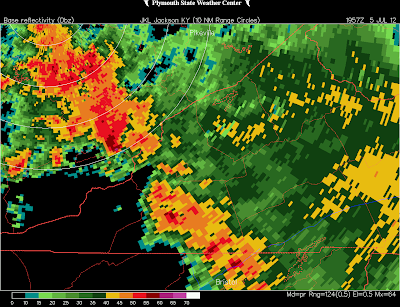 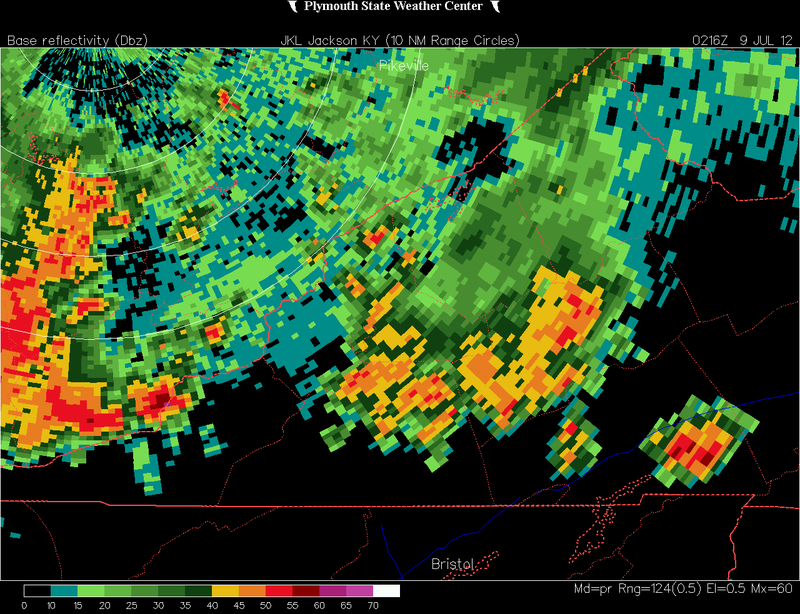 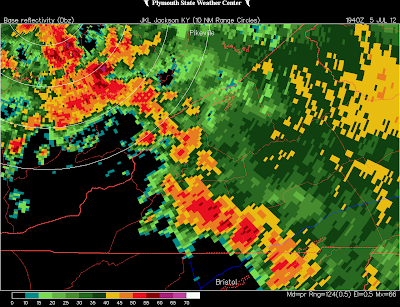 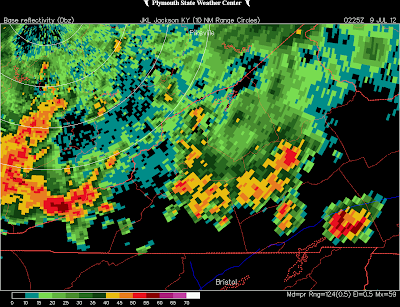 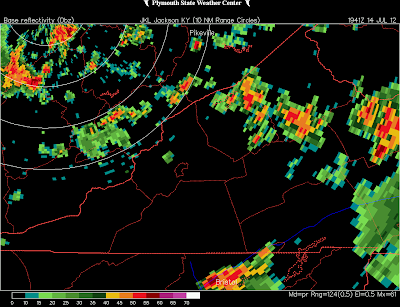 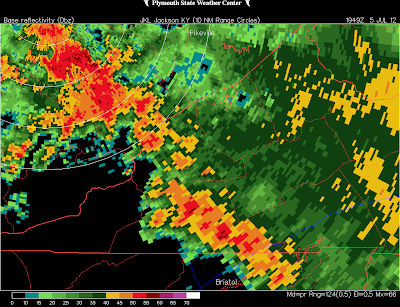 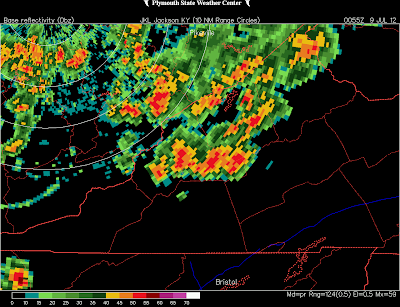 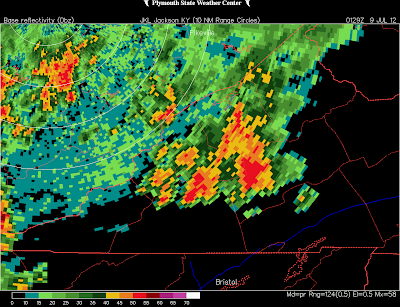 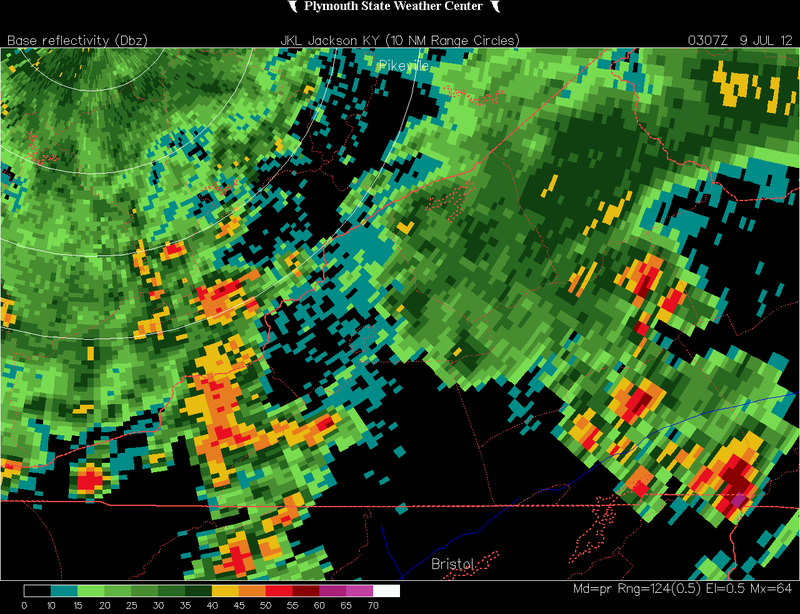 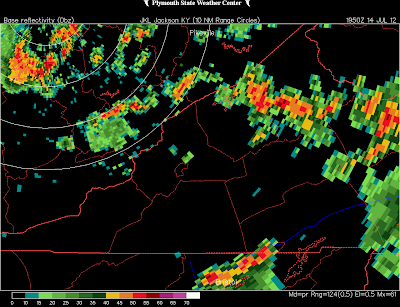 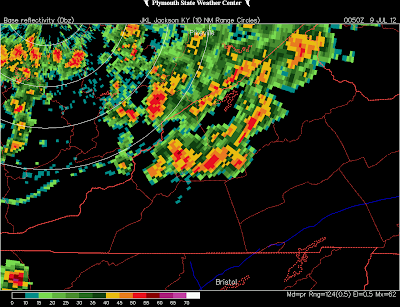 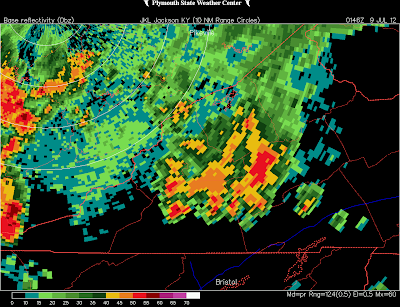 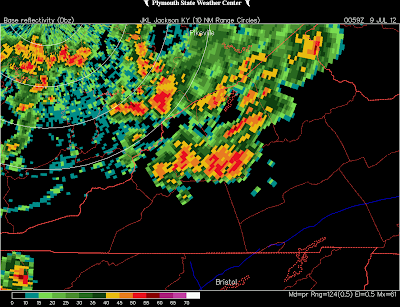 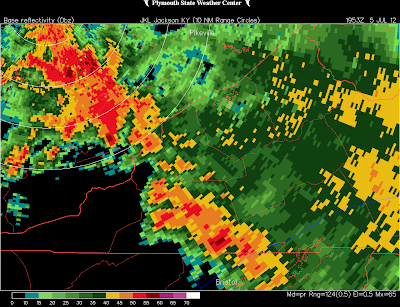 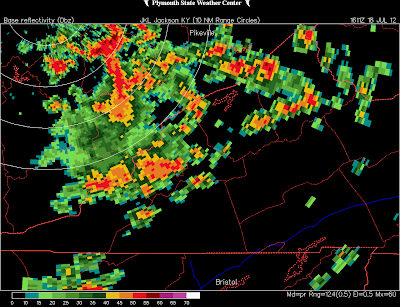 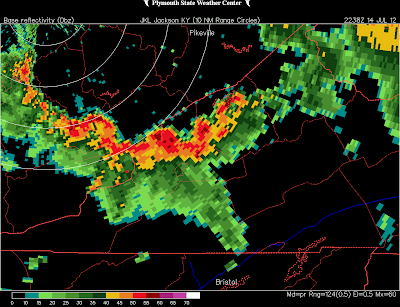 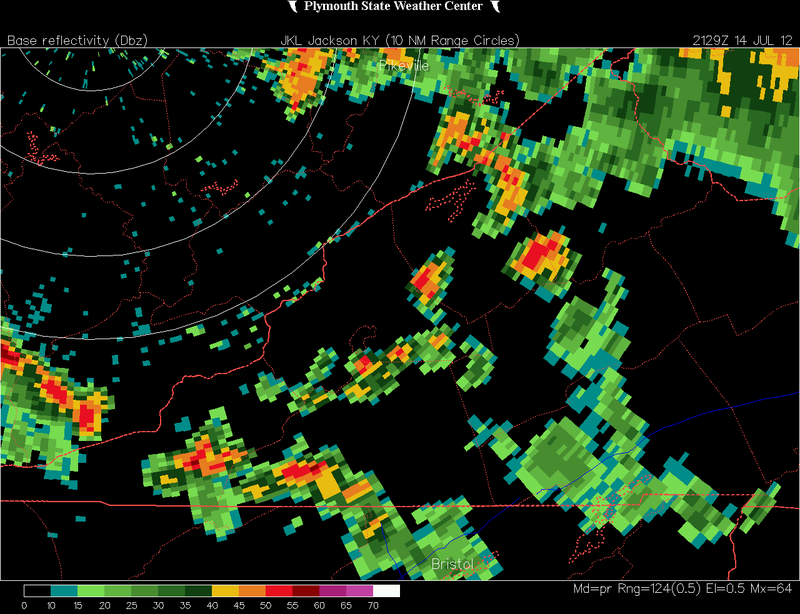 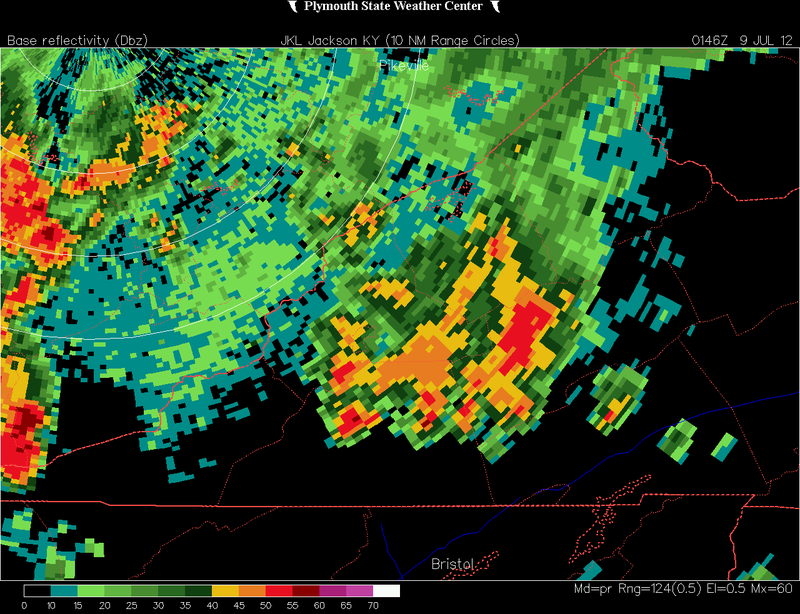 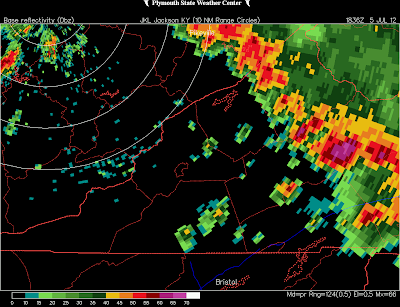 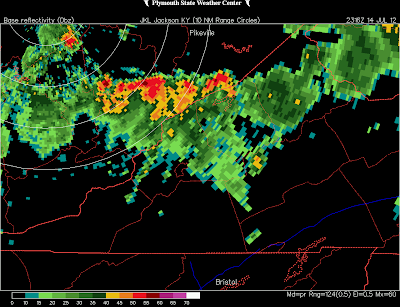 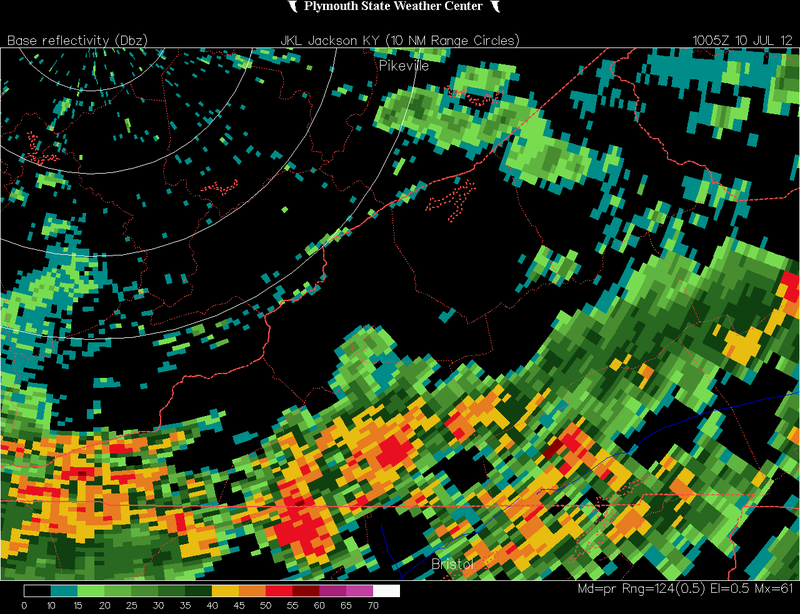 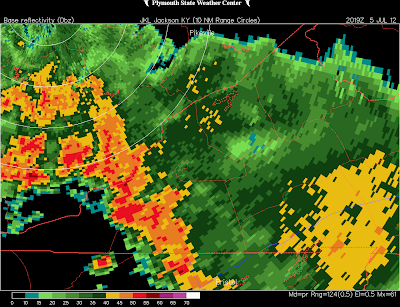 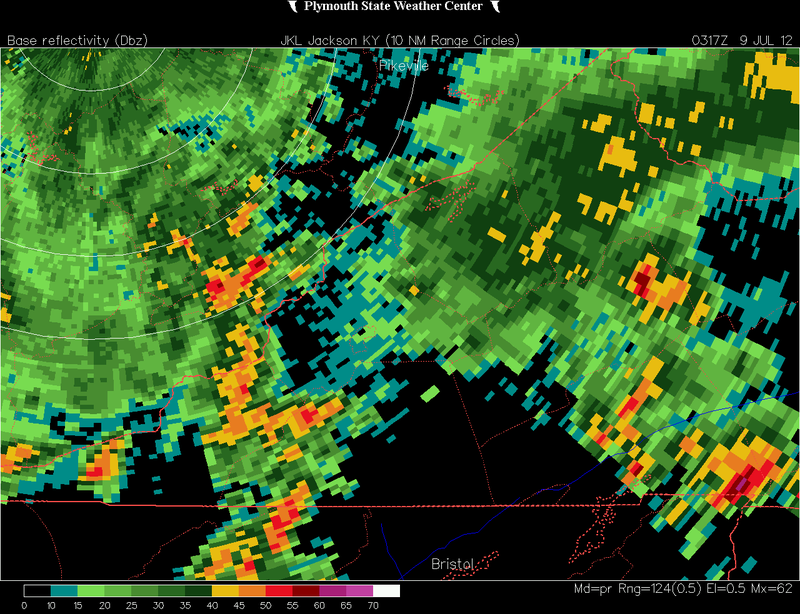 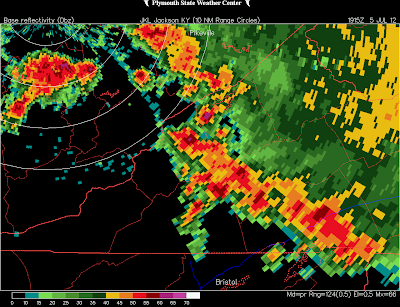 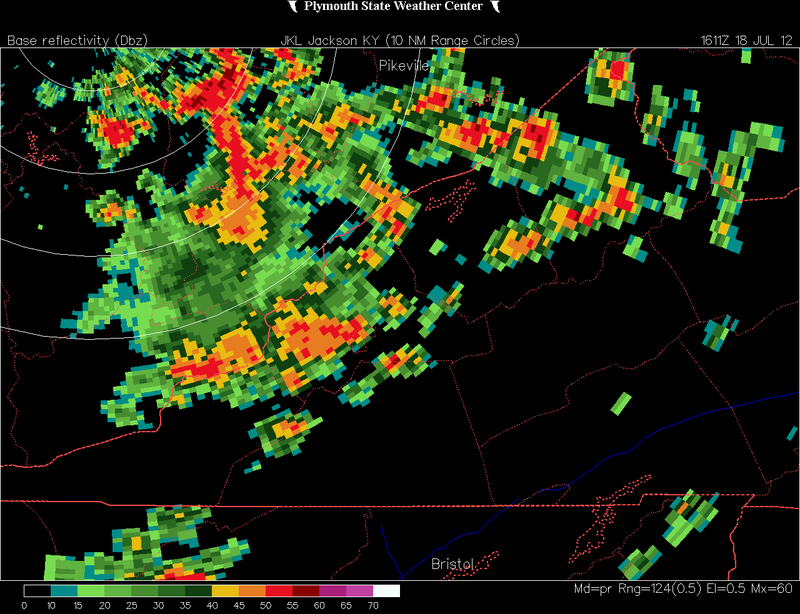 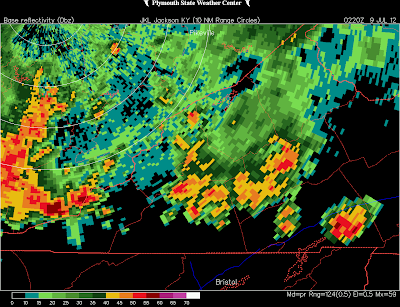 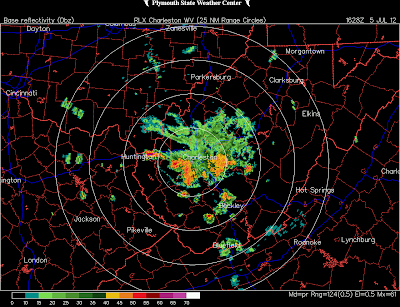 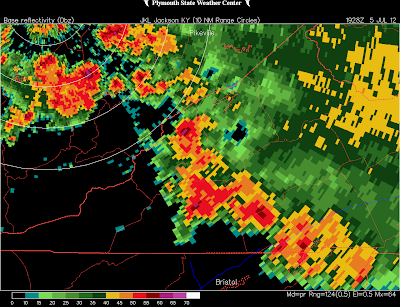 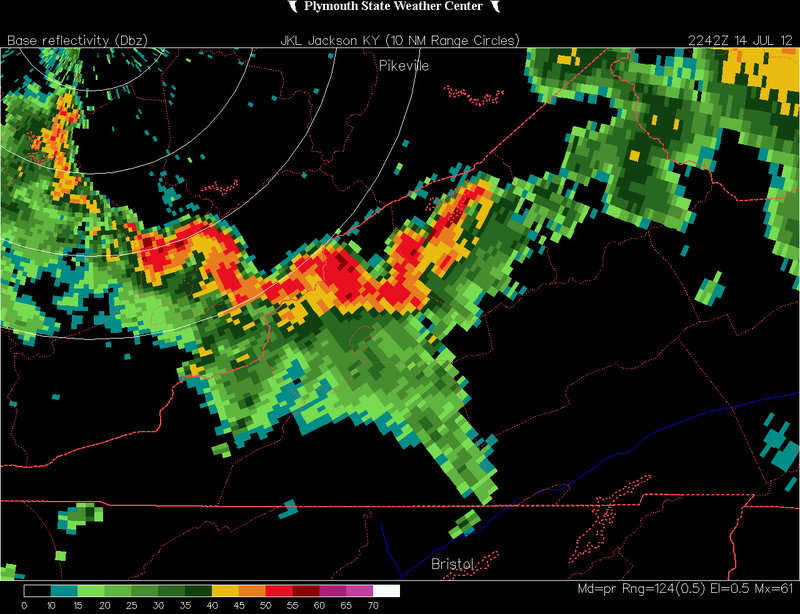 As the thunderstorm line began coming off the lofty High Knob Massif - Black Mountain corridor it developed kinks, or bows, outward in the direction of its movement ( as is most typically seen ) during the 6:10 to 7:00 PM period, with notable weakening after 7:00 PM as it moved down off the the Cumberland Overthrust Block into eastern Kentucky foothill terrain. 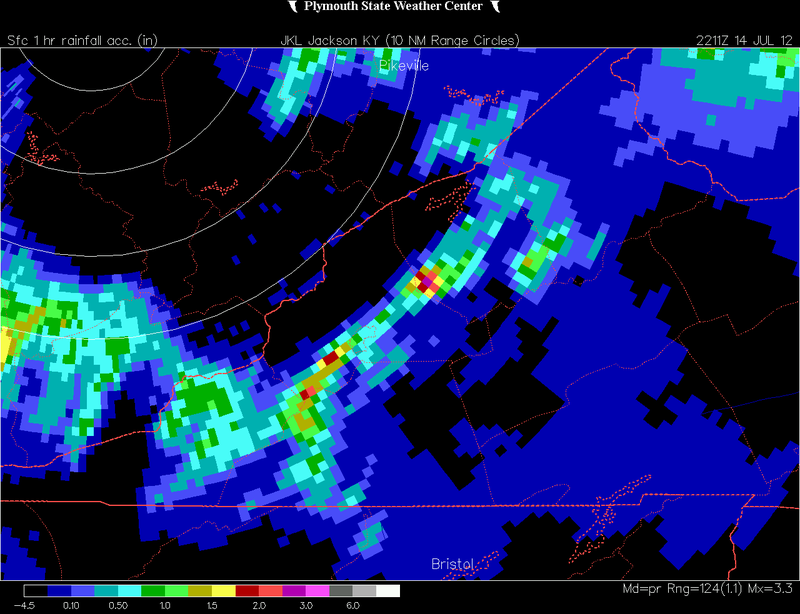 Doppler radar revealed the torrential nature of rain associated with strong thunderstorms during July 14, with up to 2.00"+ per hour falling in local places. 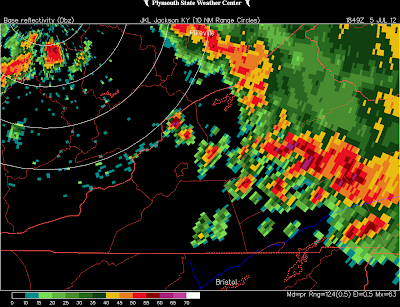 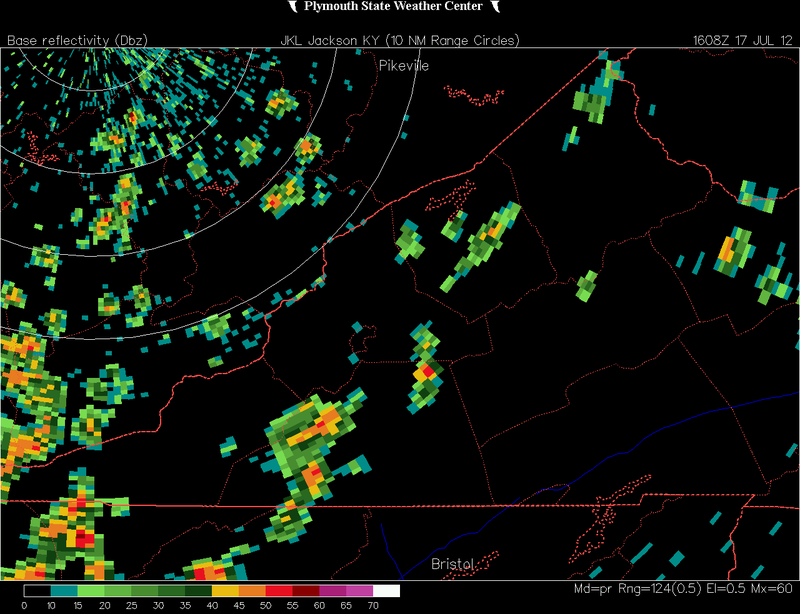 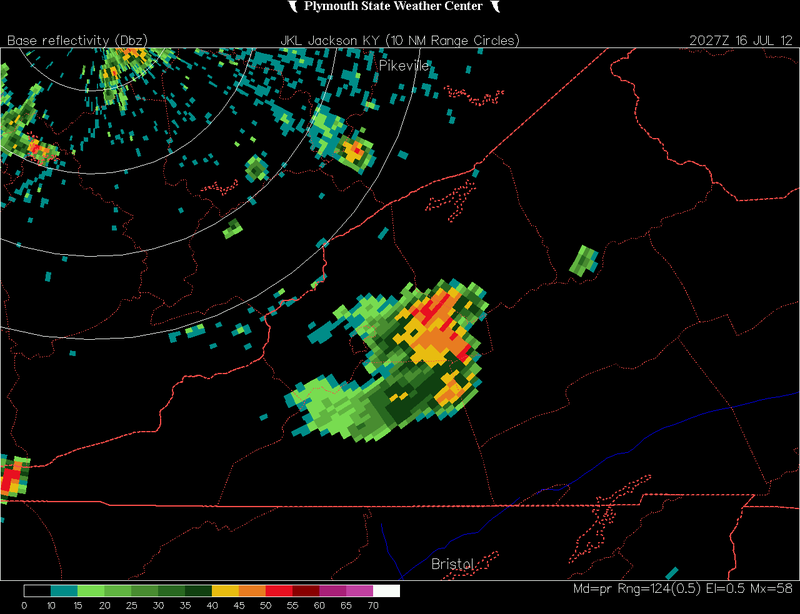 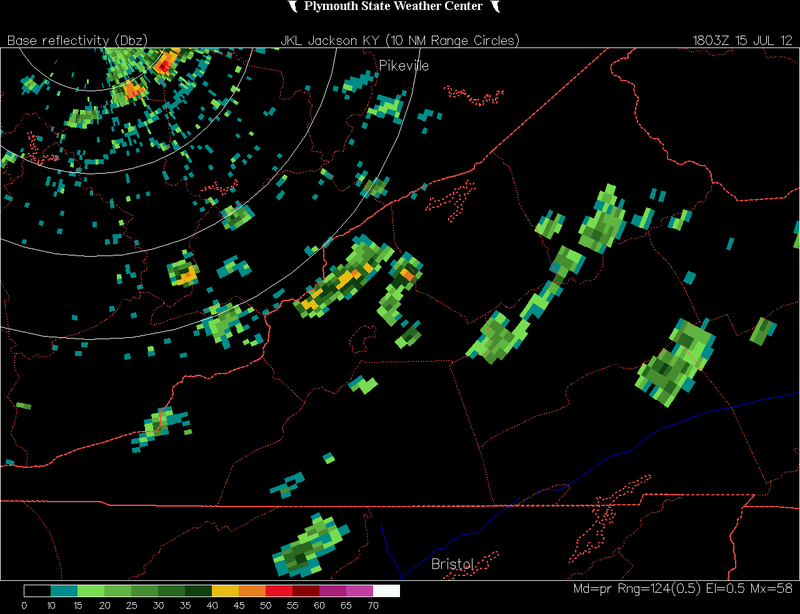 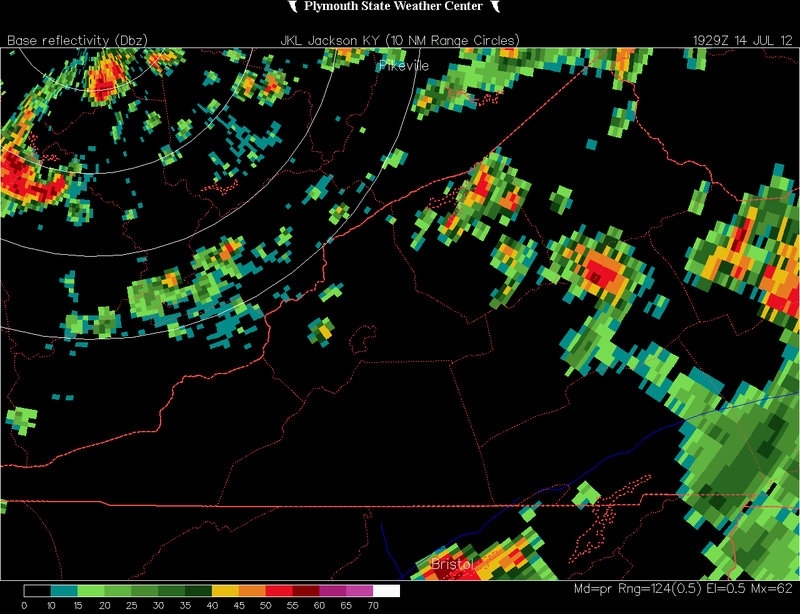 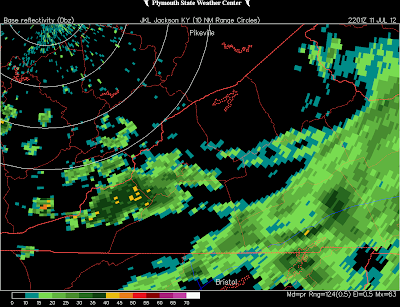 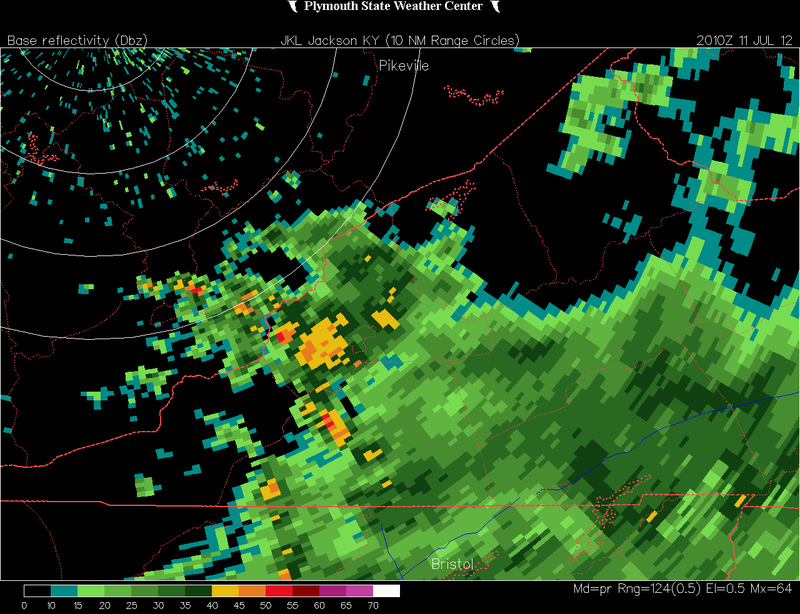 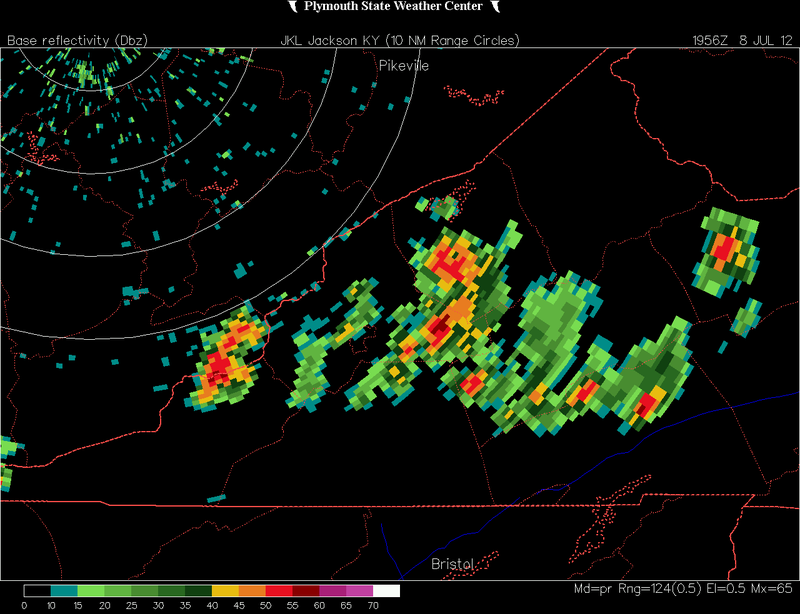 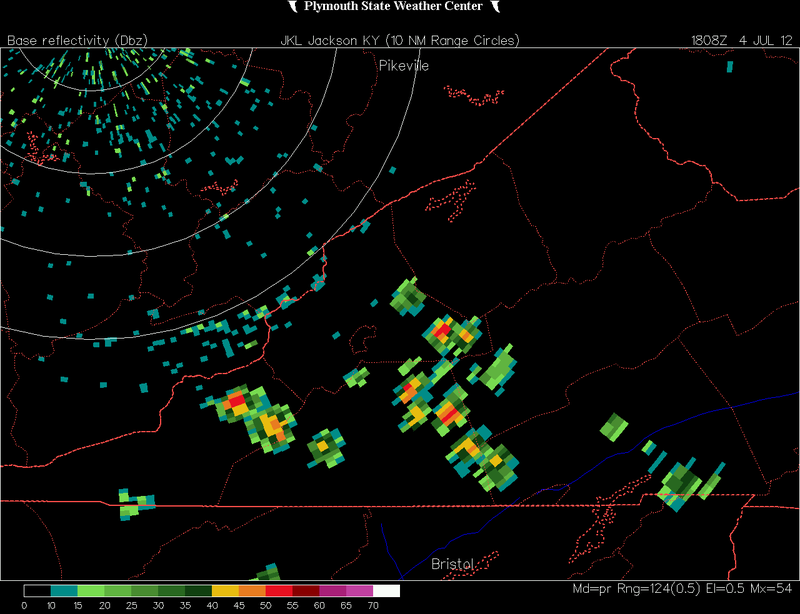 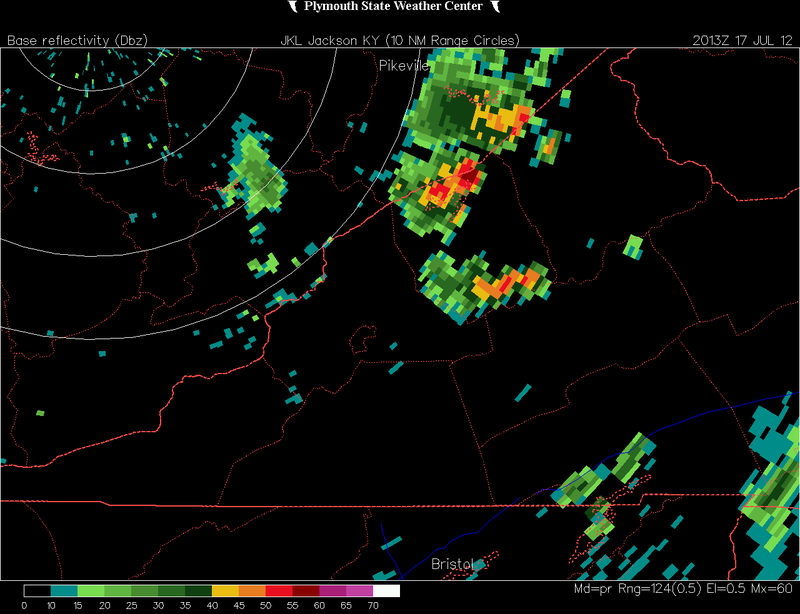 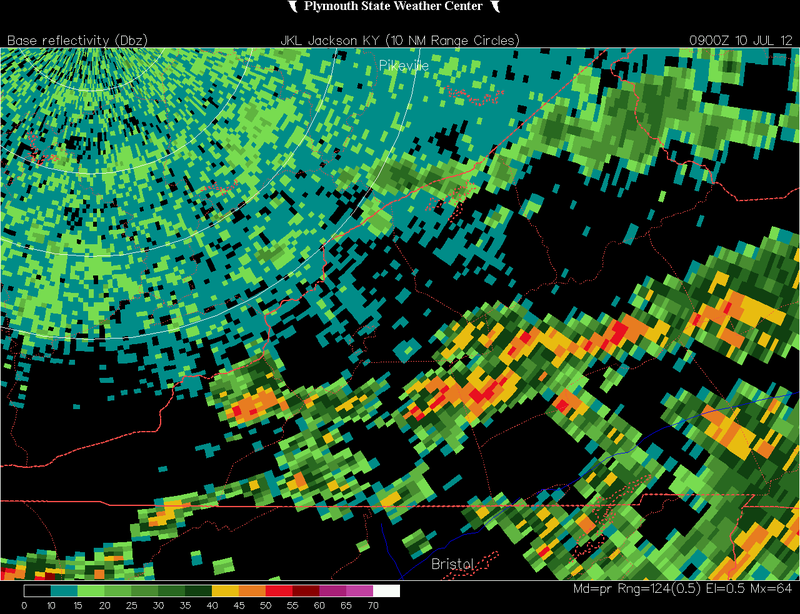 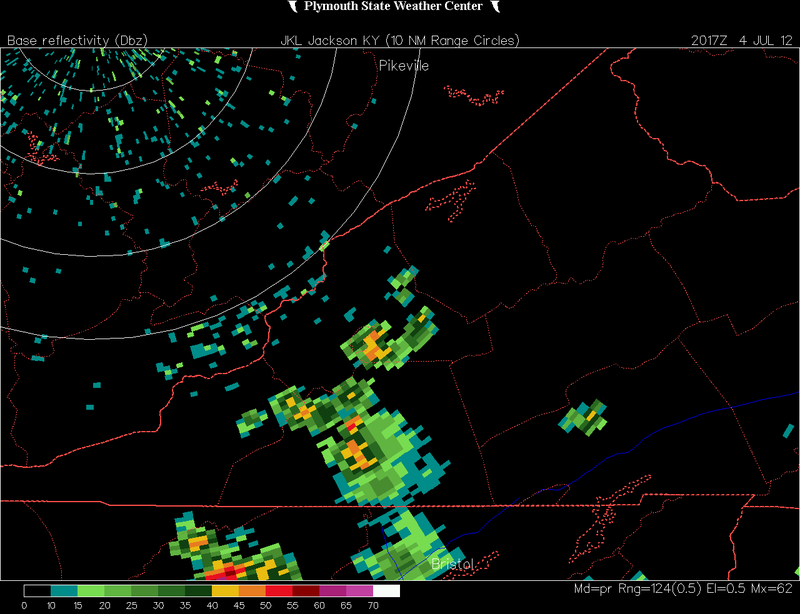 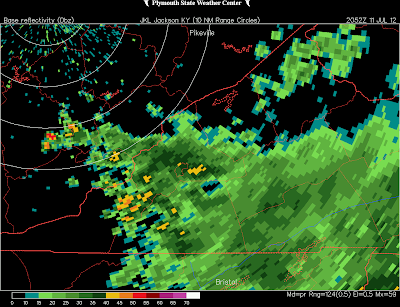 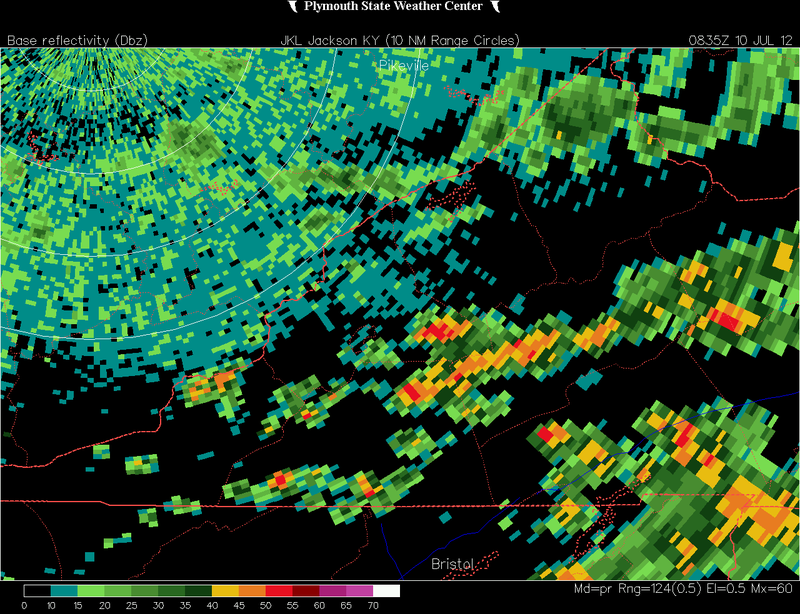 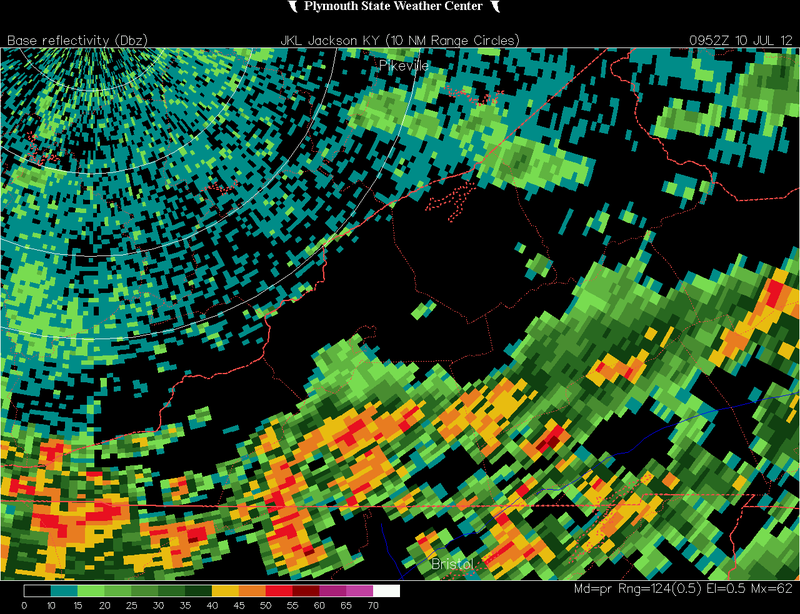 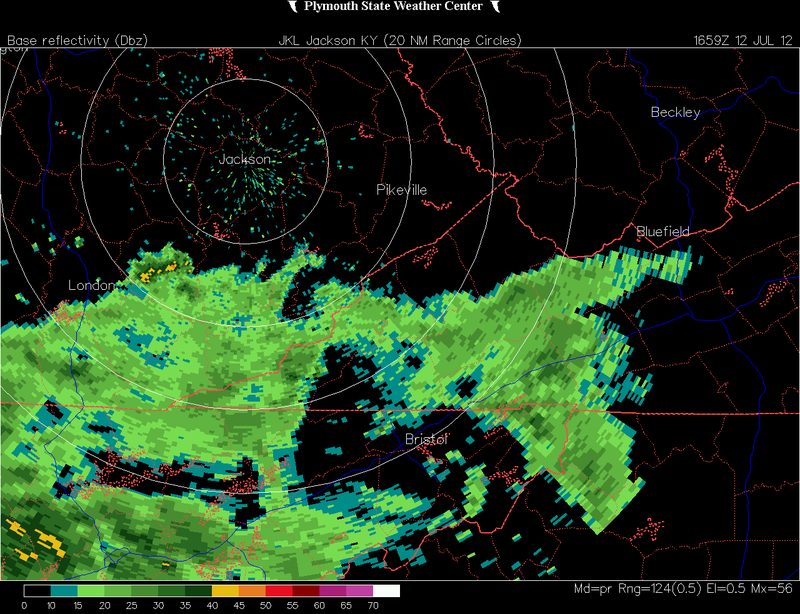 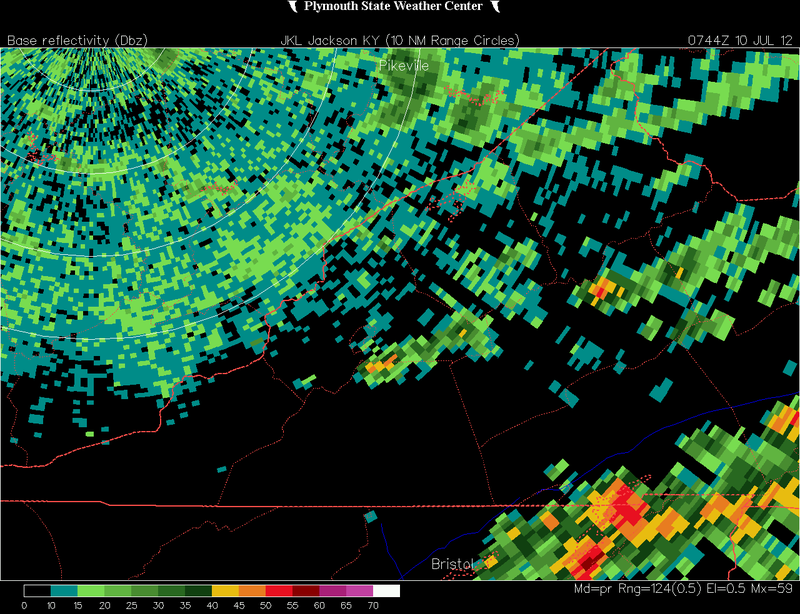 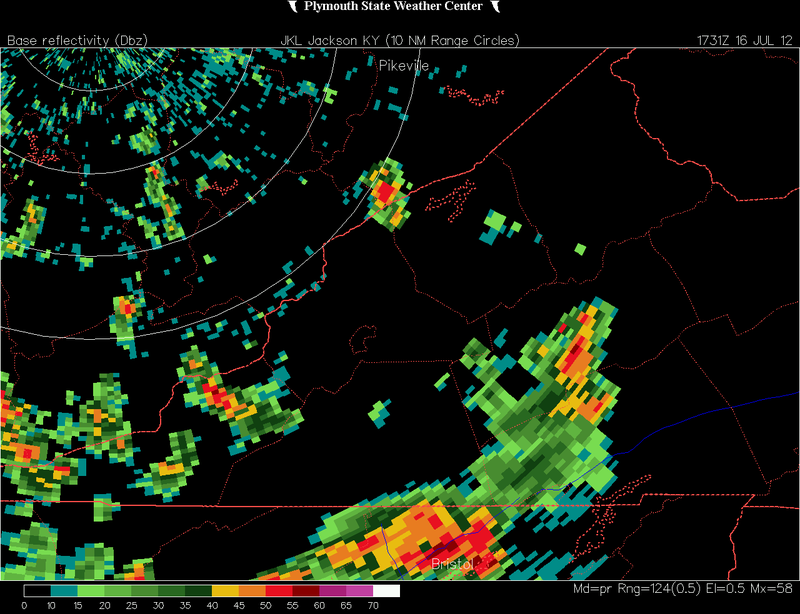 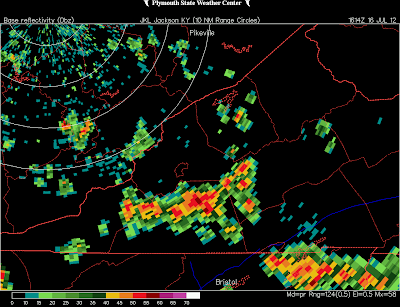 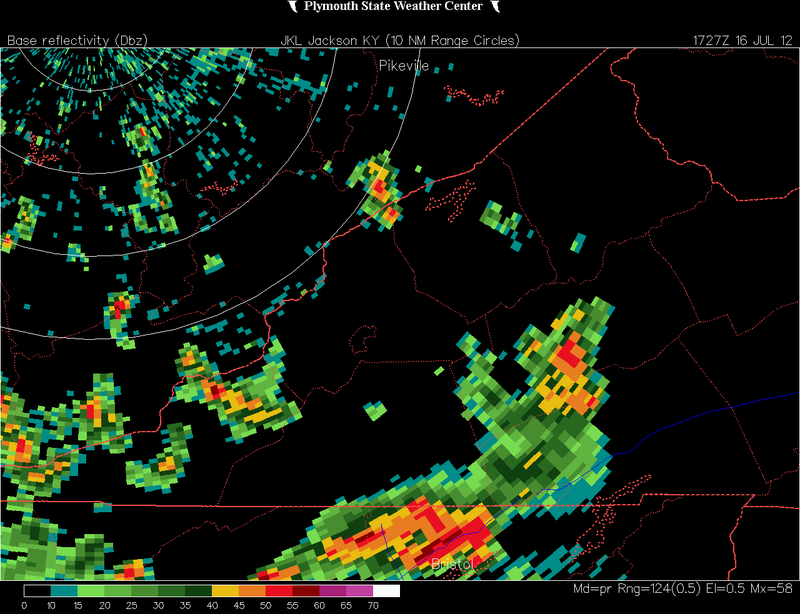 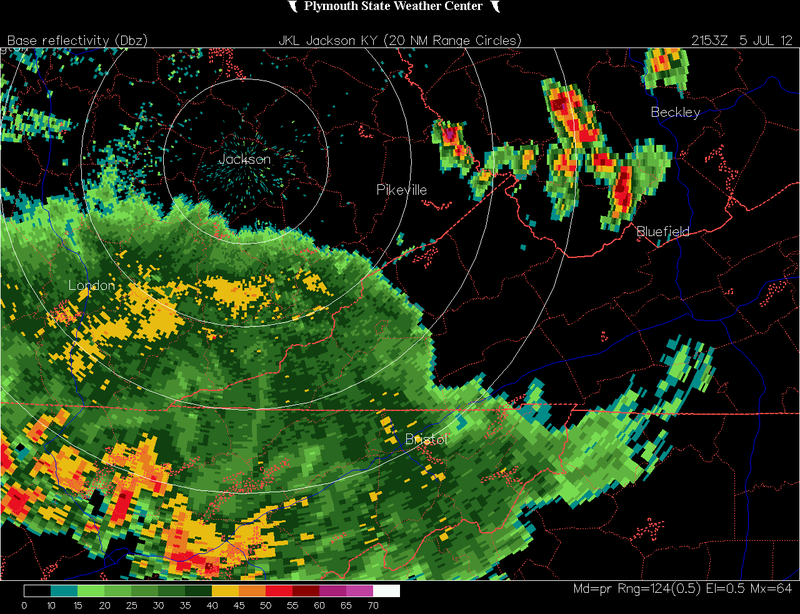 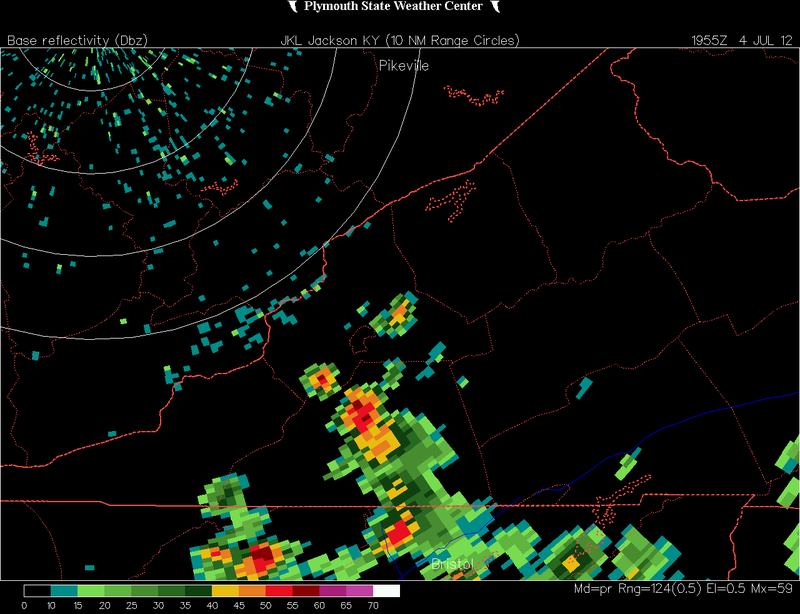 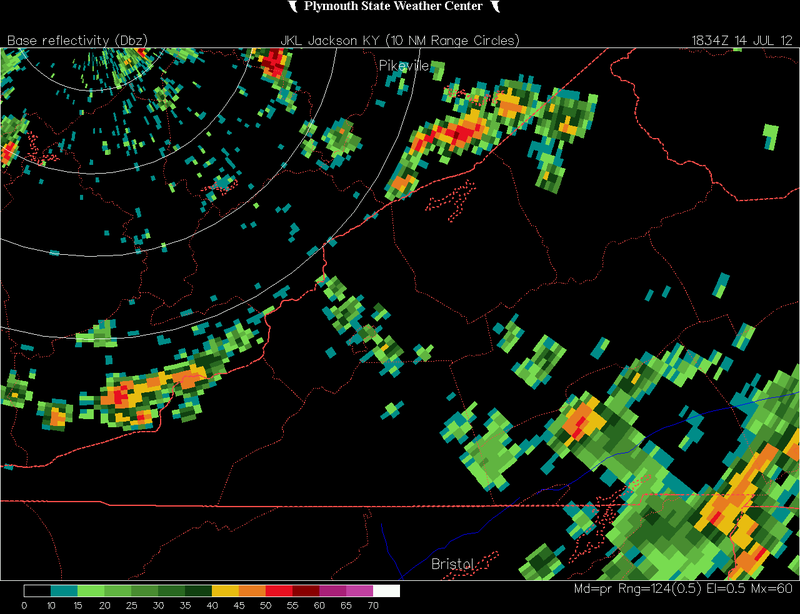 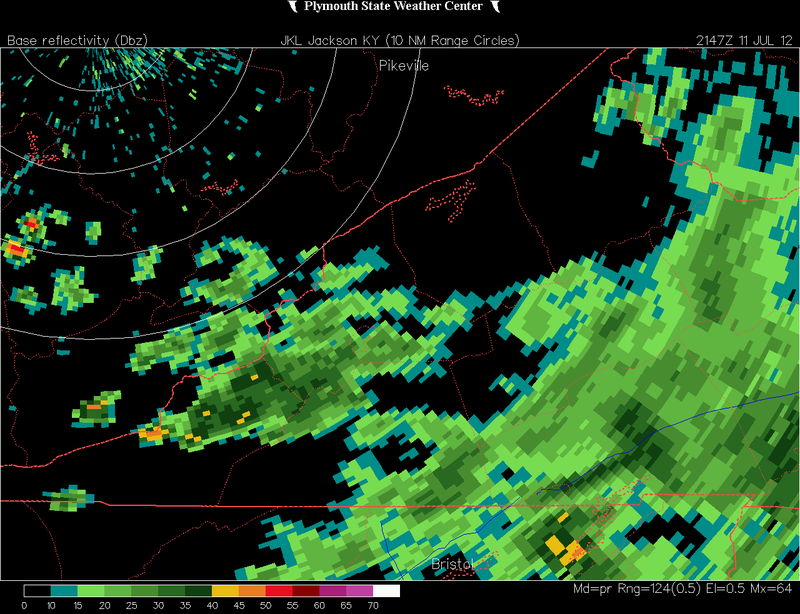 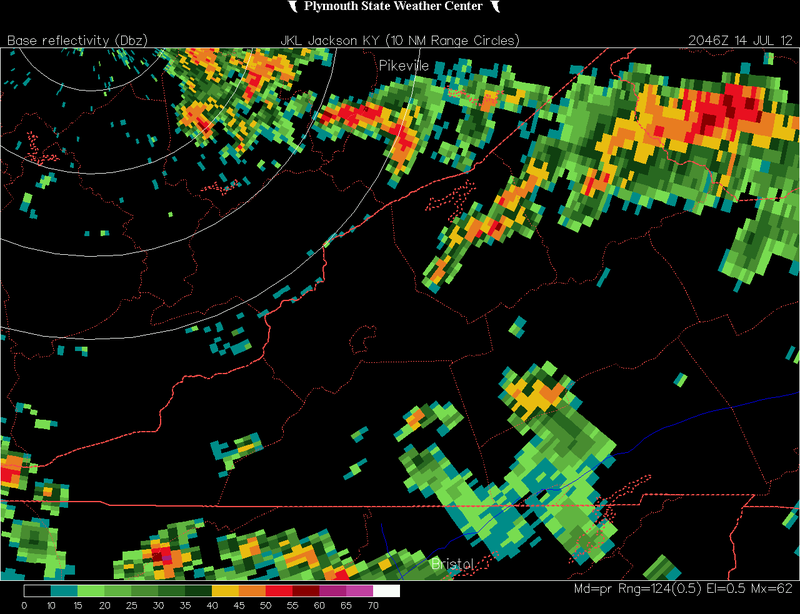 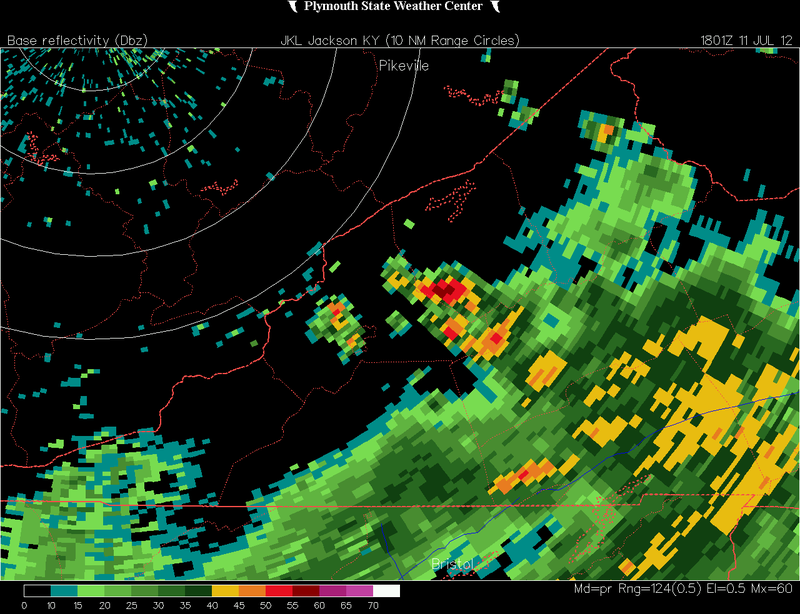 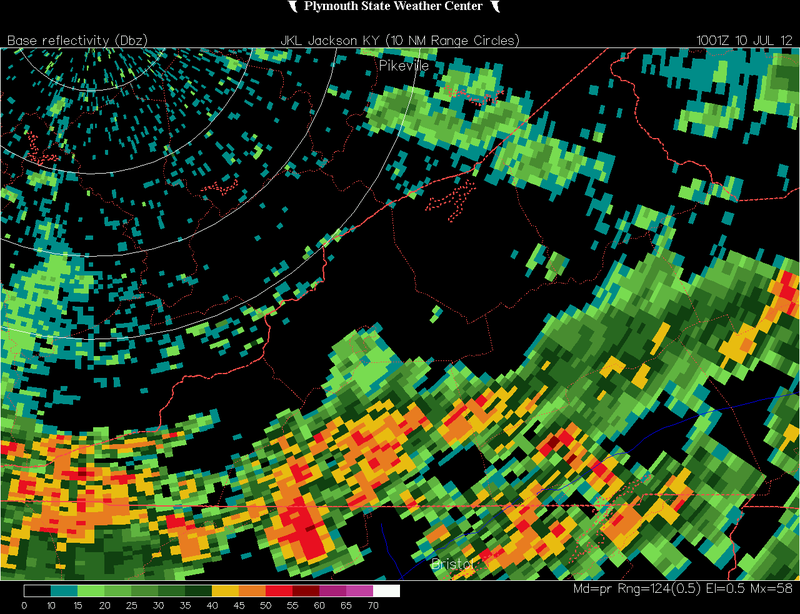 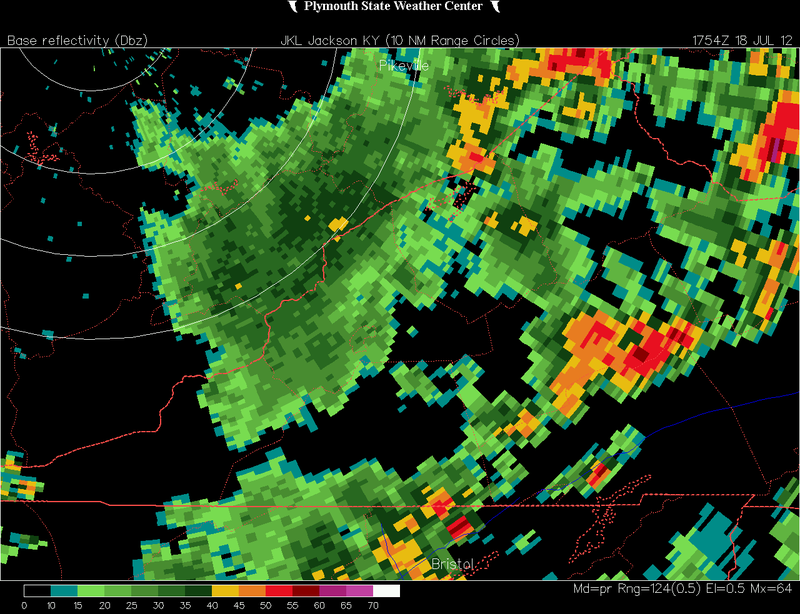 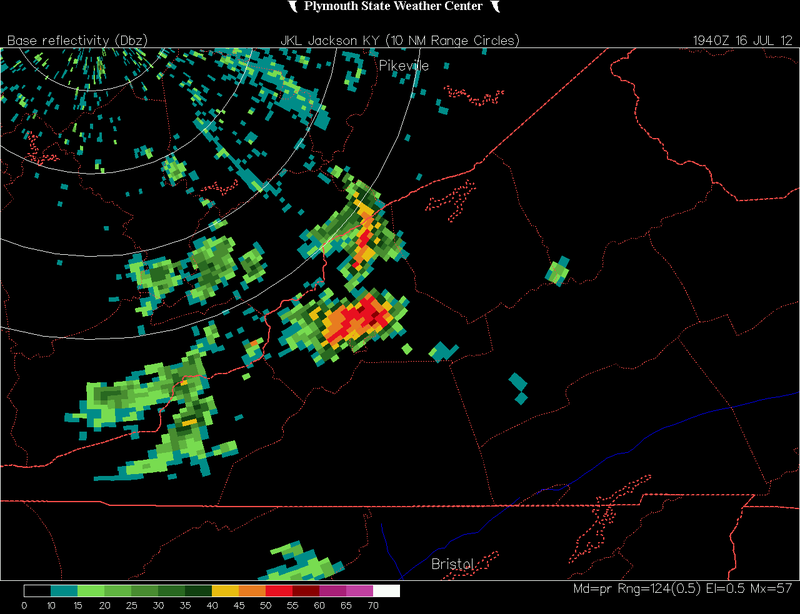 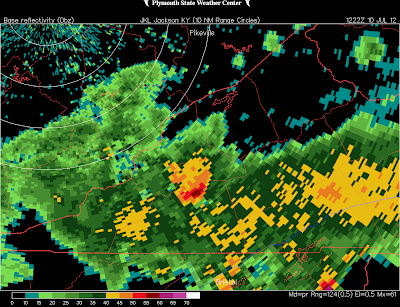 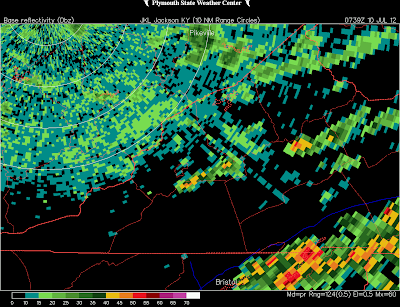 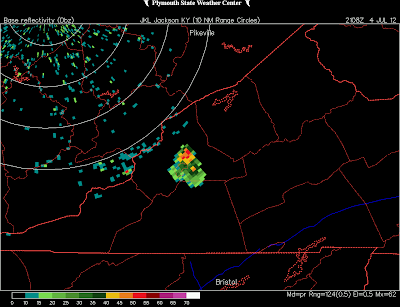 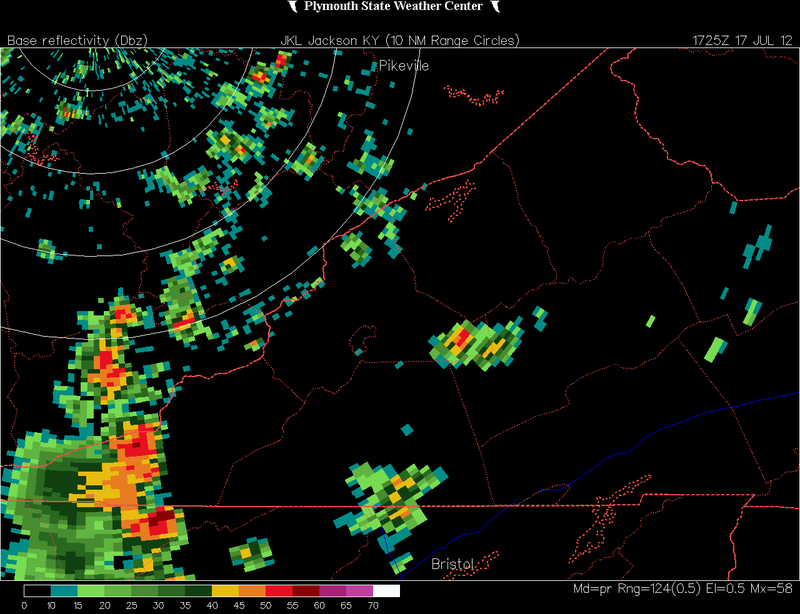 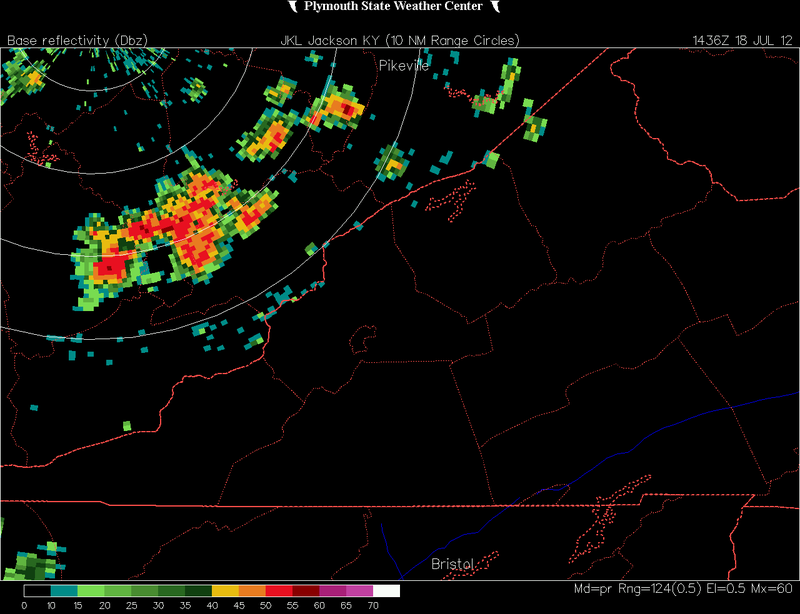 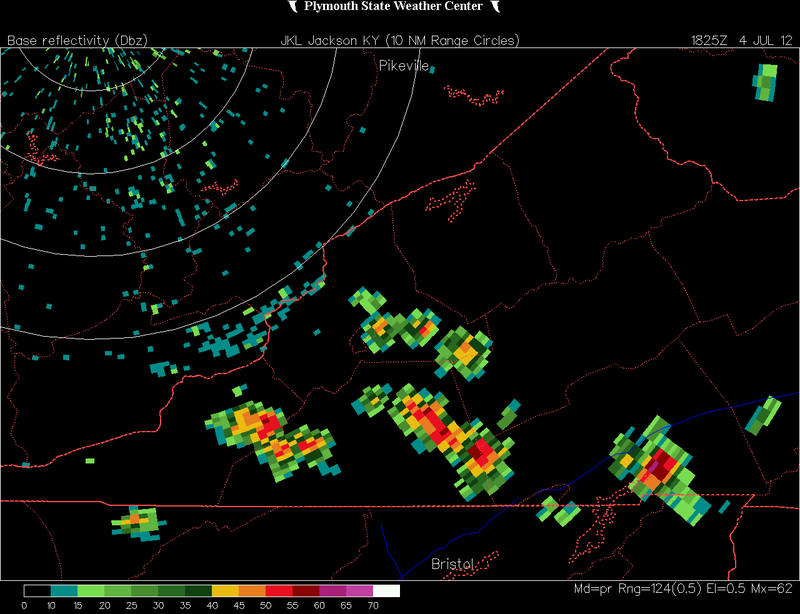 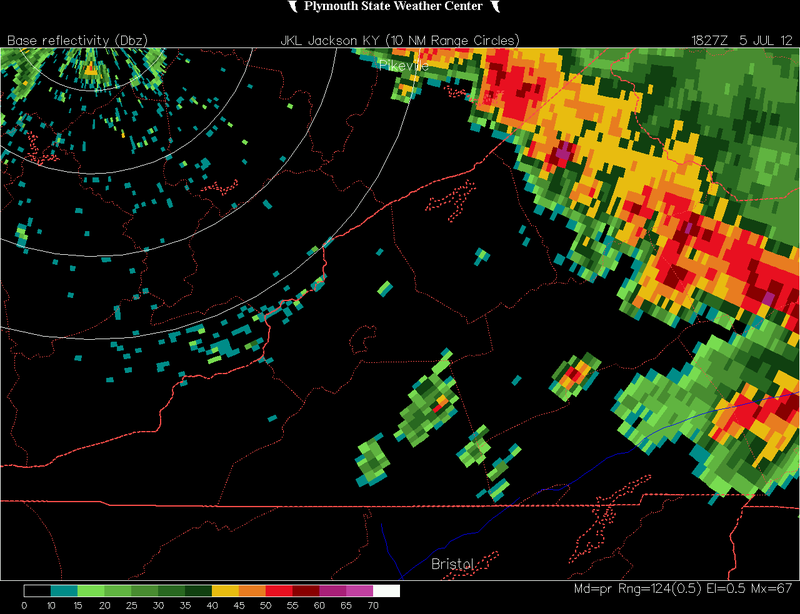 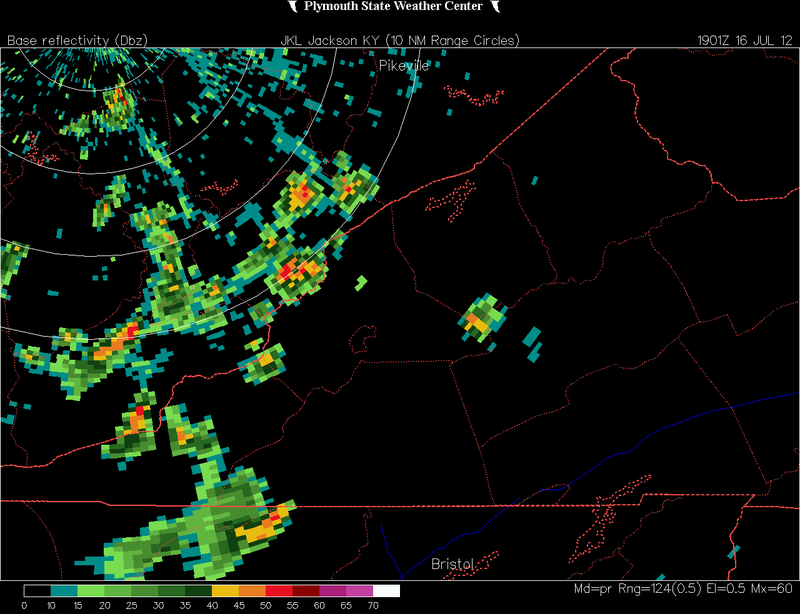 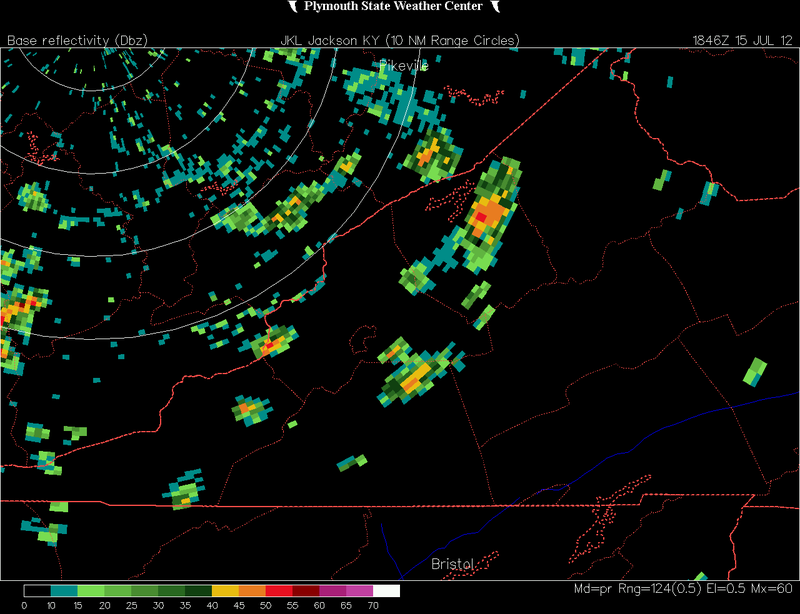 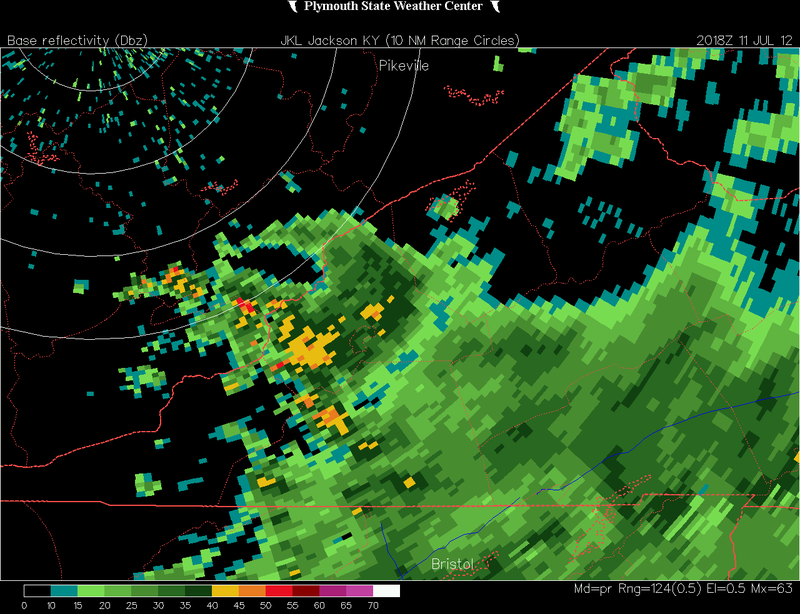 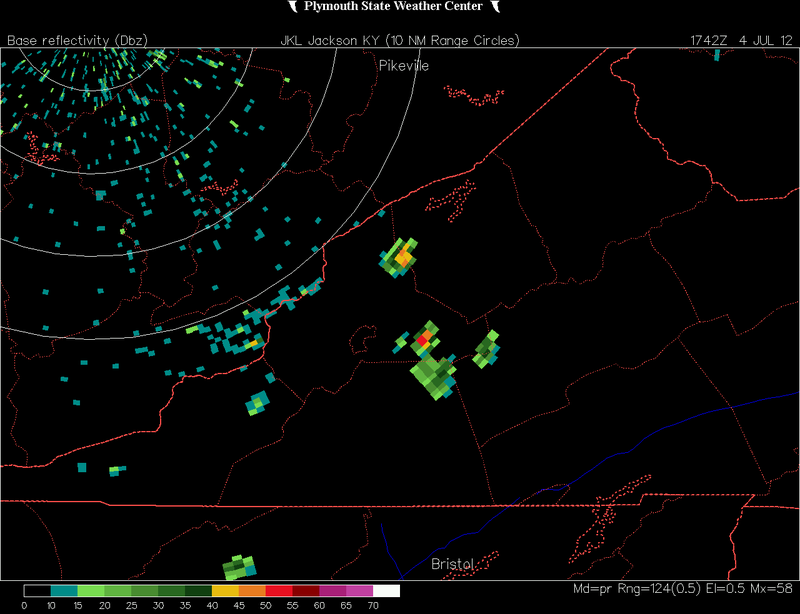 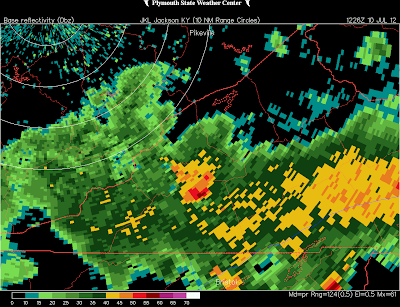 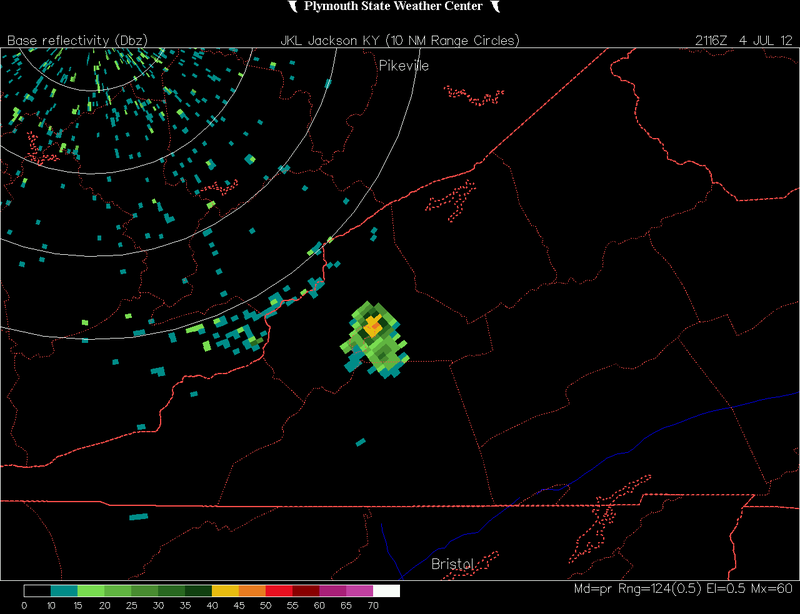 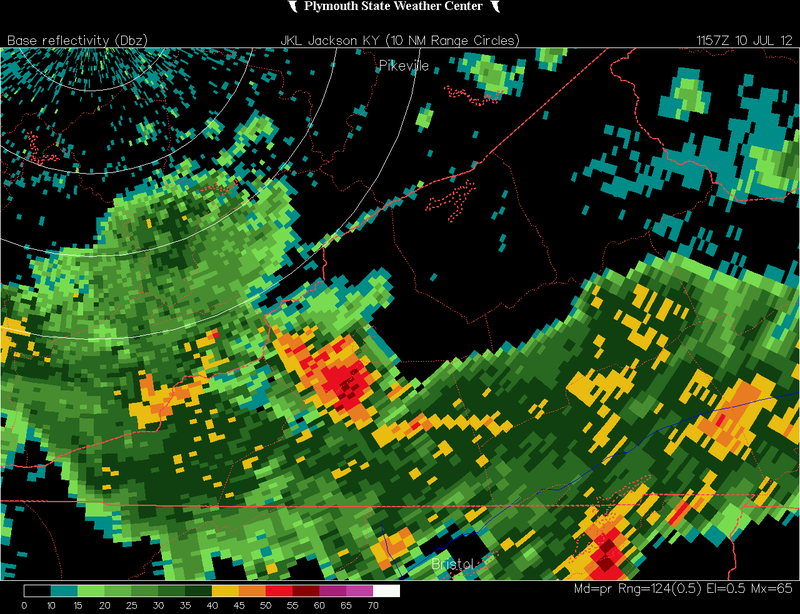 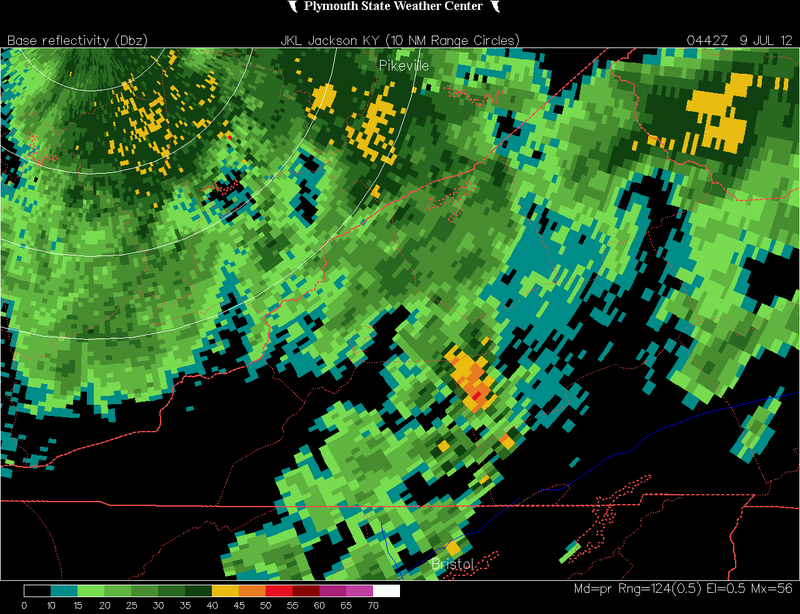 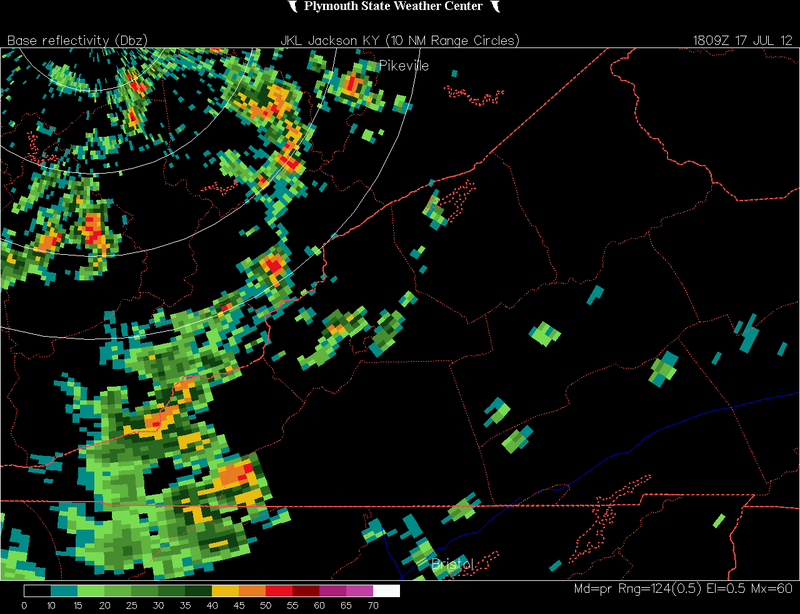 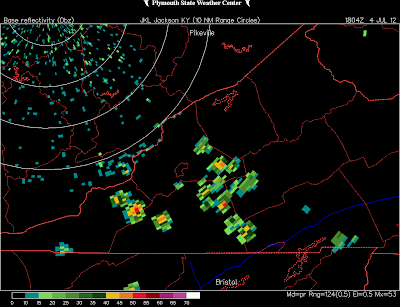 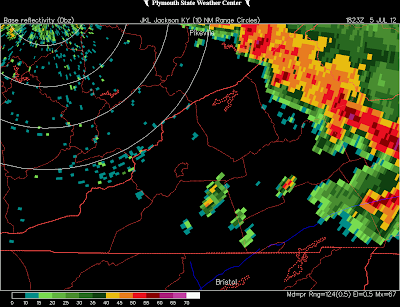 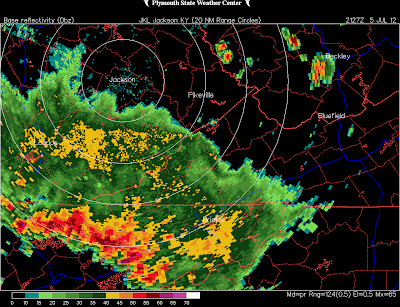 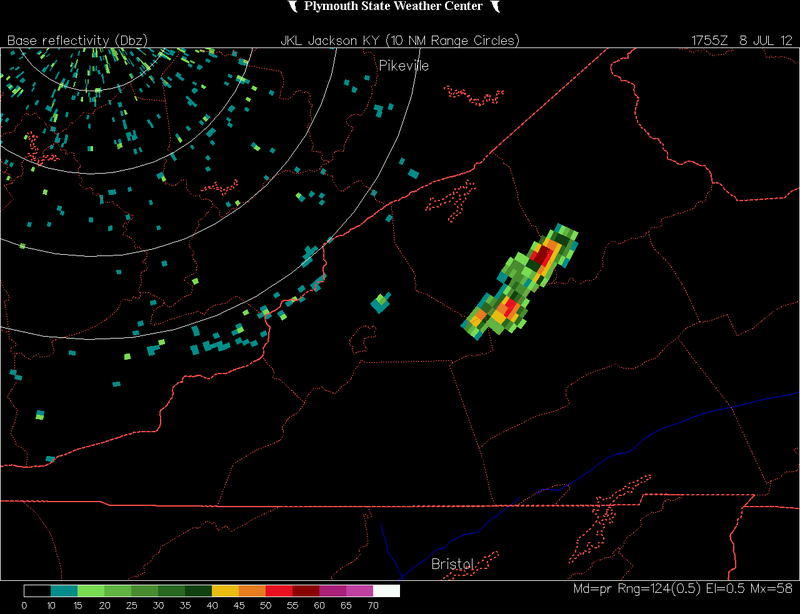 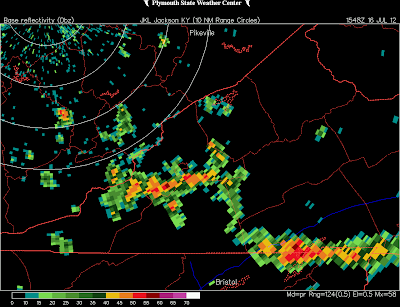 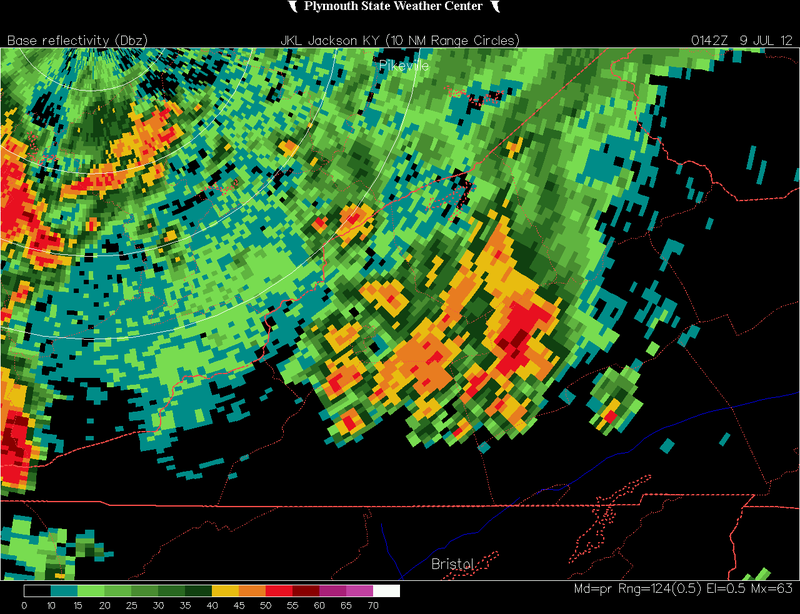 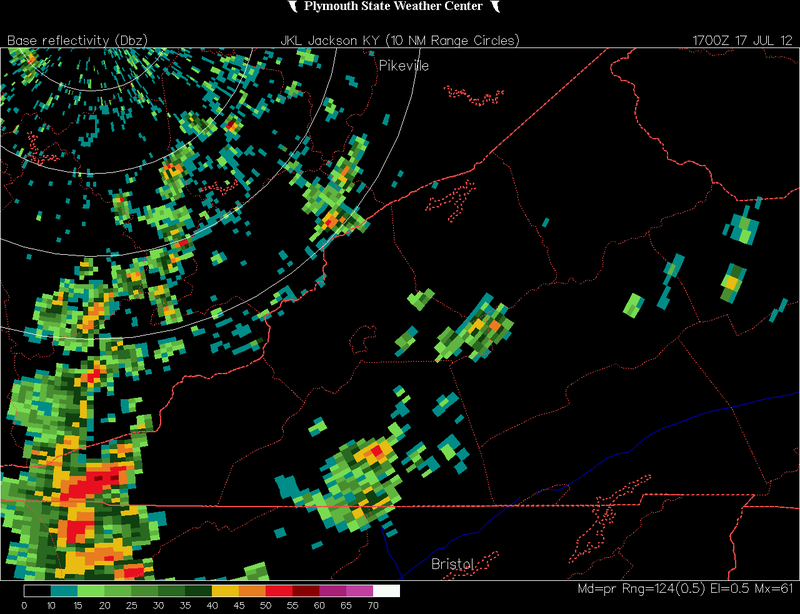 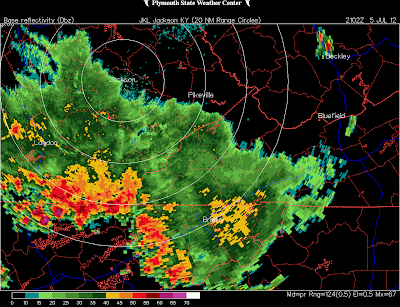 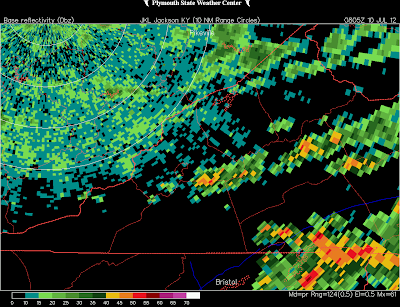 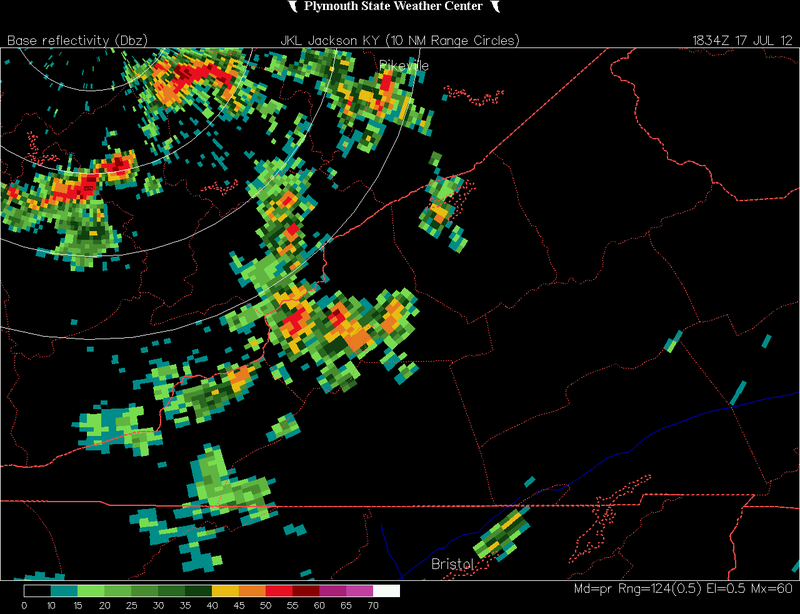 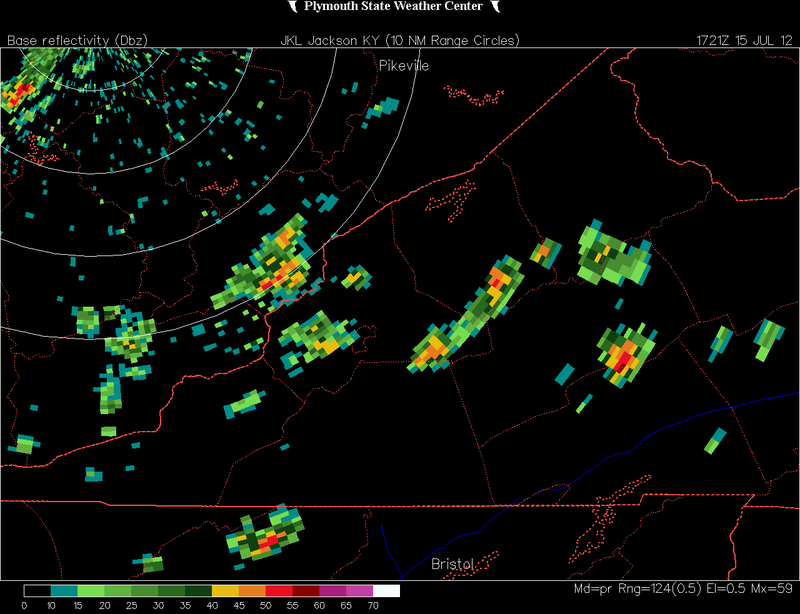 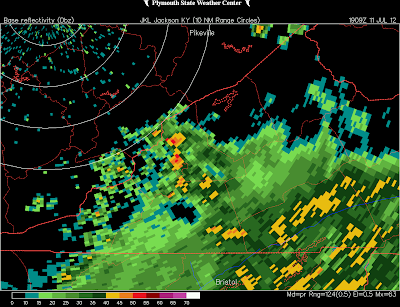 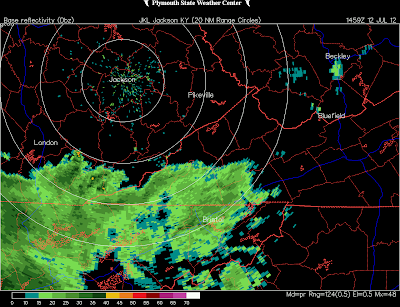 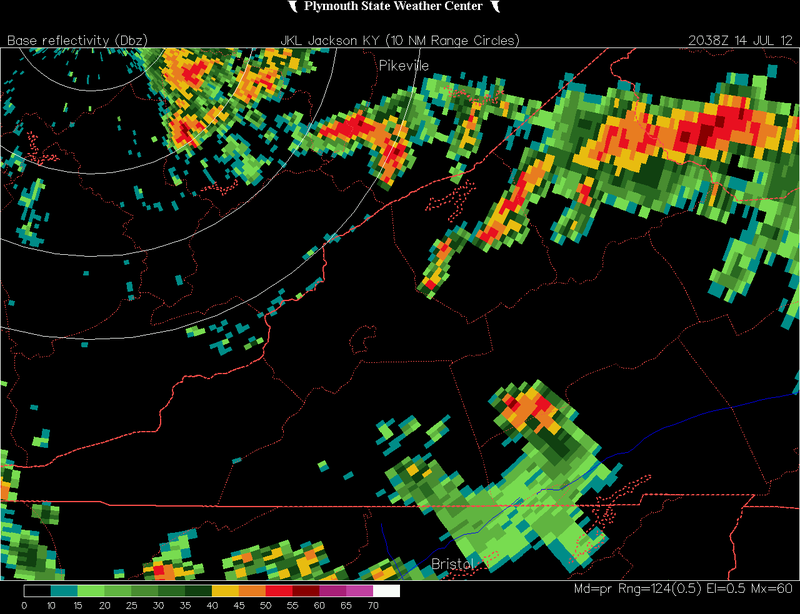 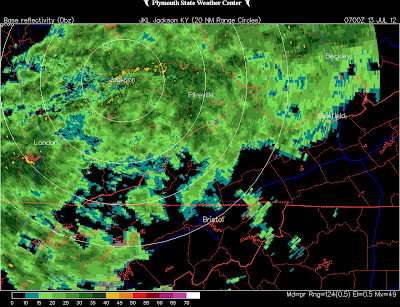 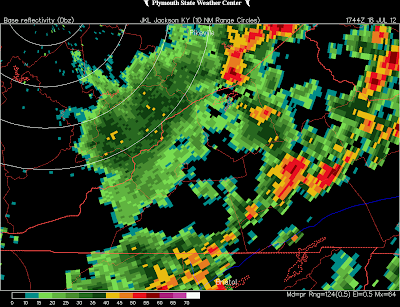 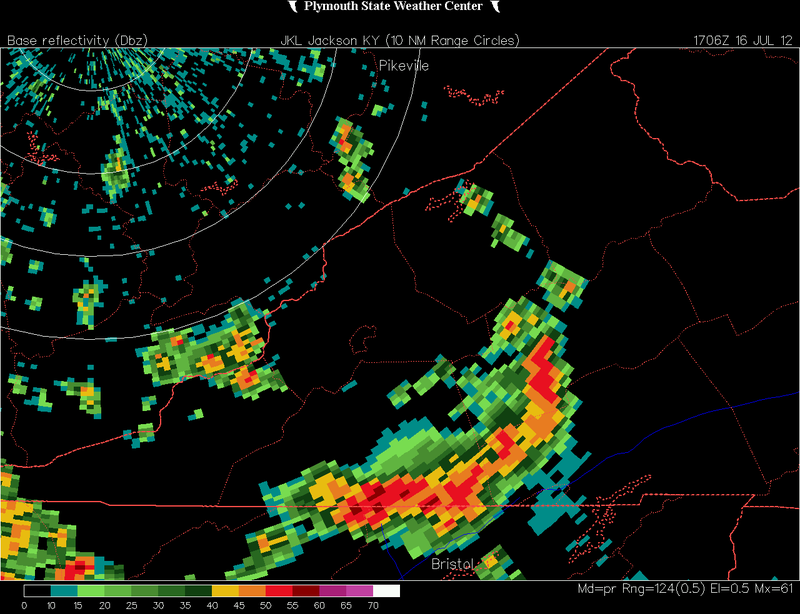 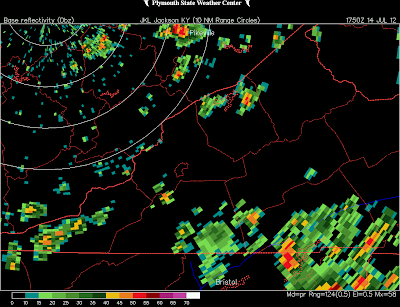 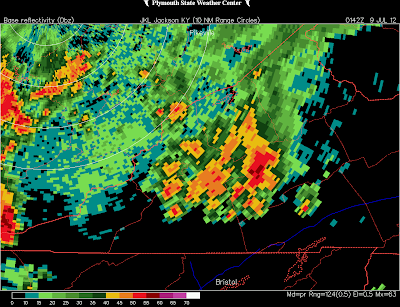 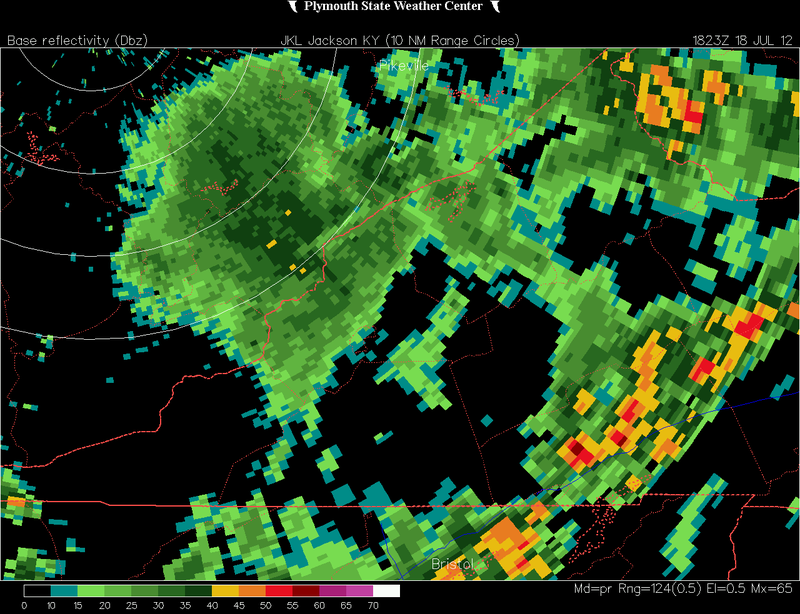 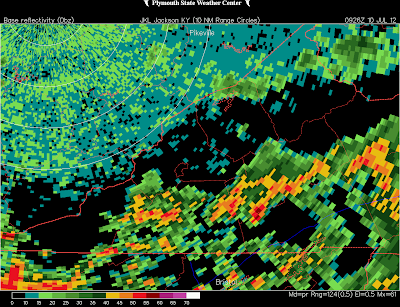 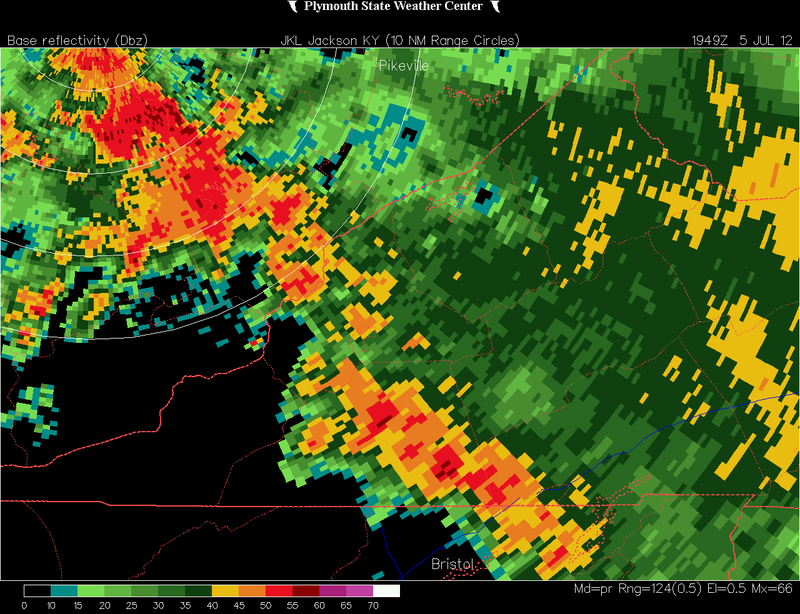 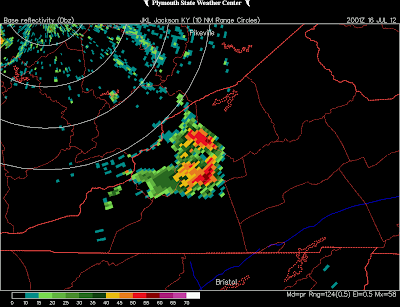 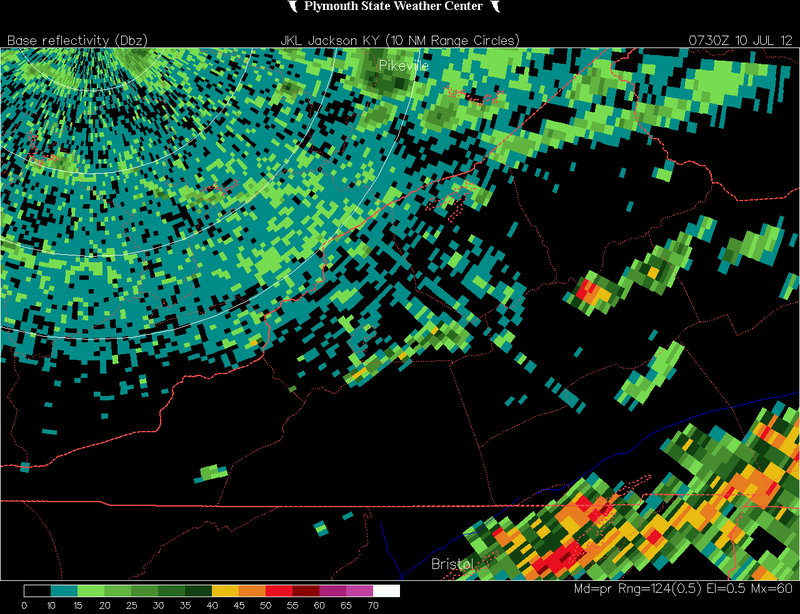 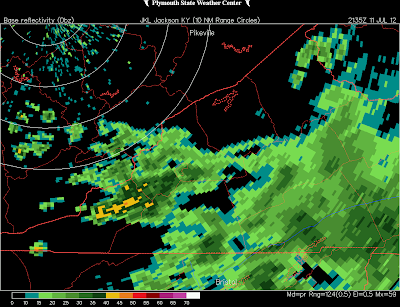 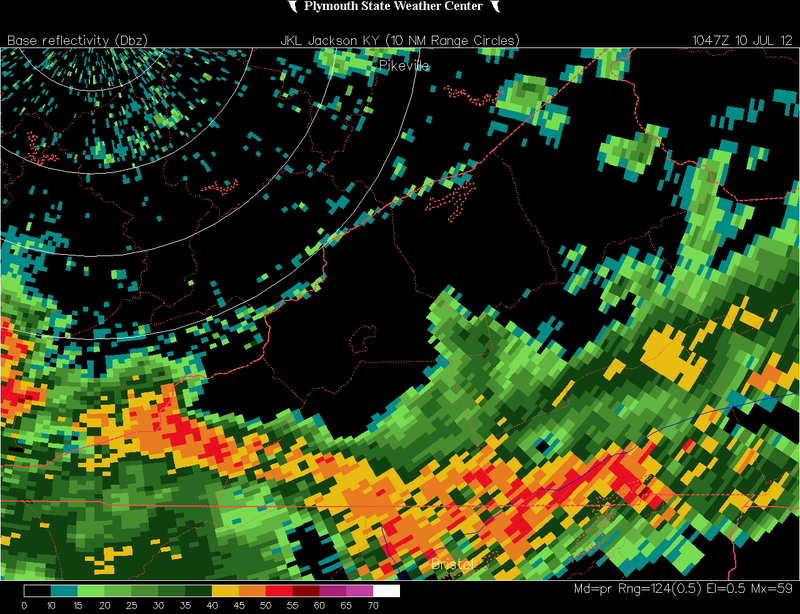 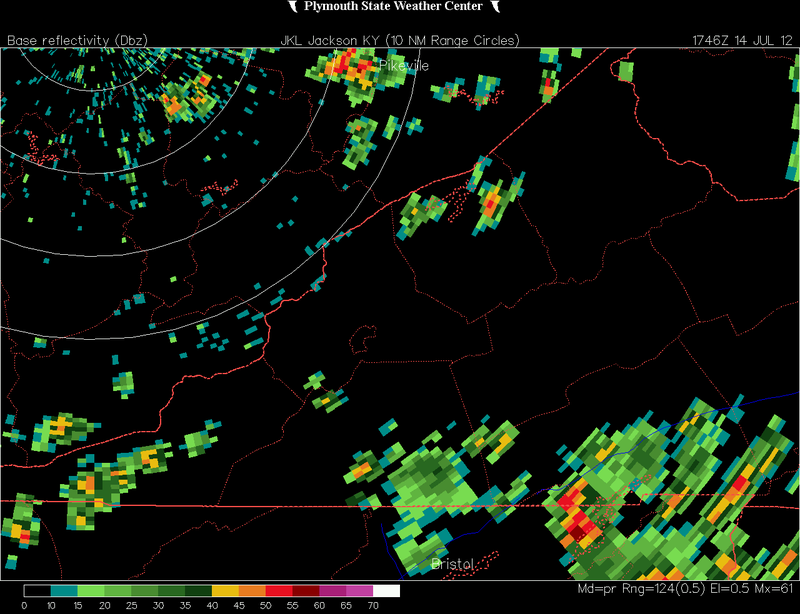 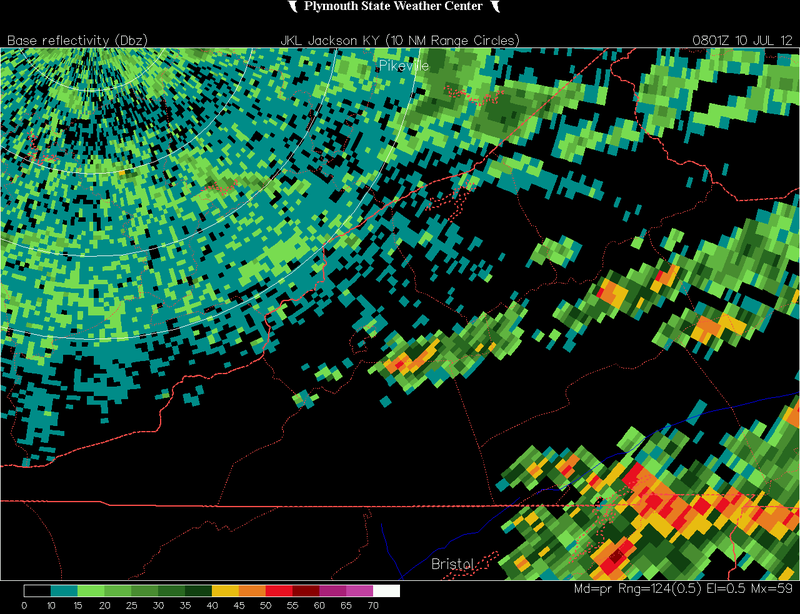 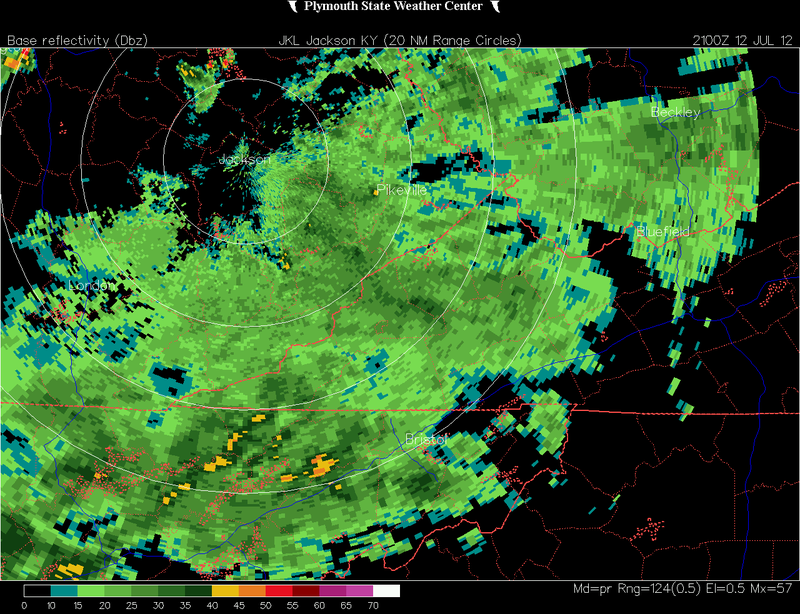 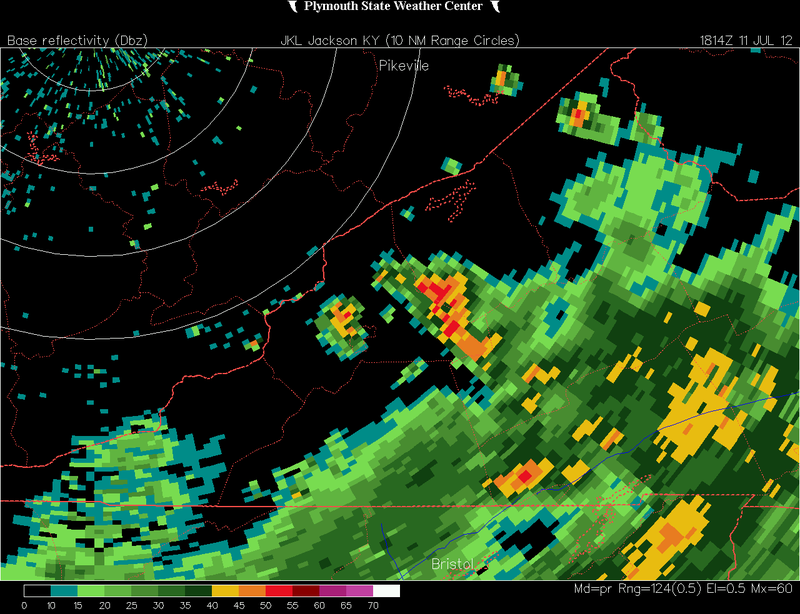 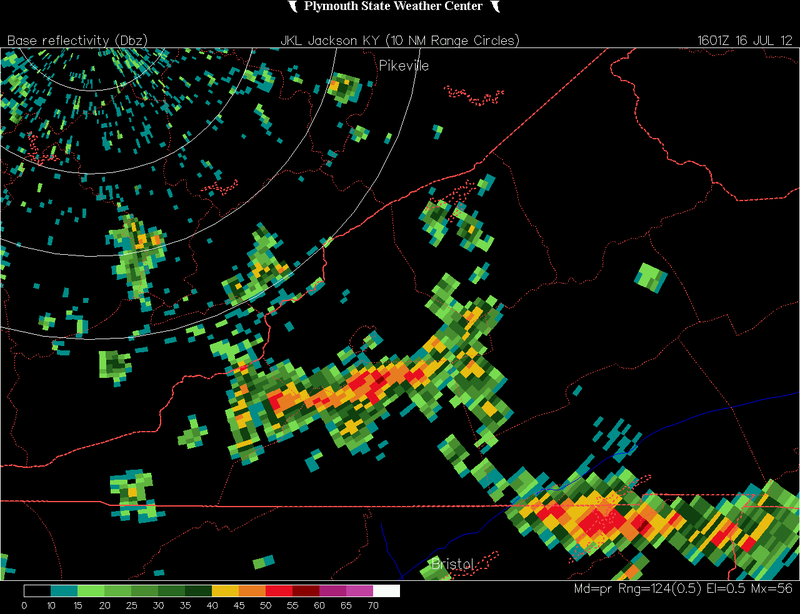 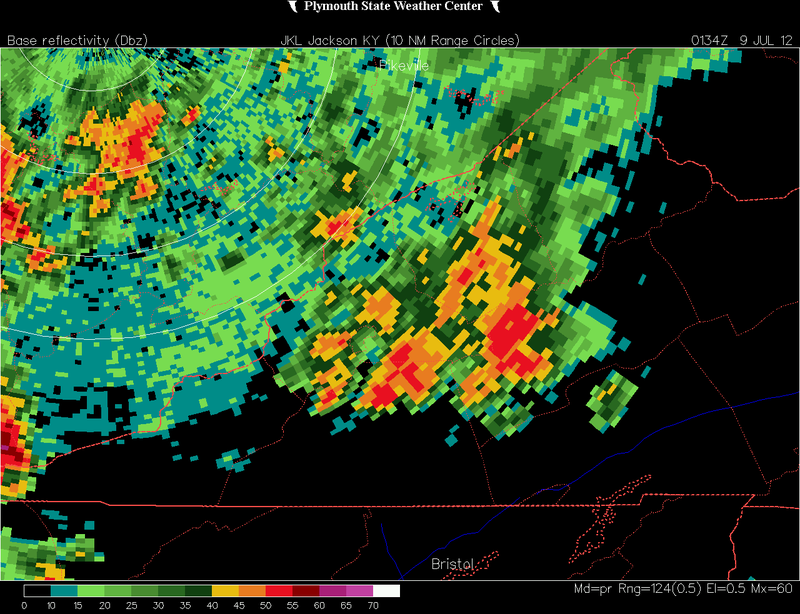 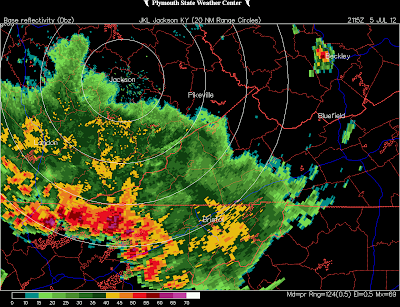 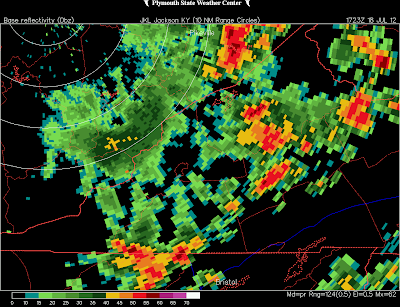 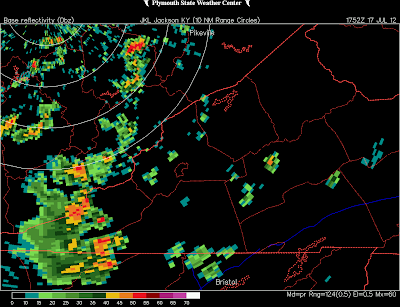 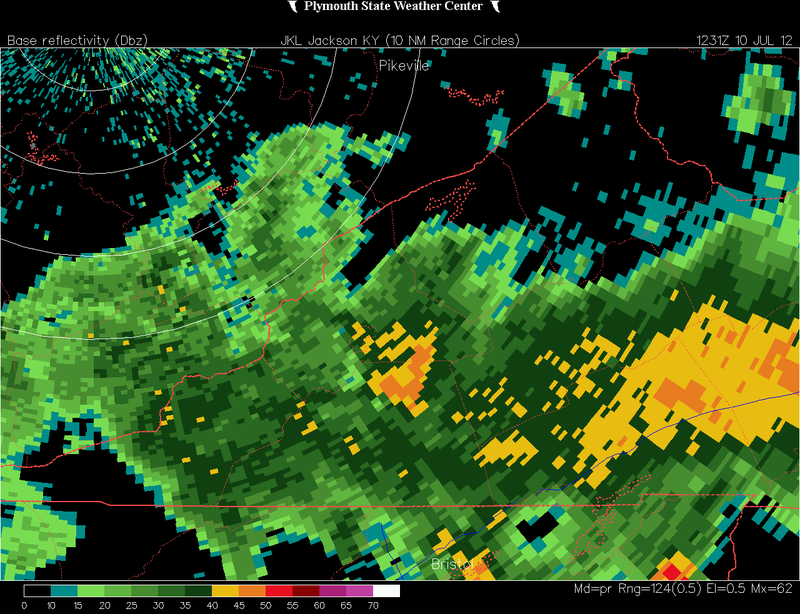 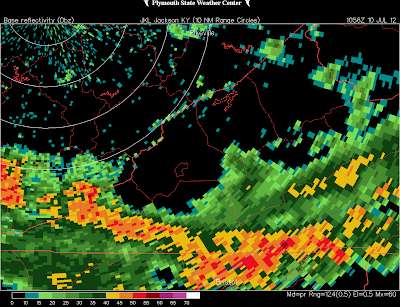 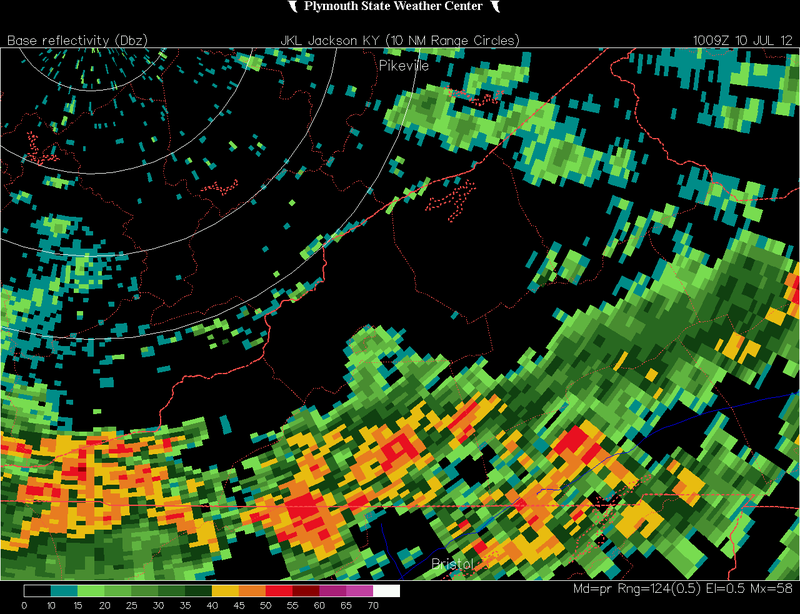 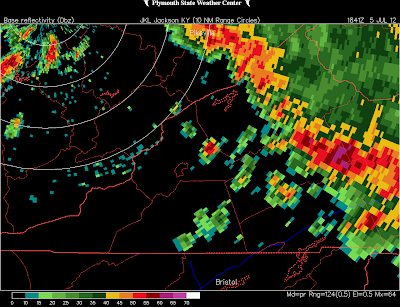 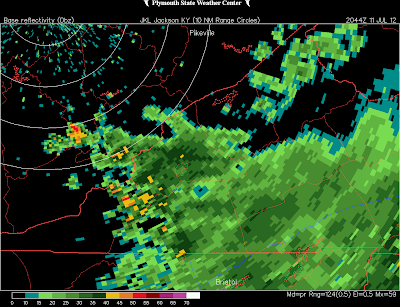 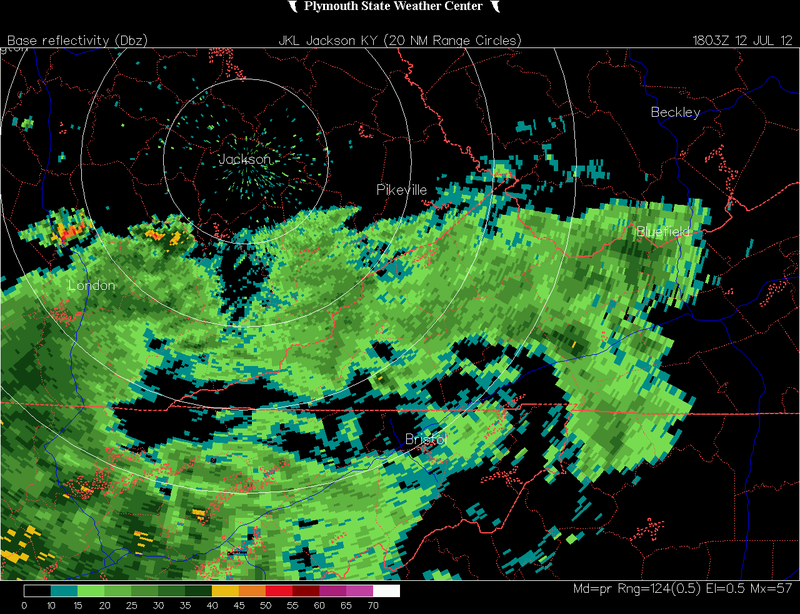 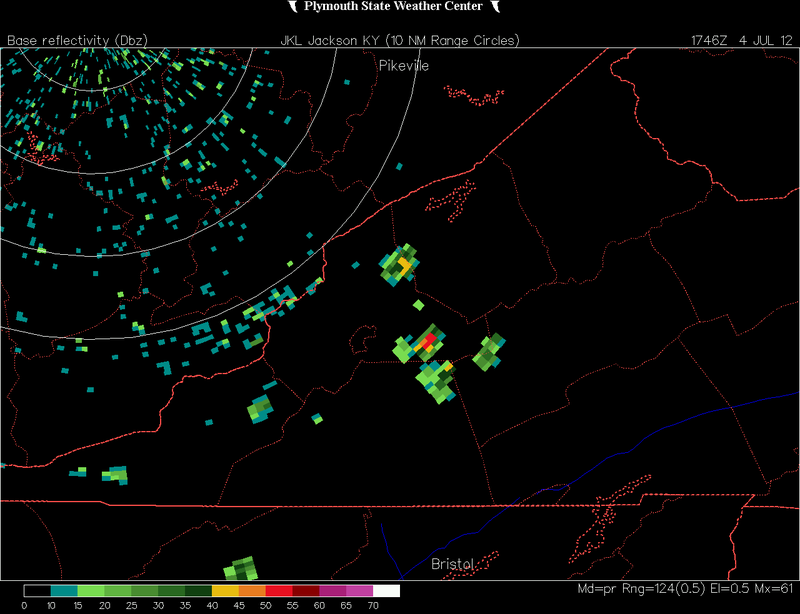 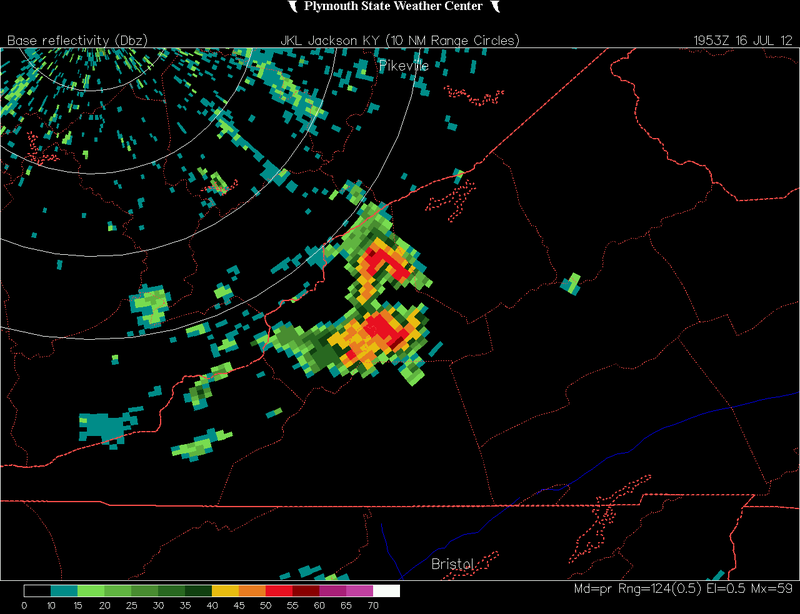 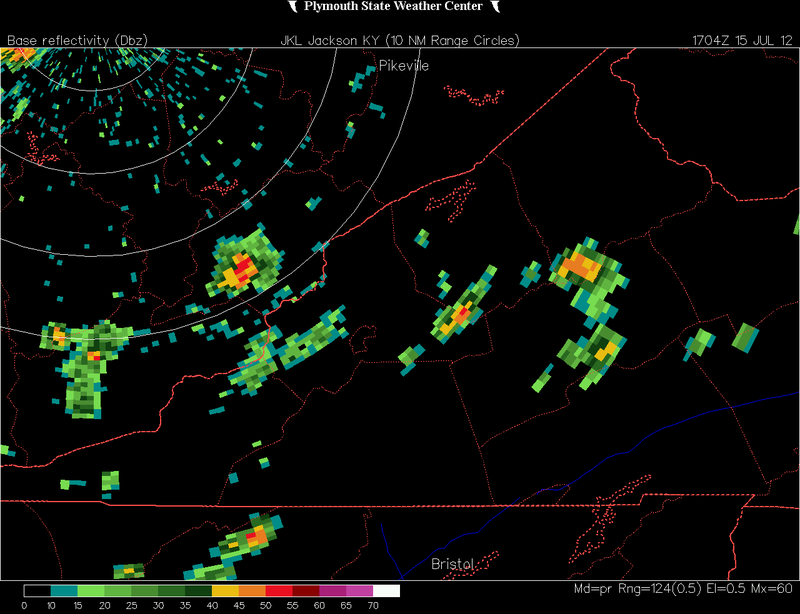 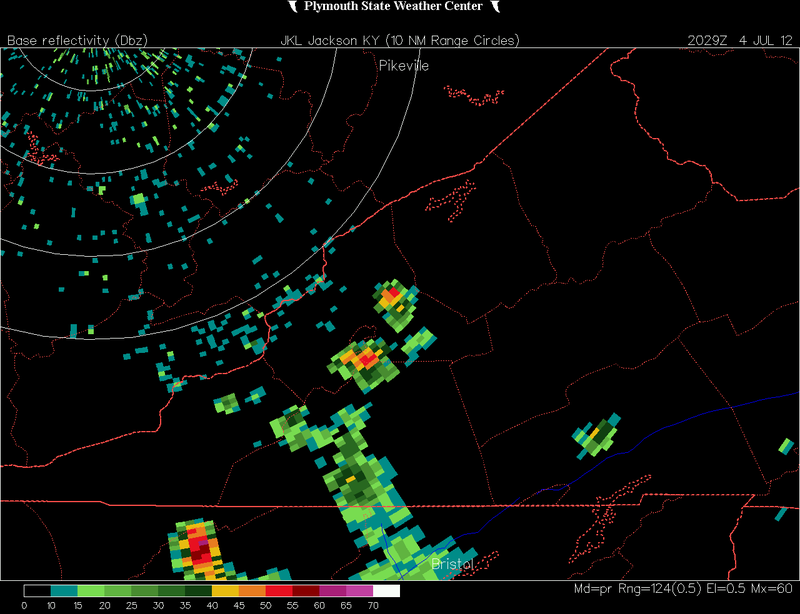 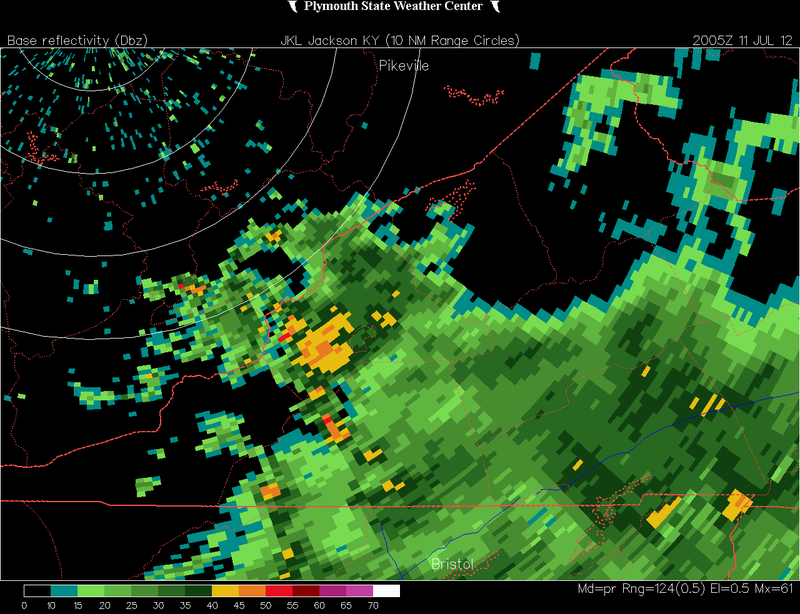 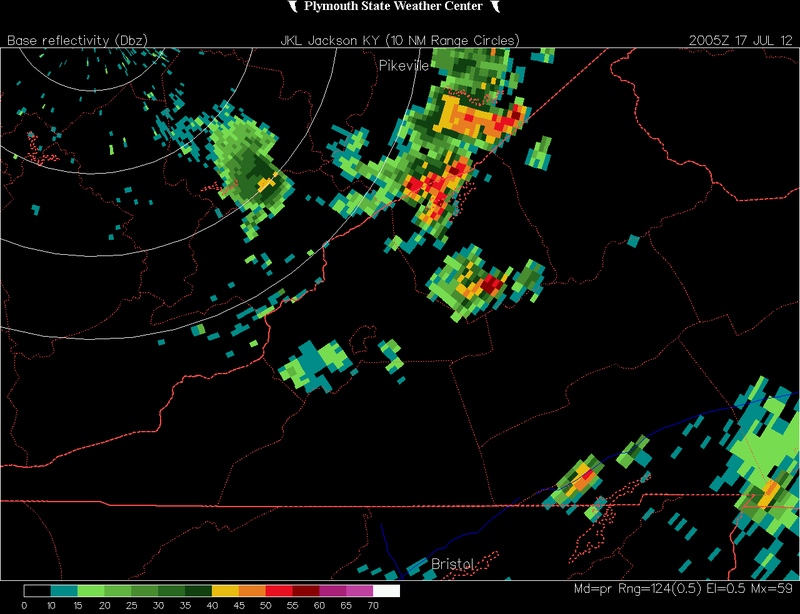 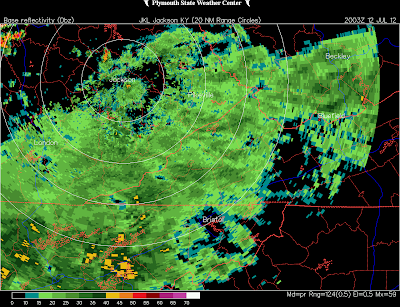 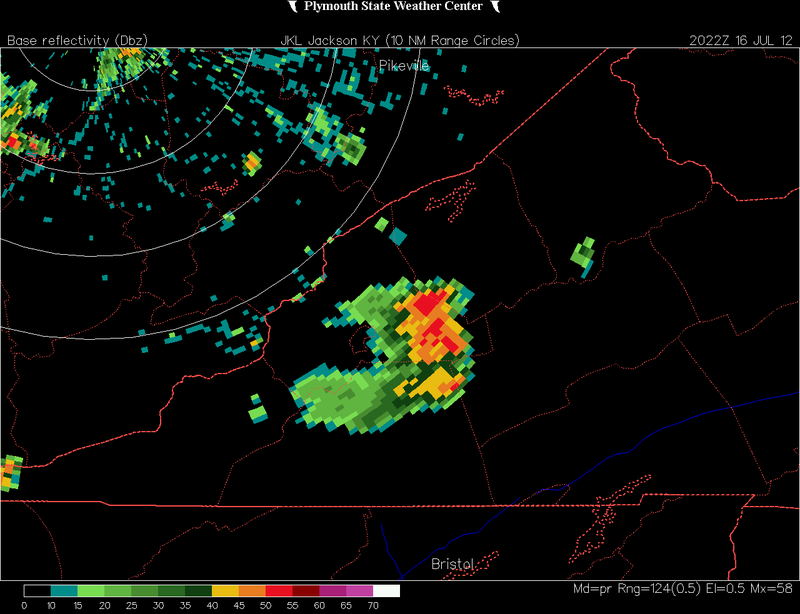 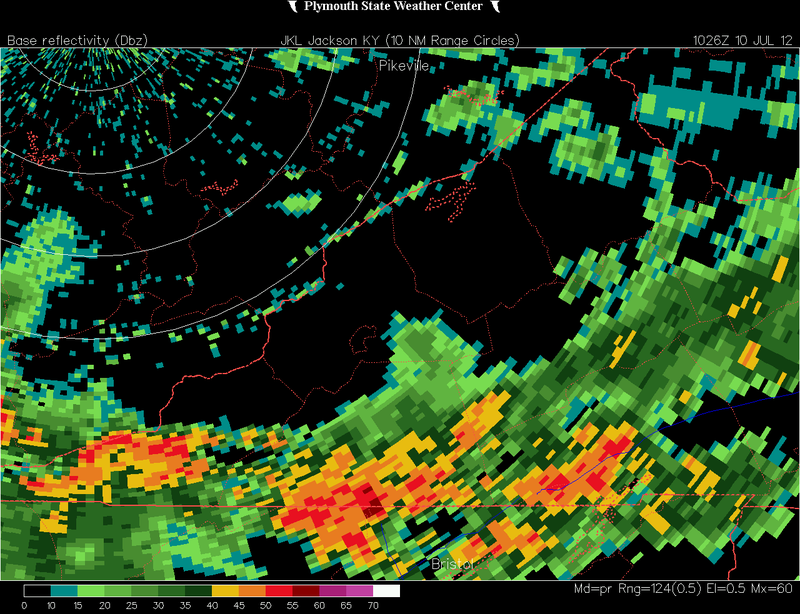 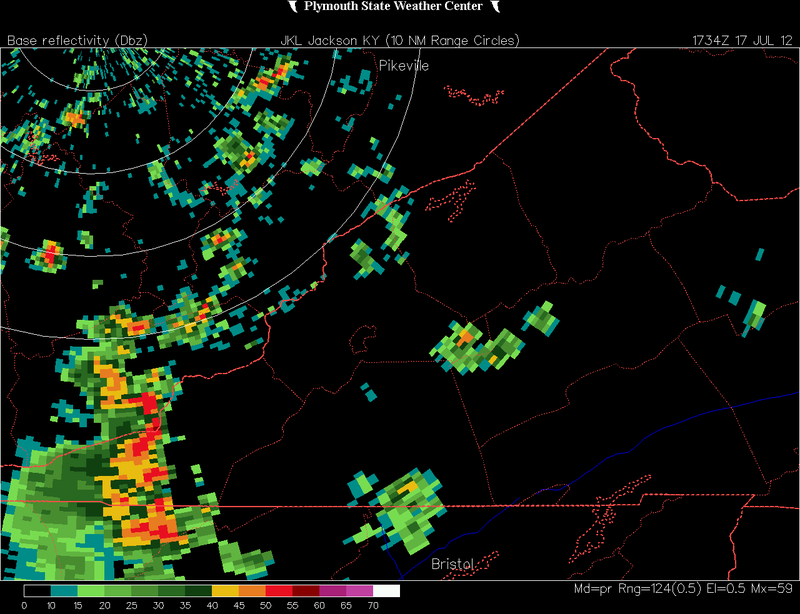 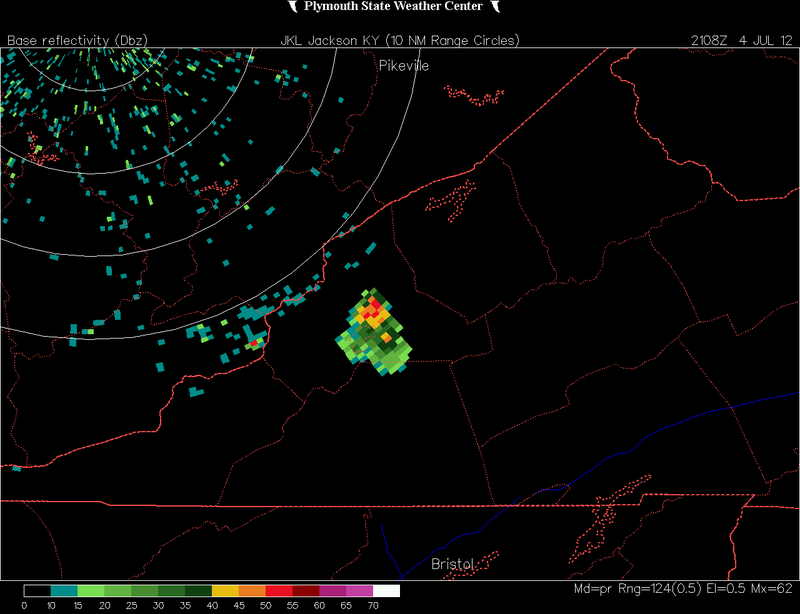 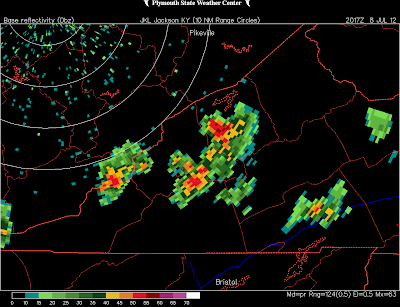 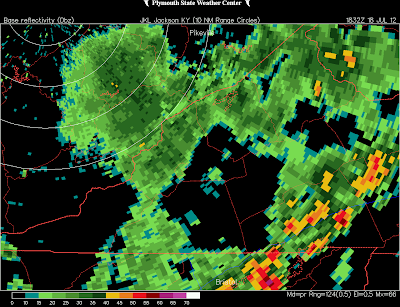 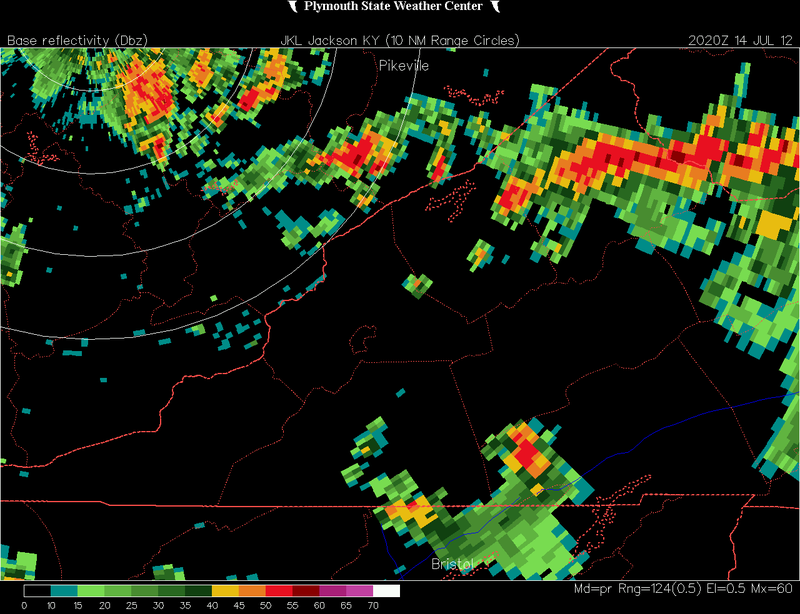 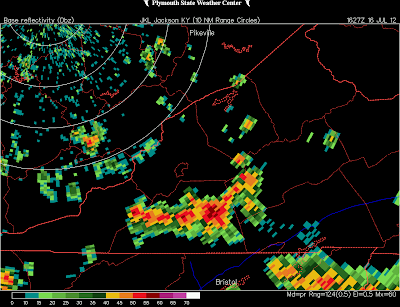 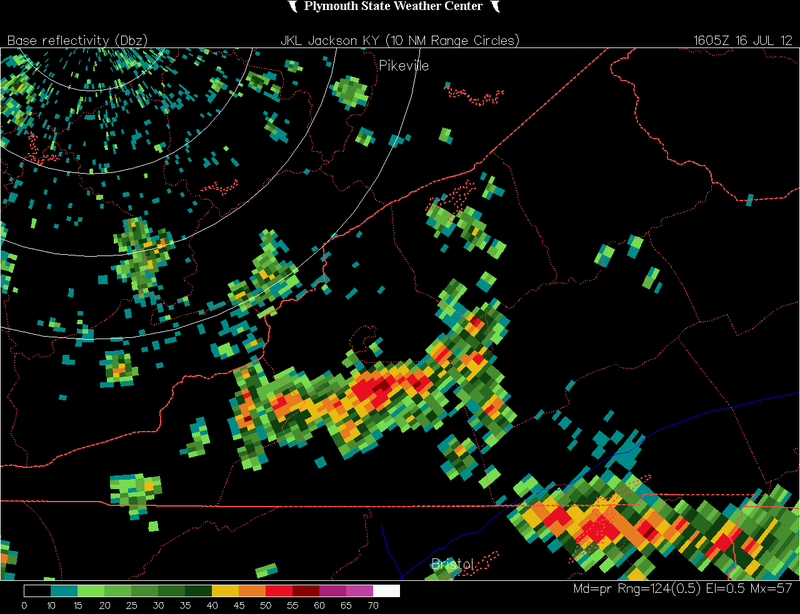 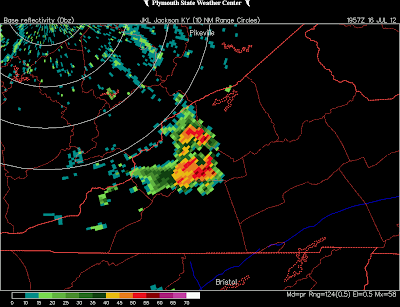 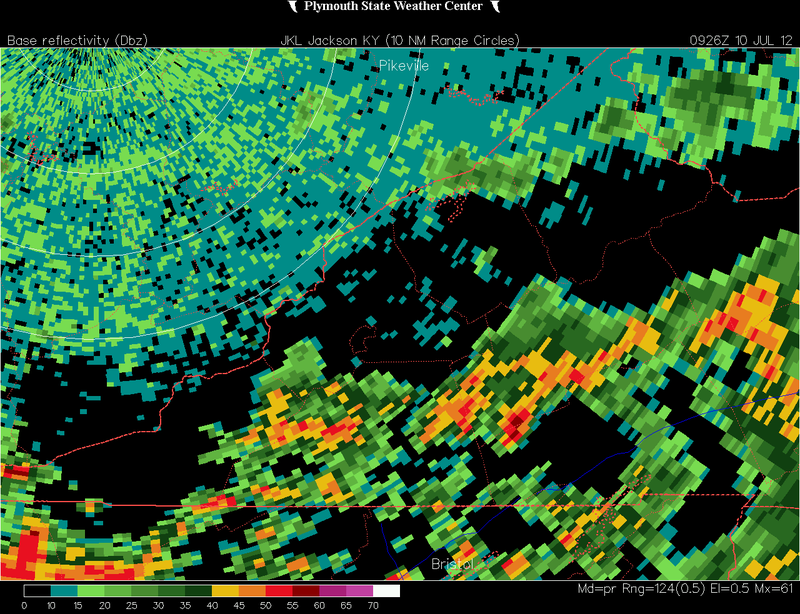 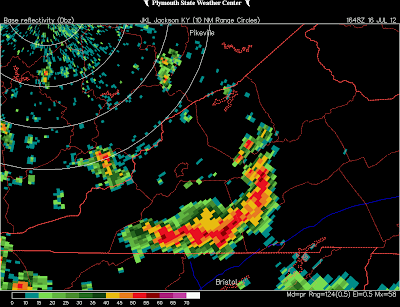 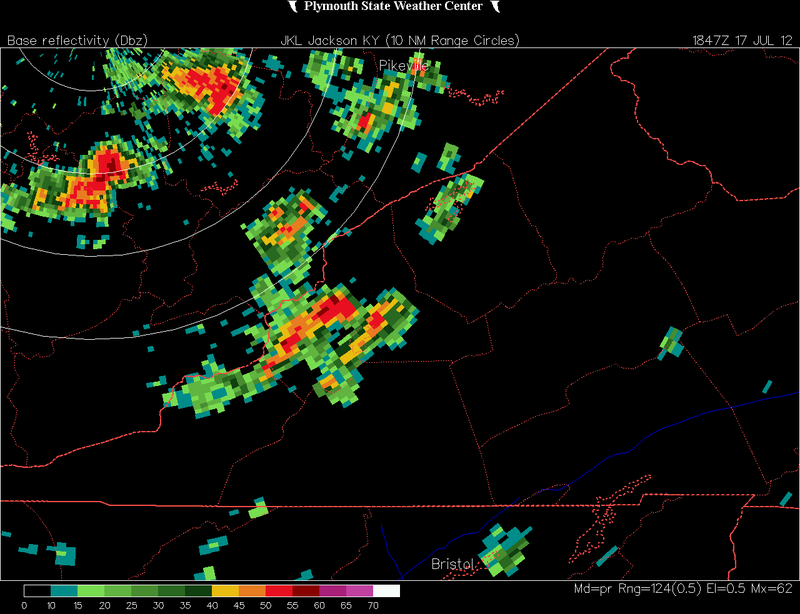 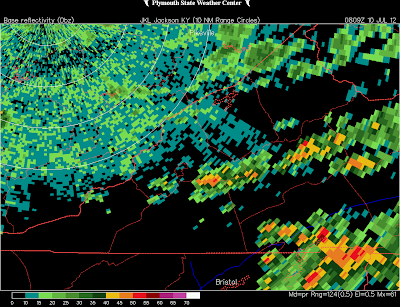 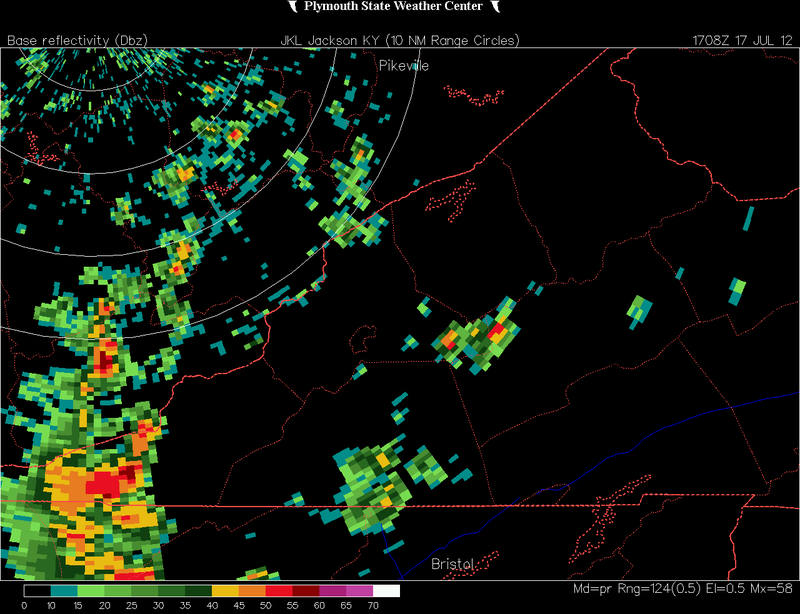 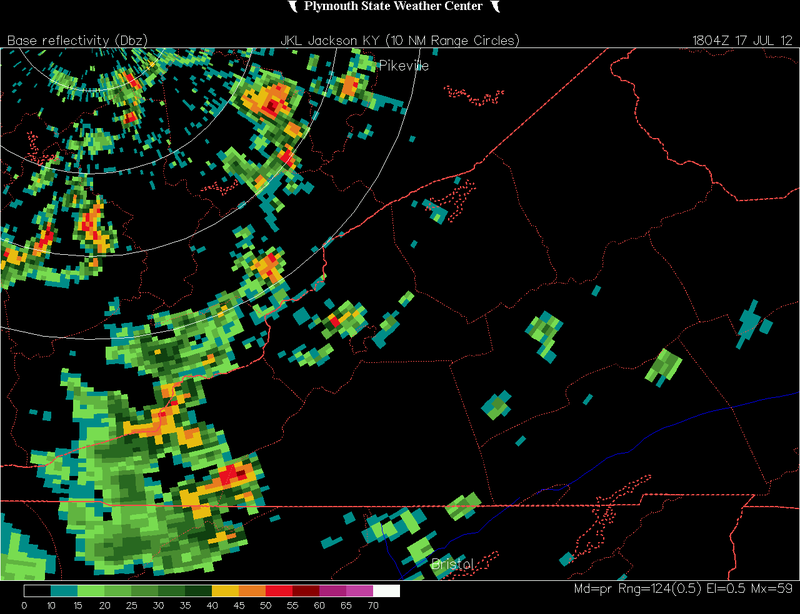 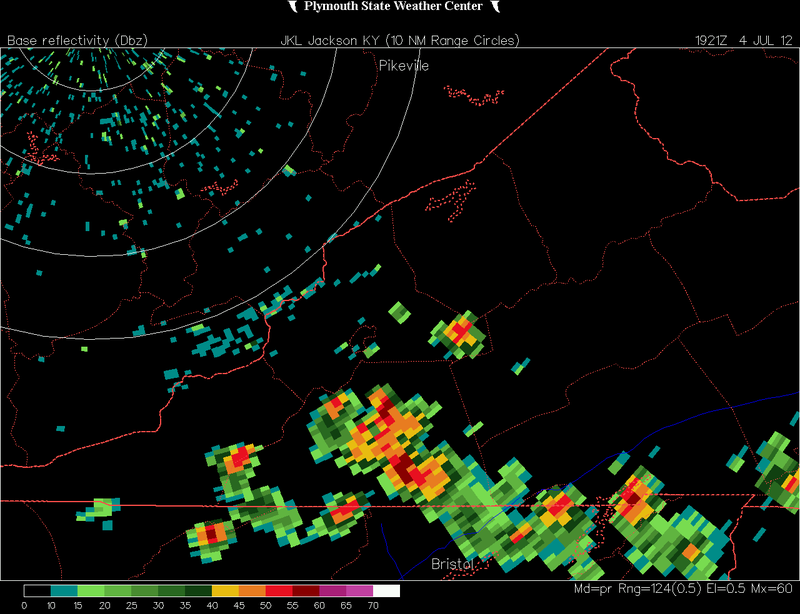 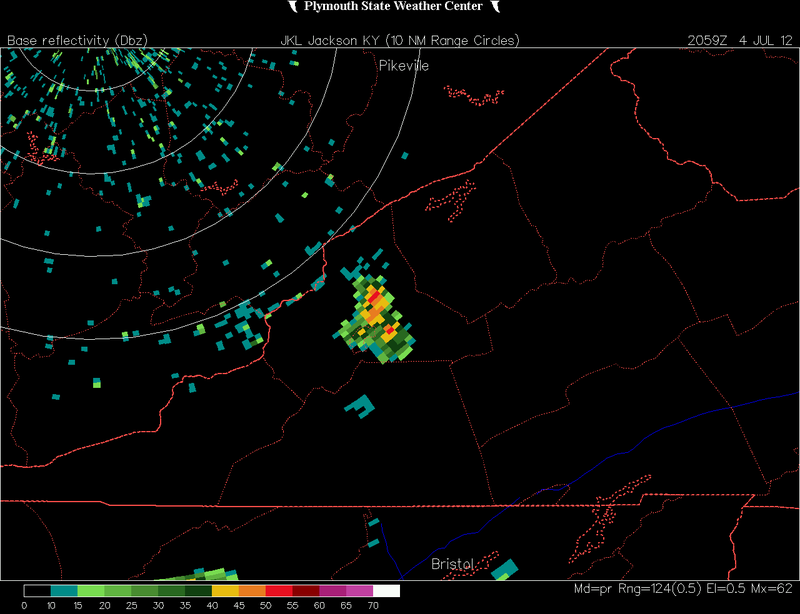 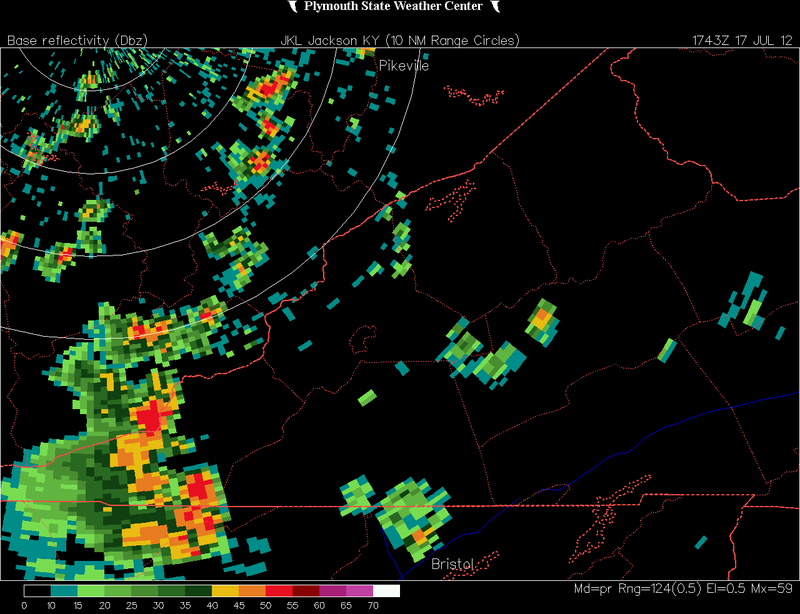 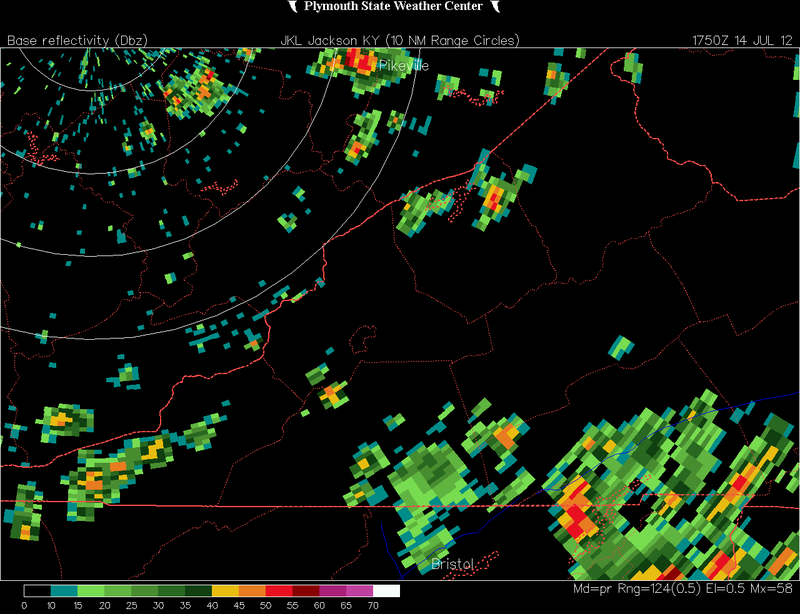 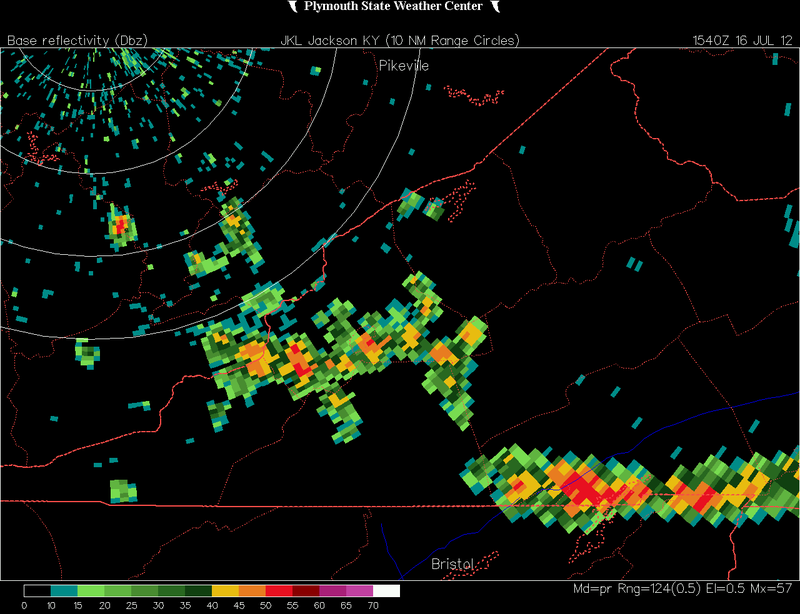 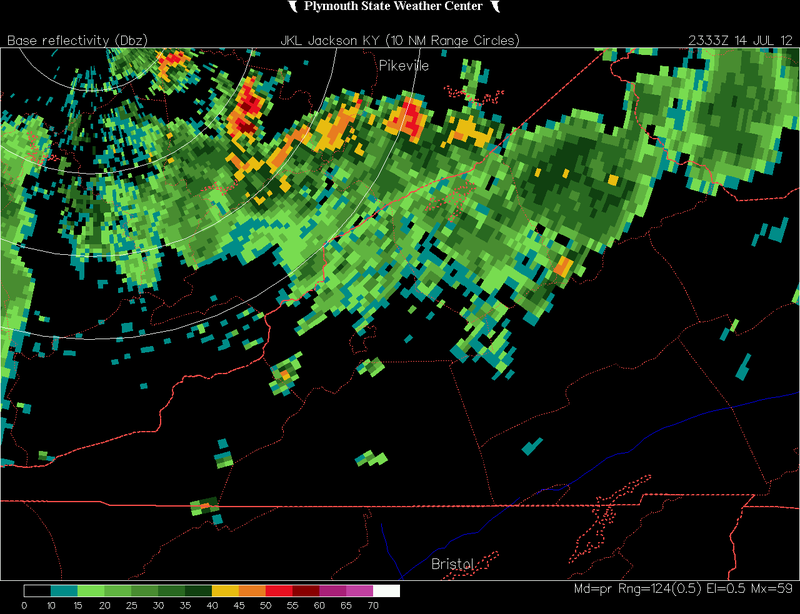 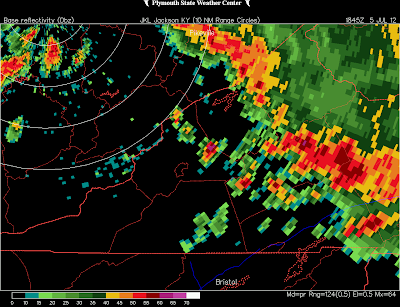 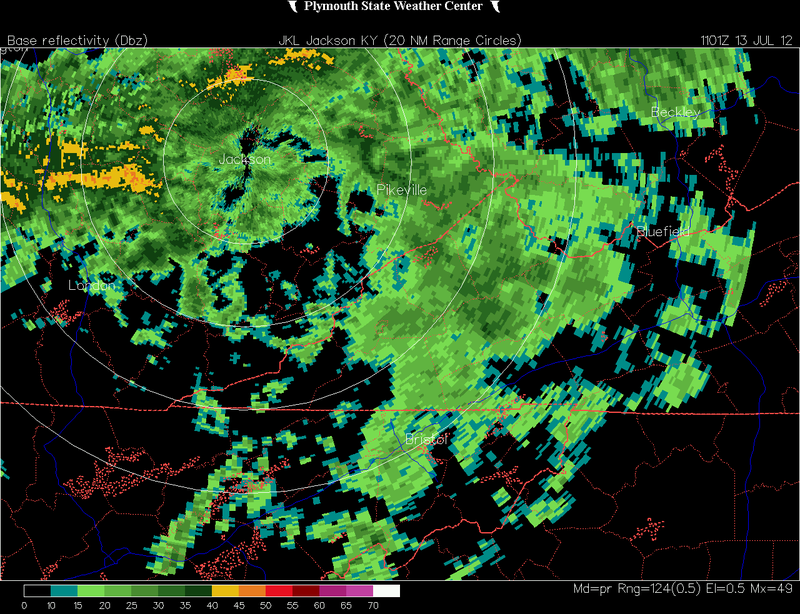 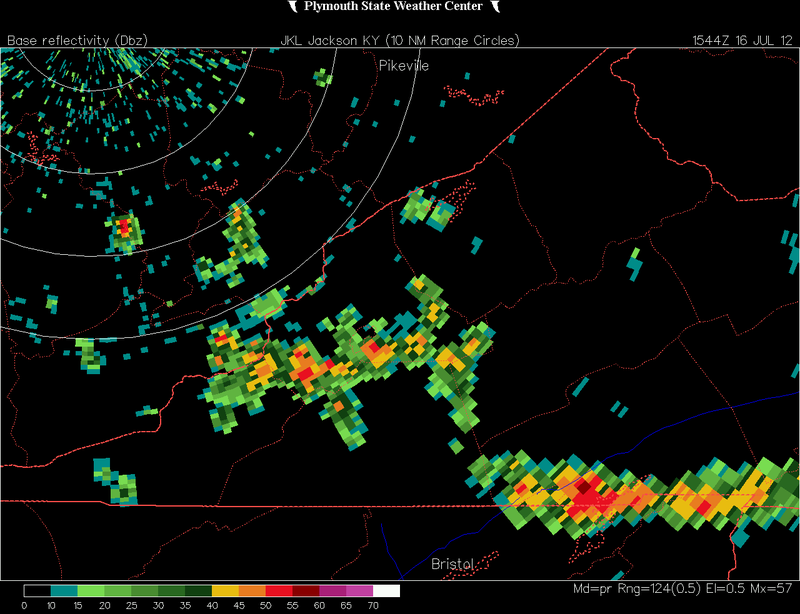 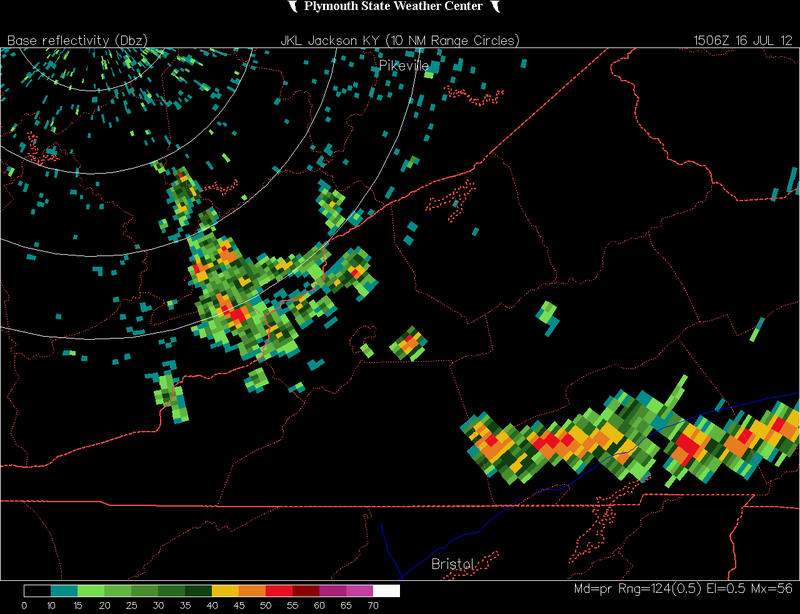 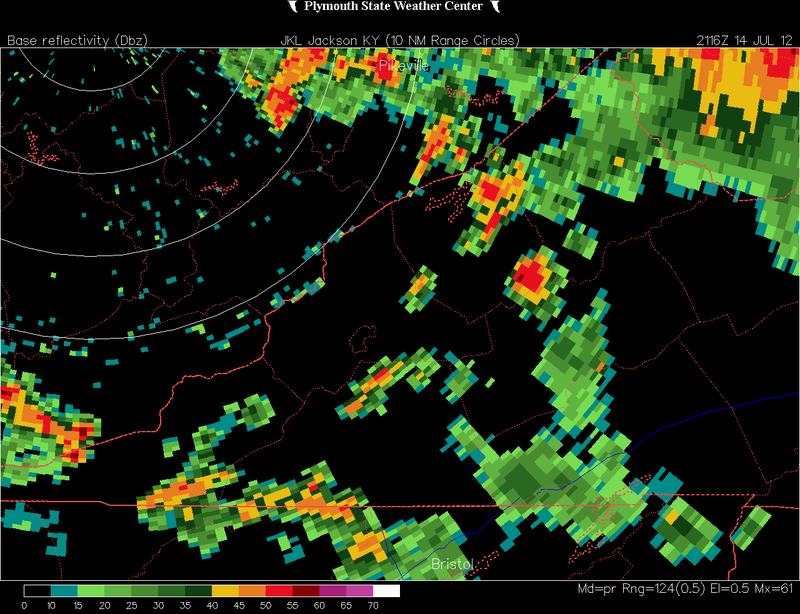 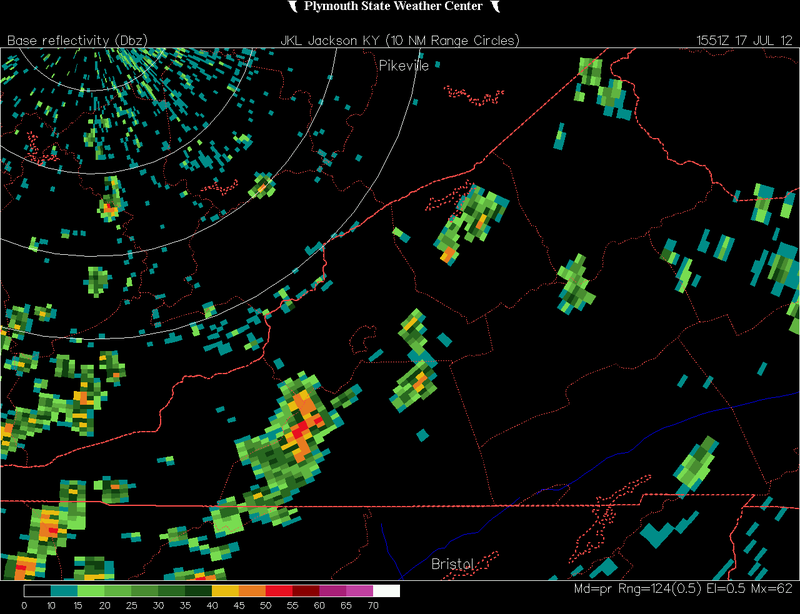 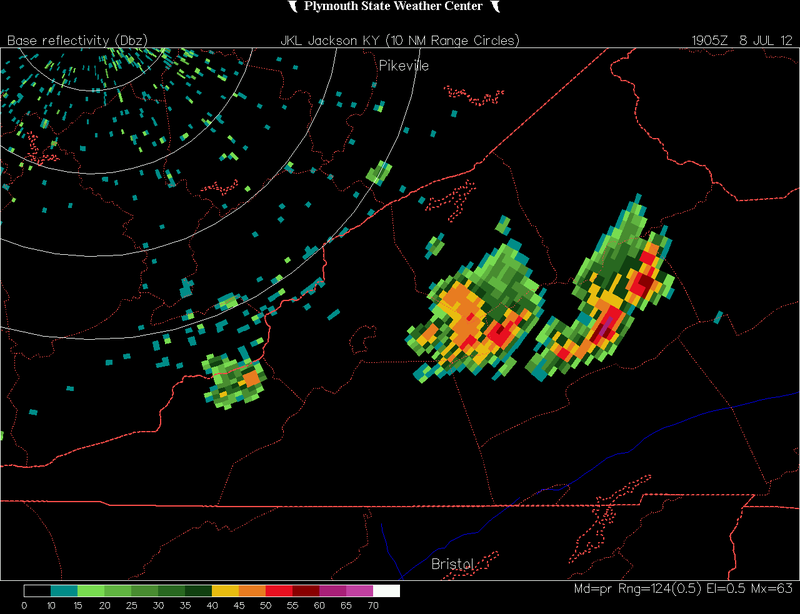 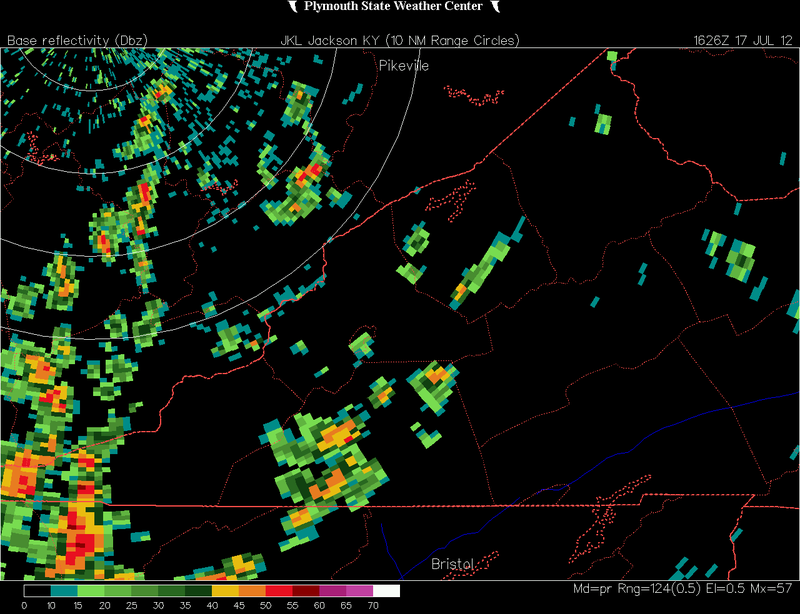 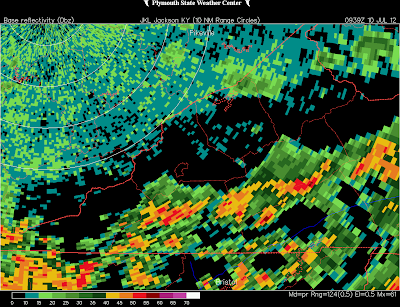 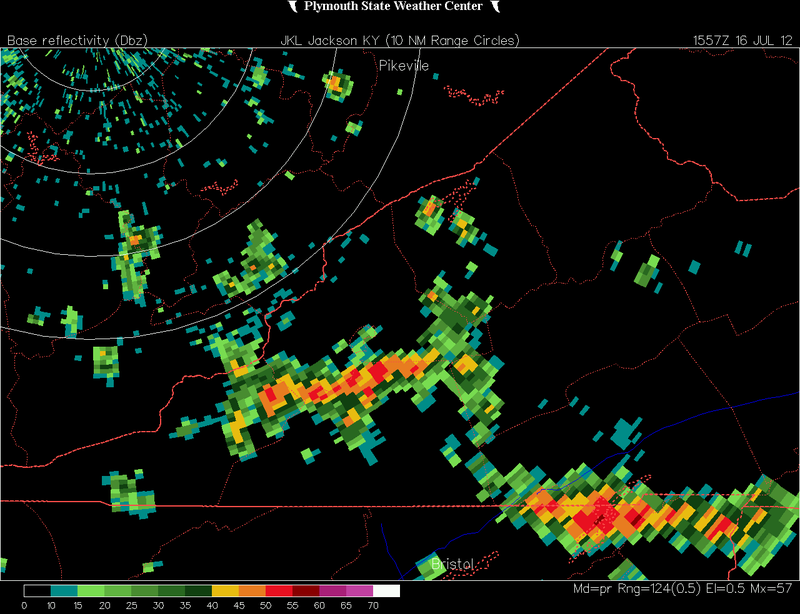 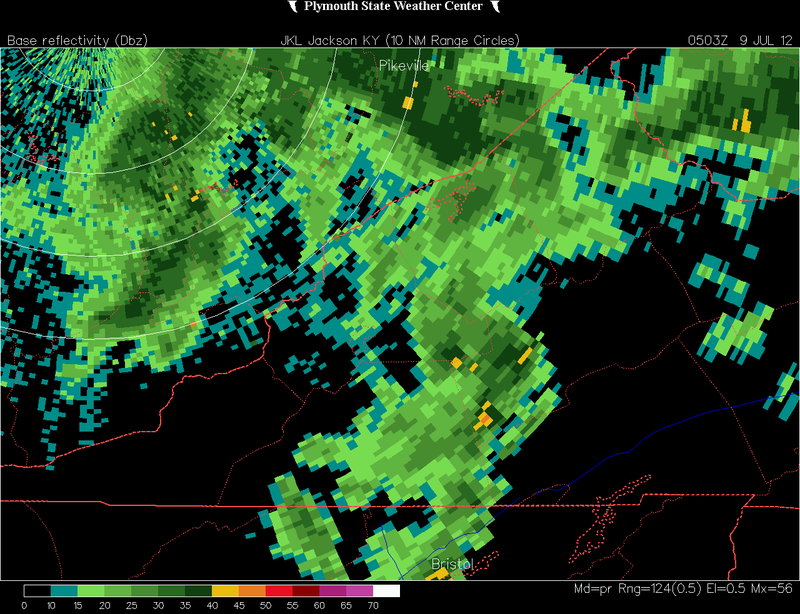 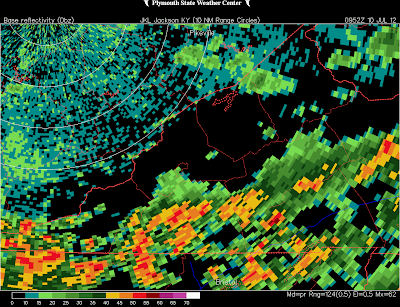 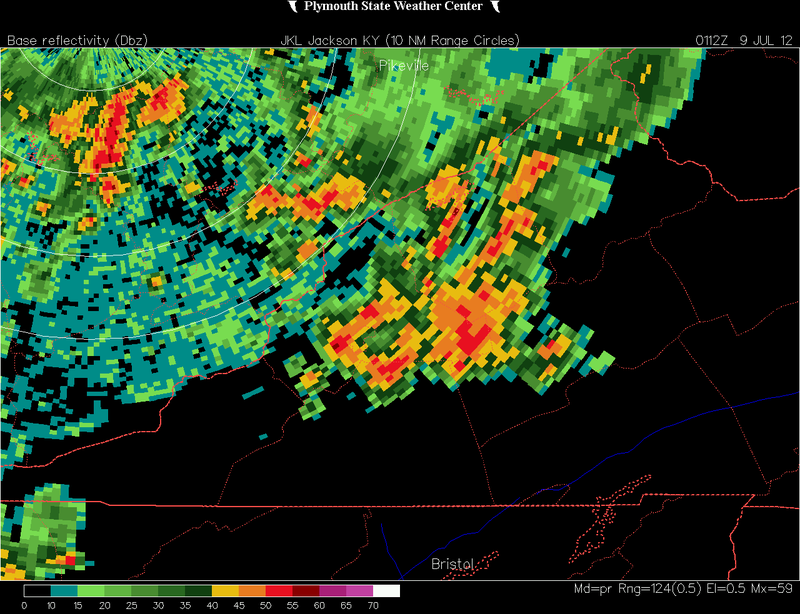 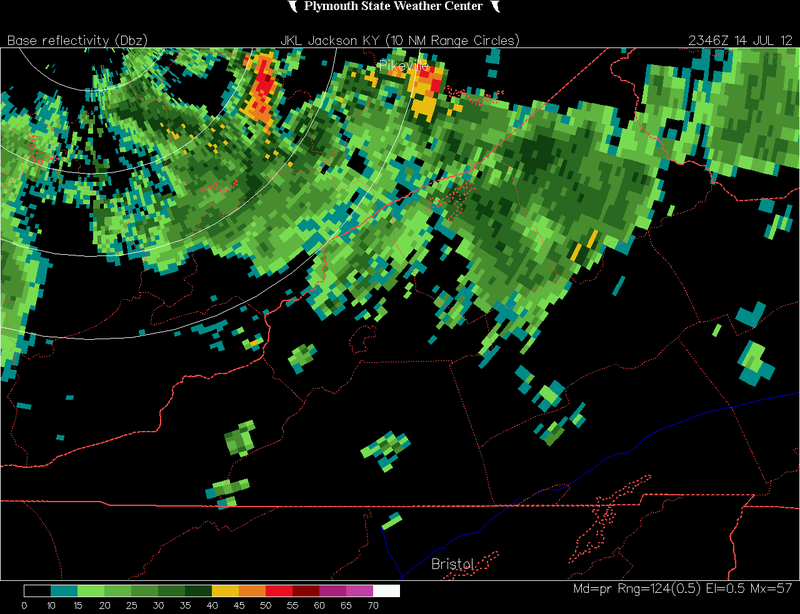 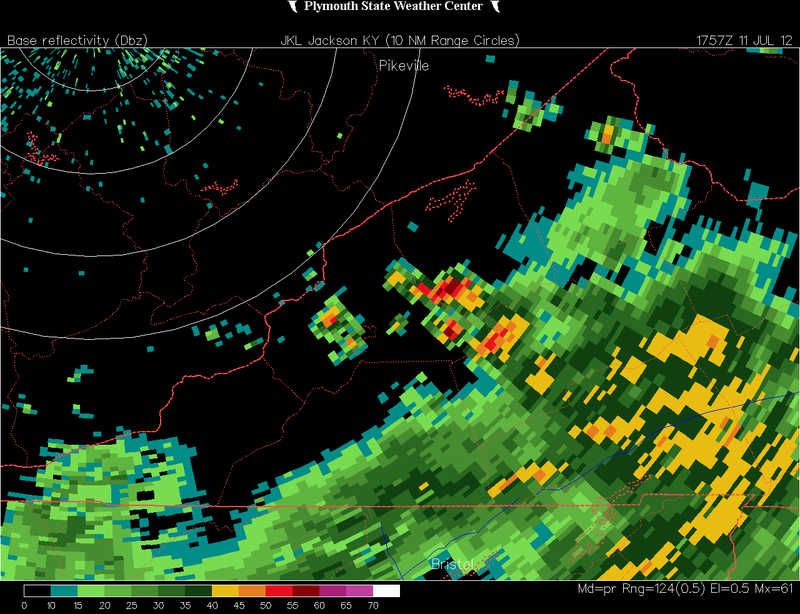 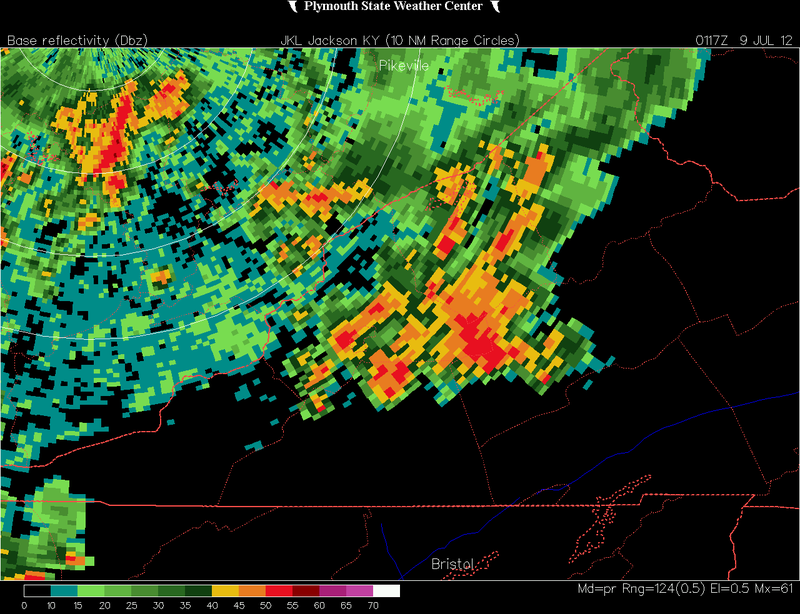 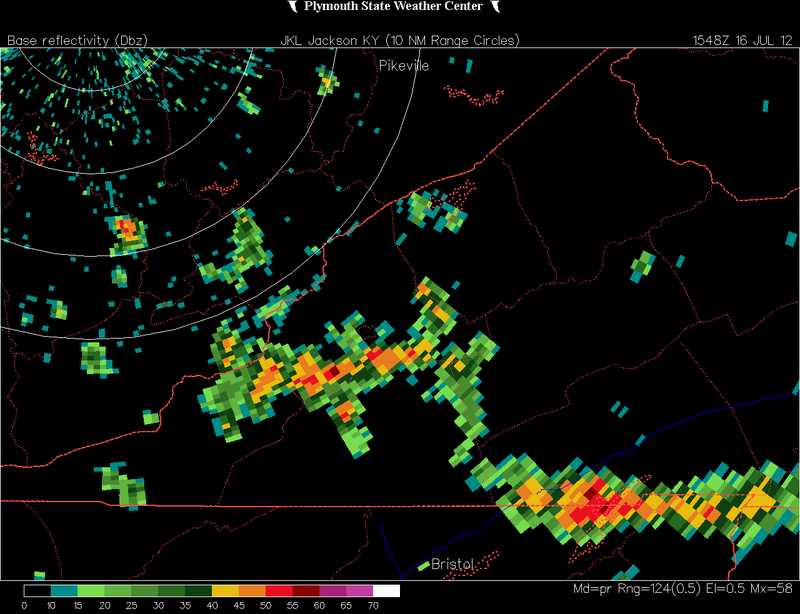 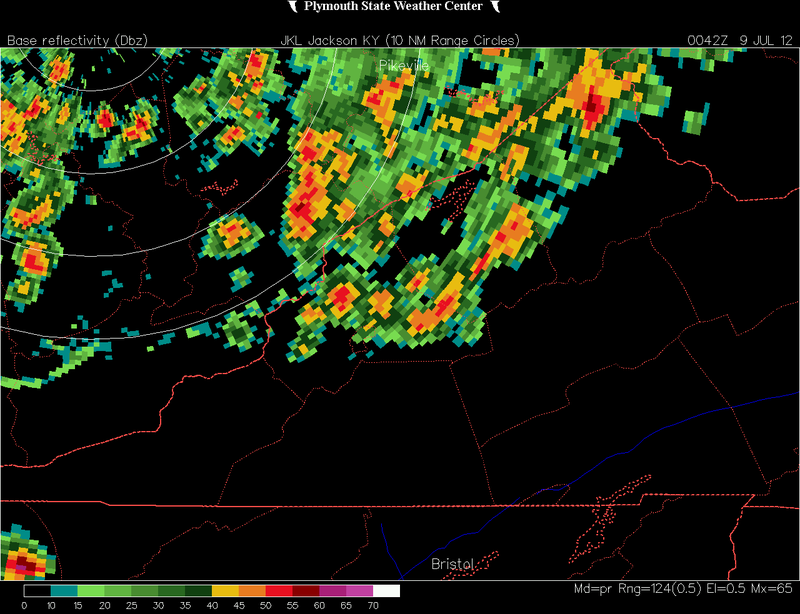 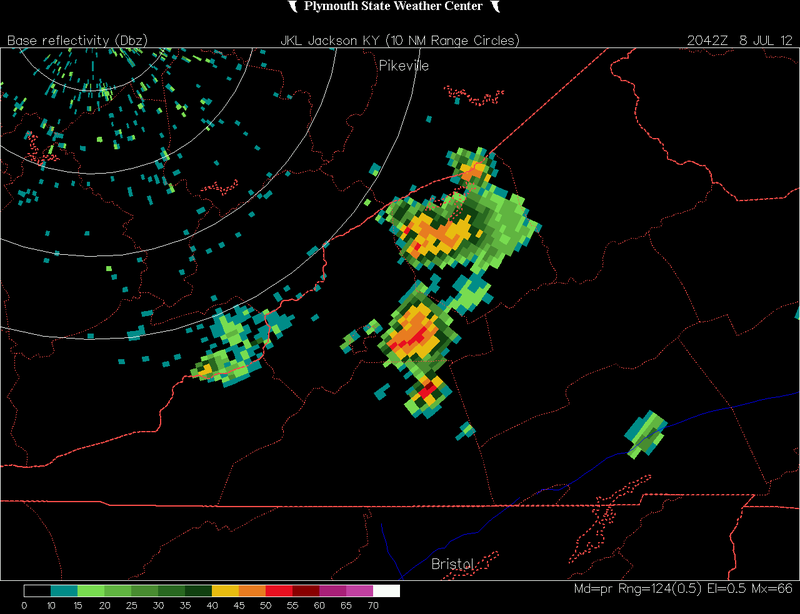 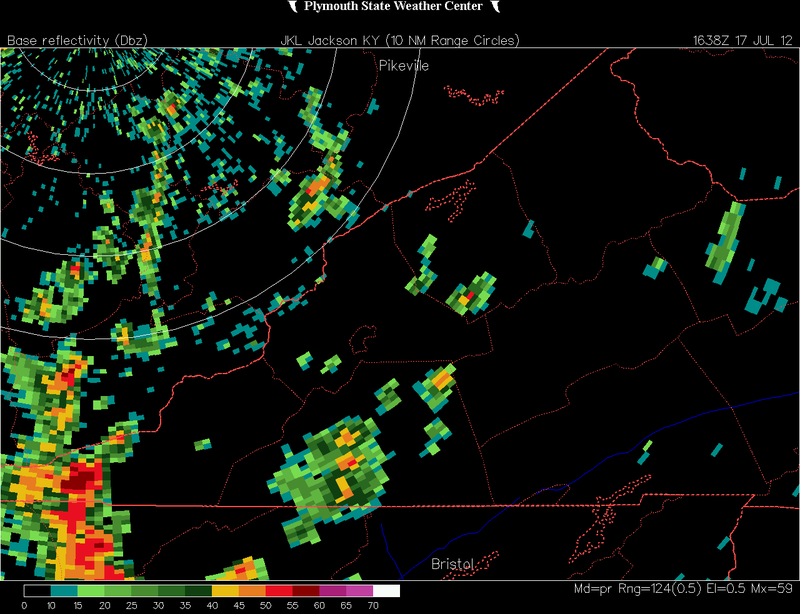 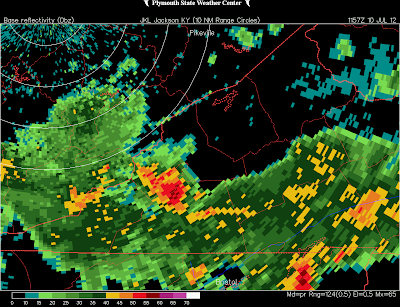 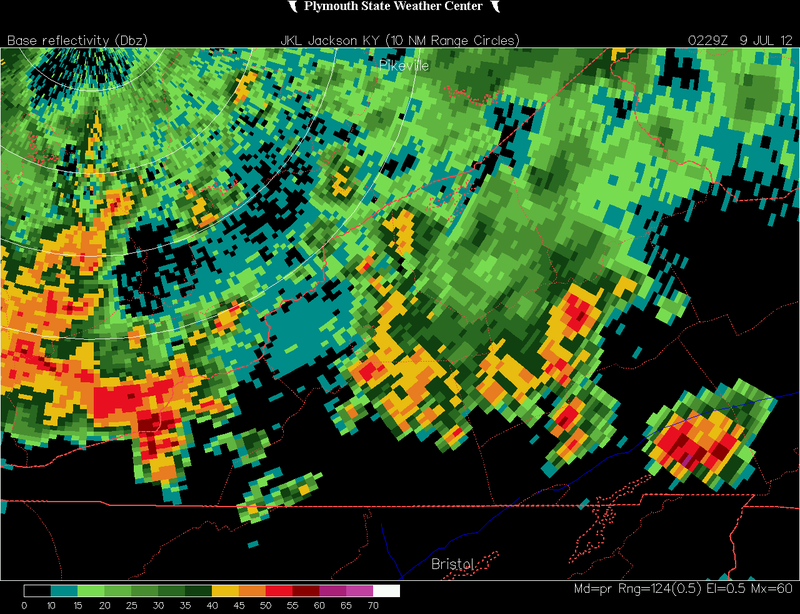 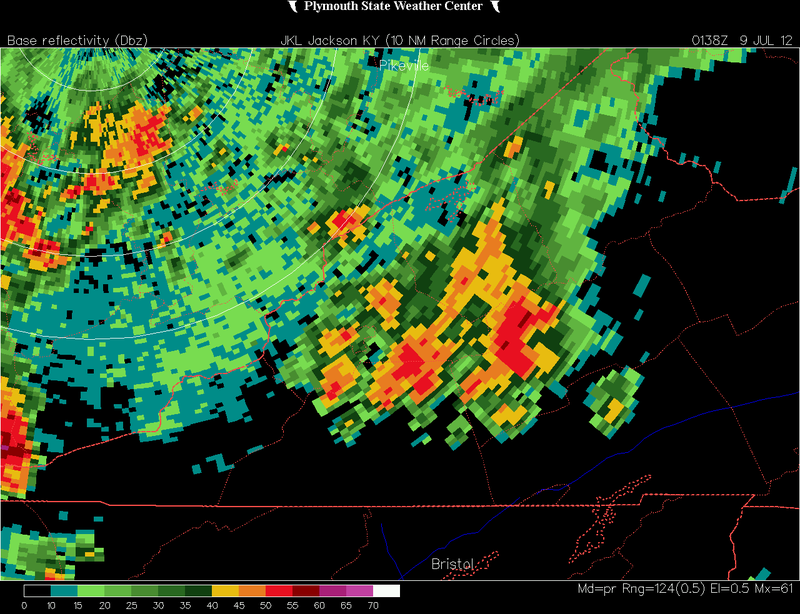 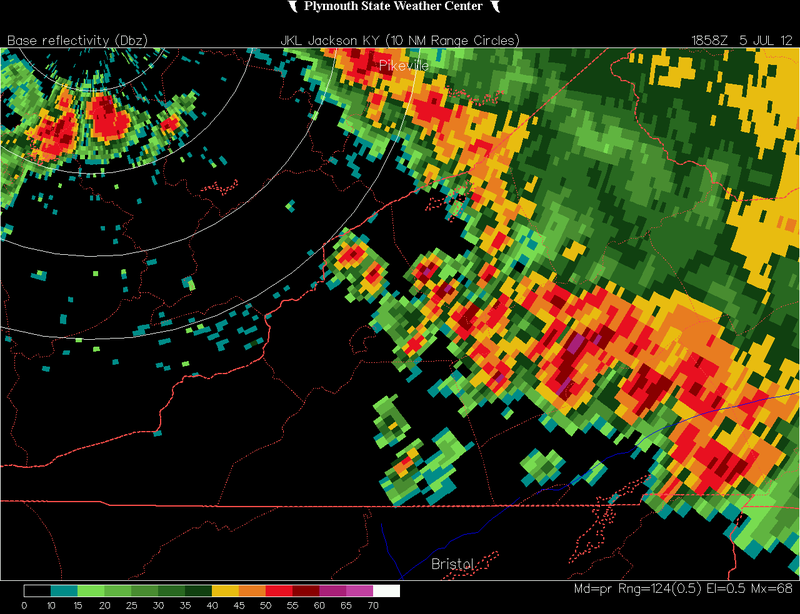 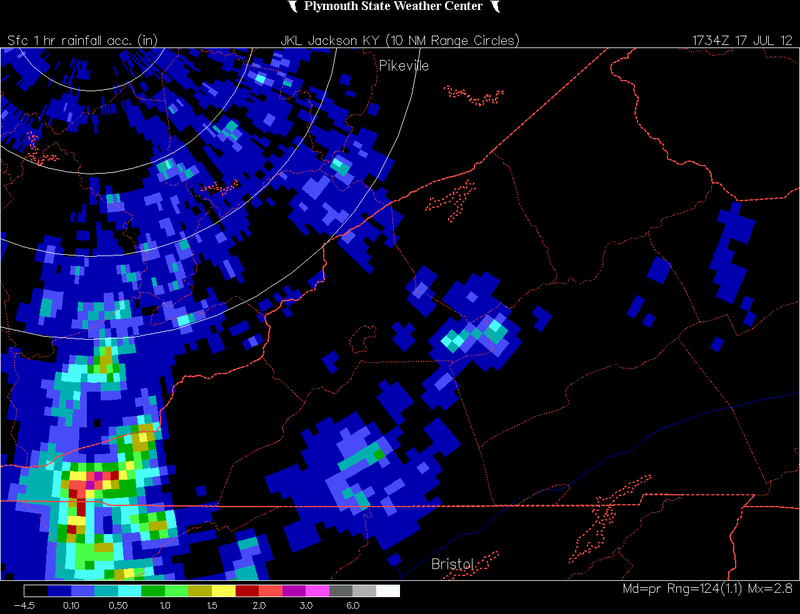 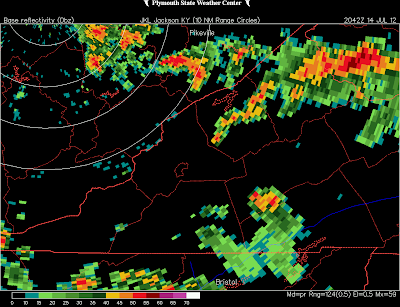 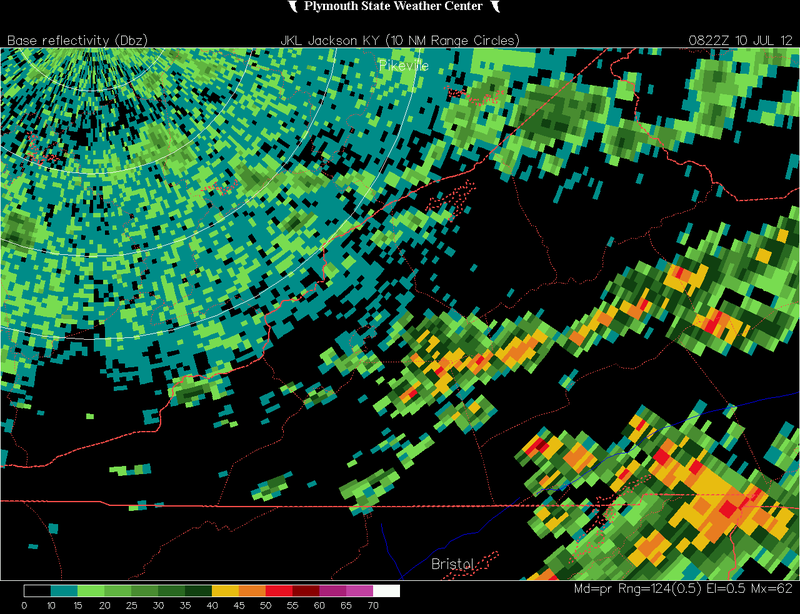 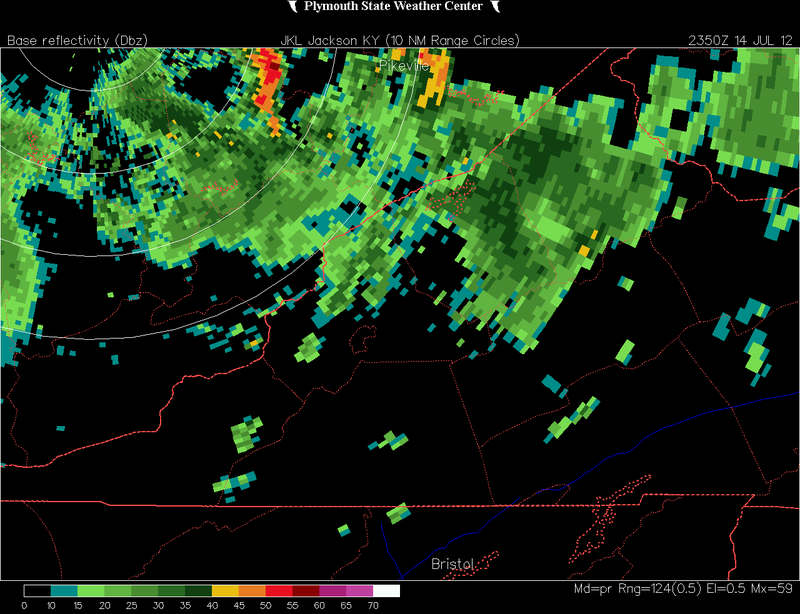 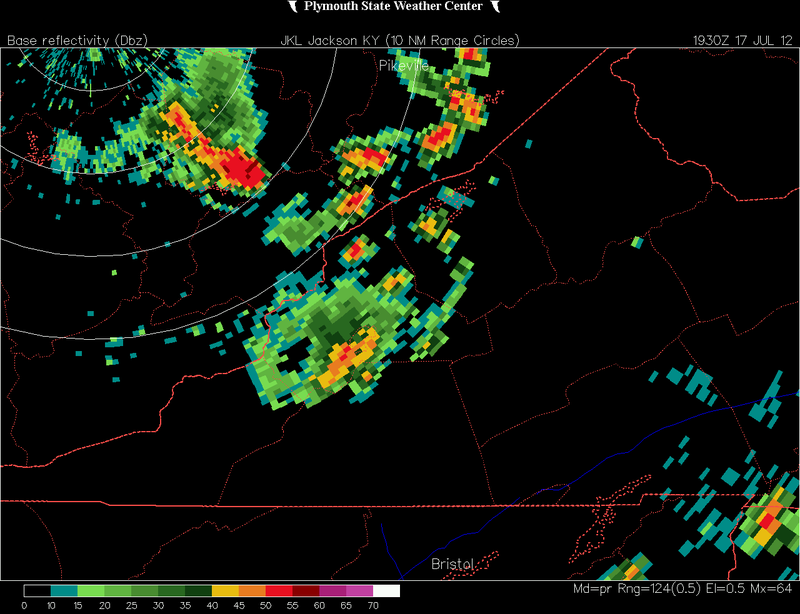 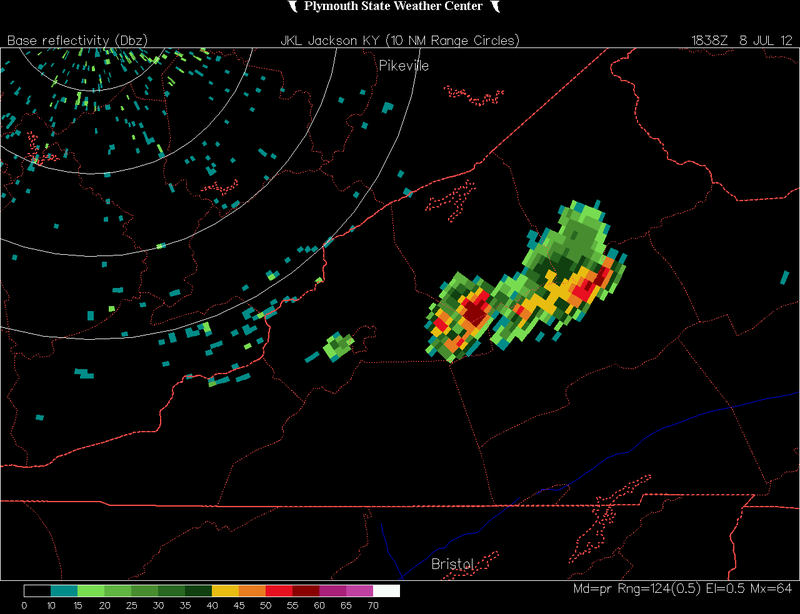 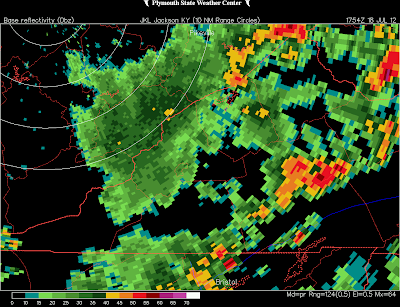 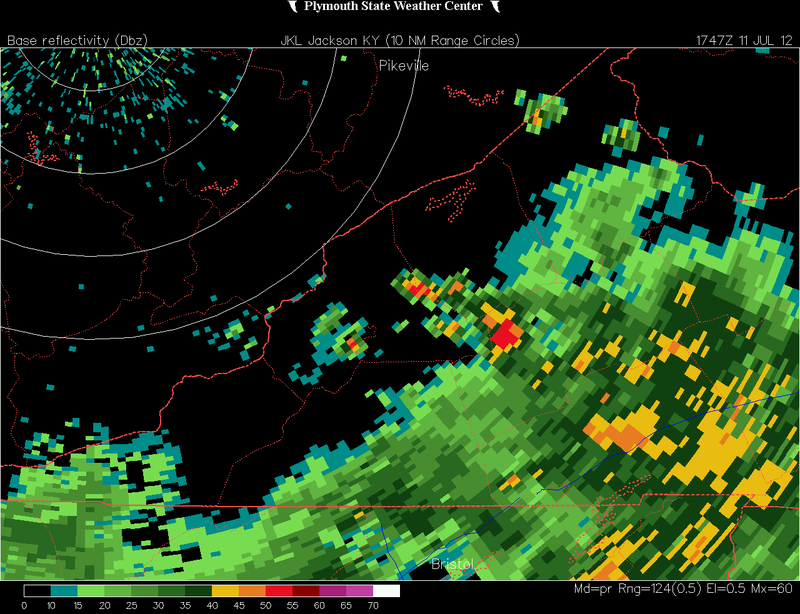 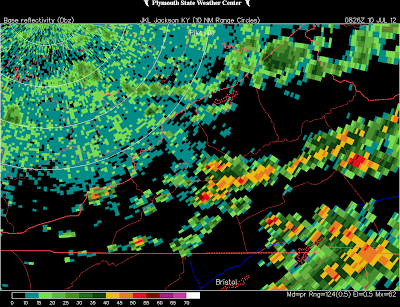 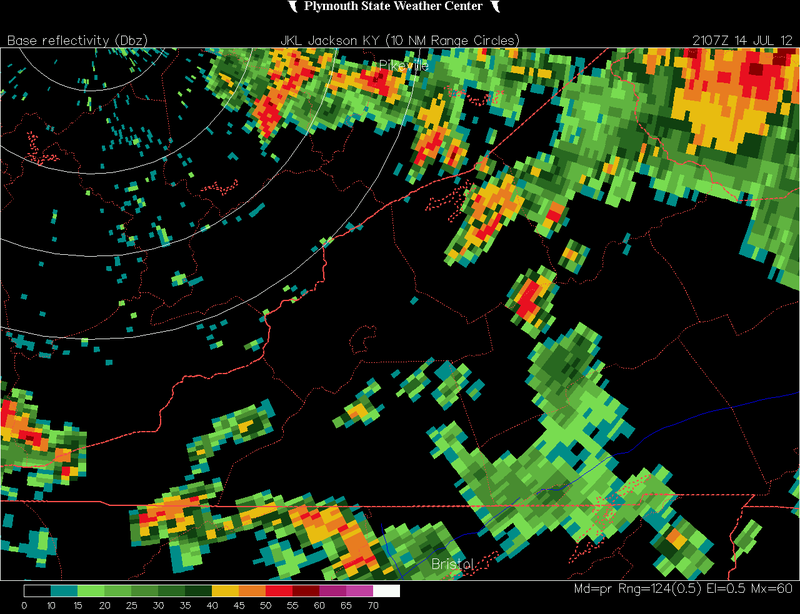 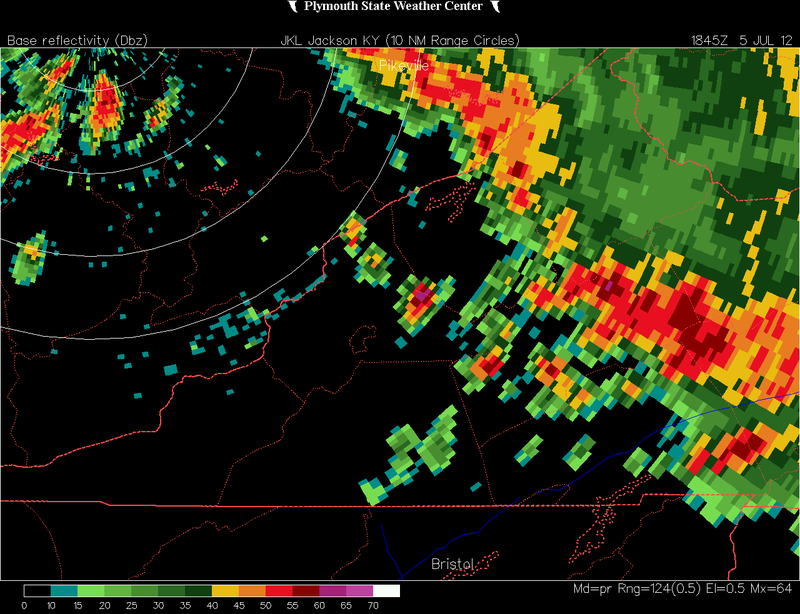 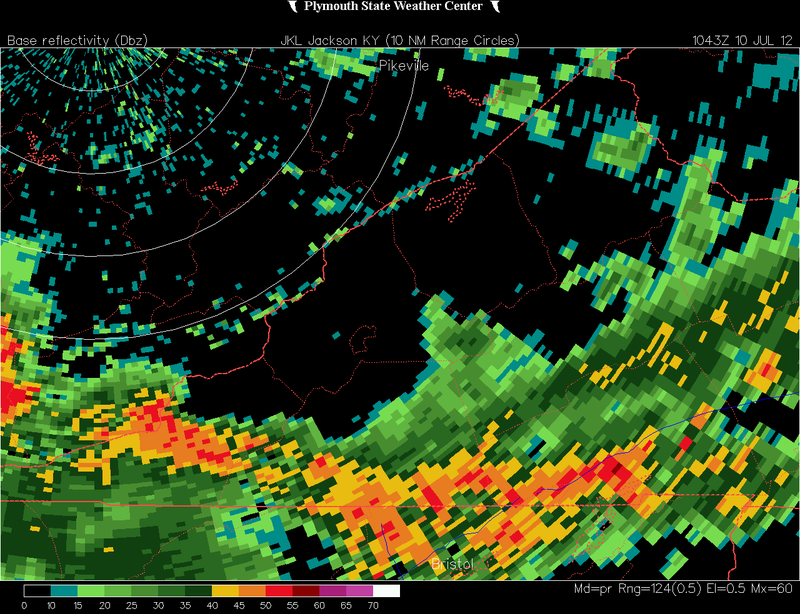 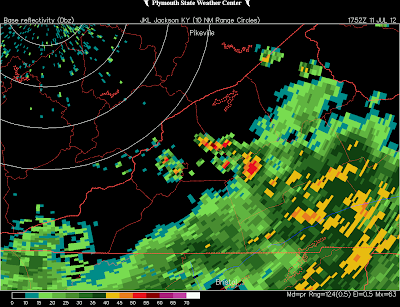 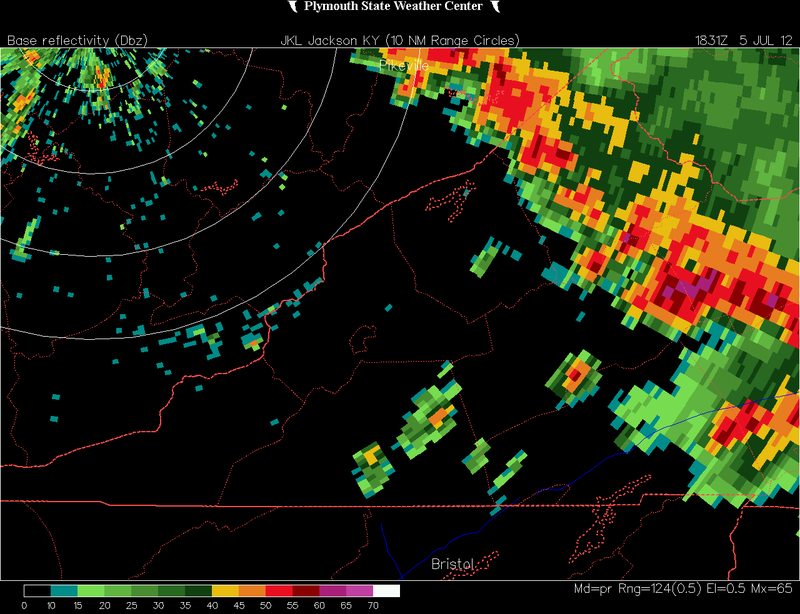 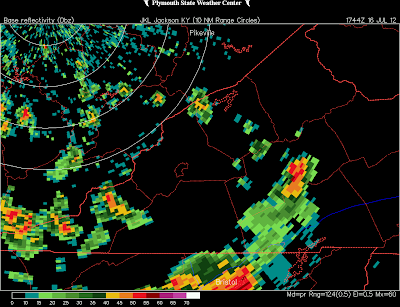 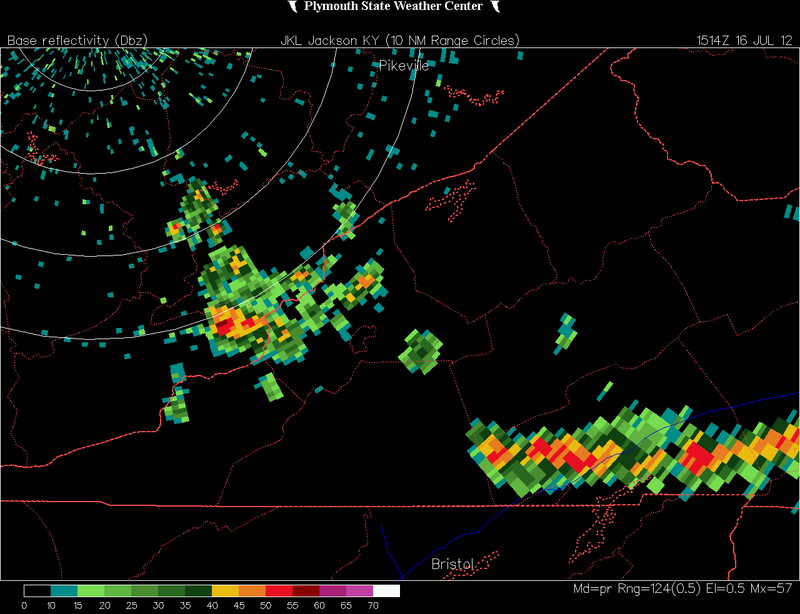 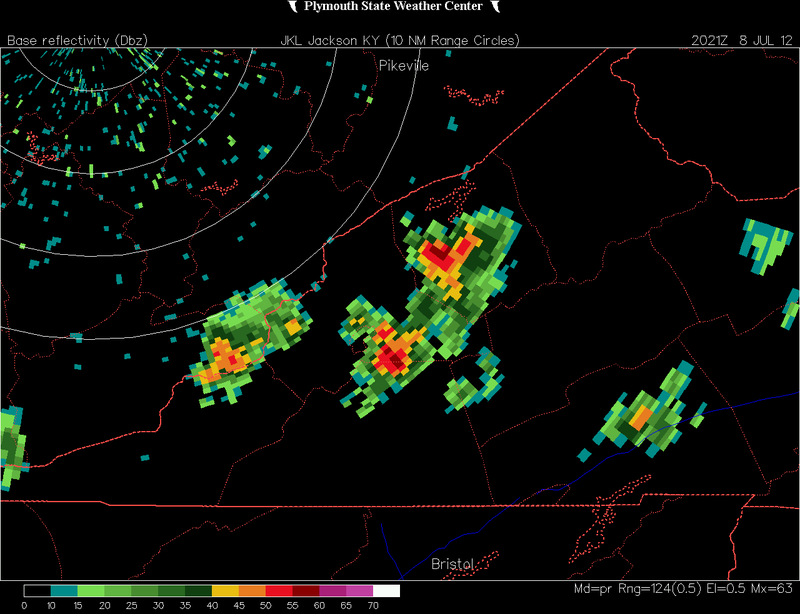 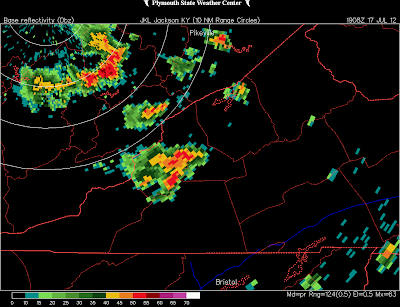 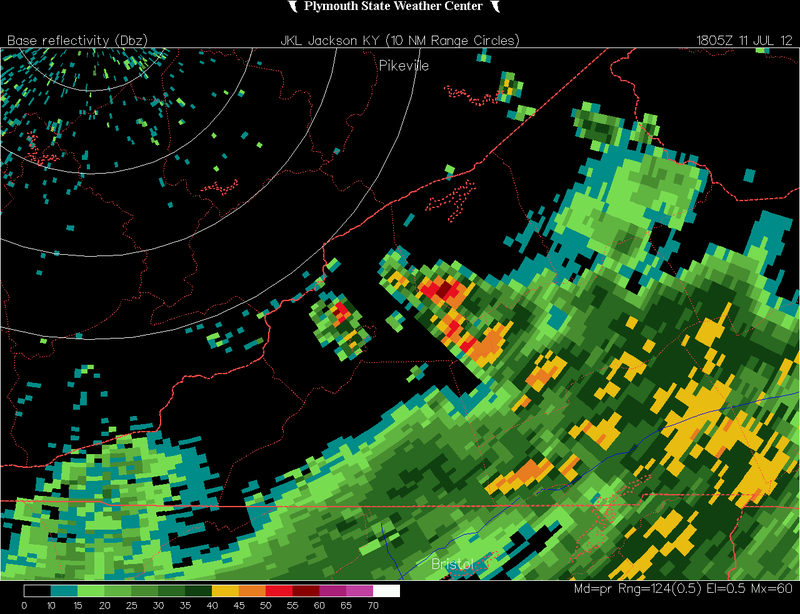 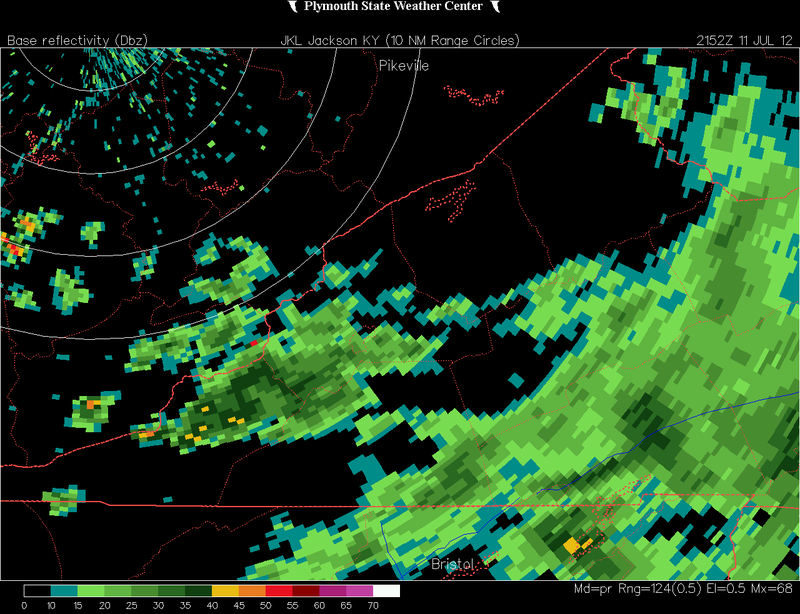 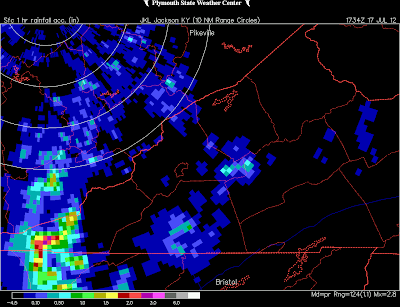 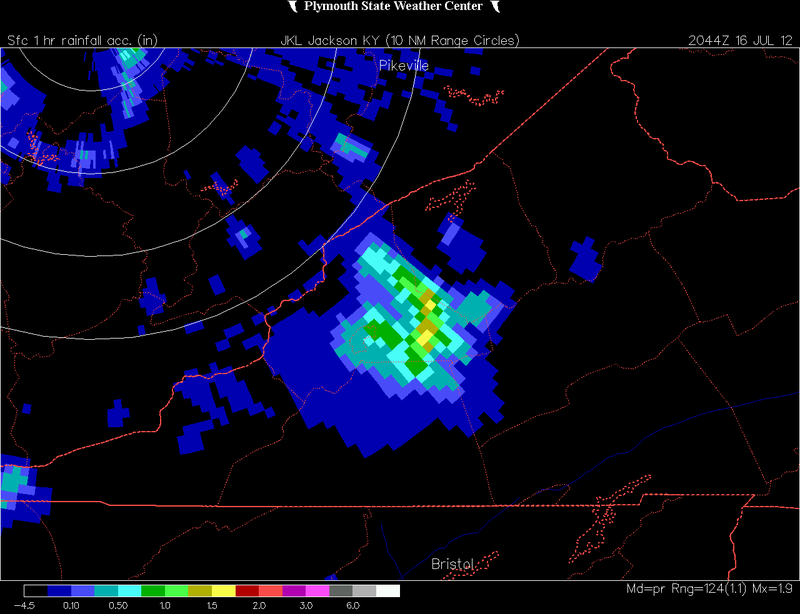 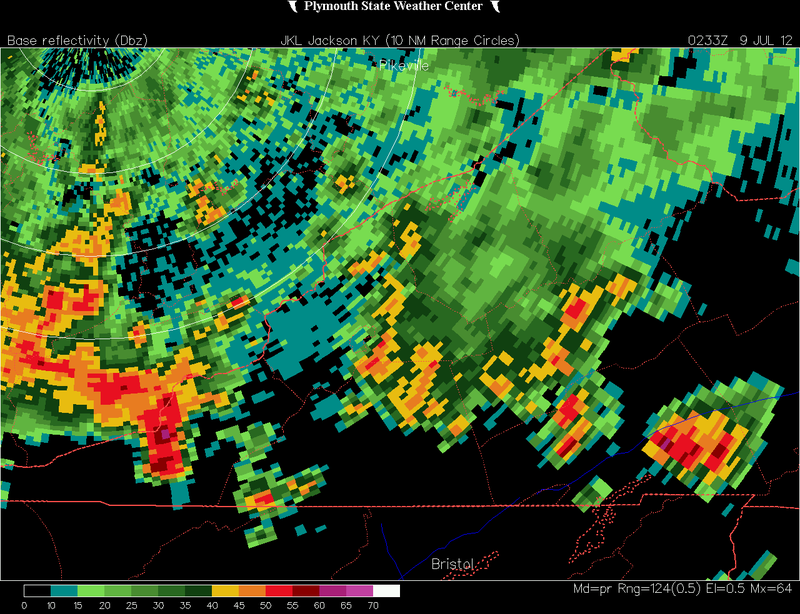 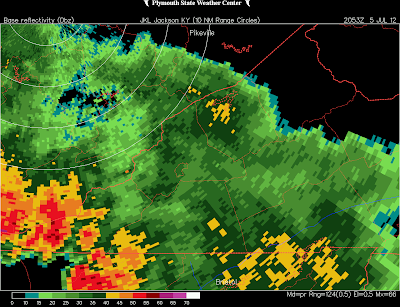 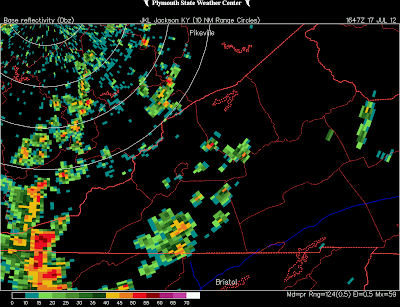 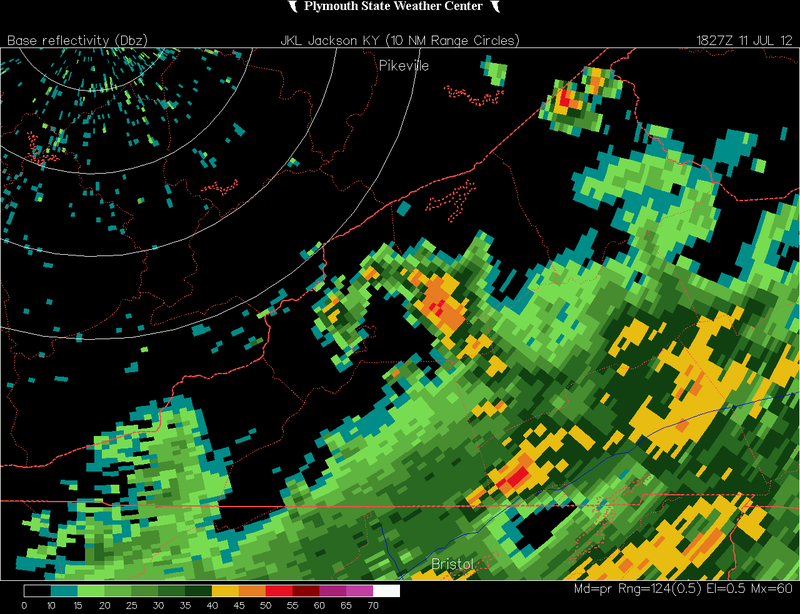 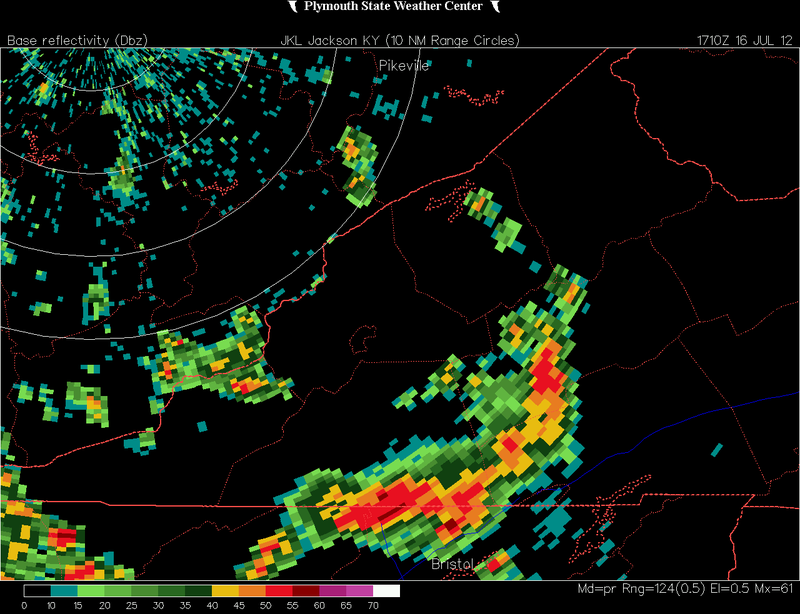 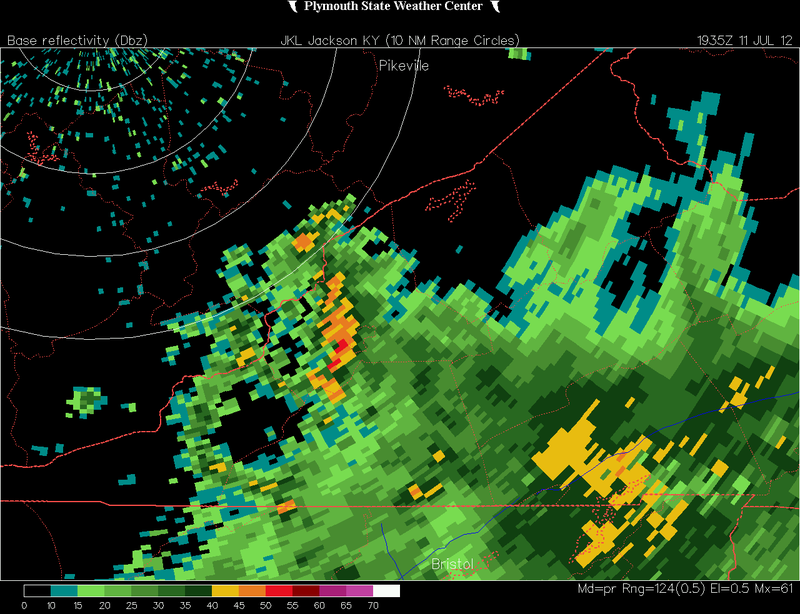 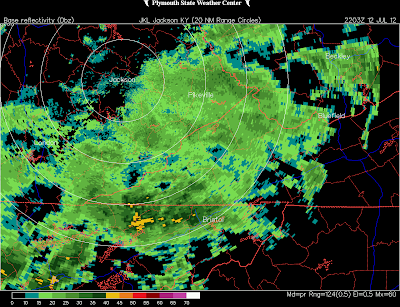 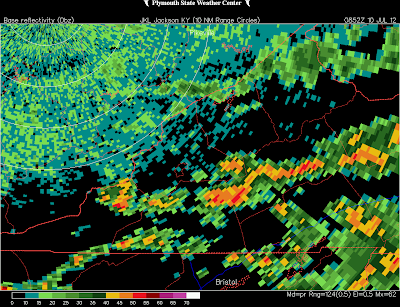 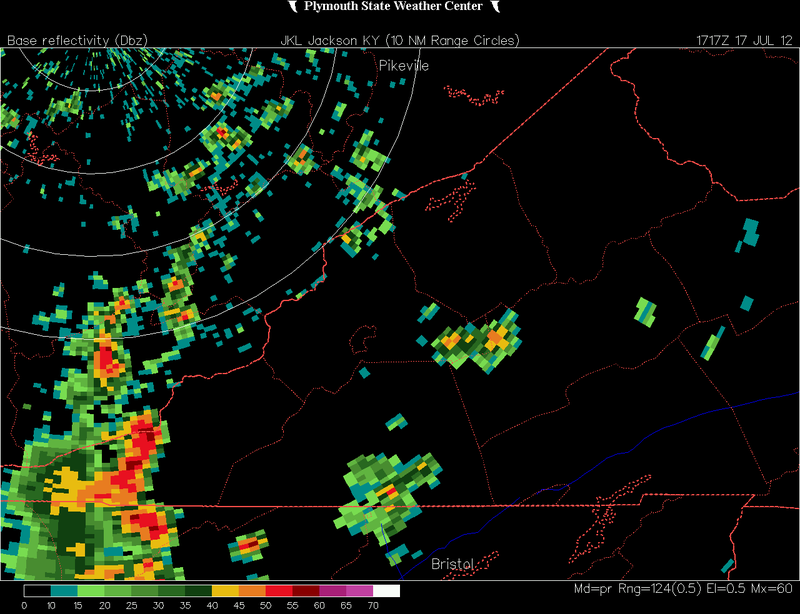 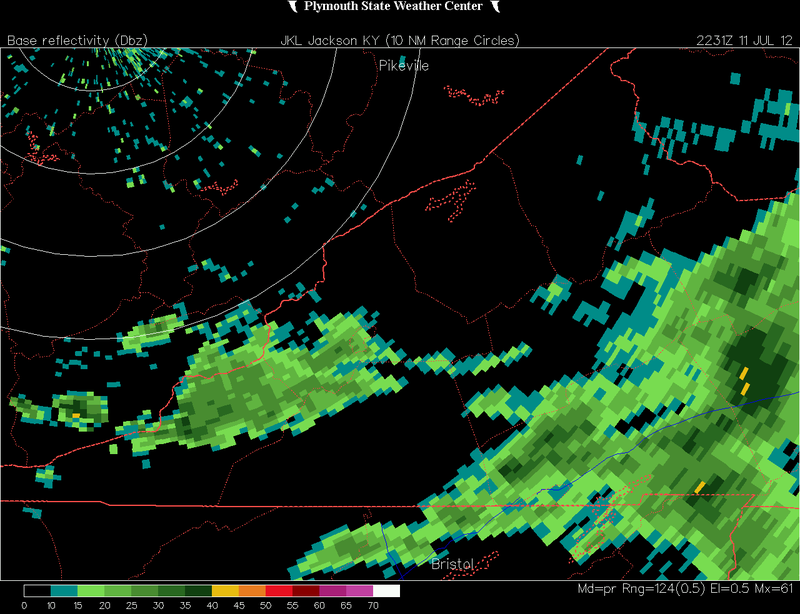 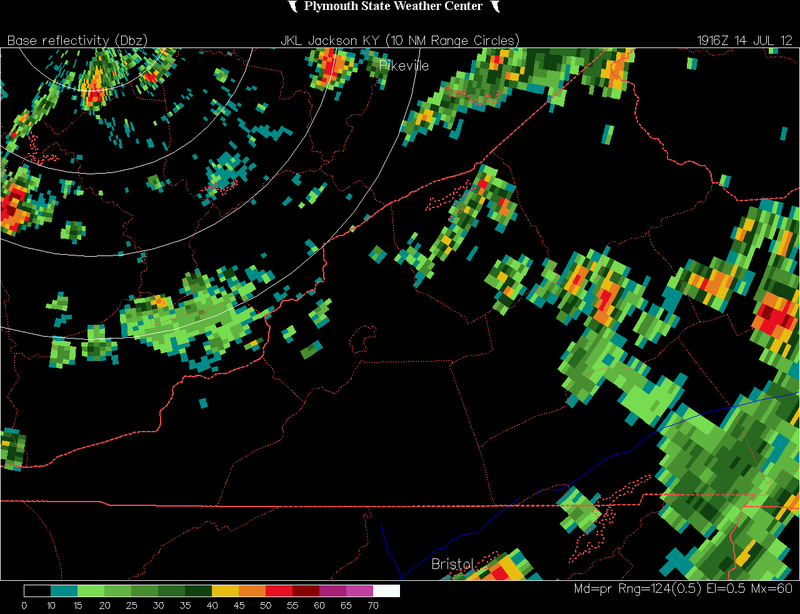 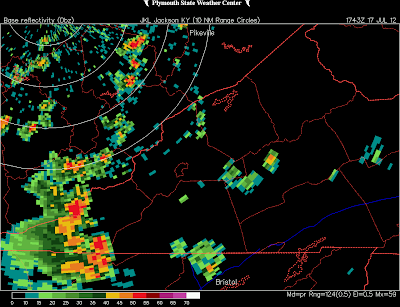 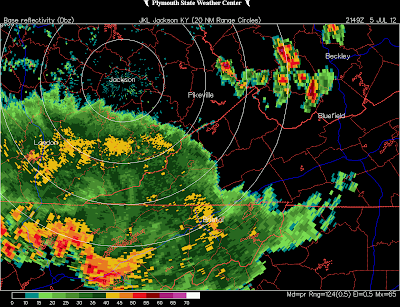 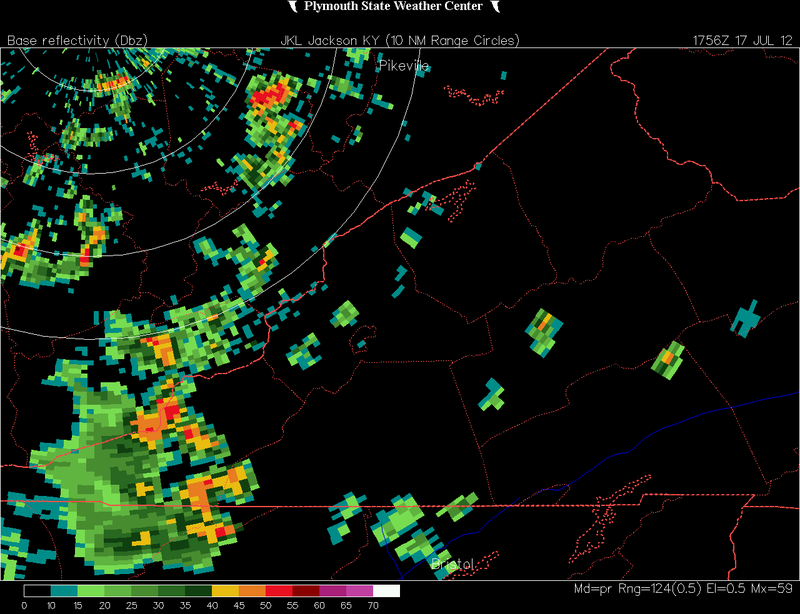 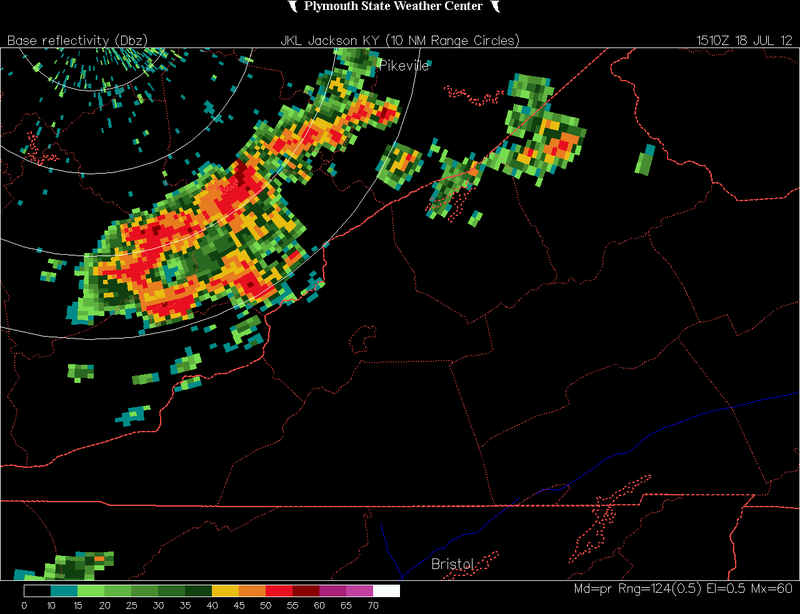 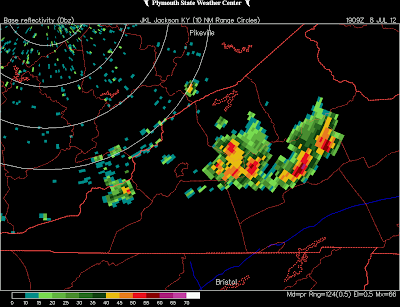 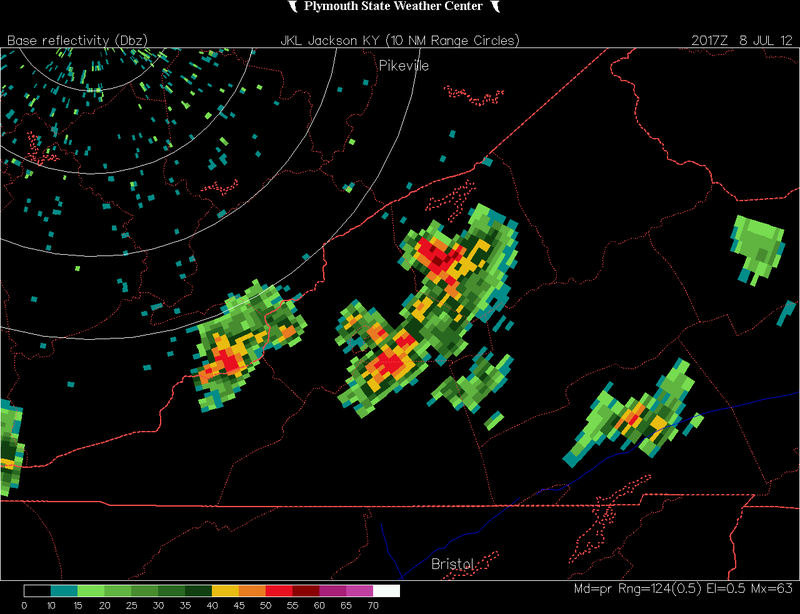 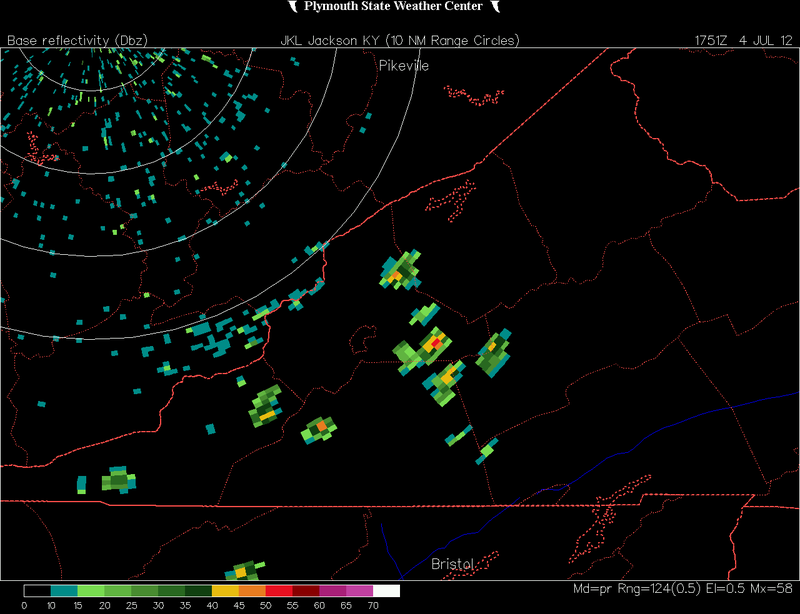 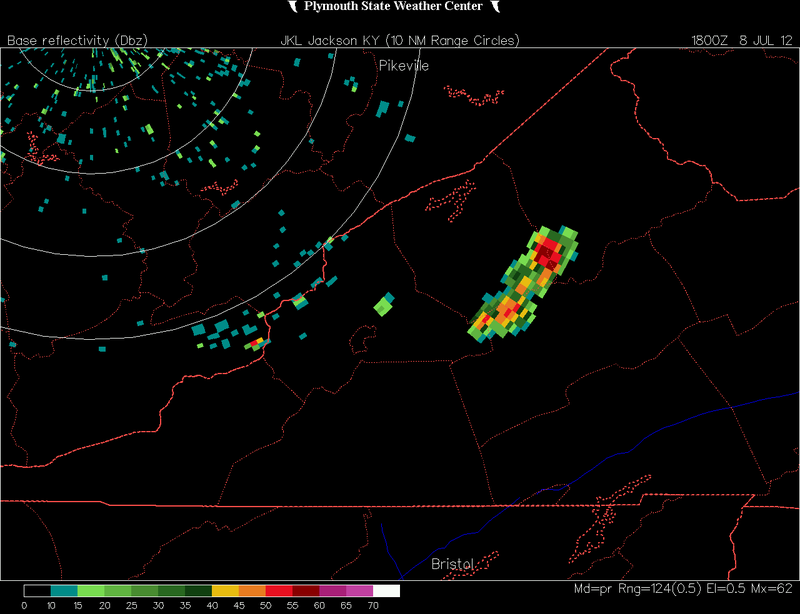 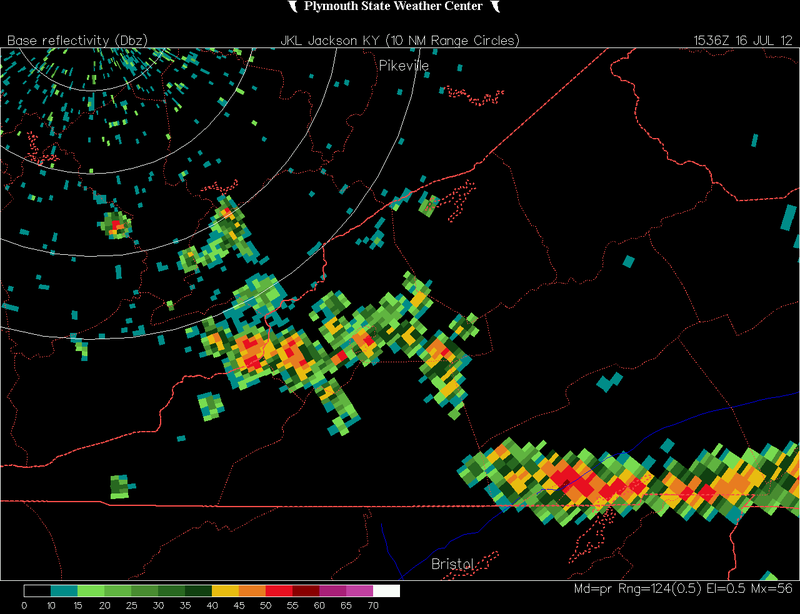 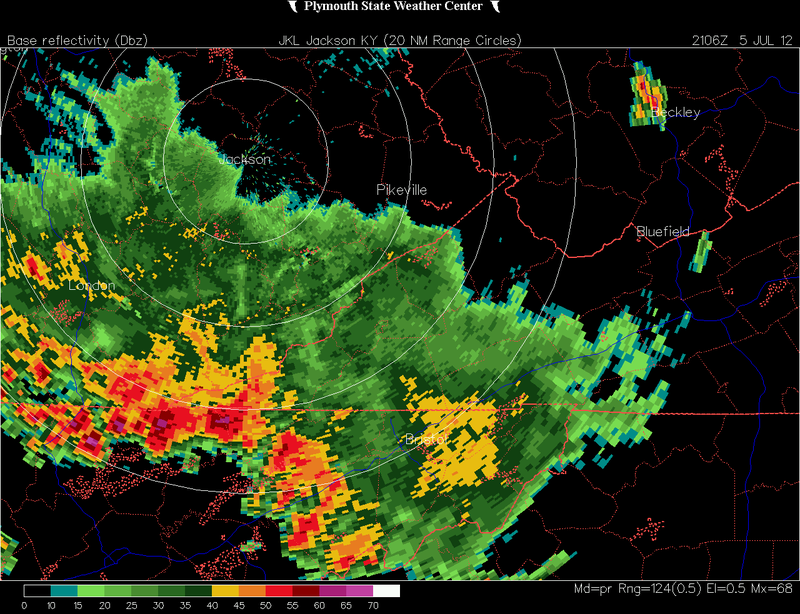 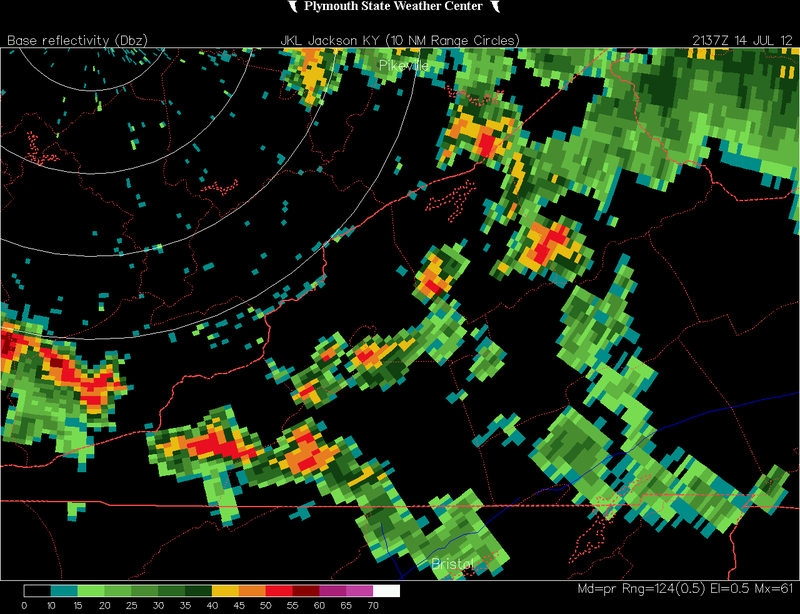 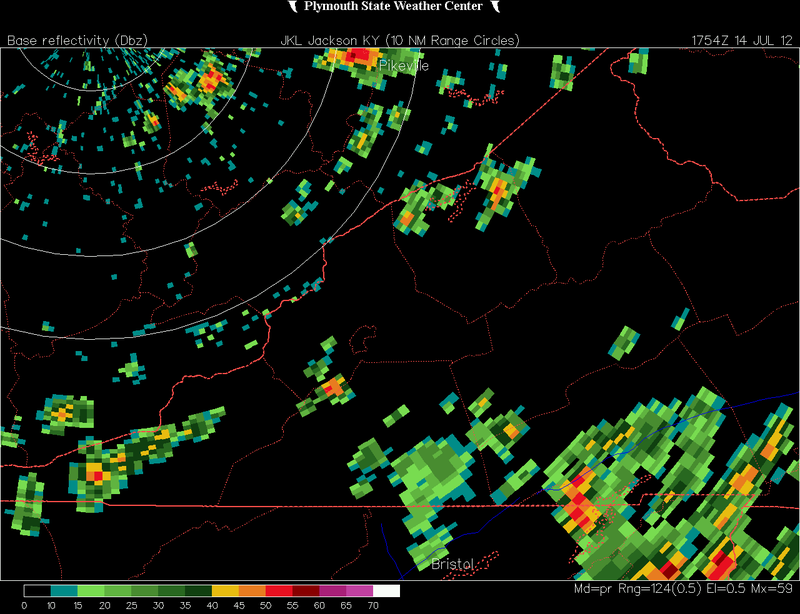 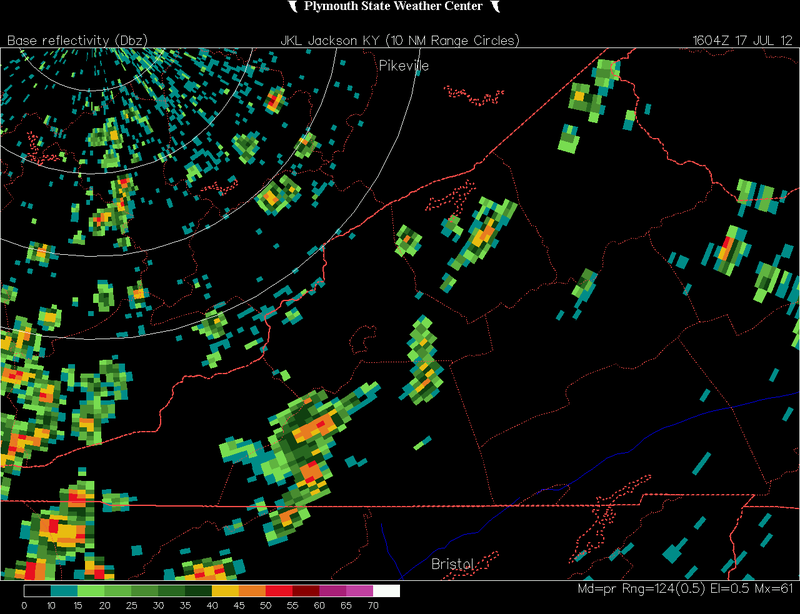 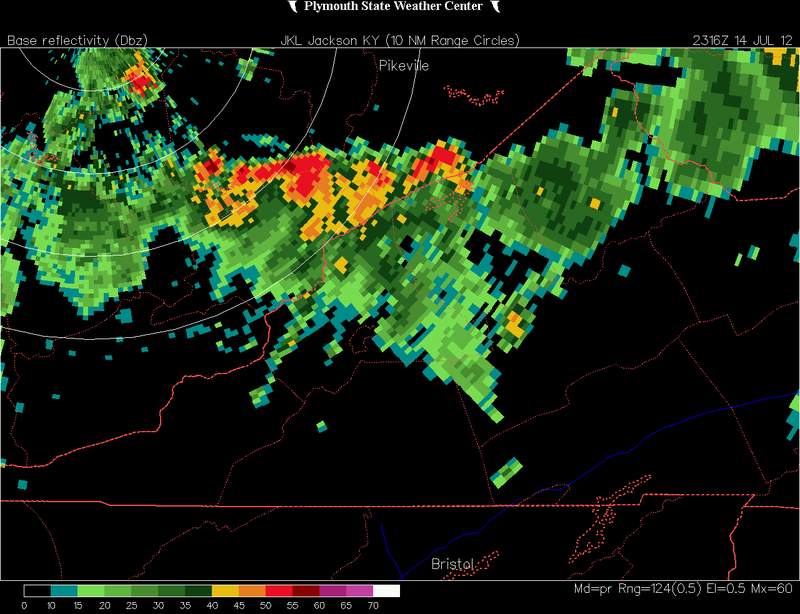 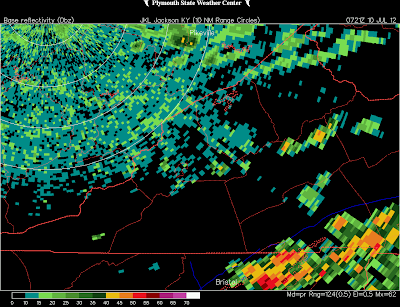 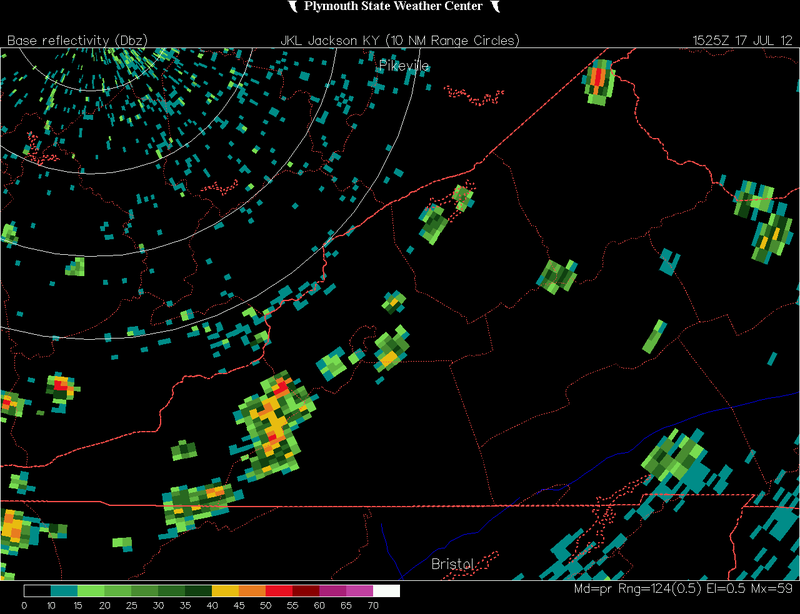 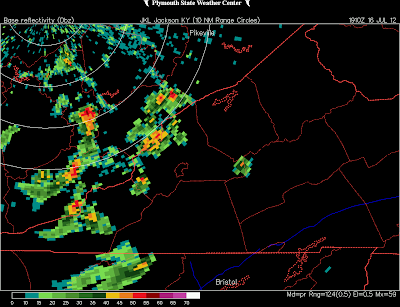 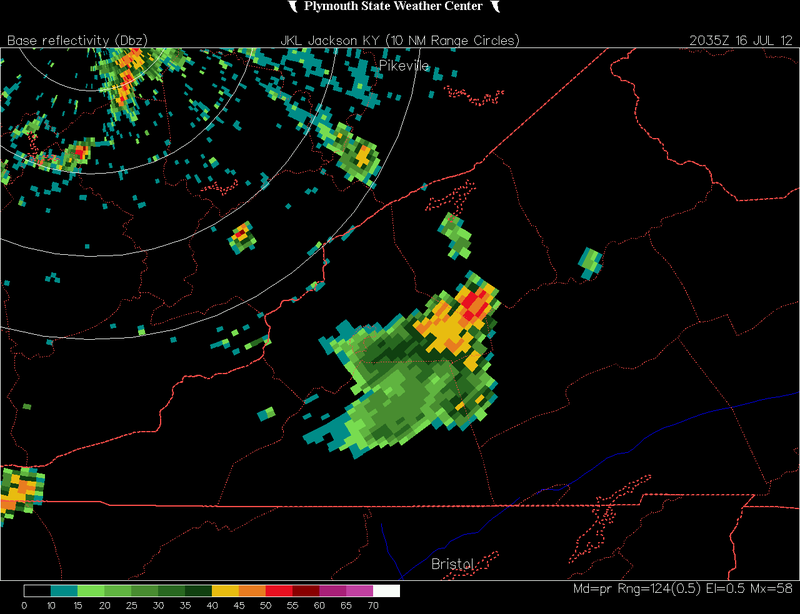 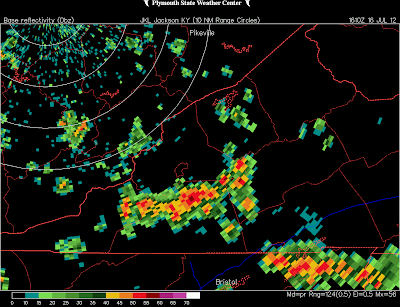 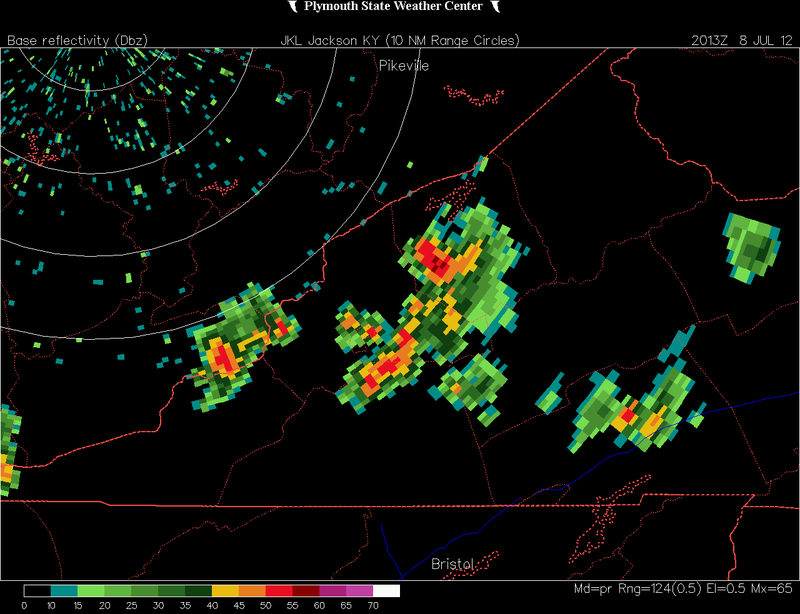 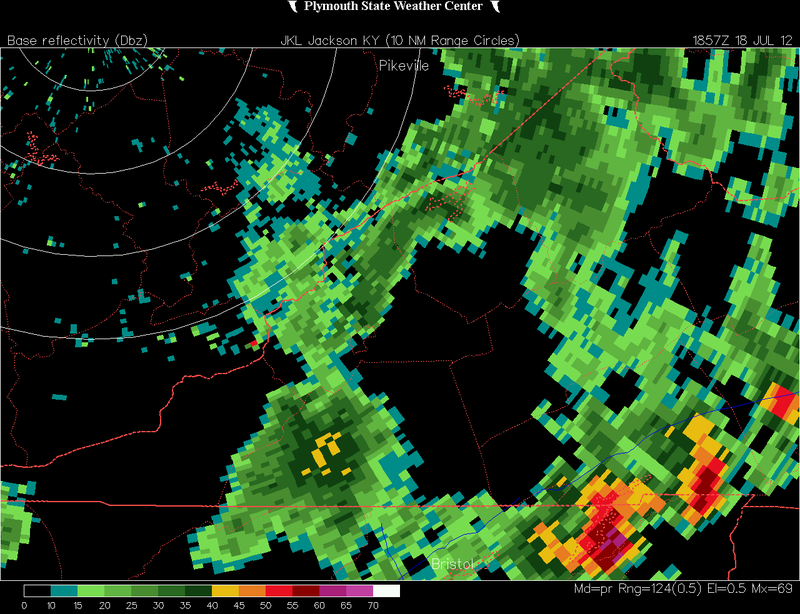 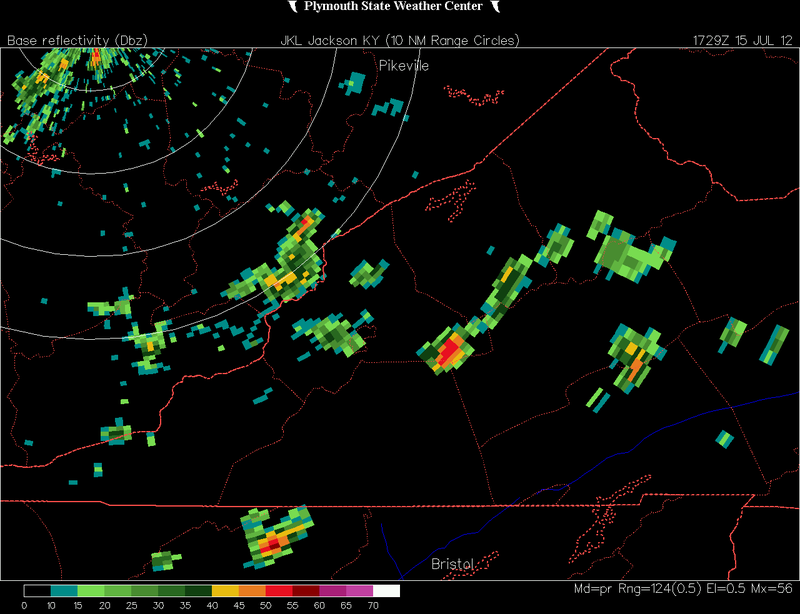 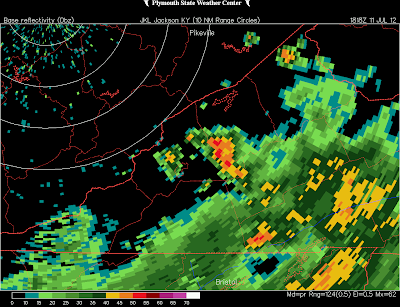 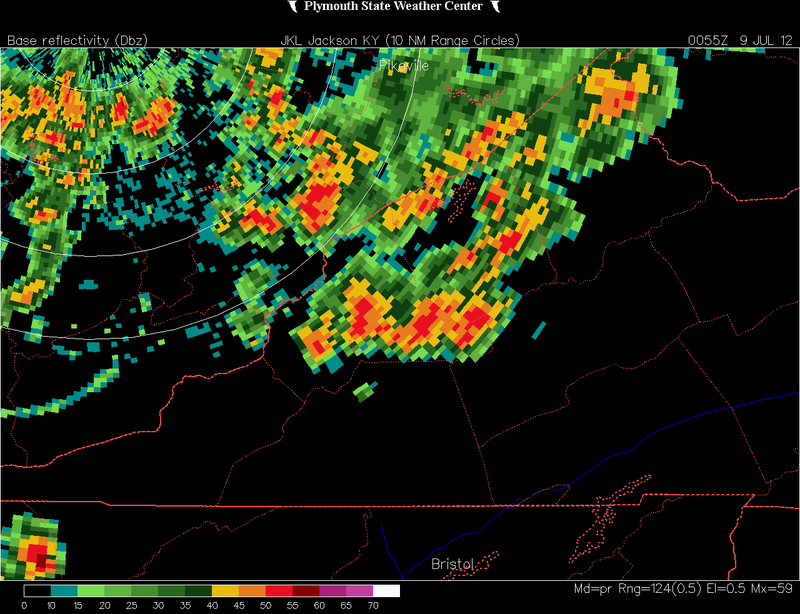 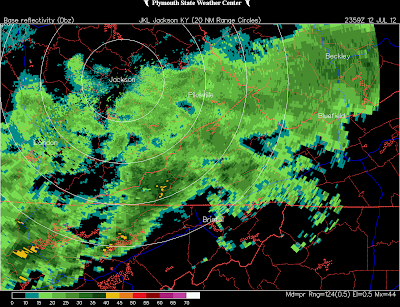 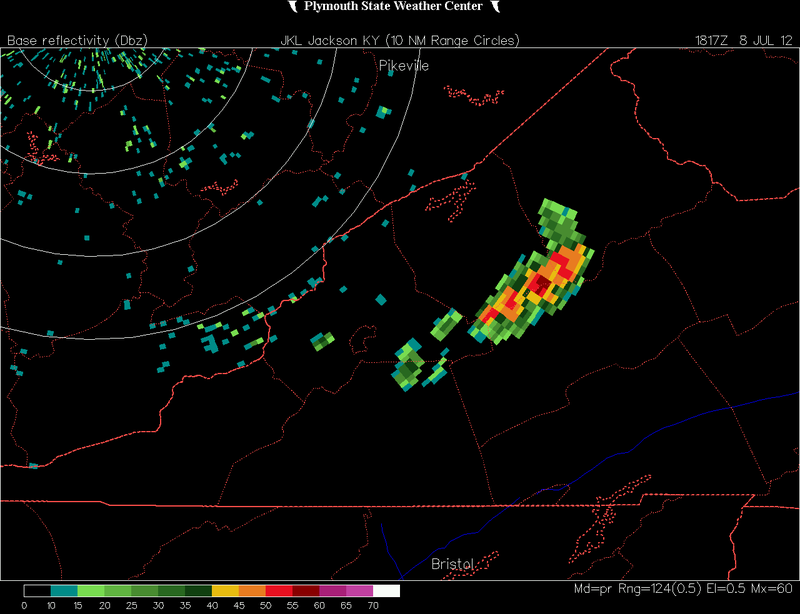 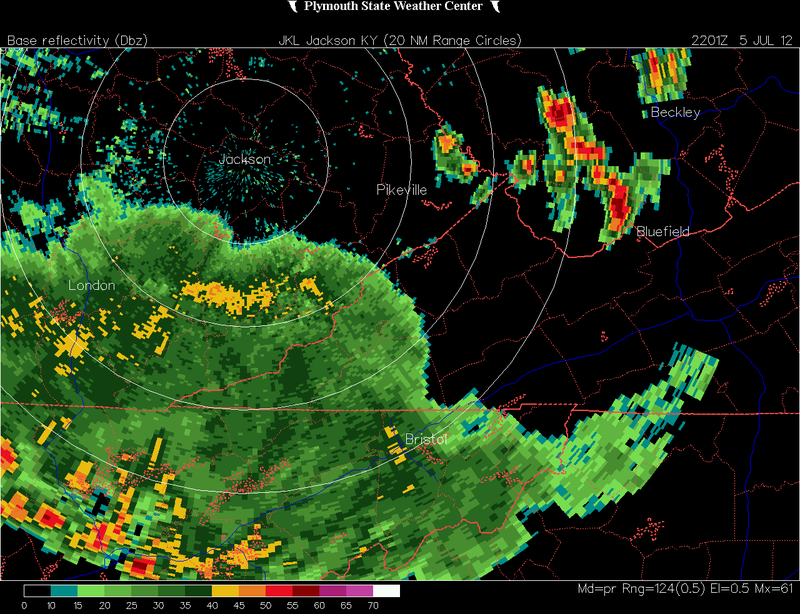 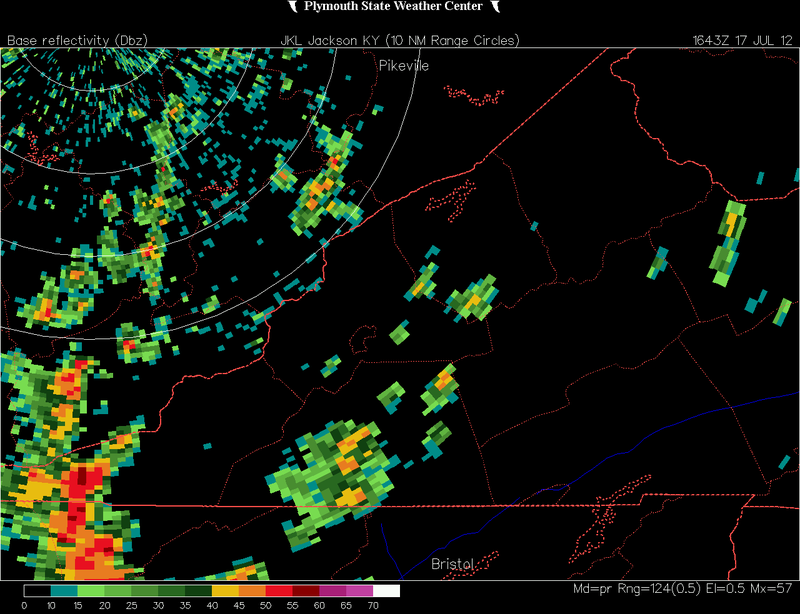 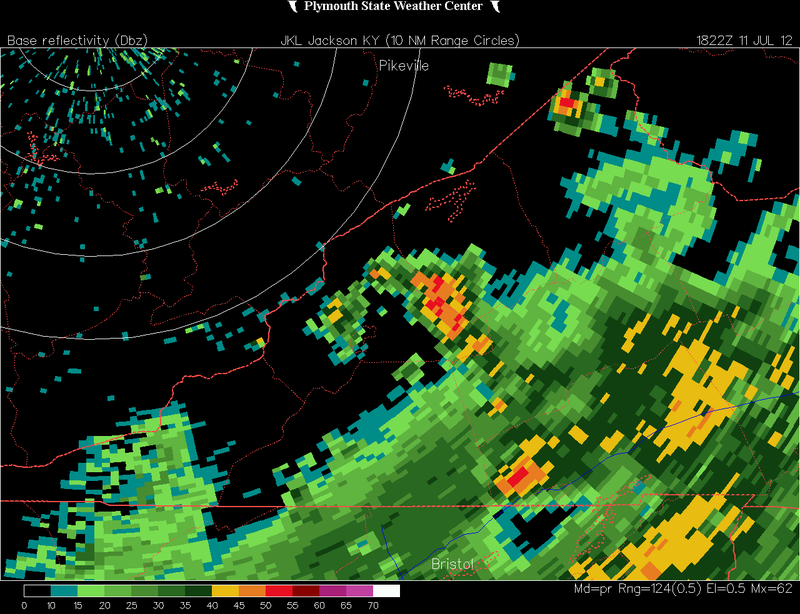 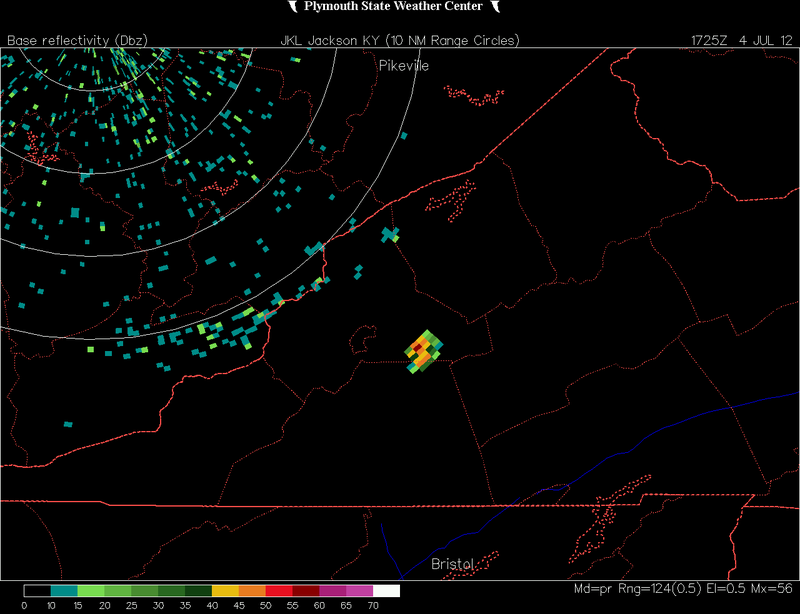 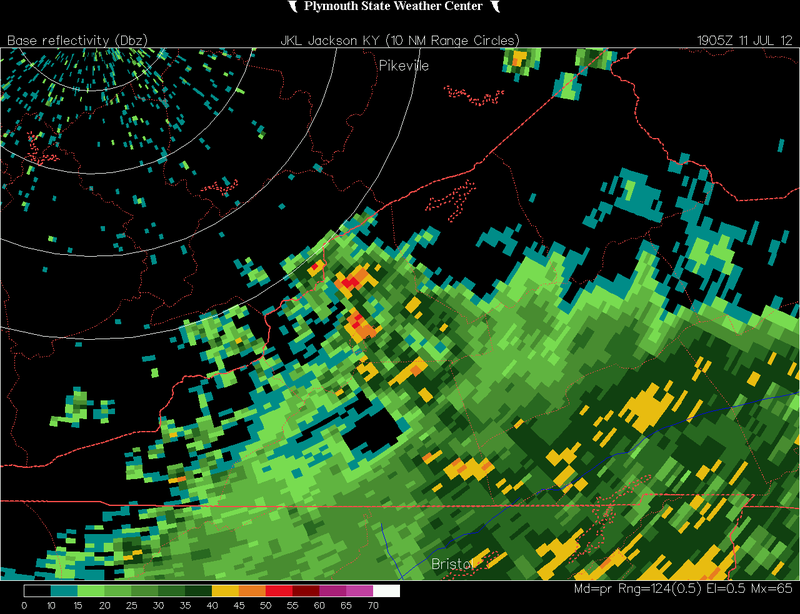 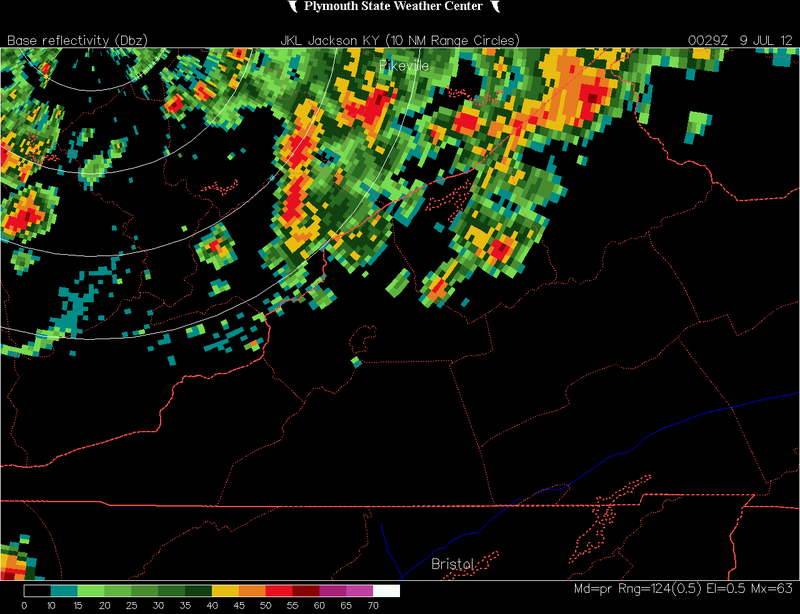 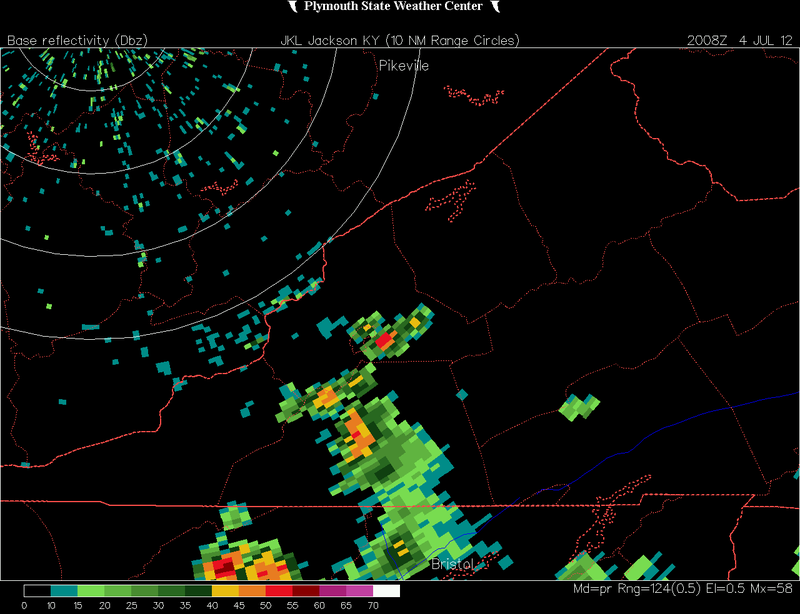 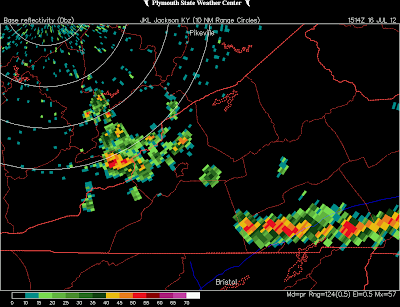 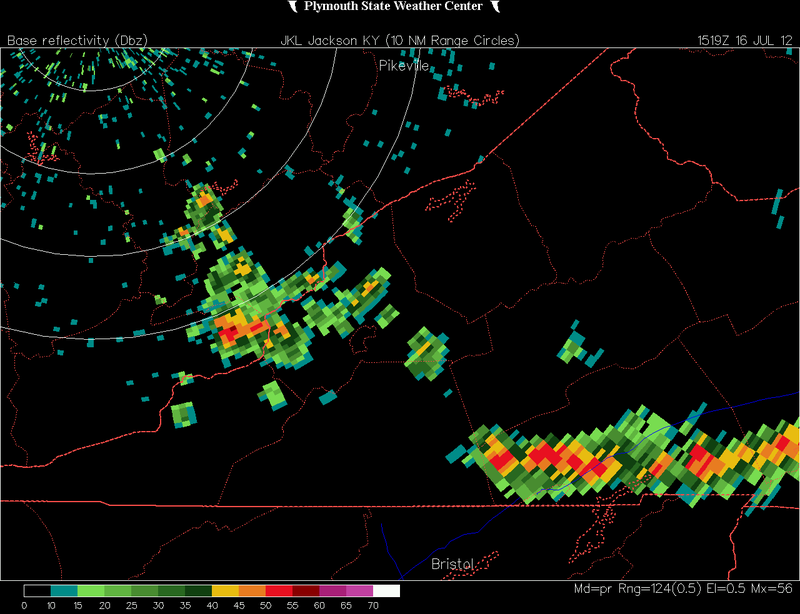 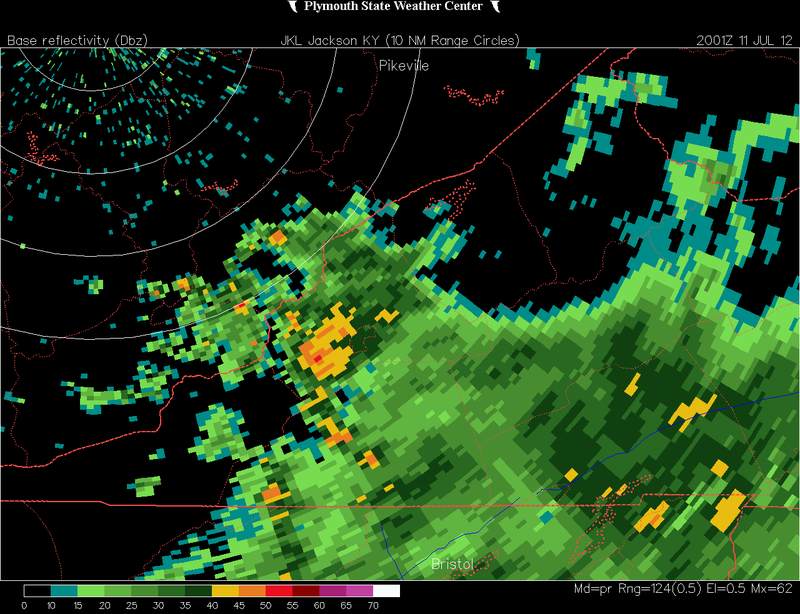 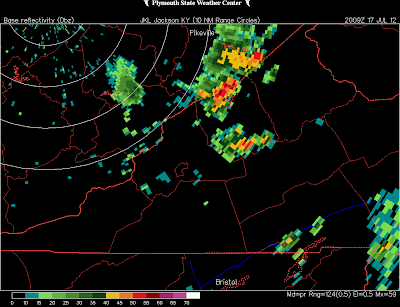 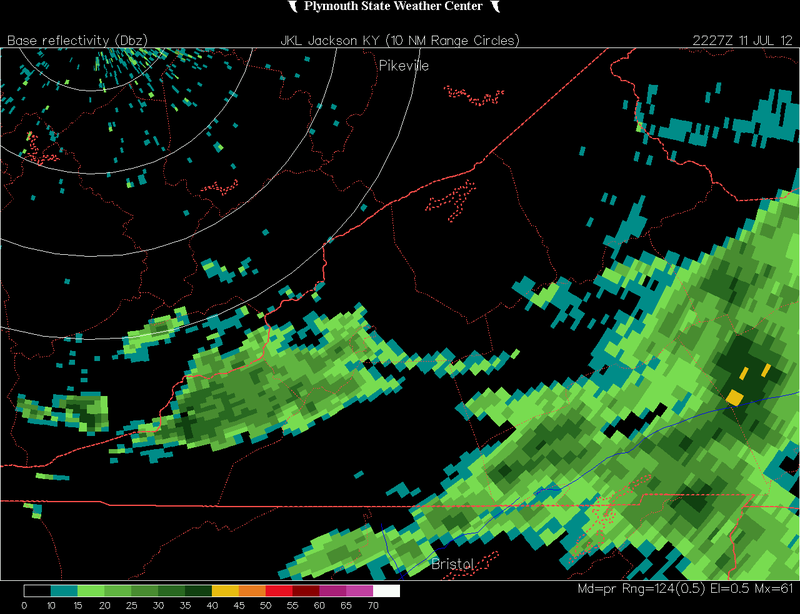 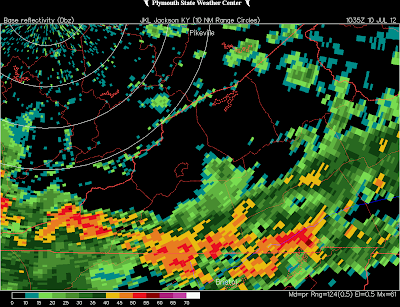 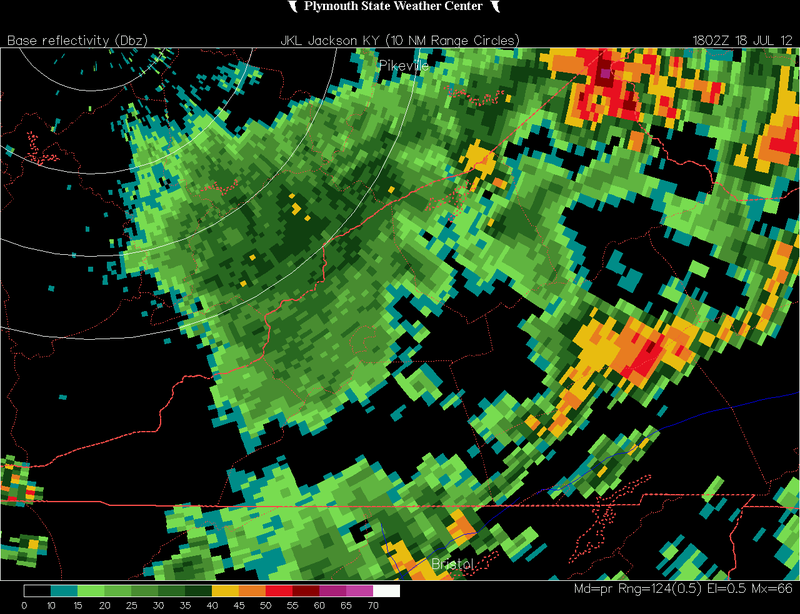 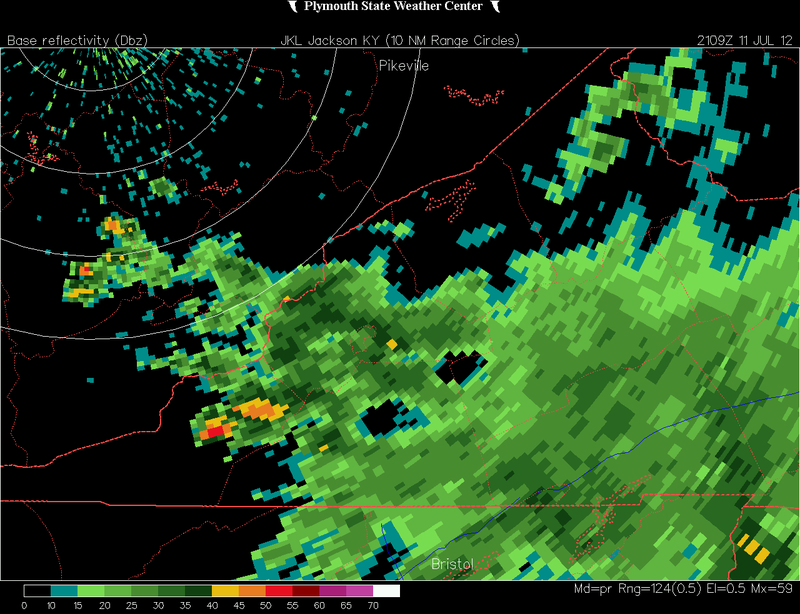 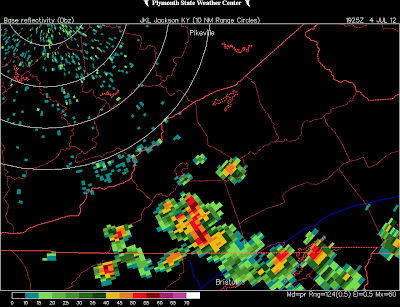 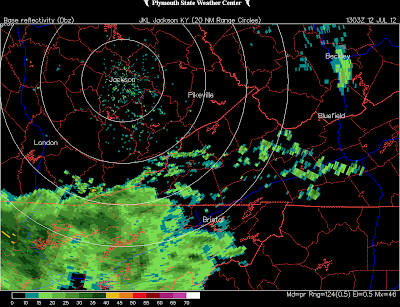 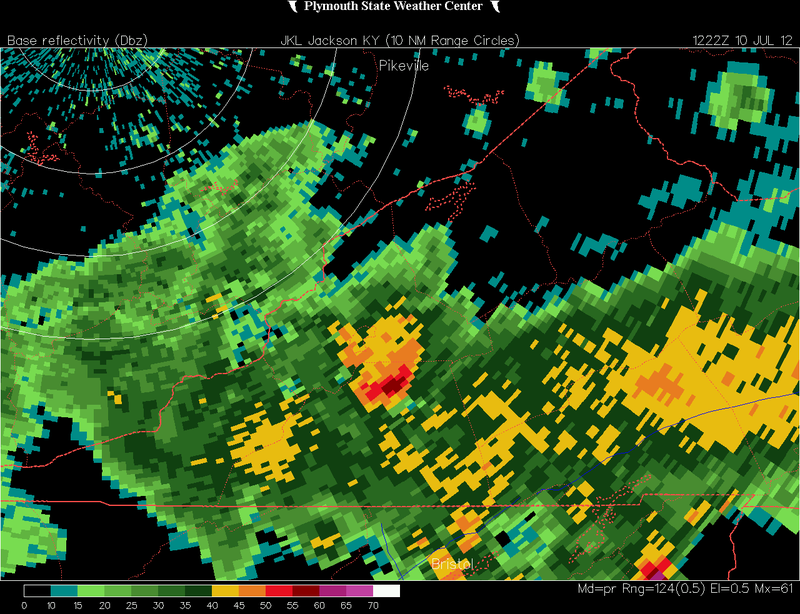 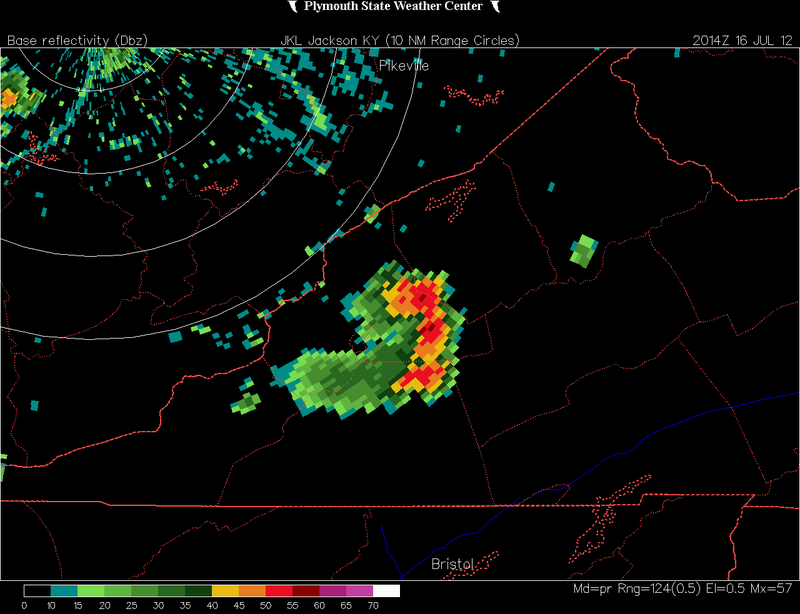 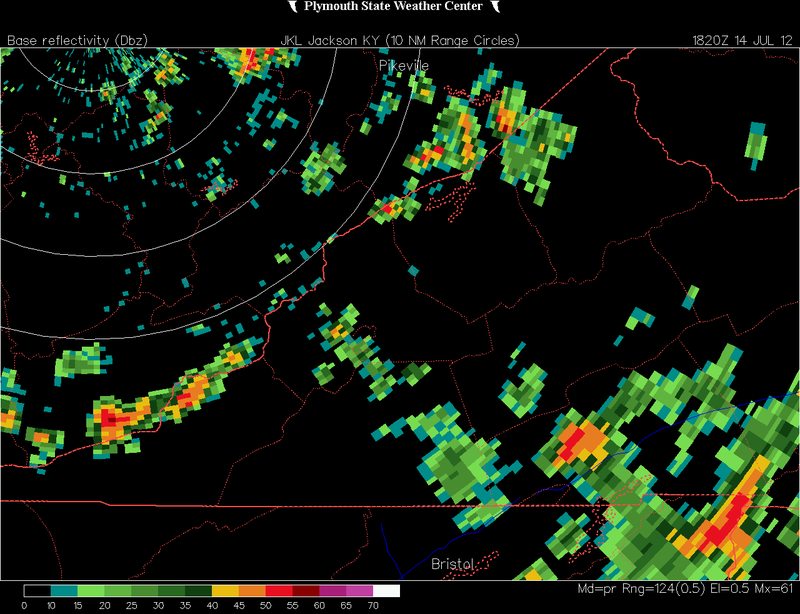 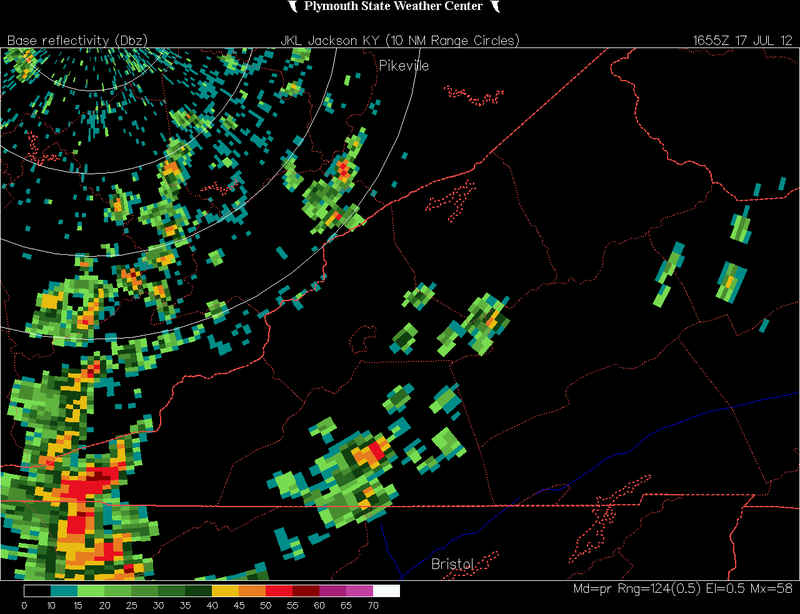 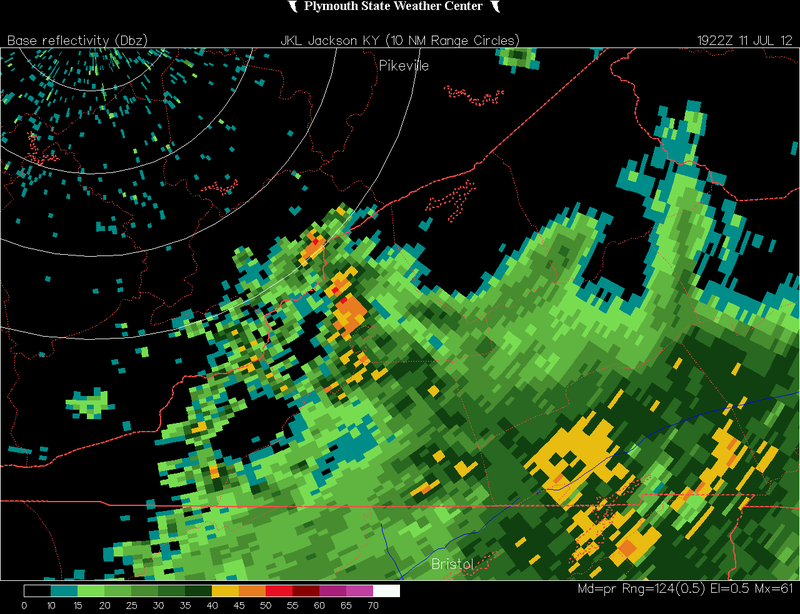 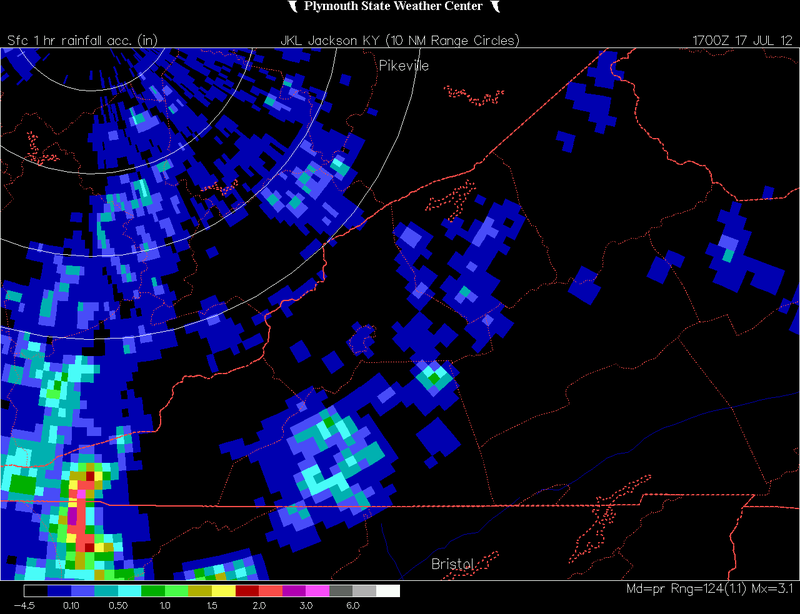 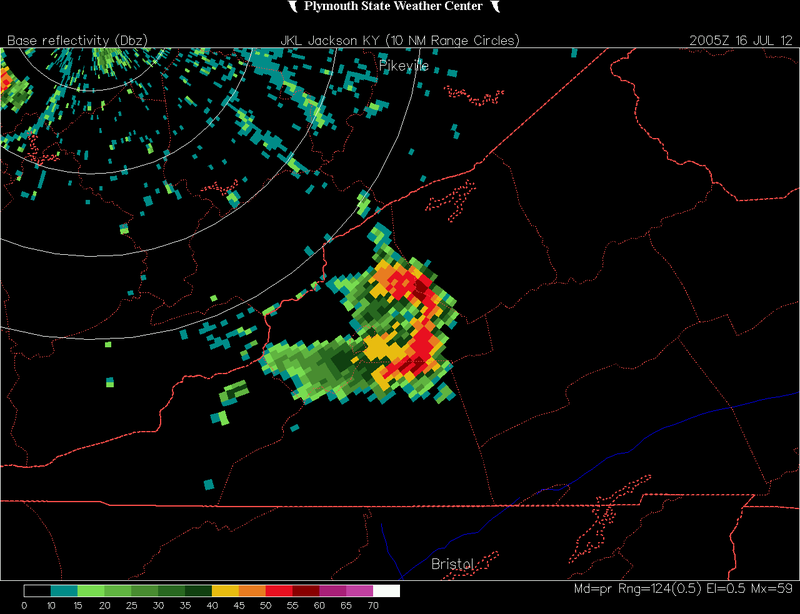 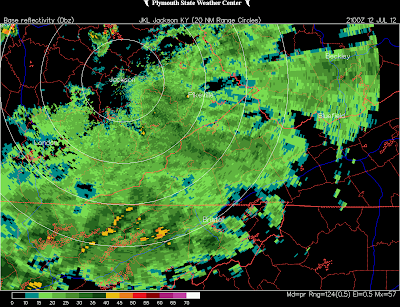 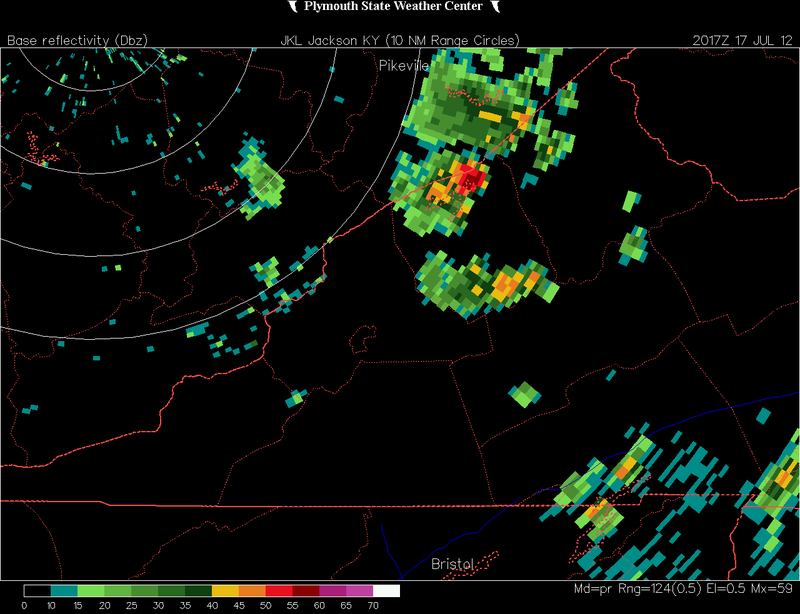 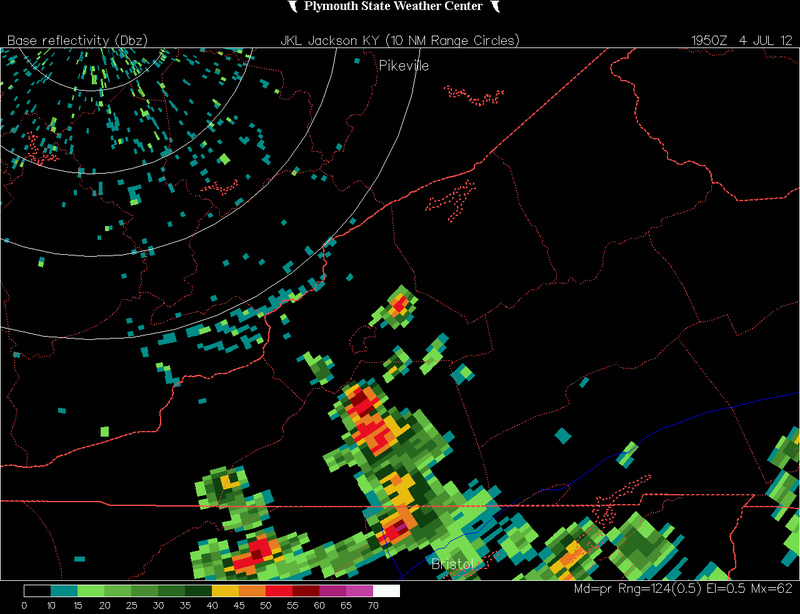 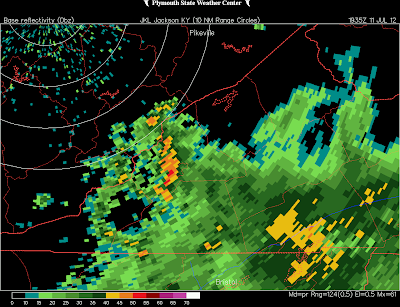 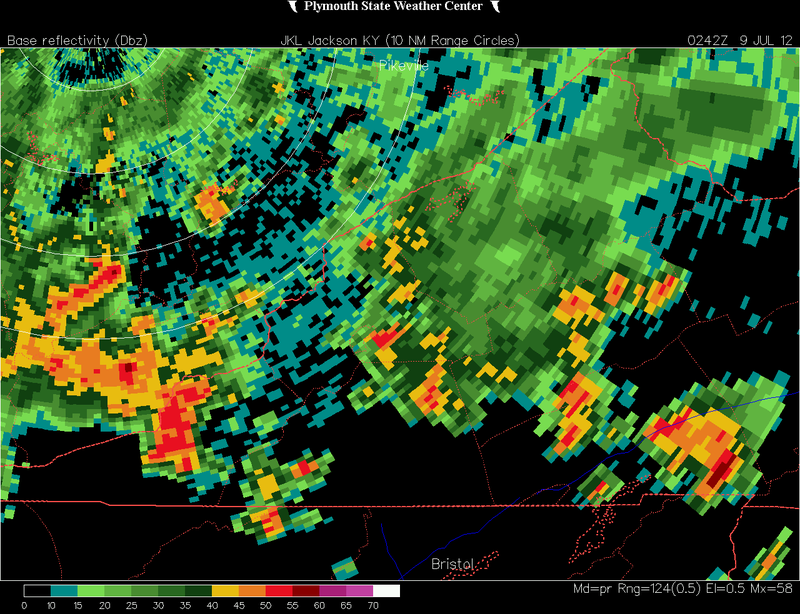 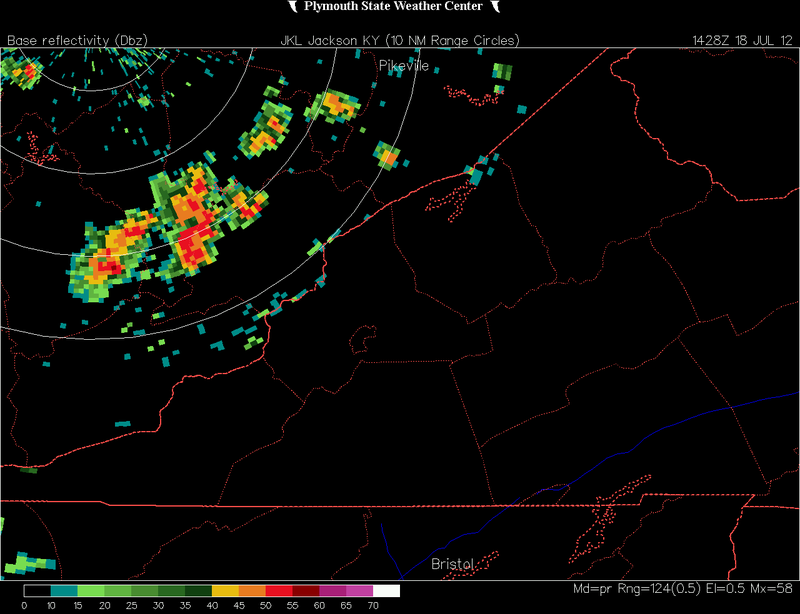 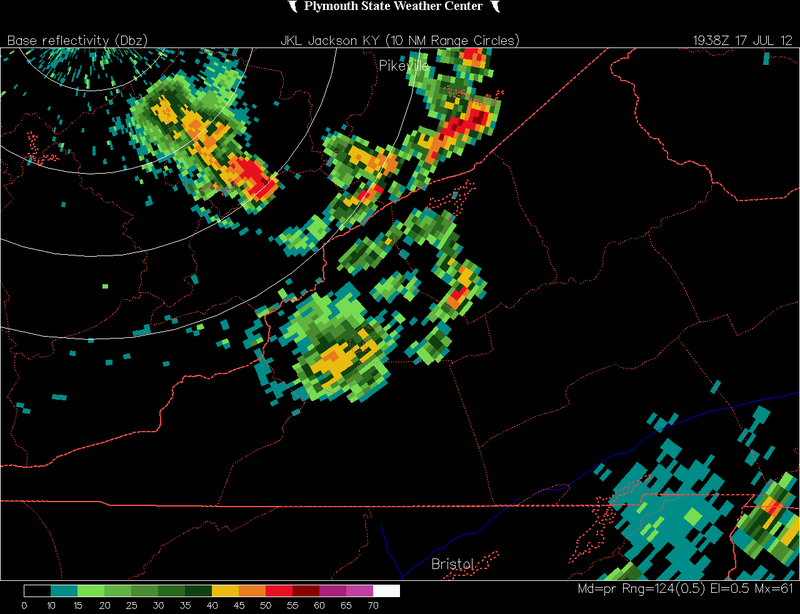 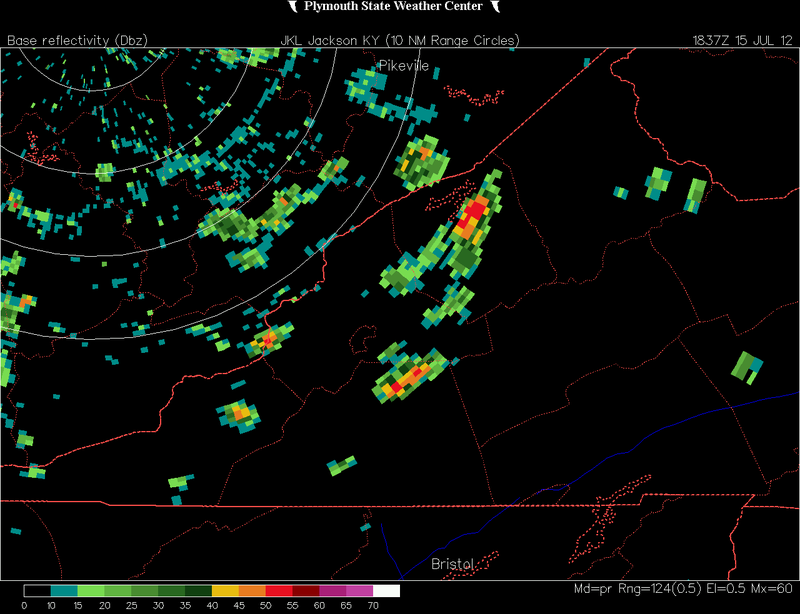 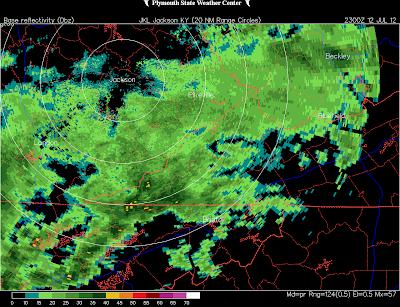 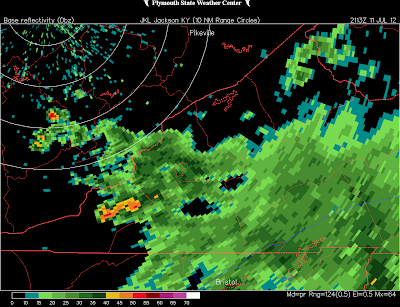 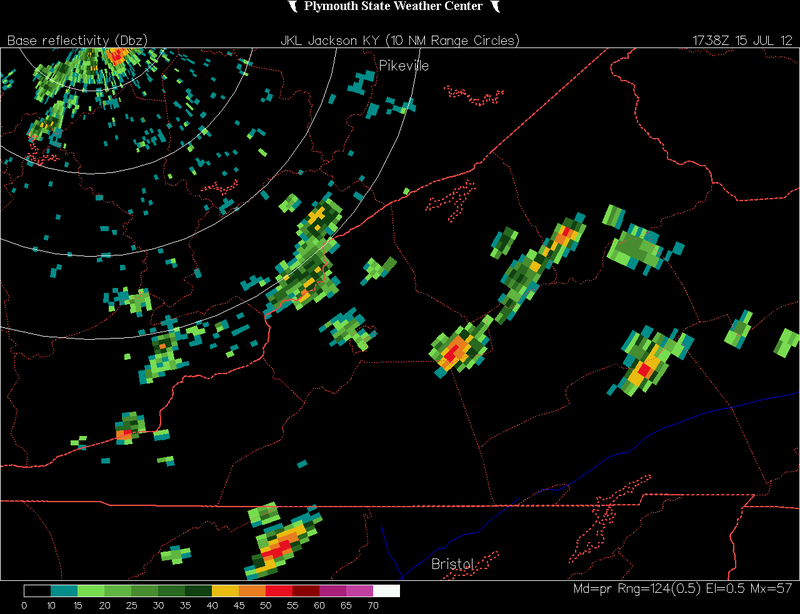 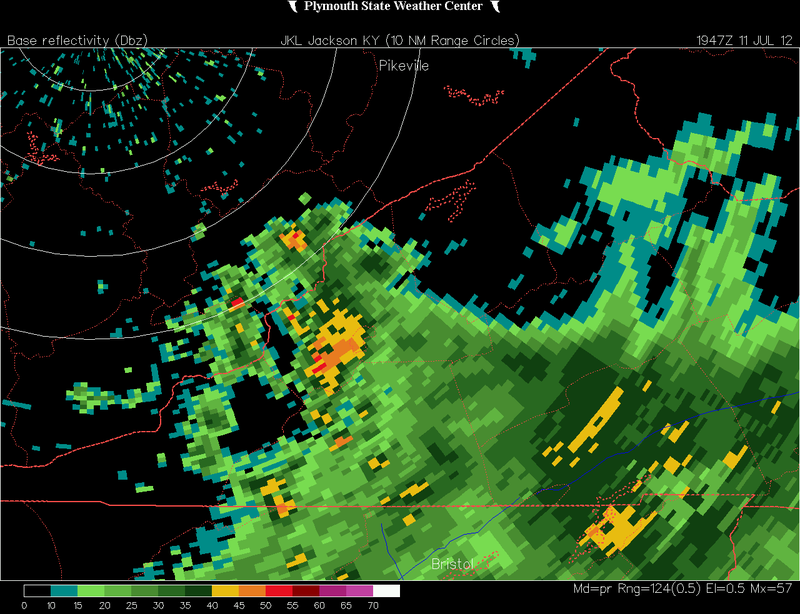 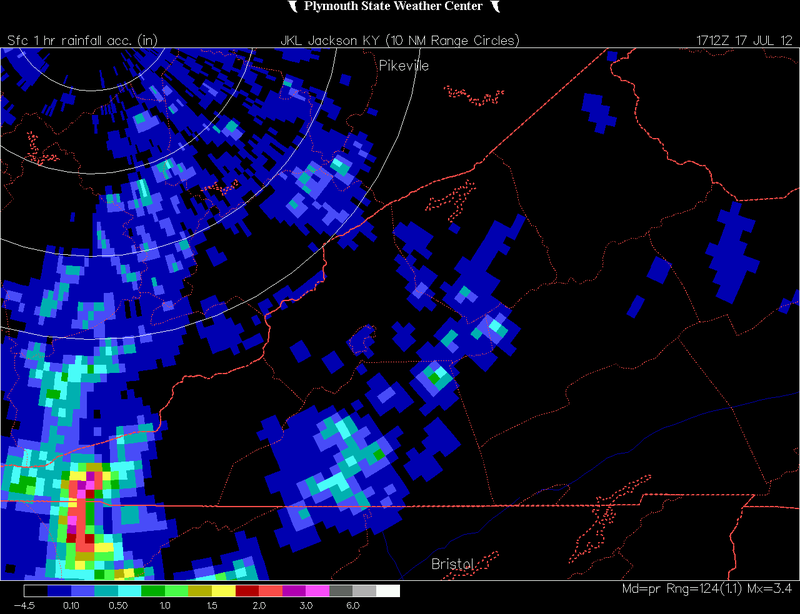 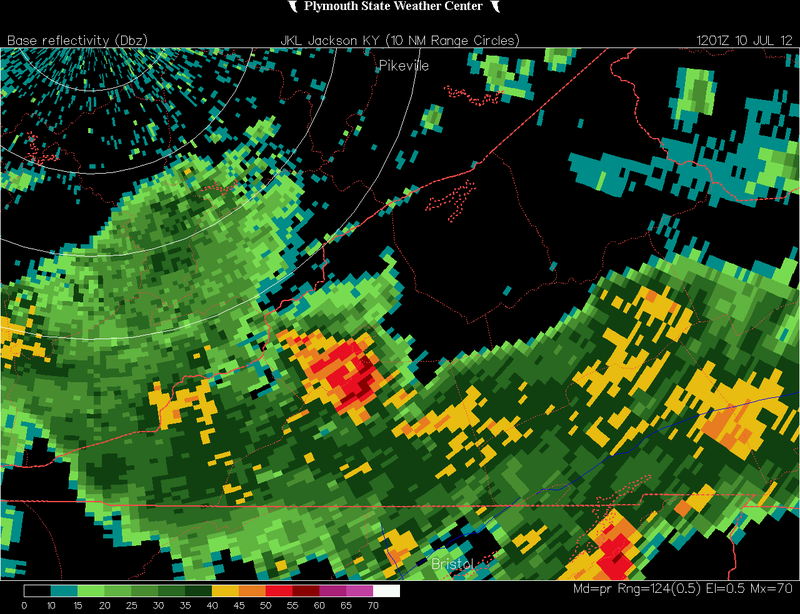 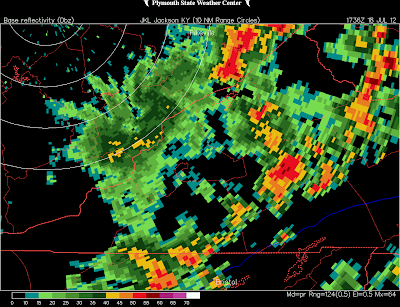 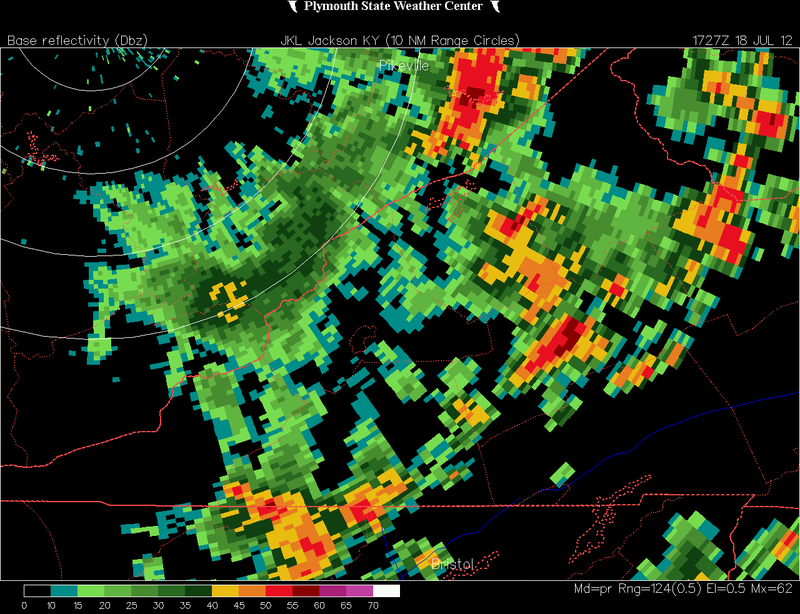 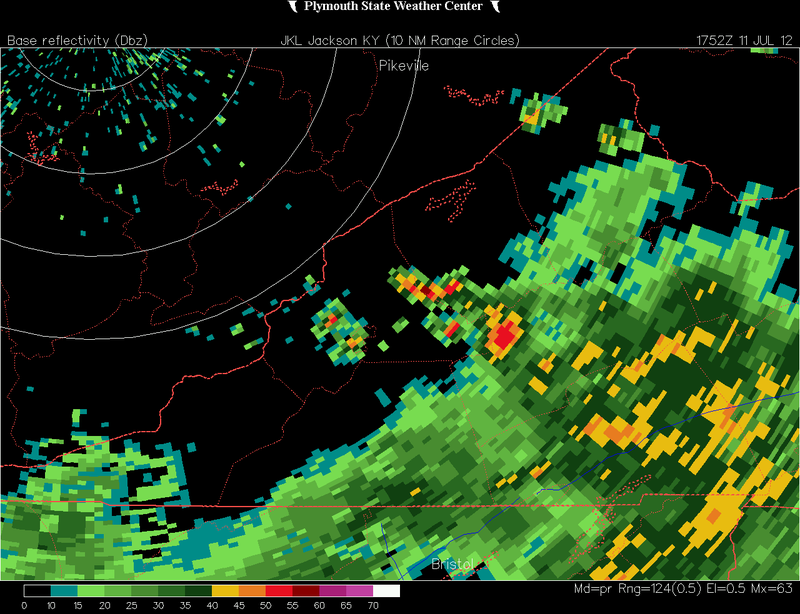 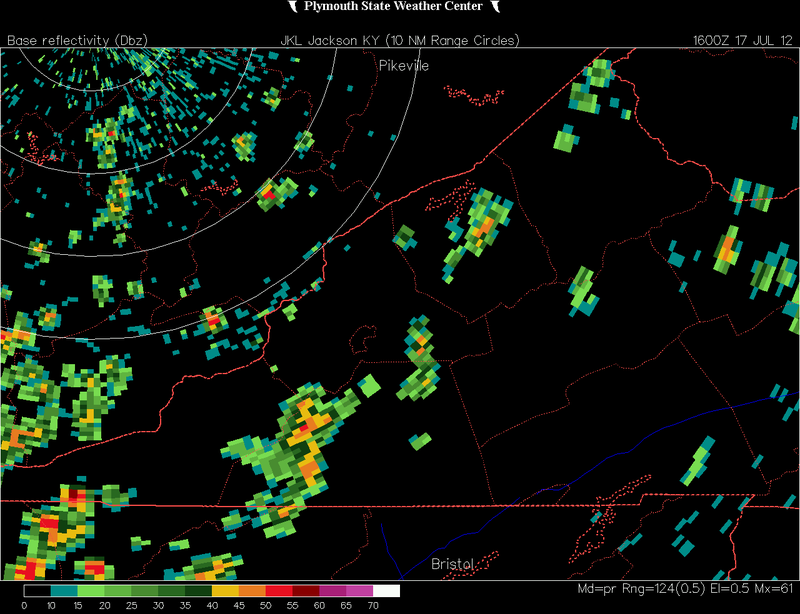 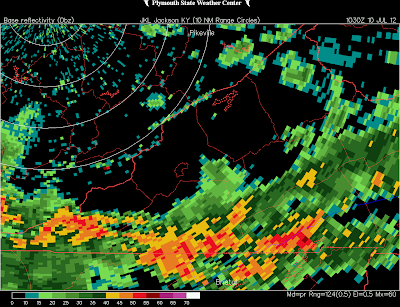 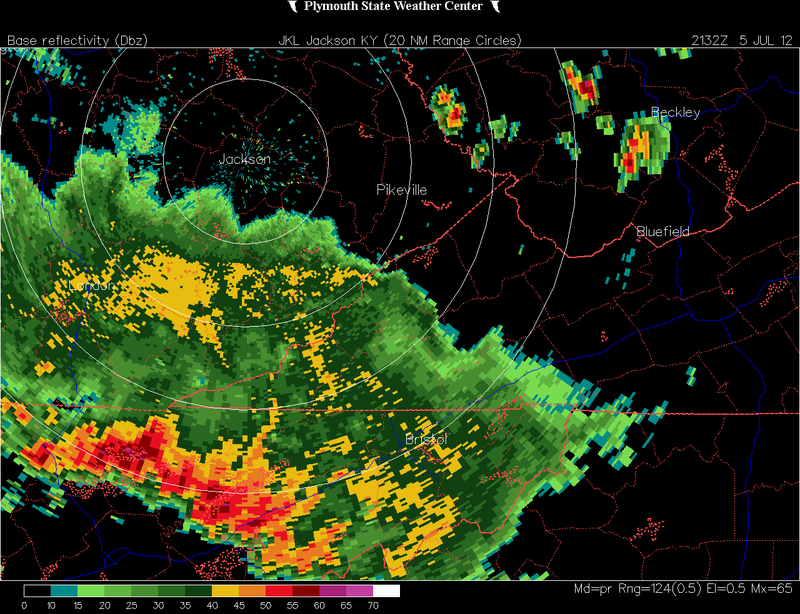 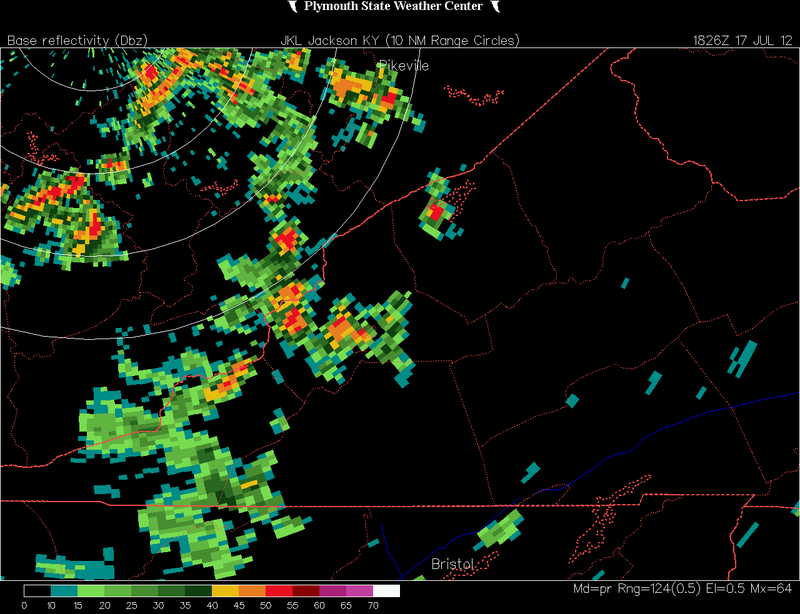 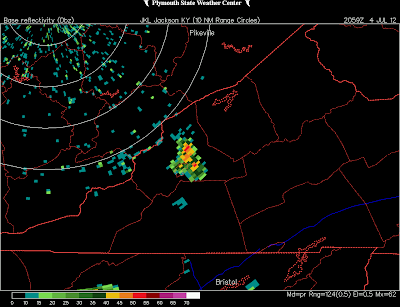 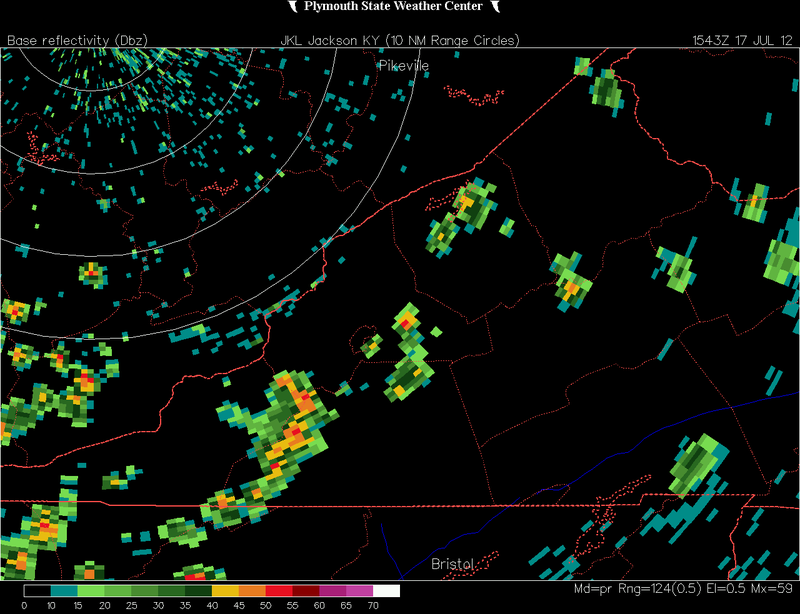 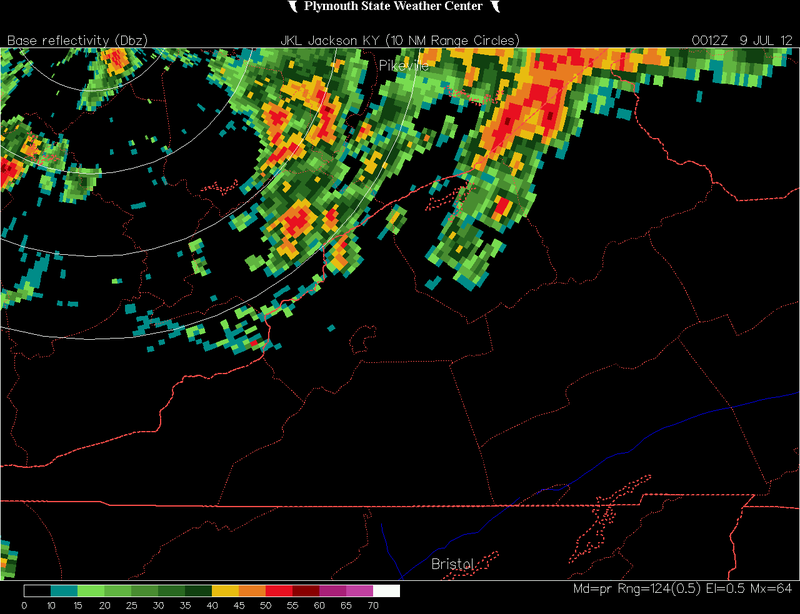 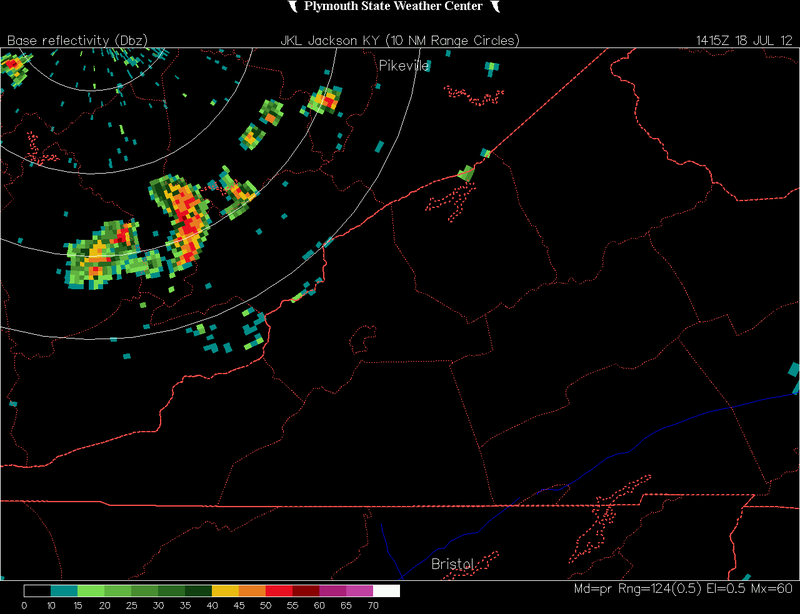 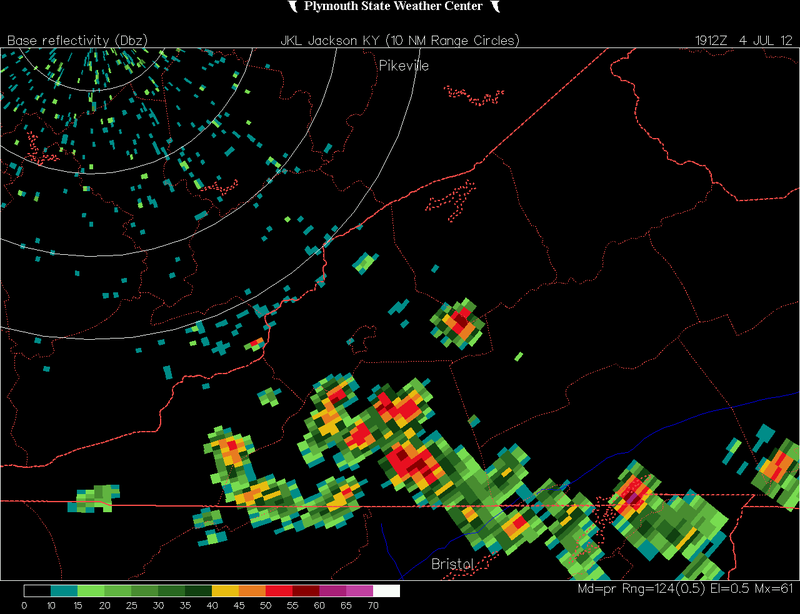 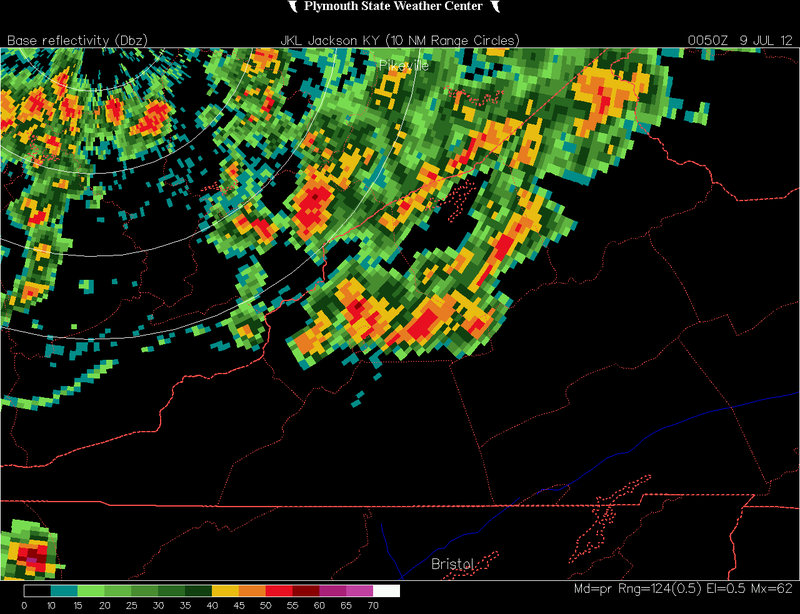 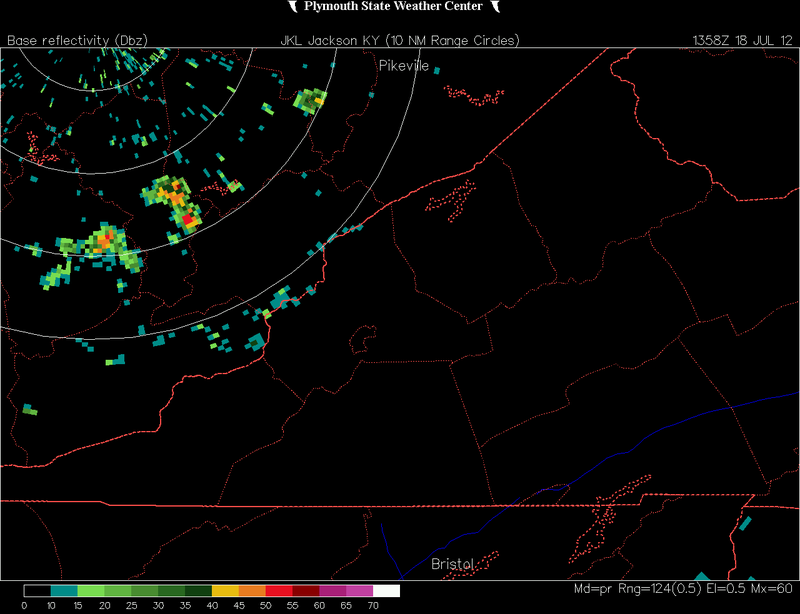 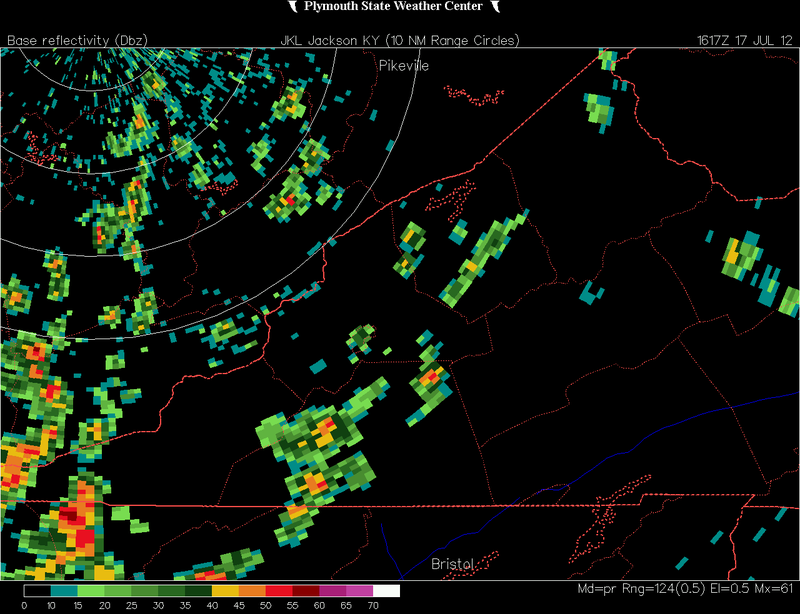 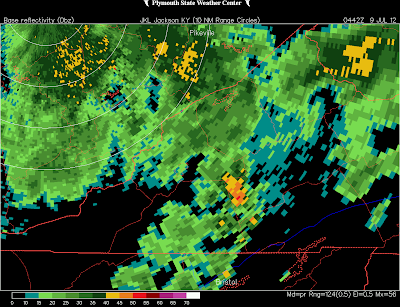 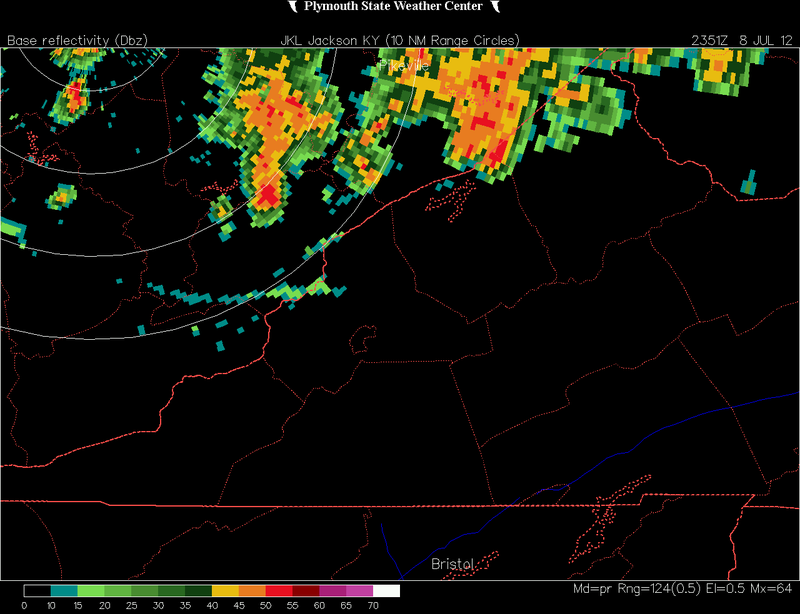 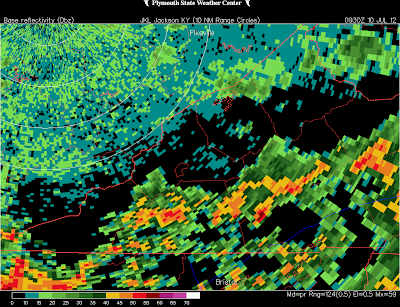 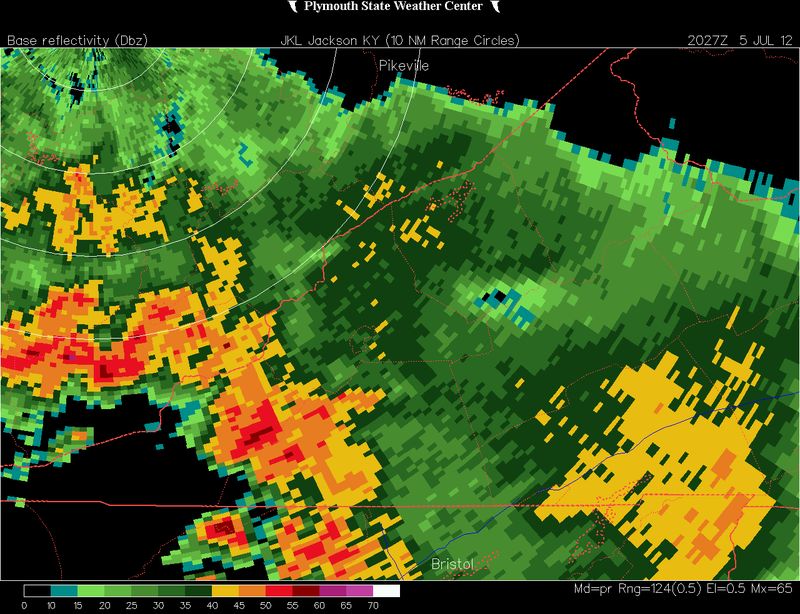 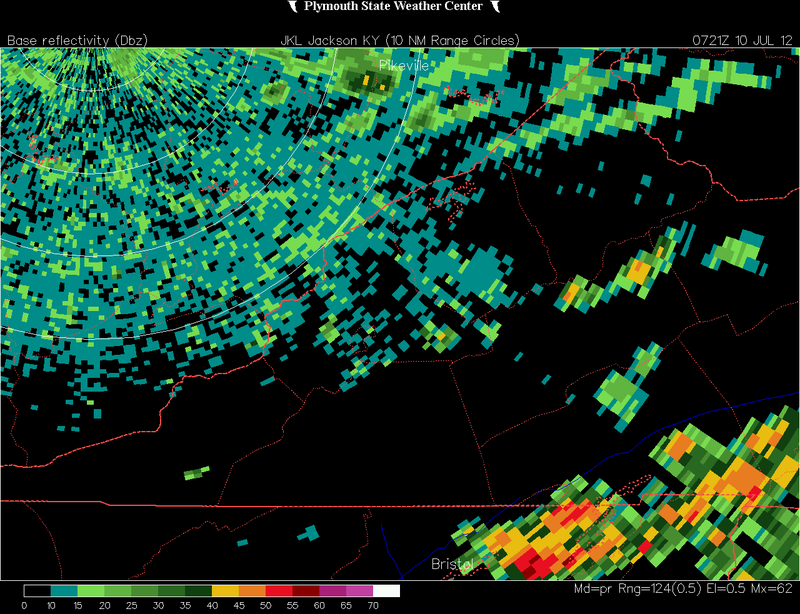 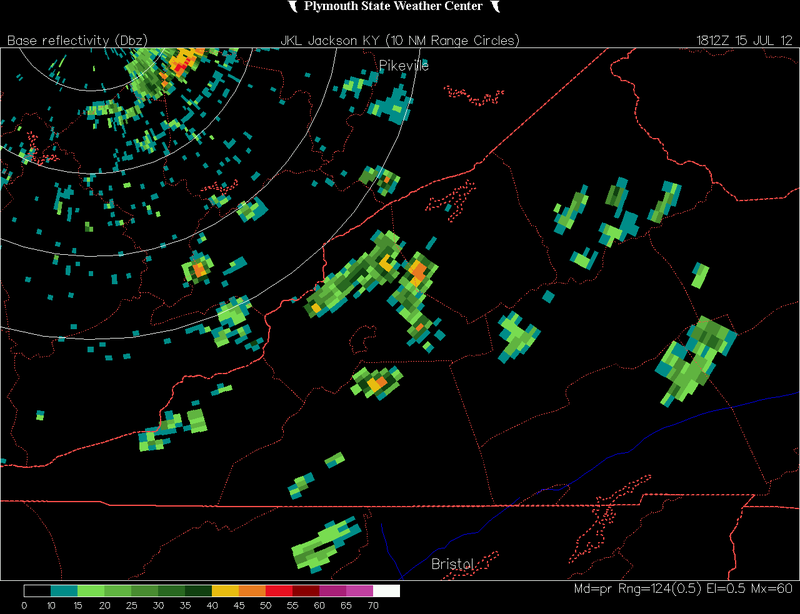 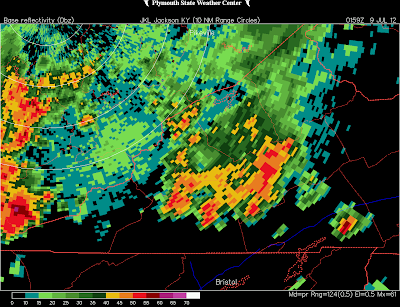 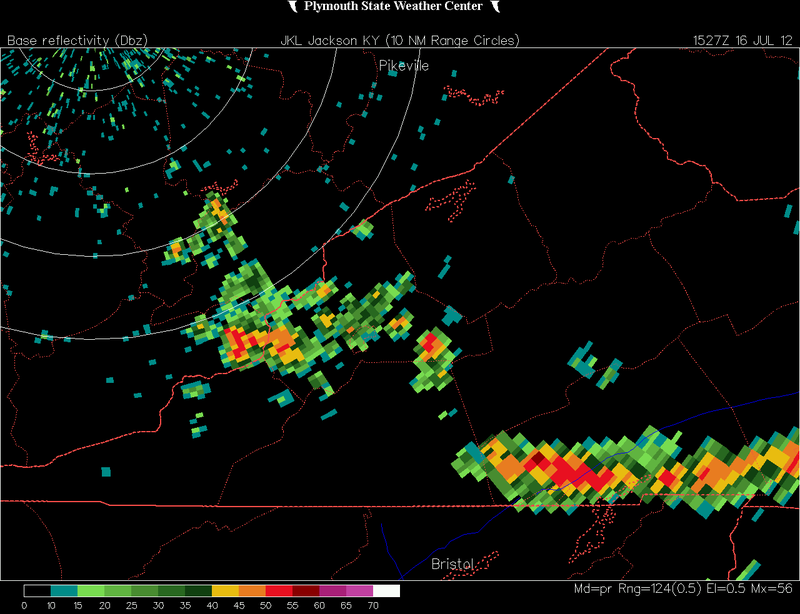 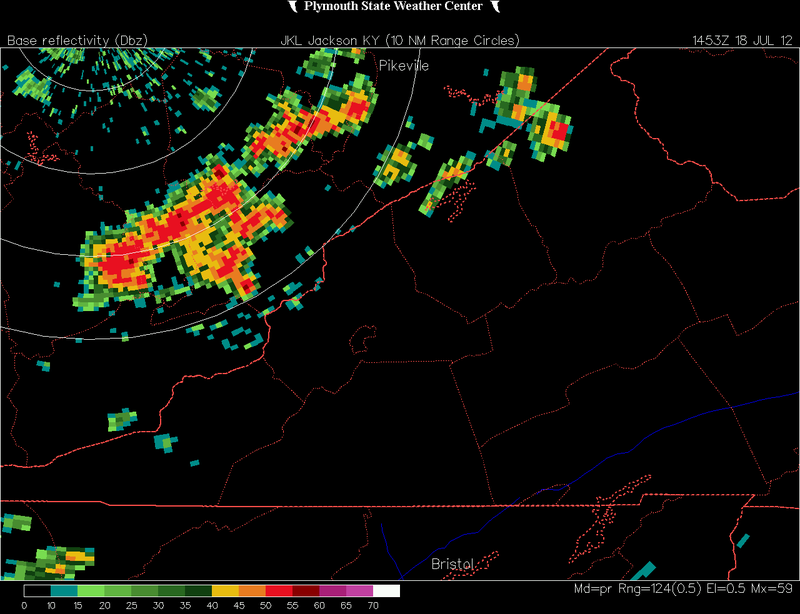 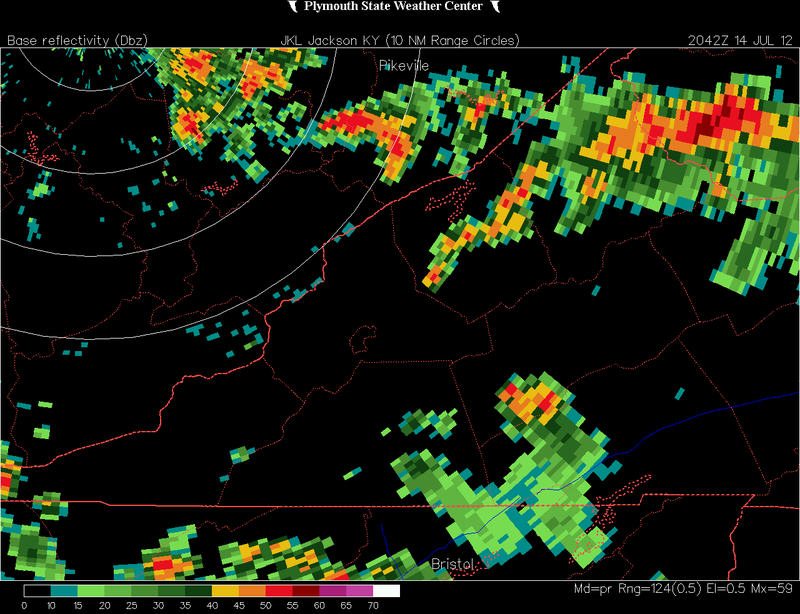 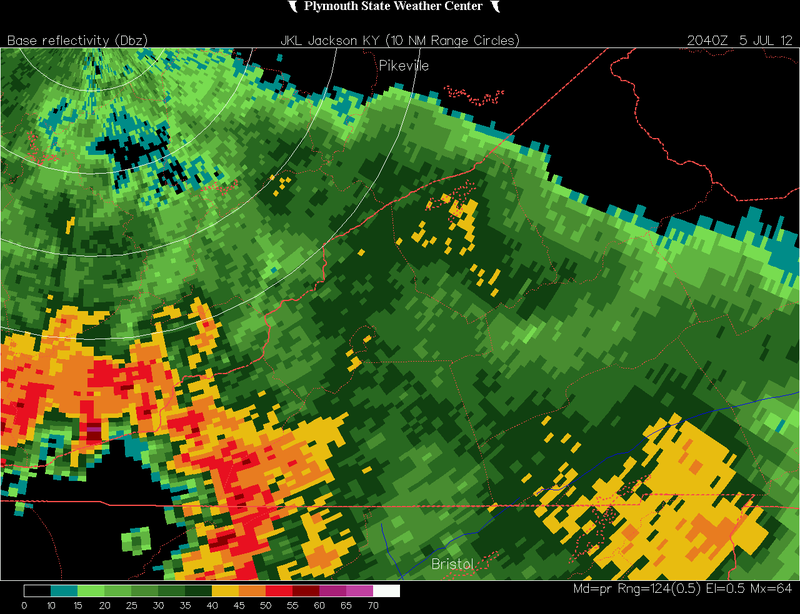 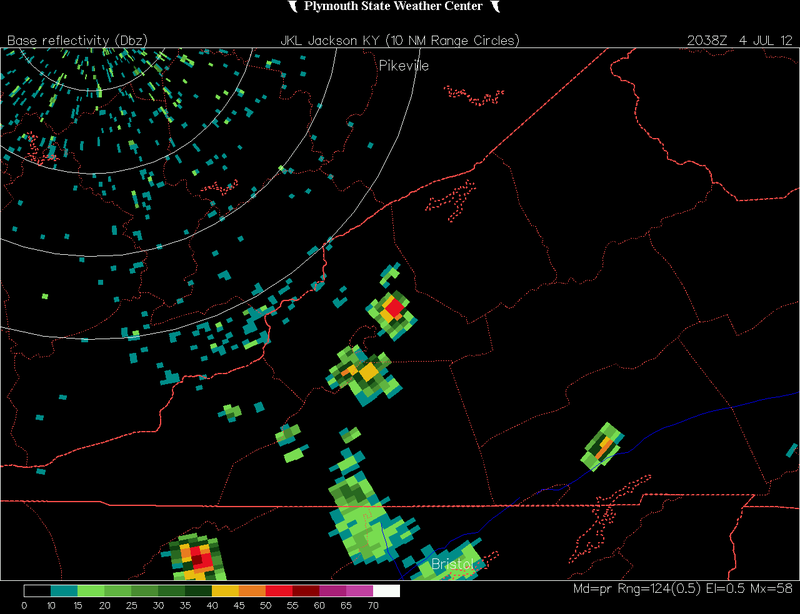 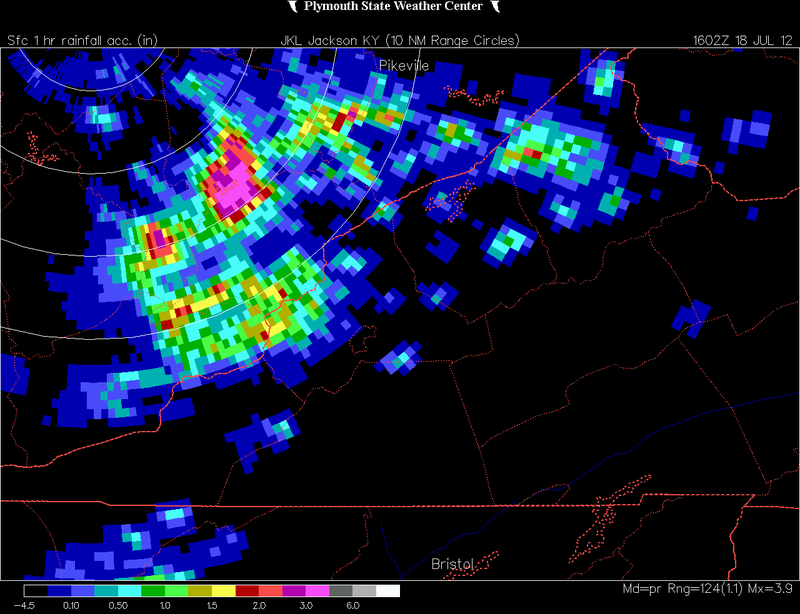 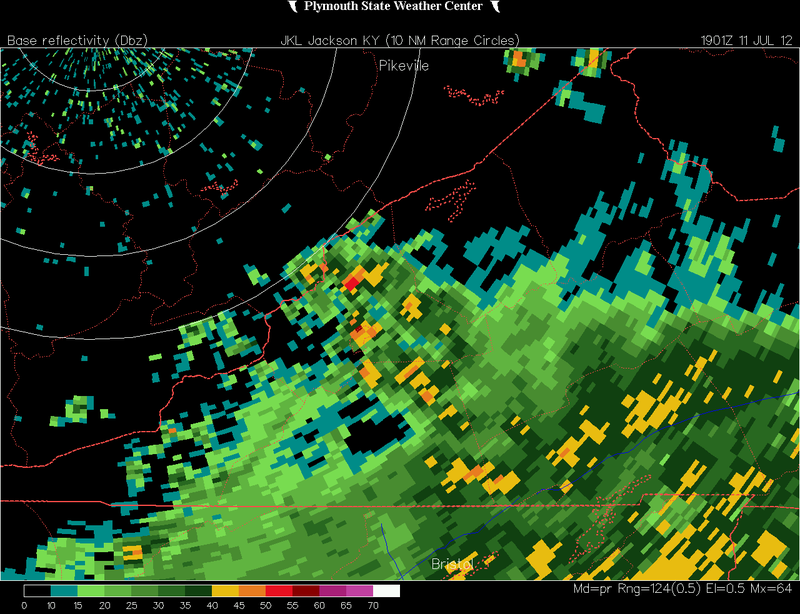 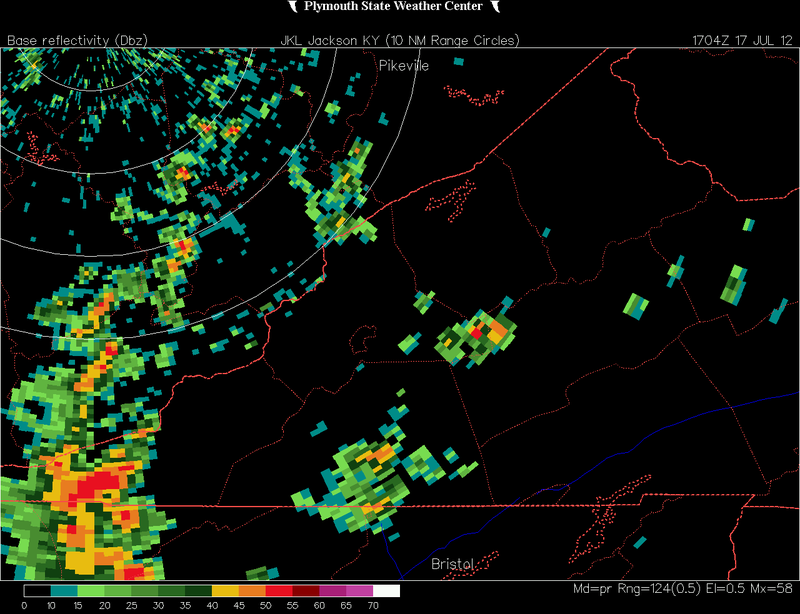 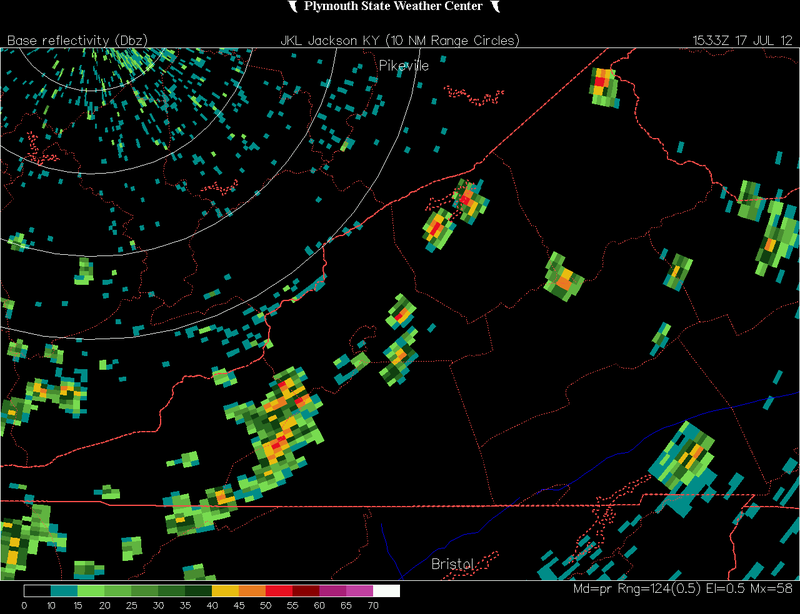 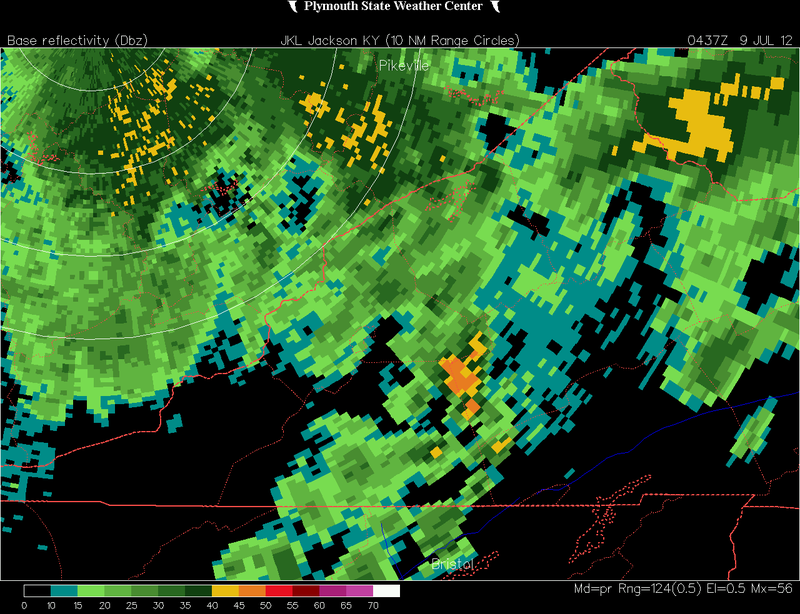 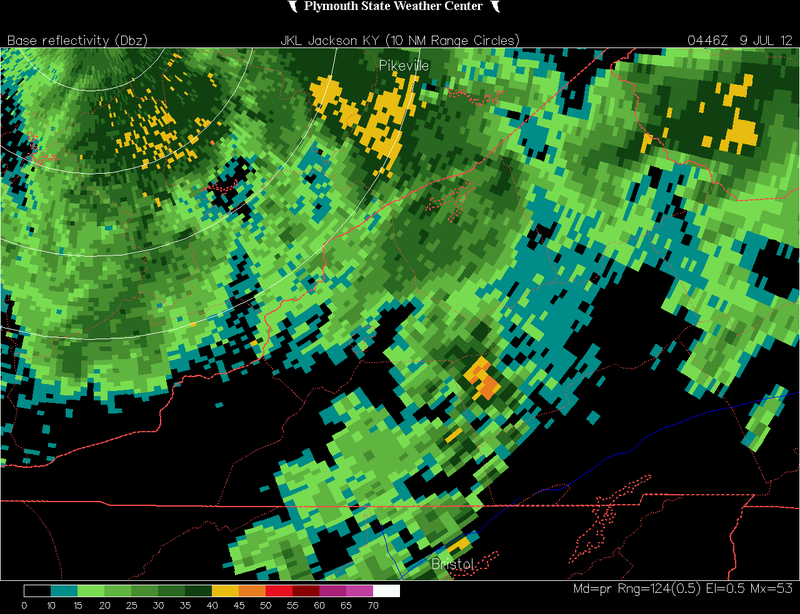 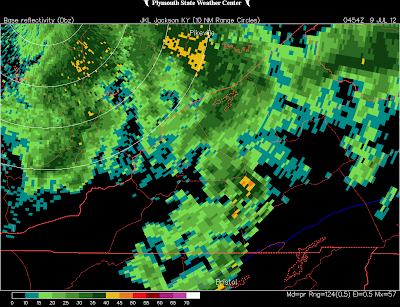 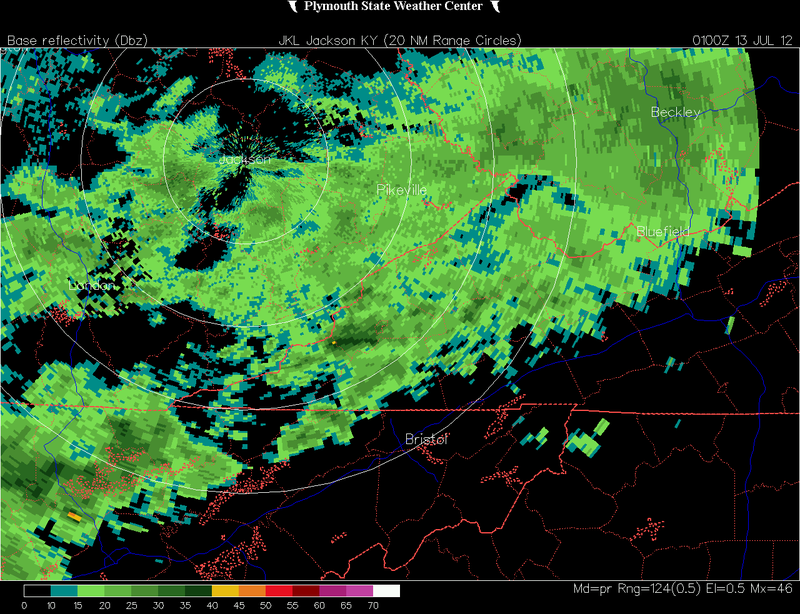 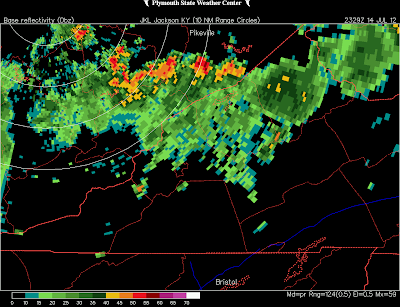 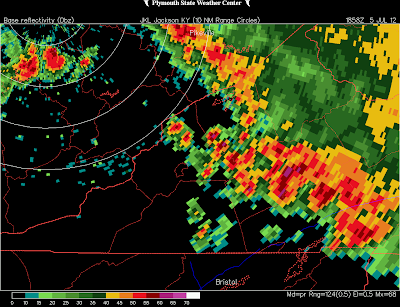 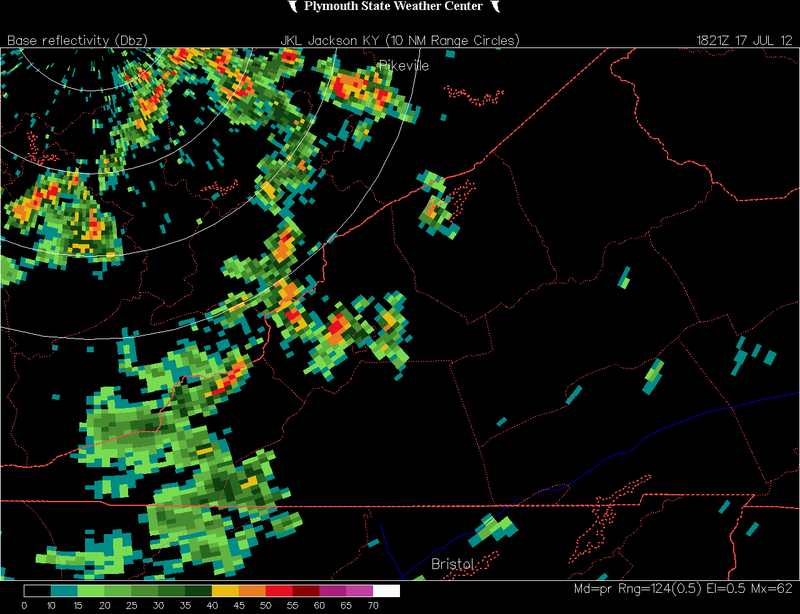 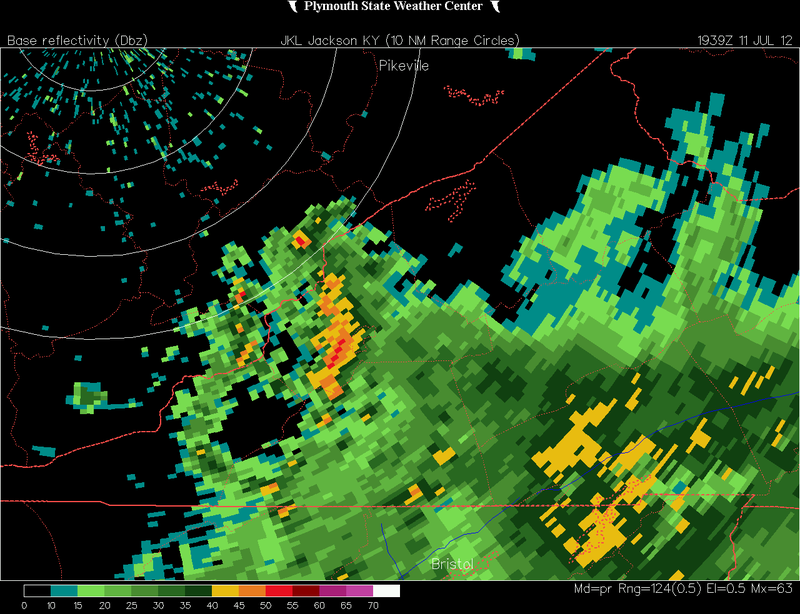 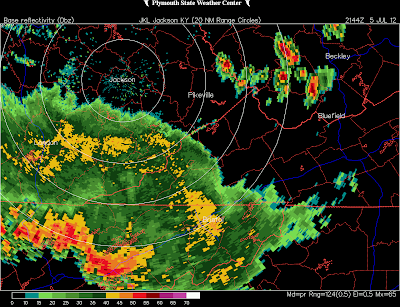 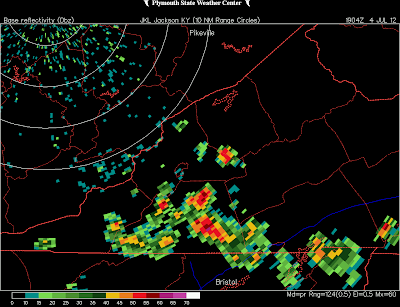 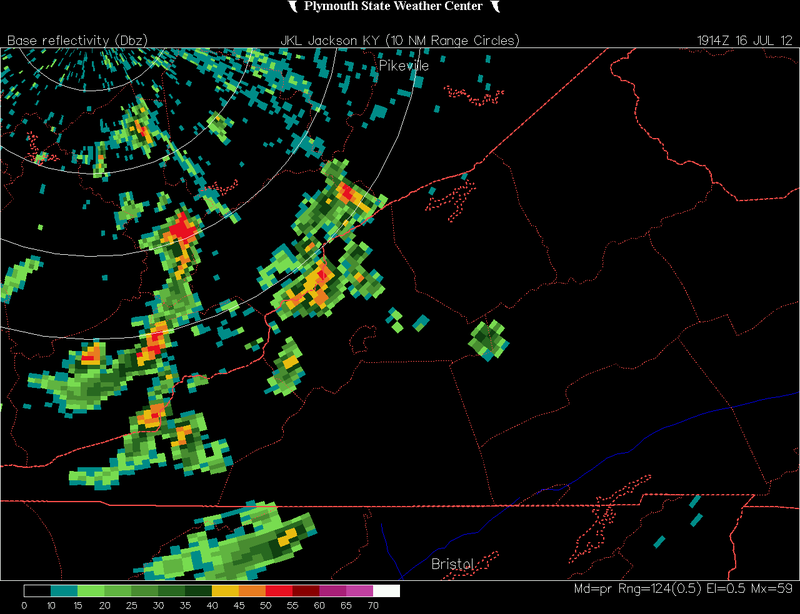 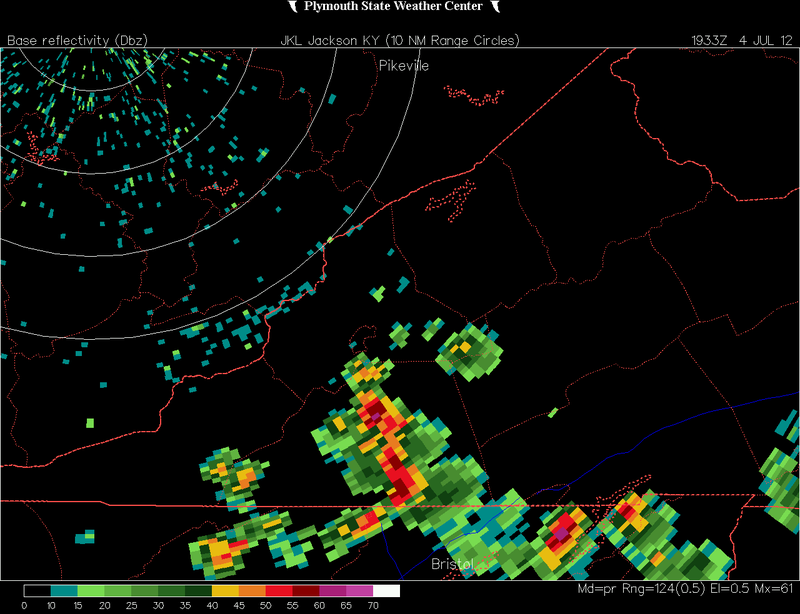 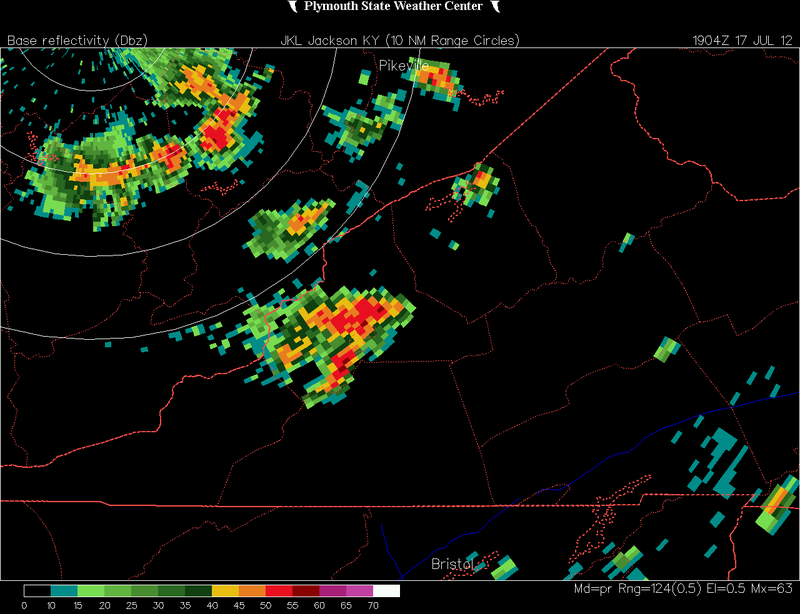 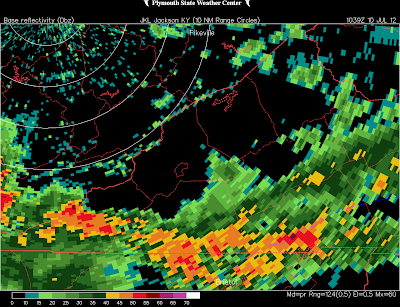 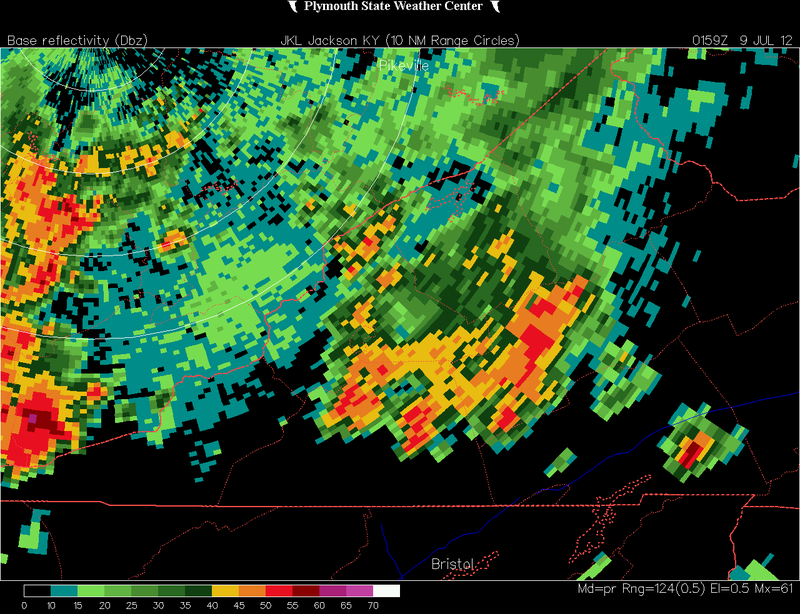 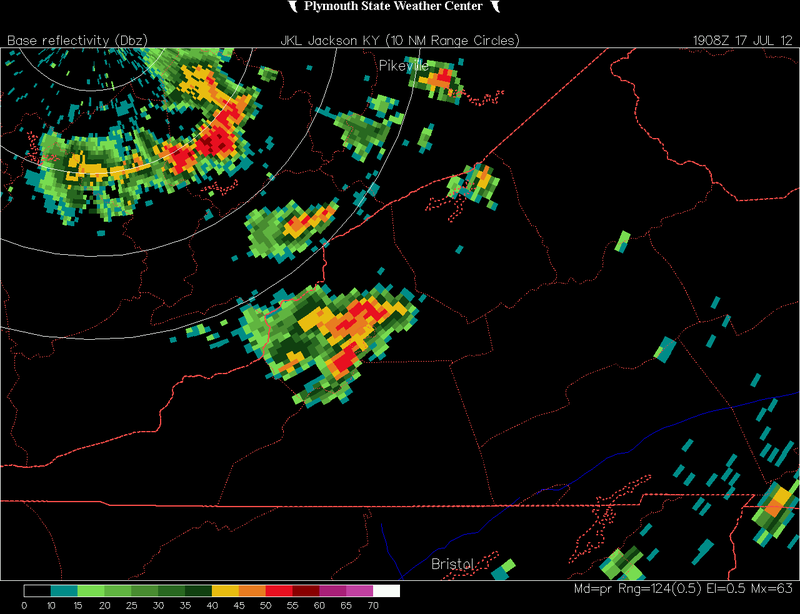 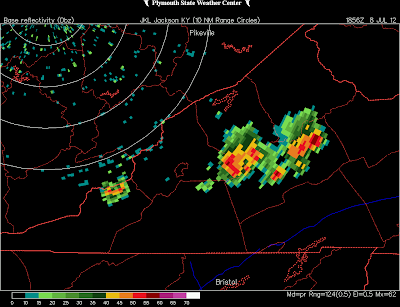 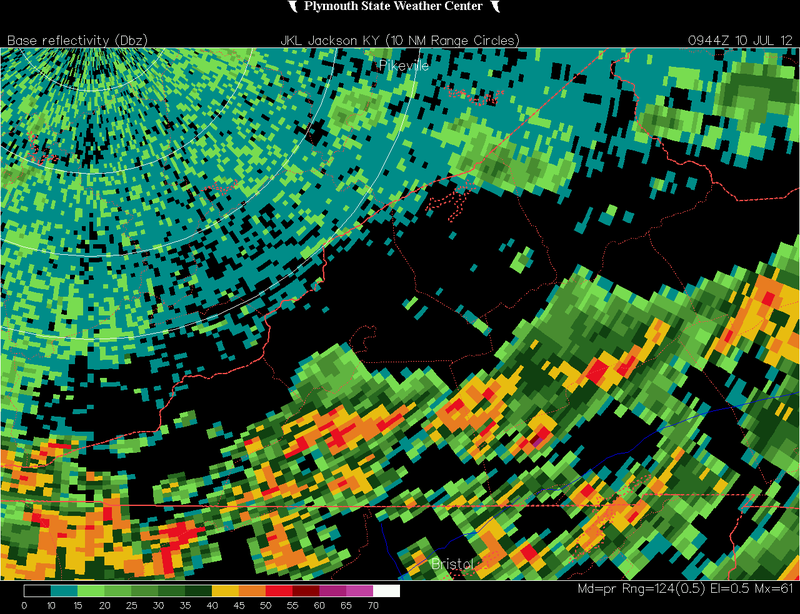 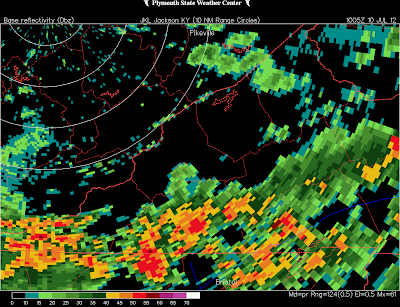 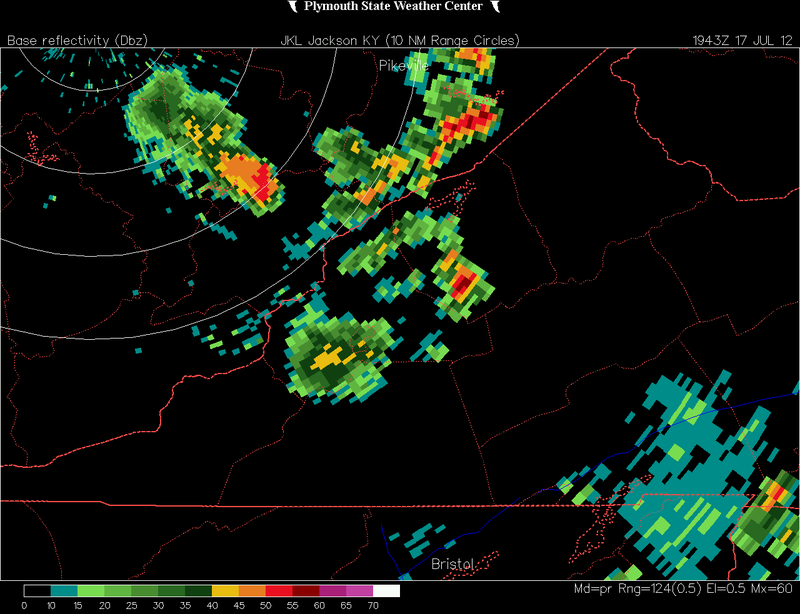 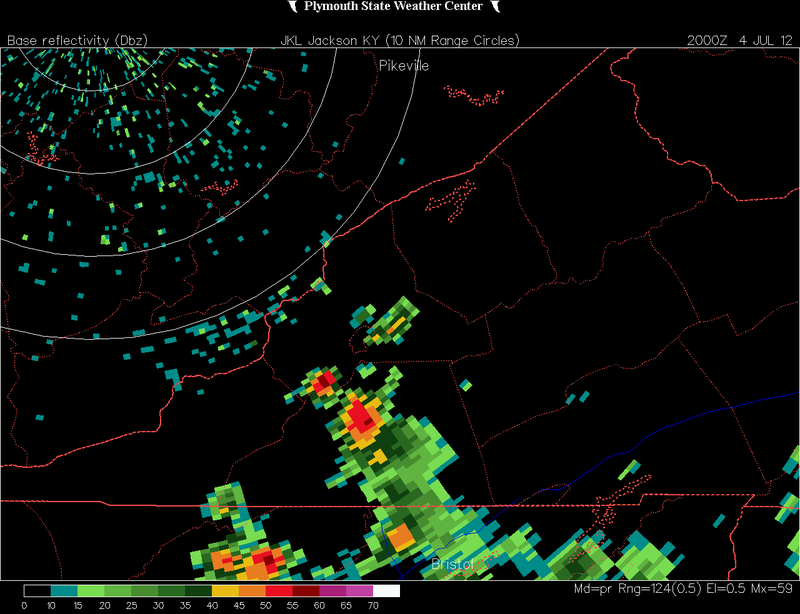 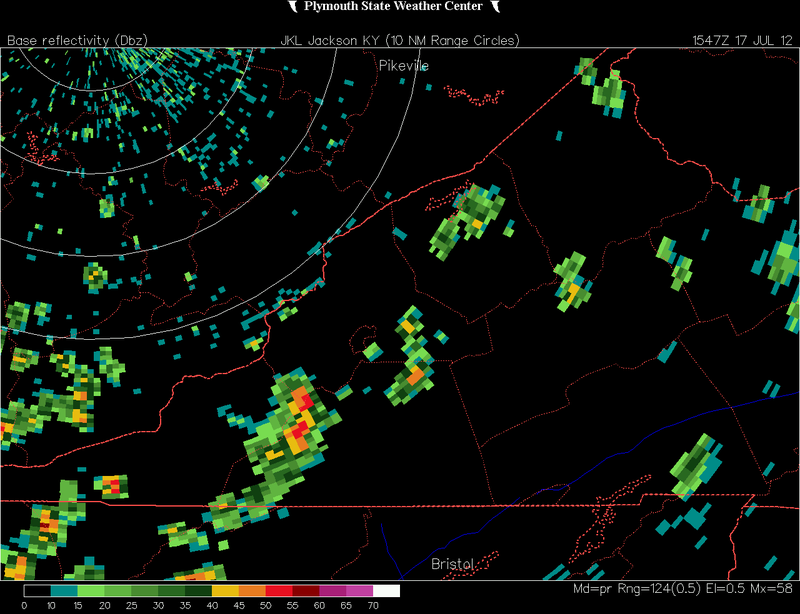 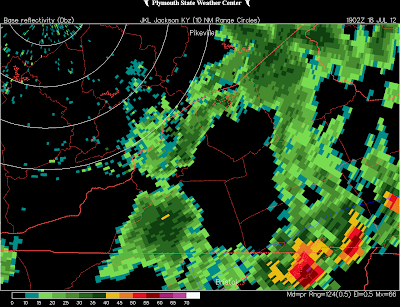 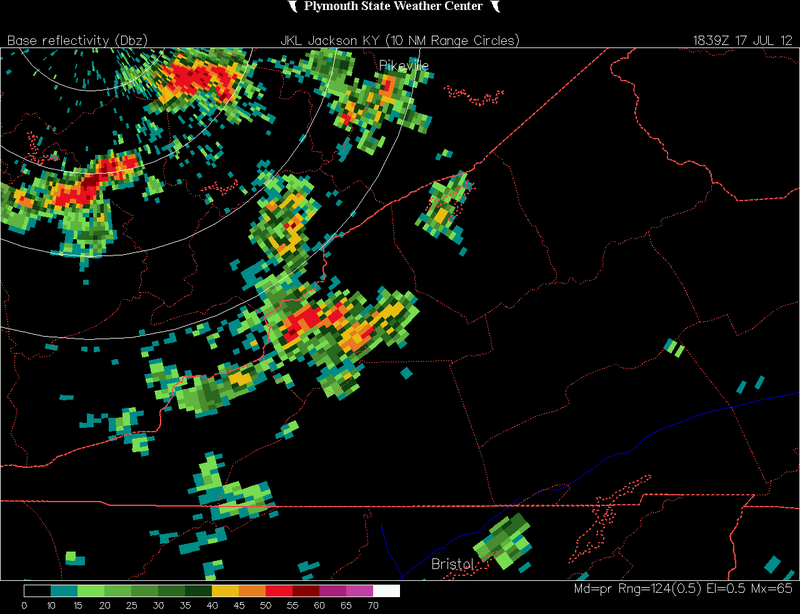 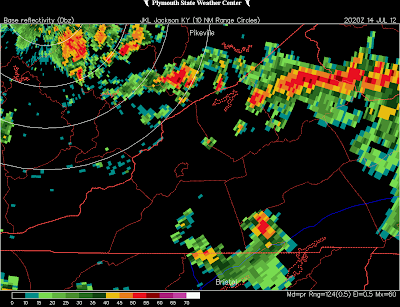 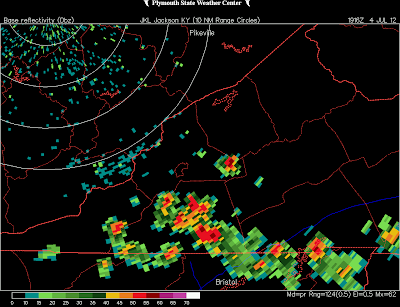 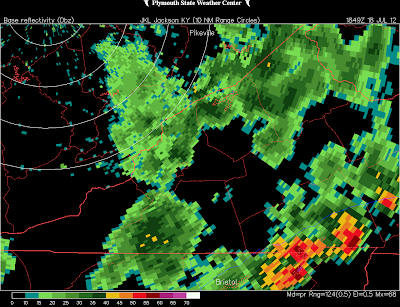 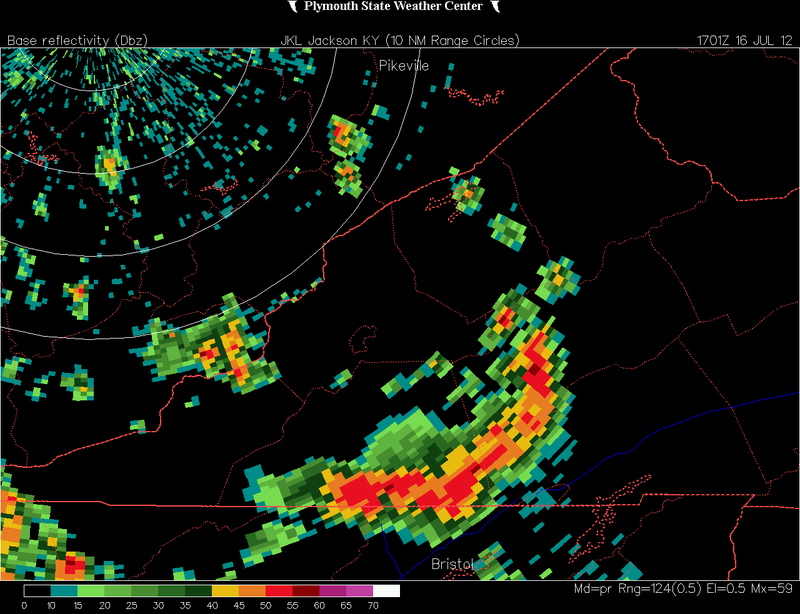 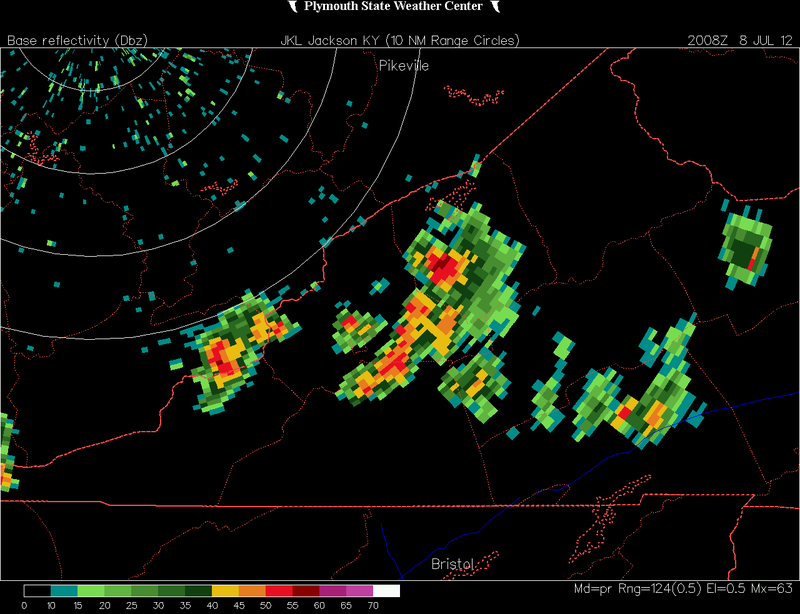 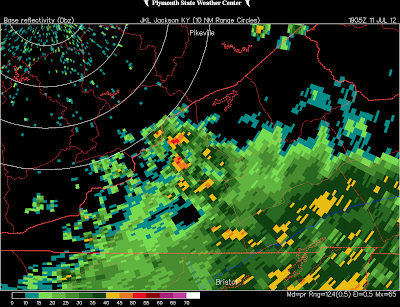 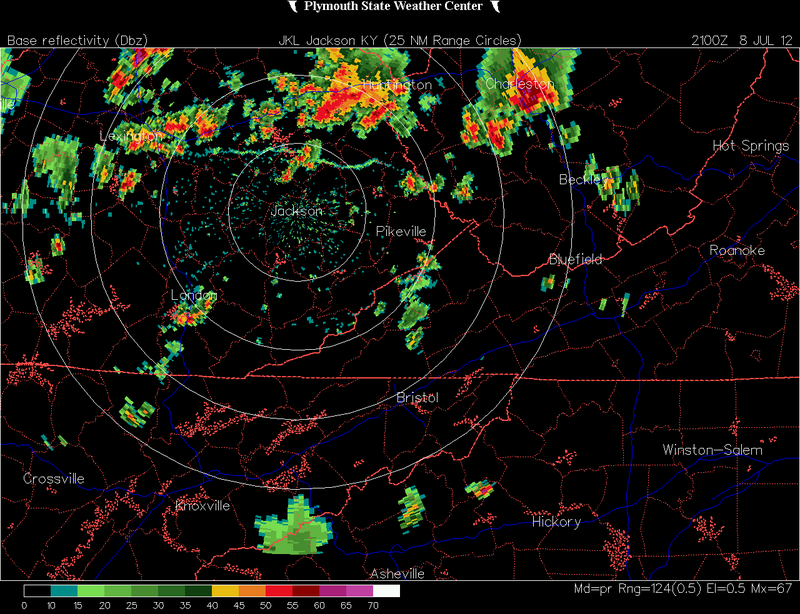 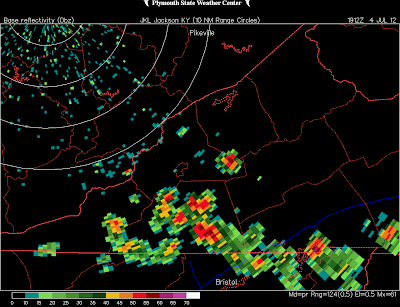 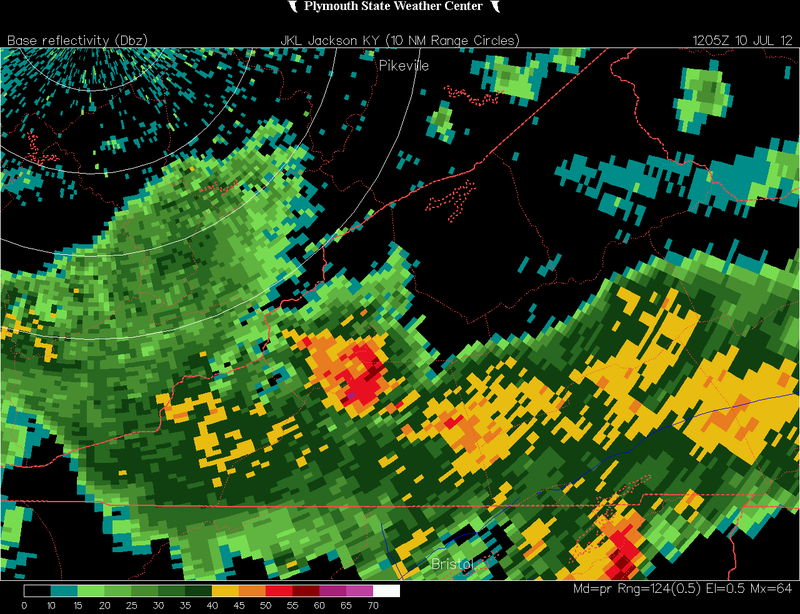 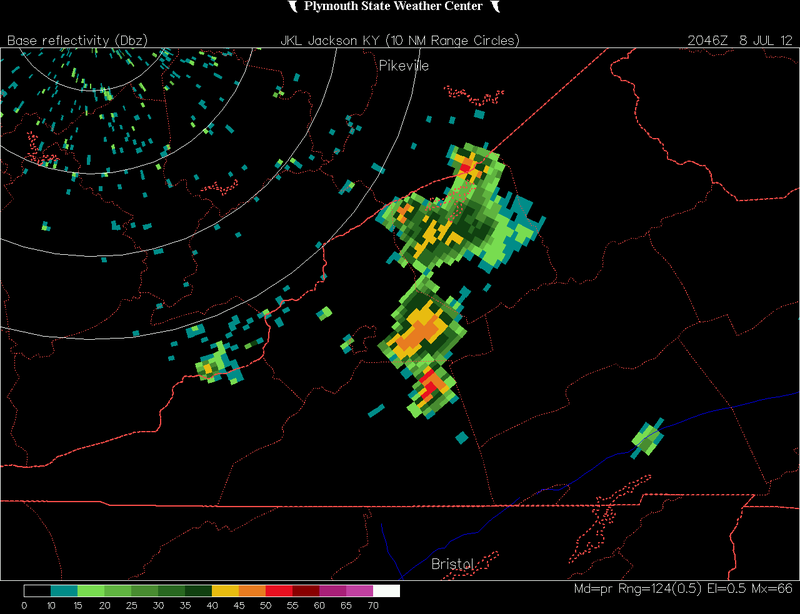 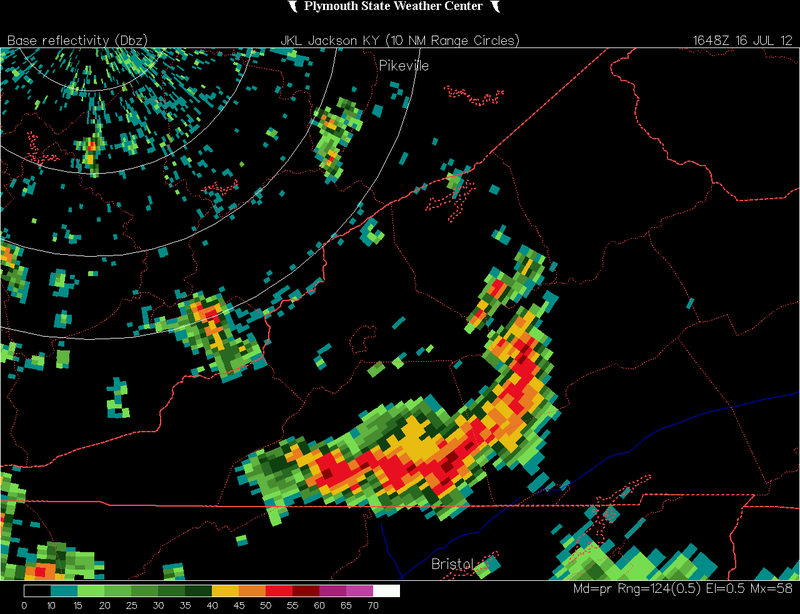 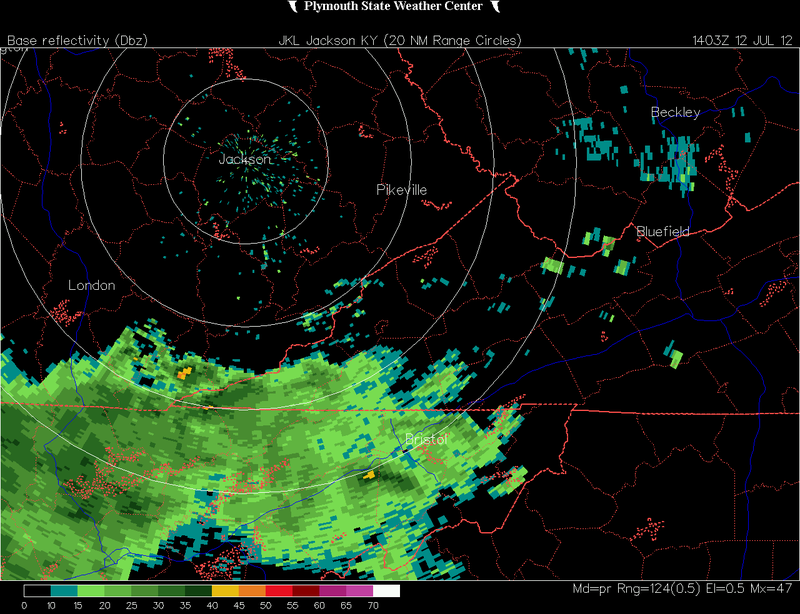 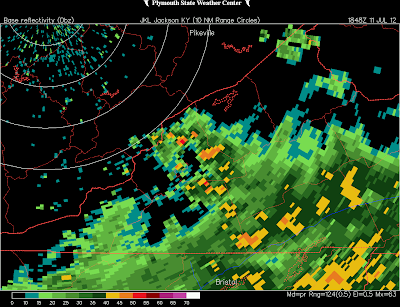 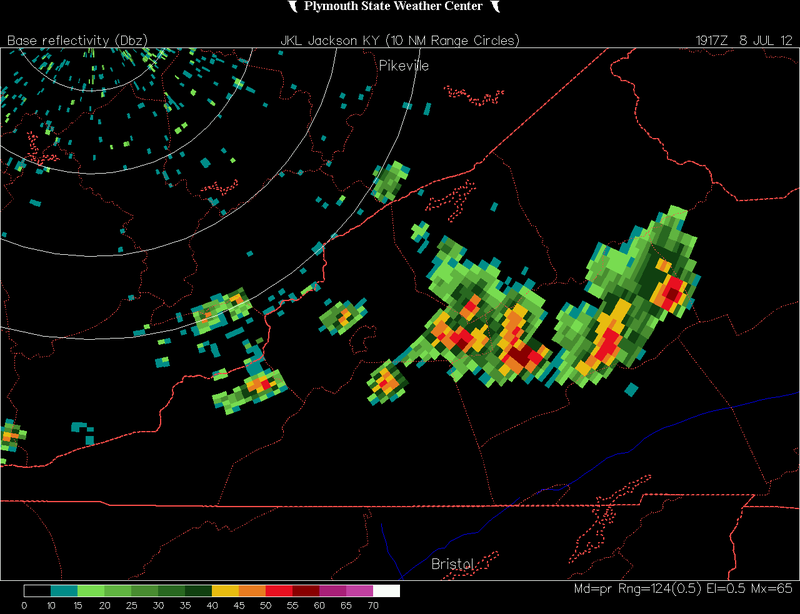 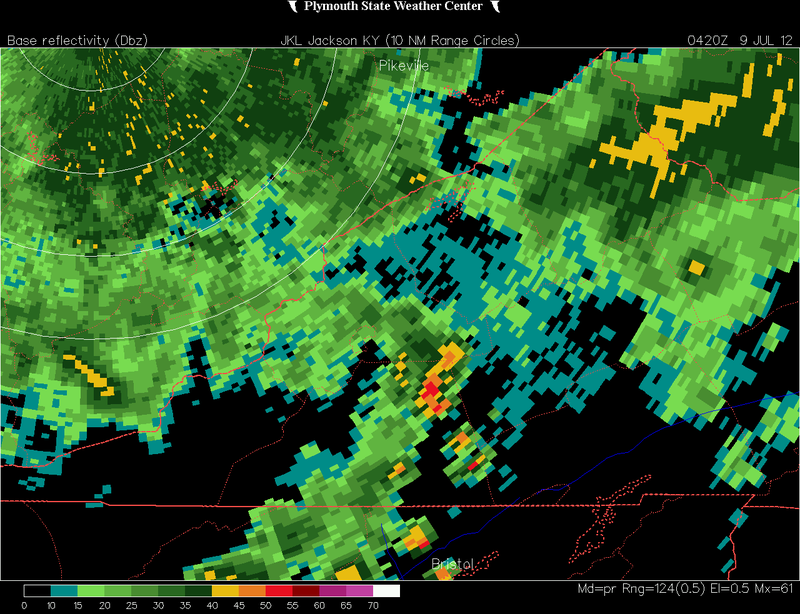 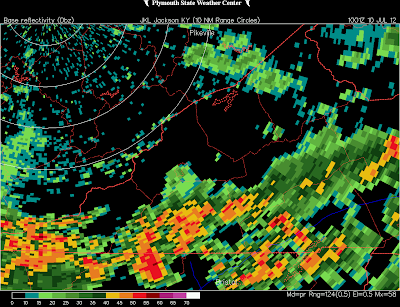 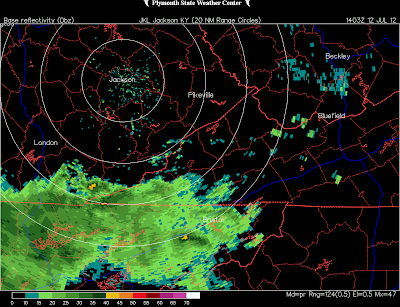 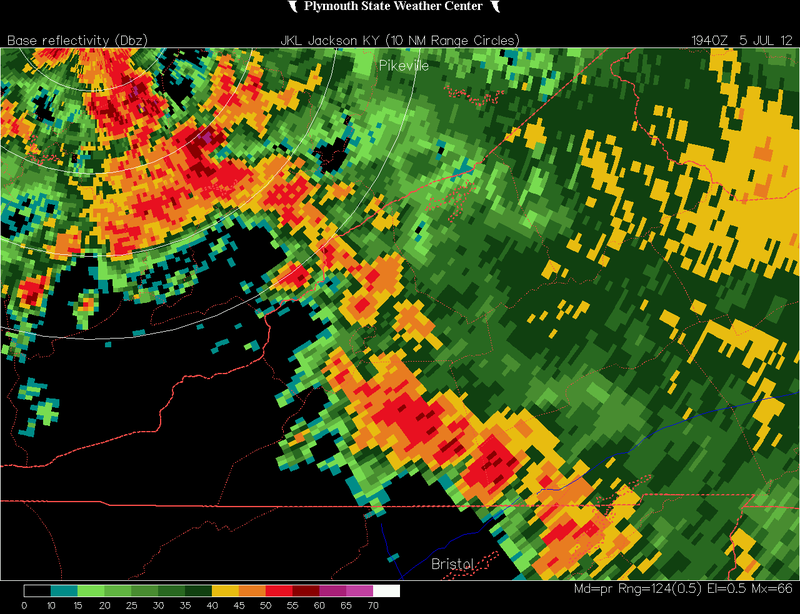 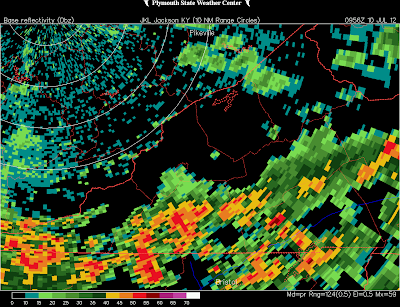 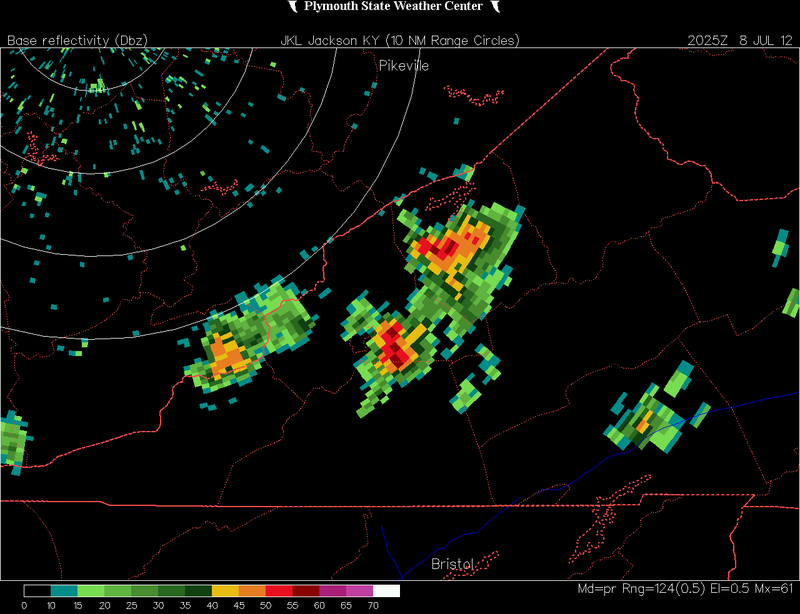 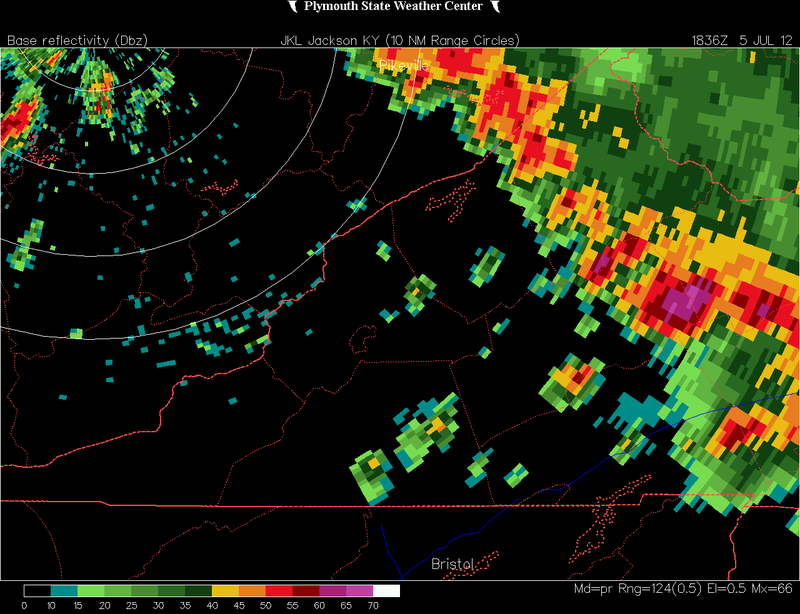 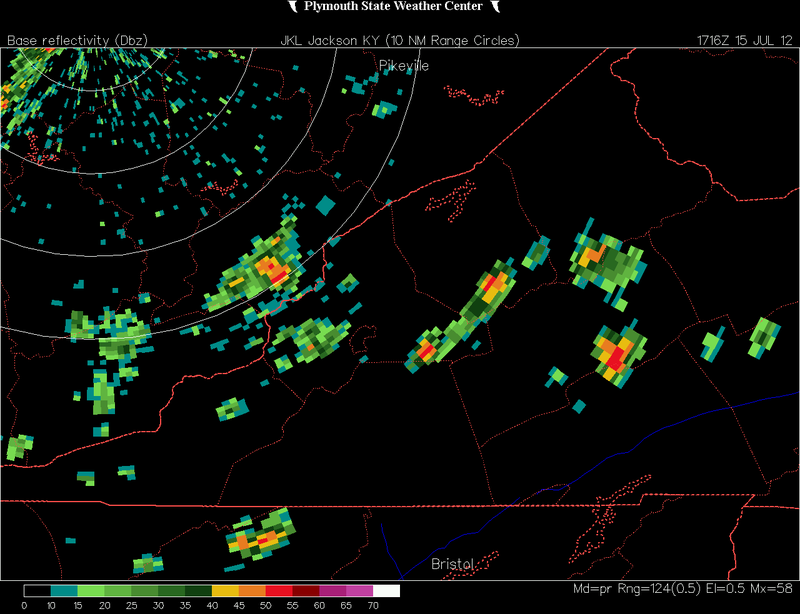 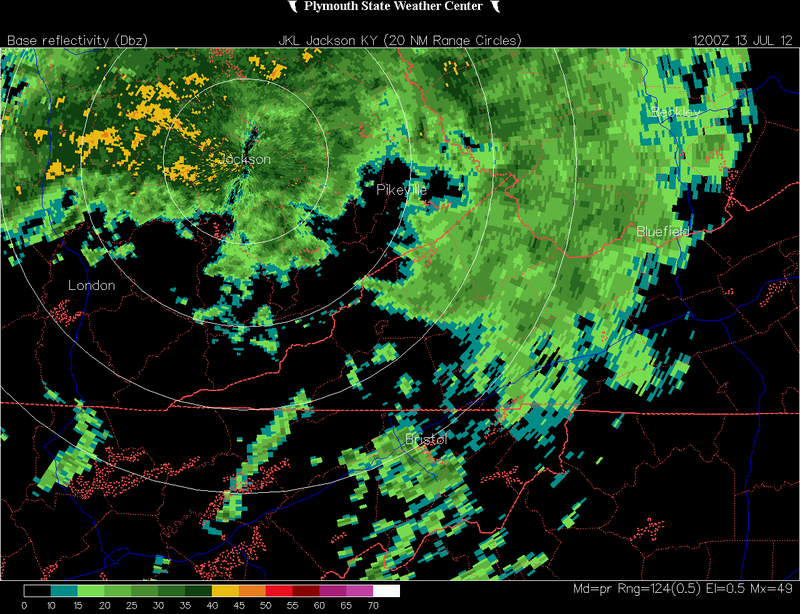 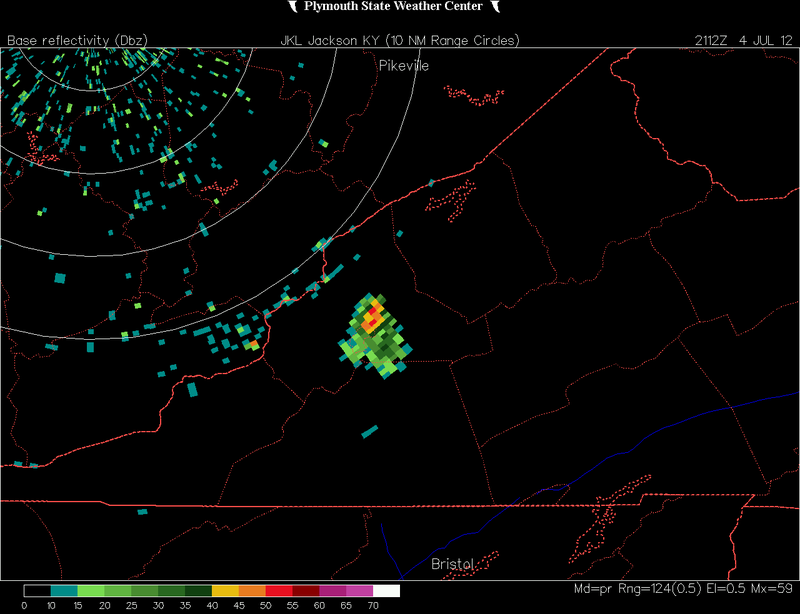 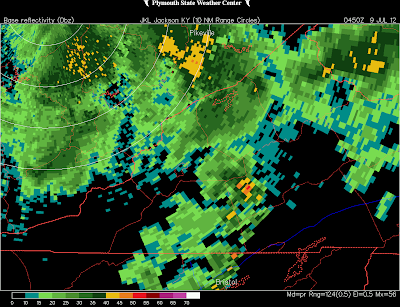 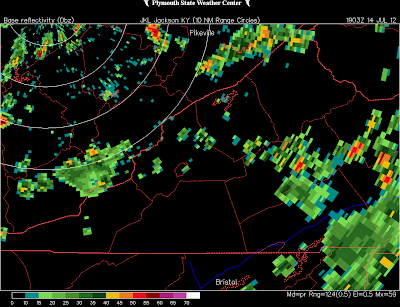 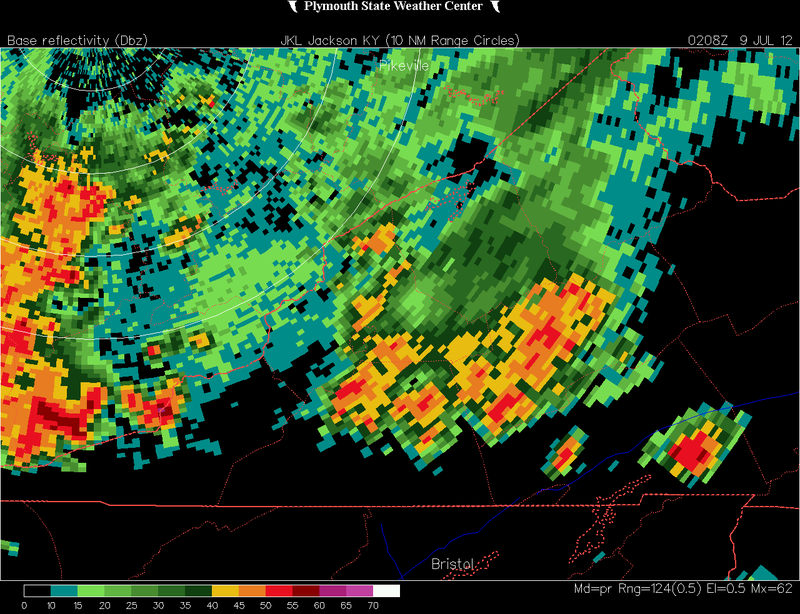 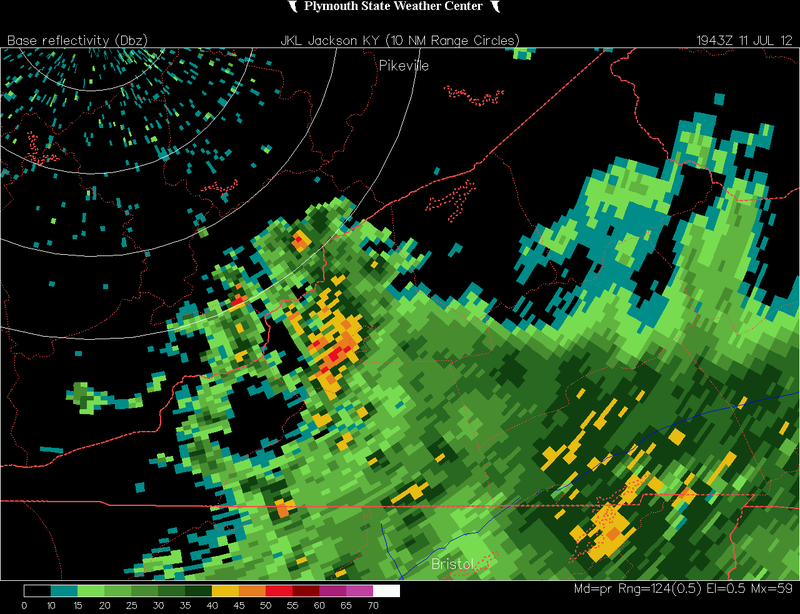 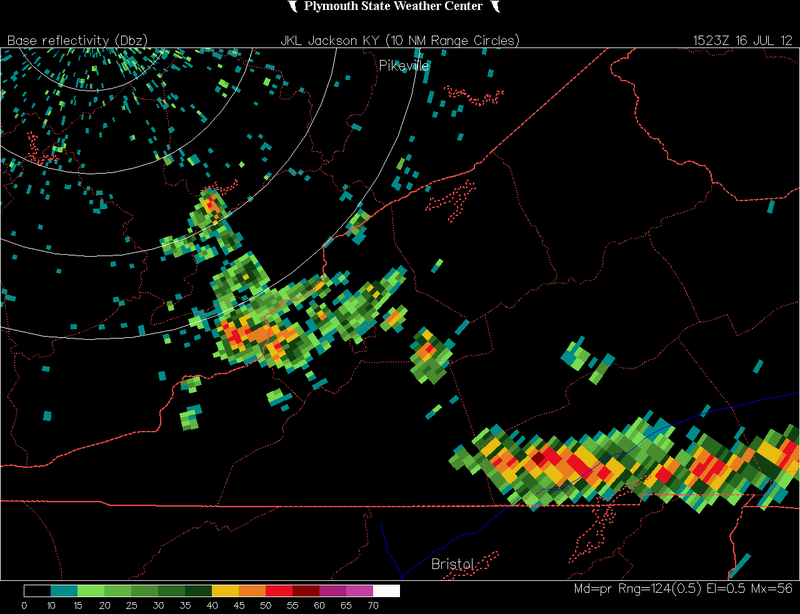 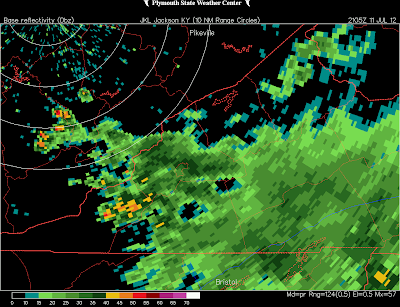 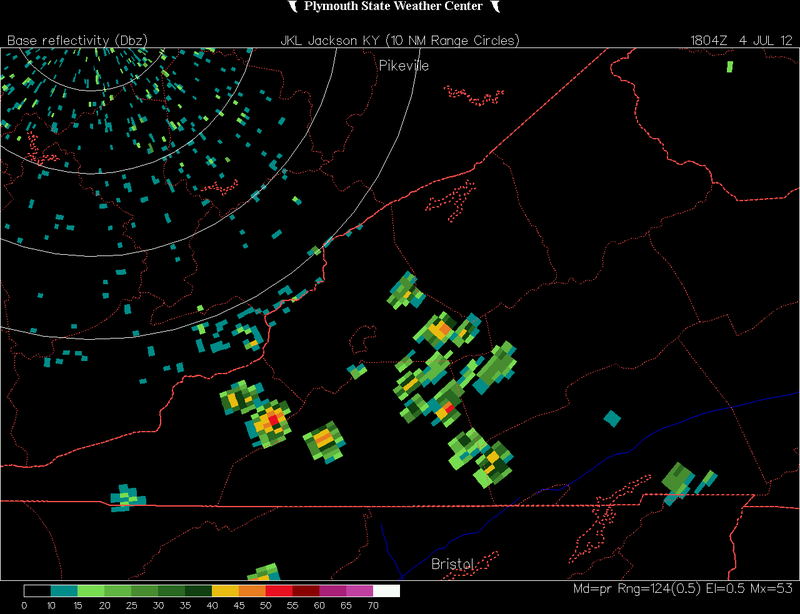 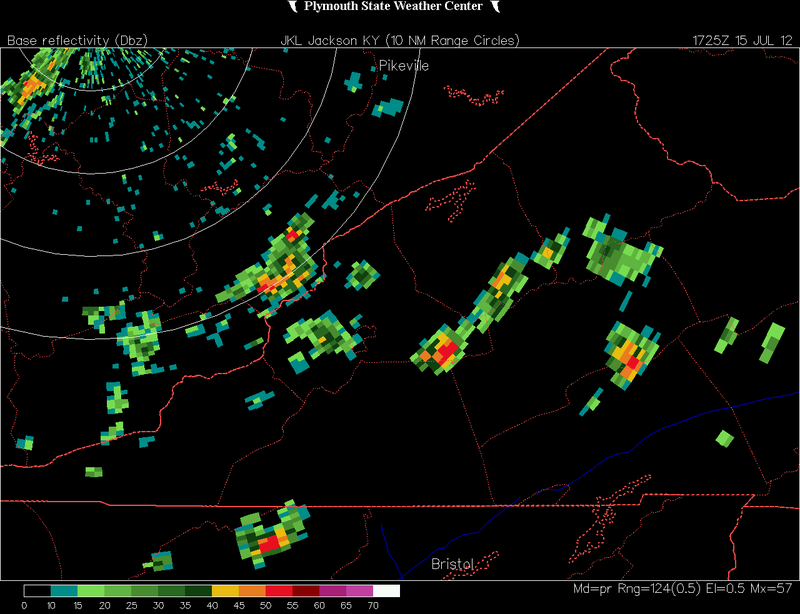 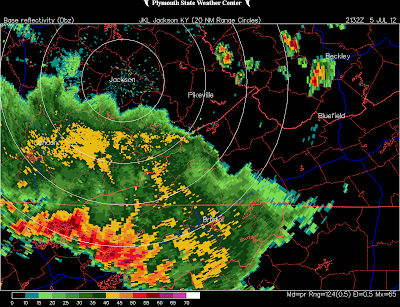 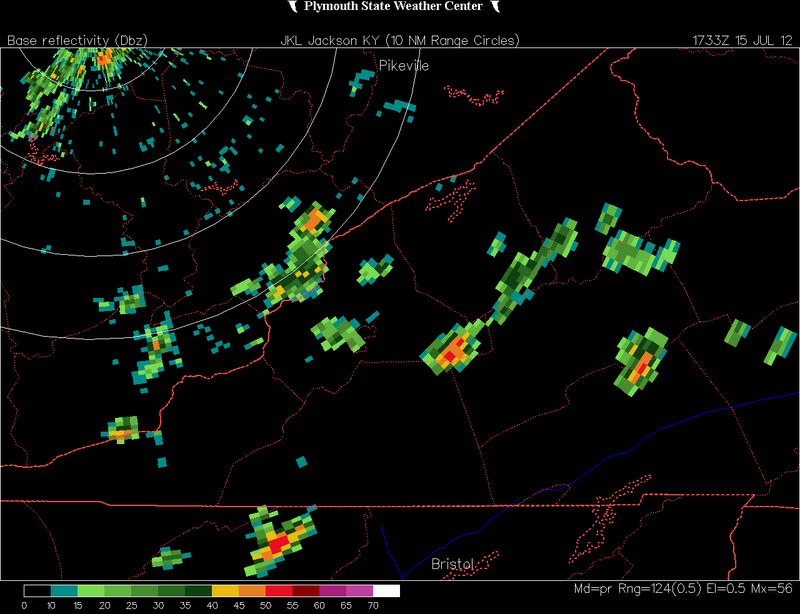 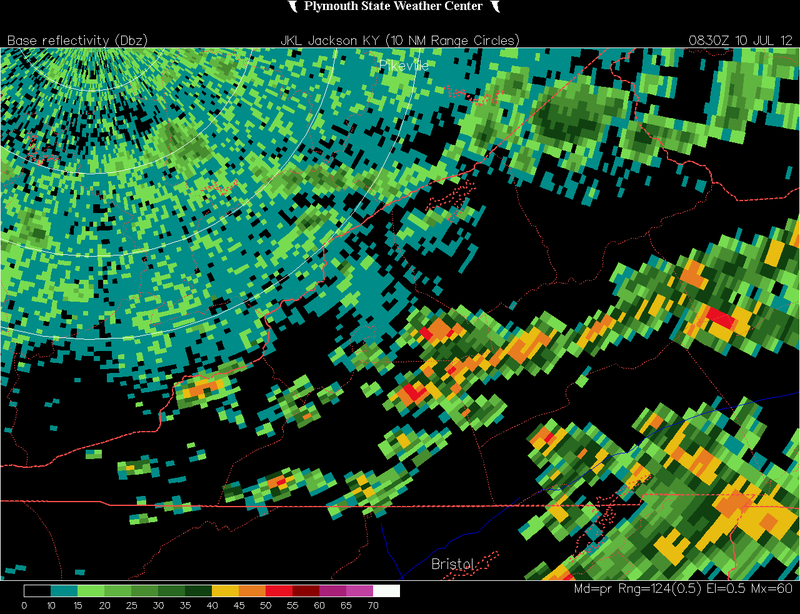 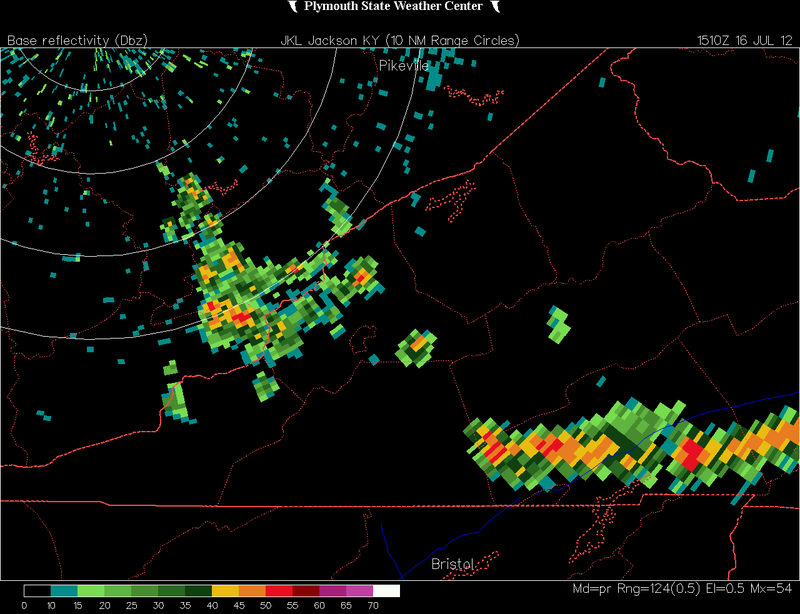 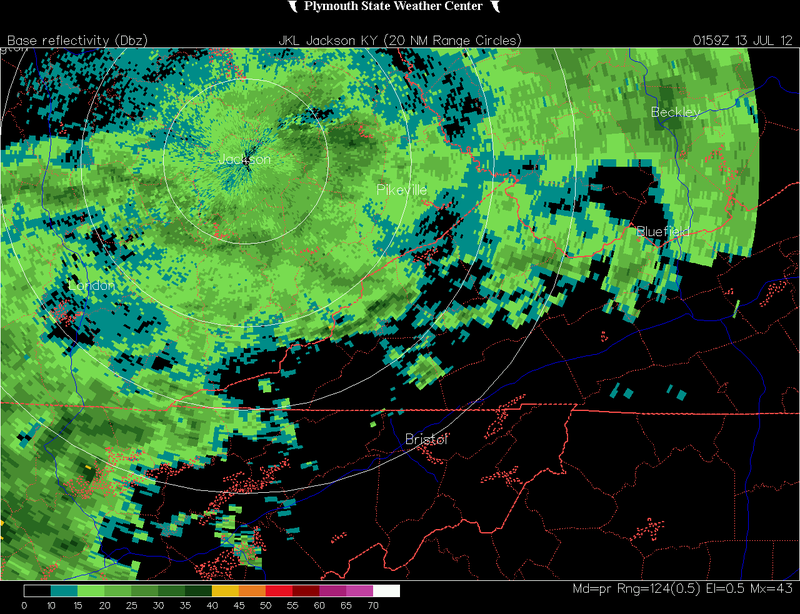 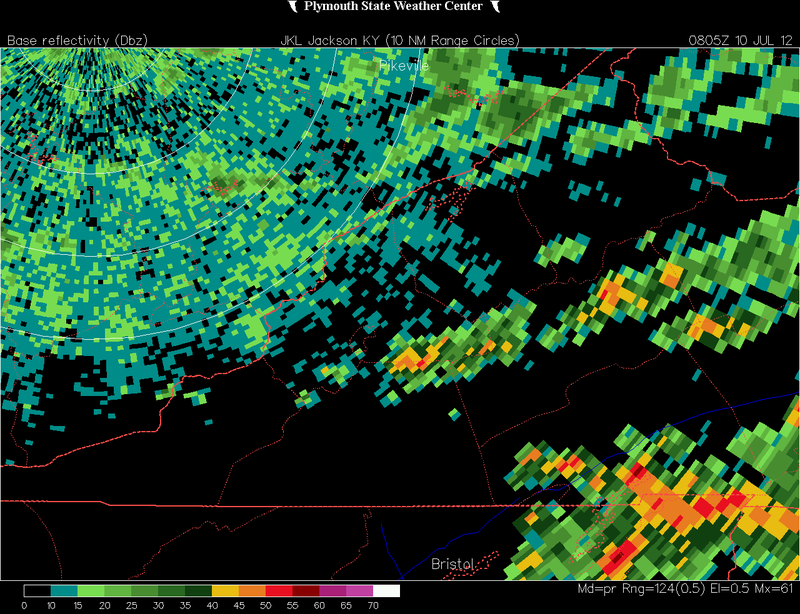 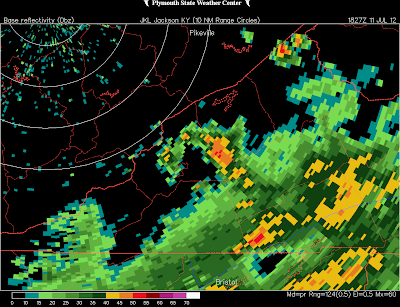 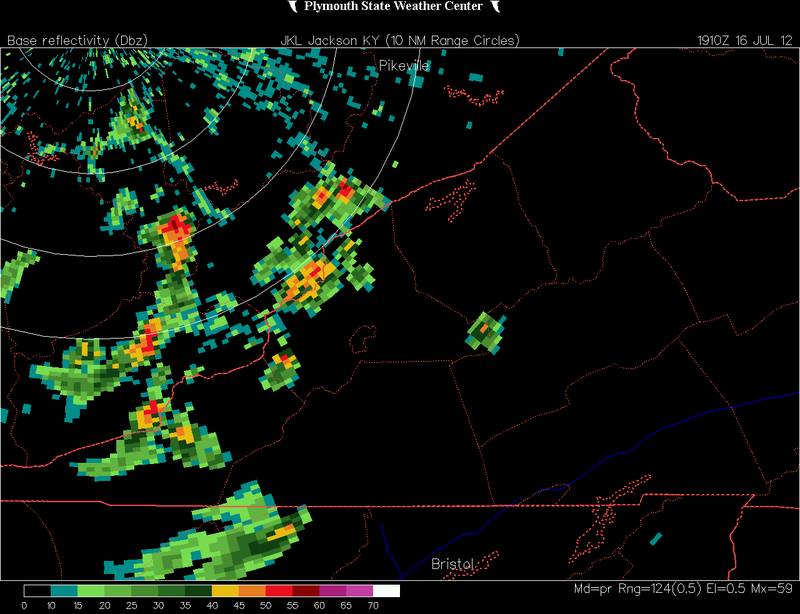 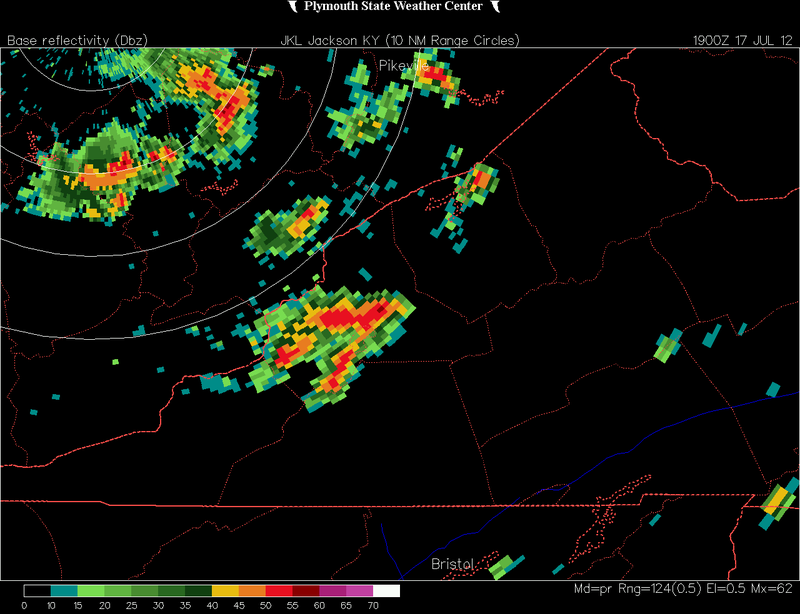 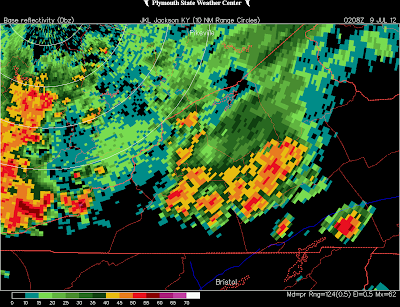 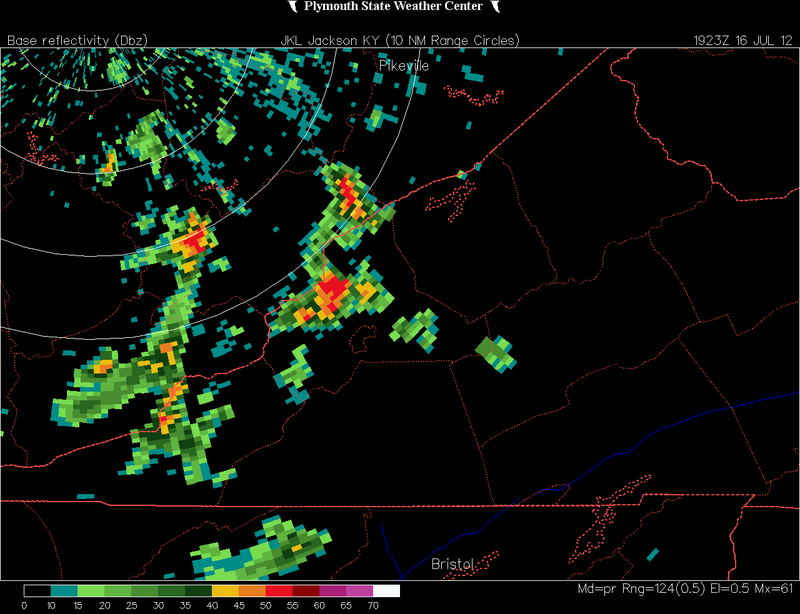 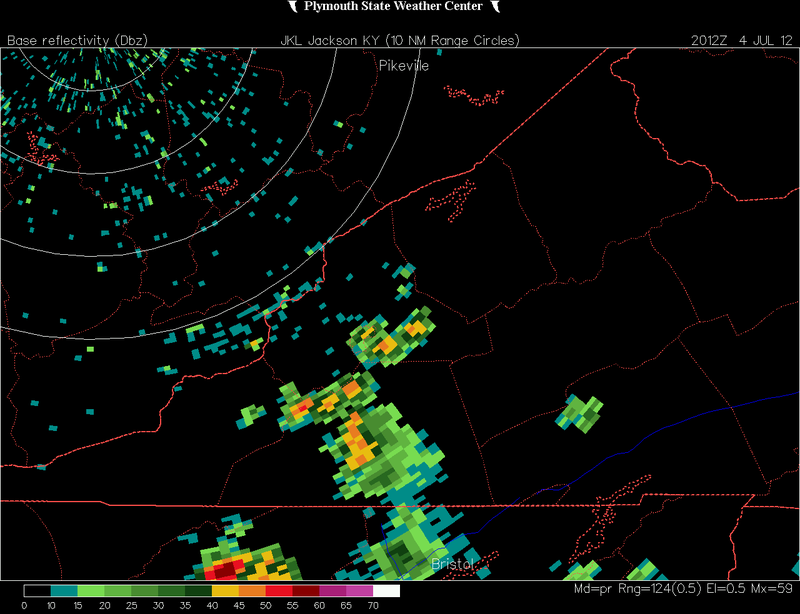 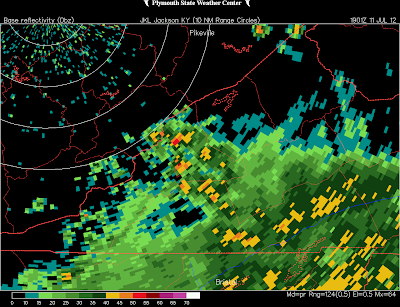 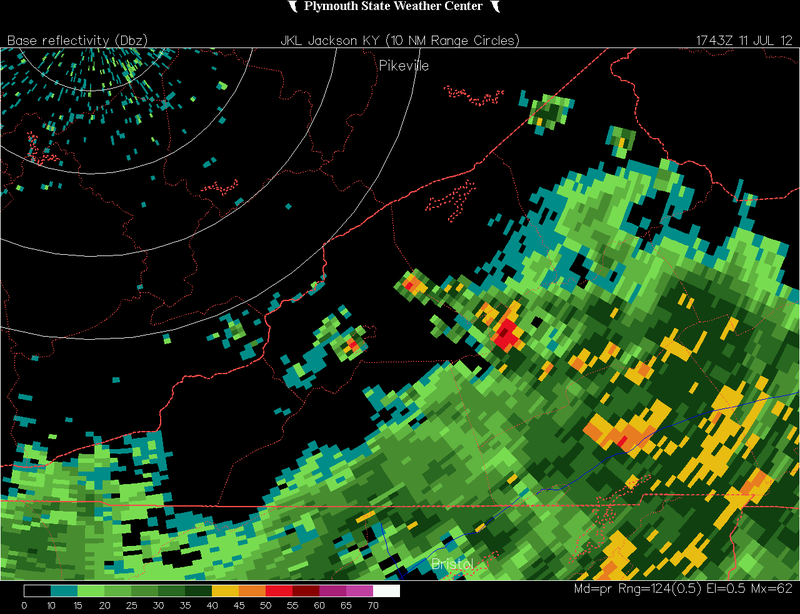 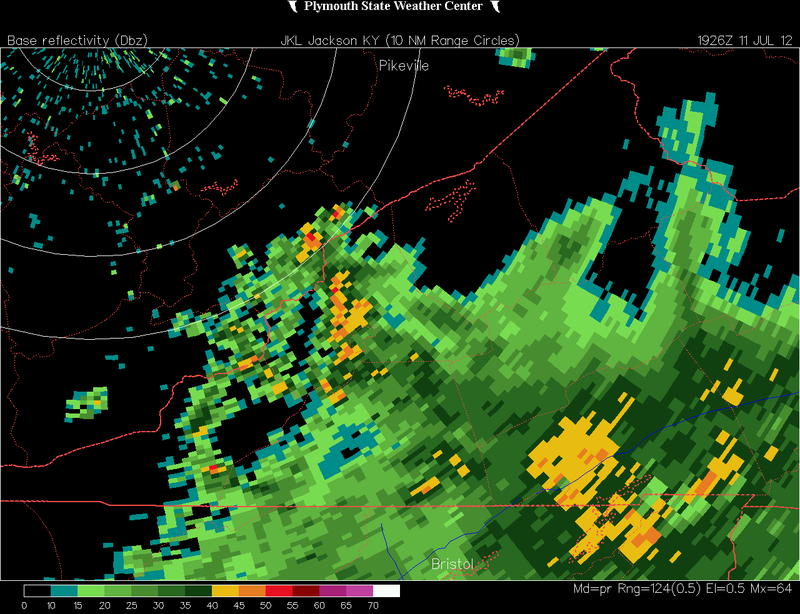 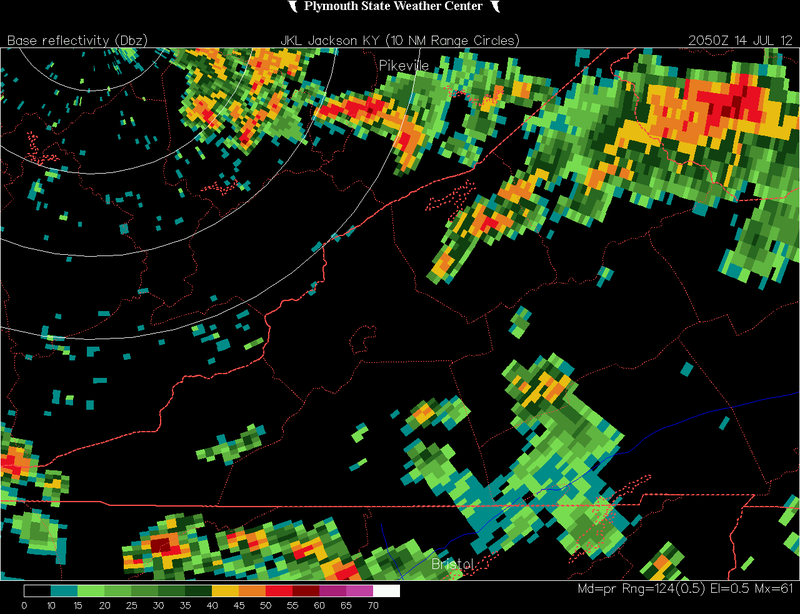 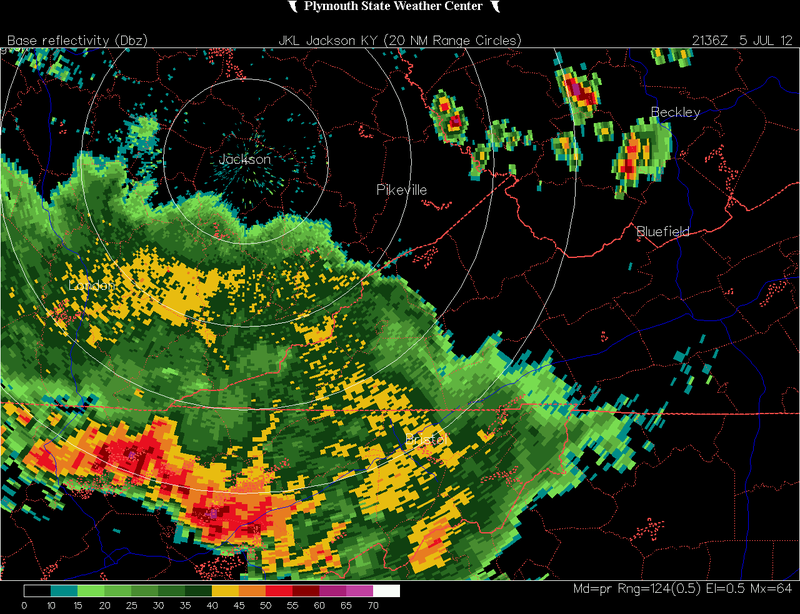 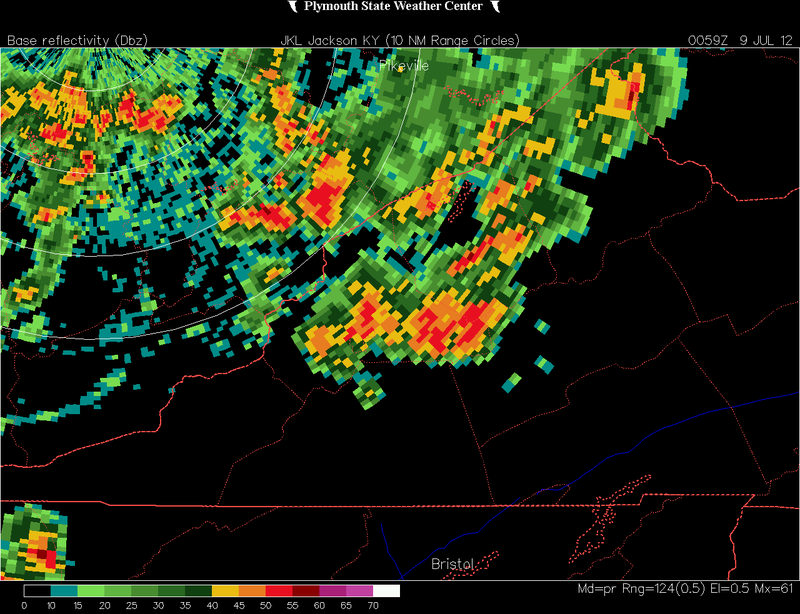 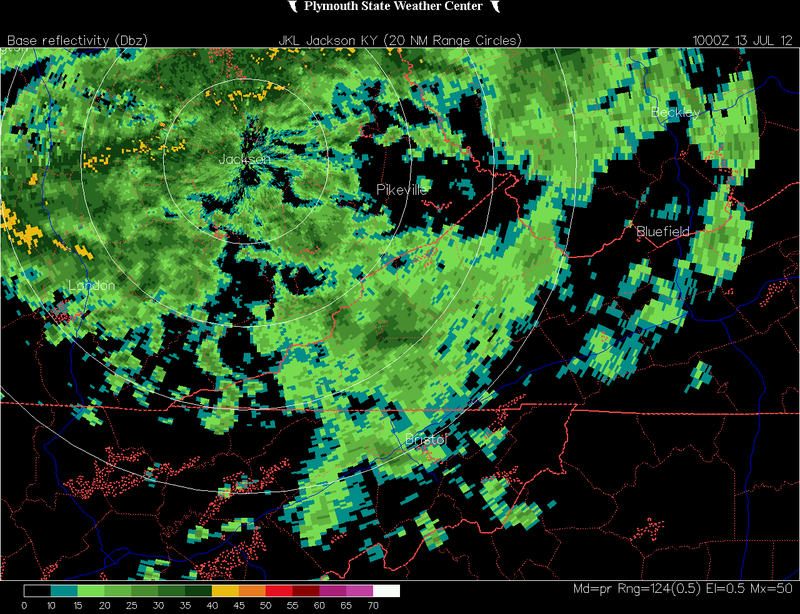 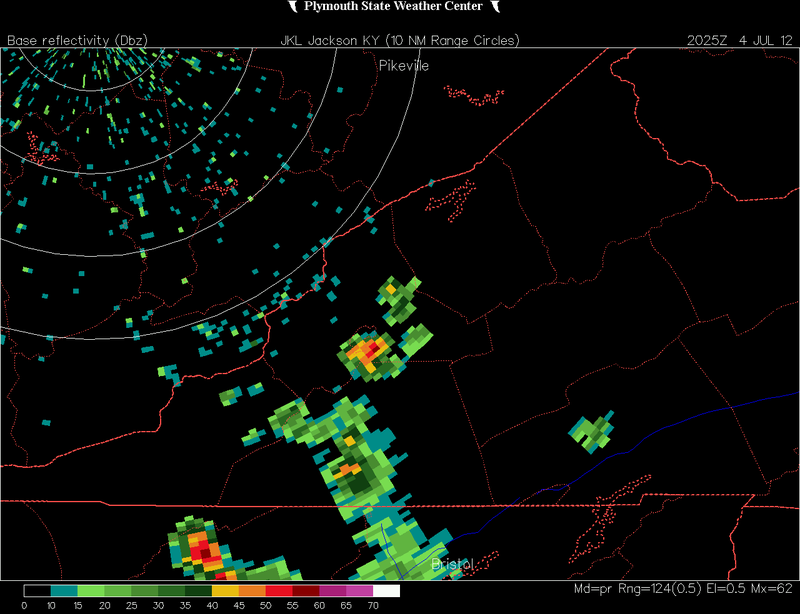 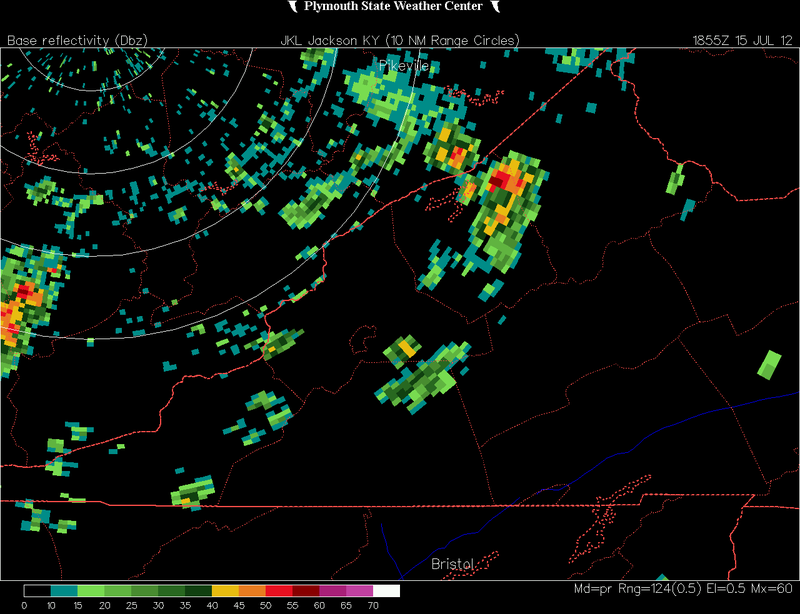 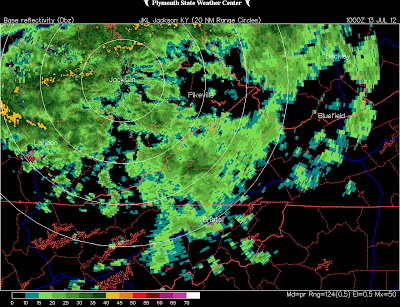 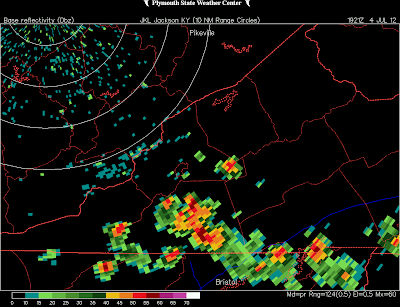 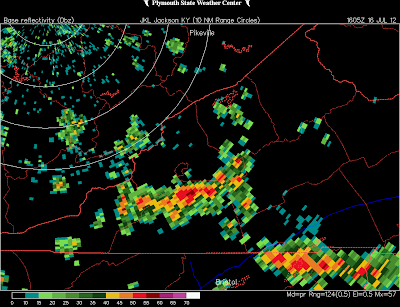 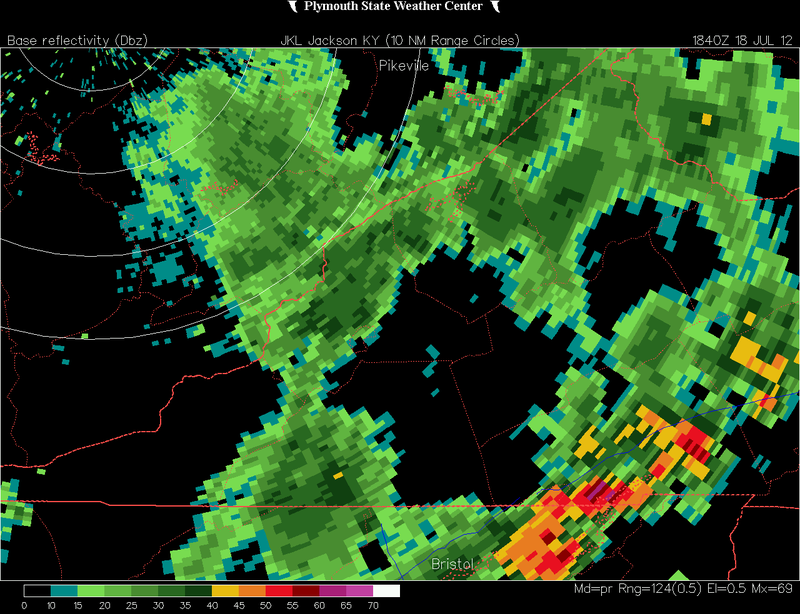 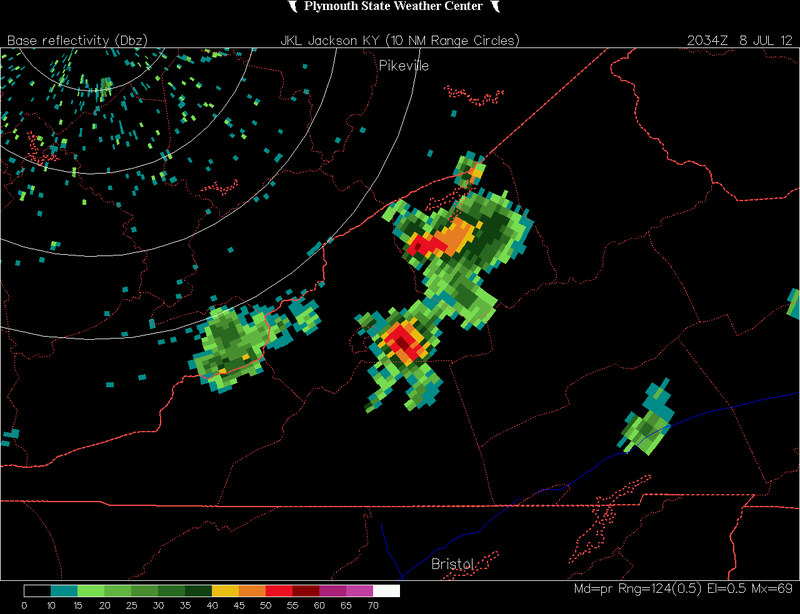 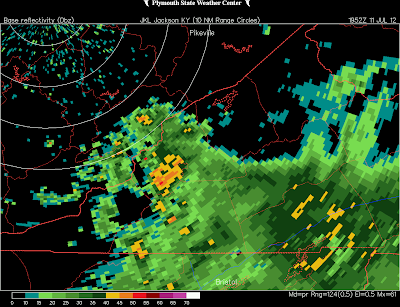 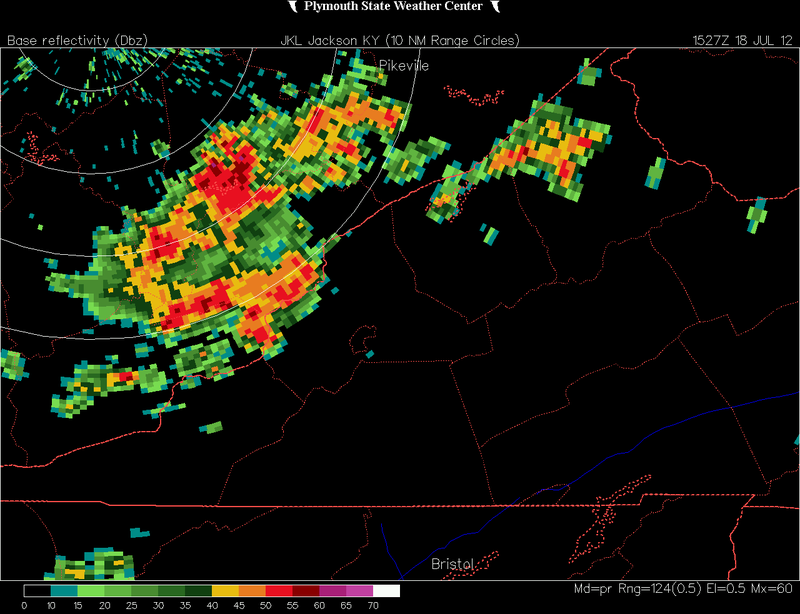 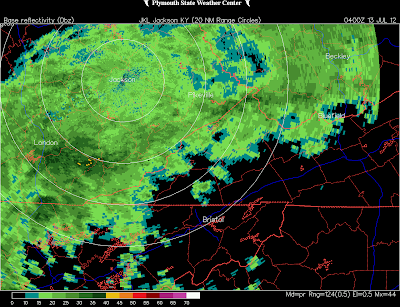 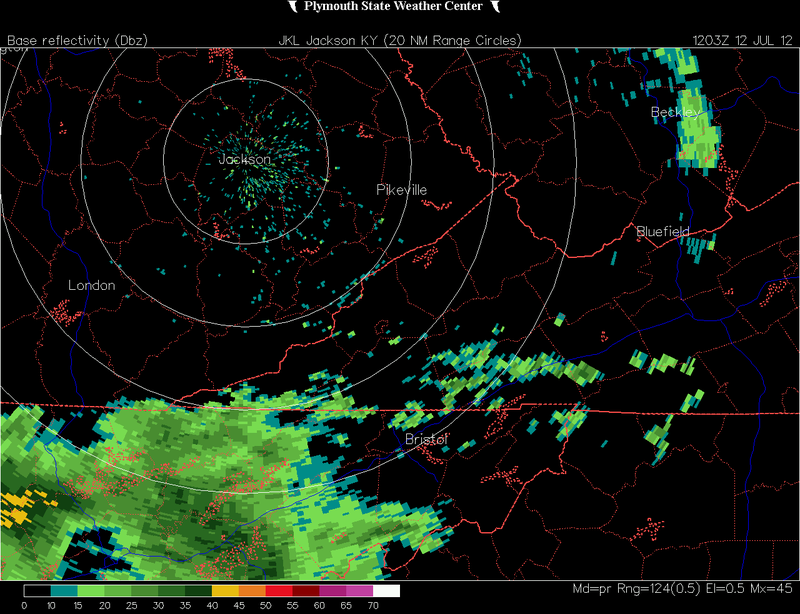 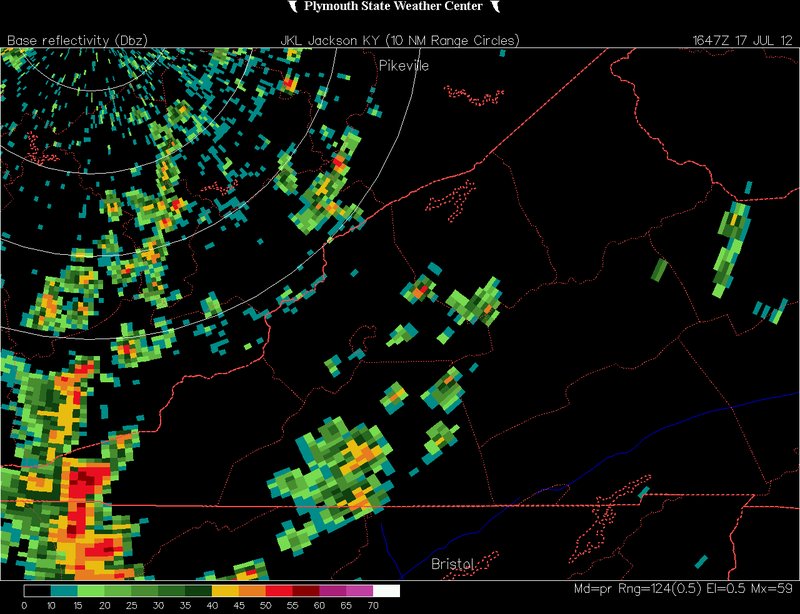 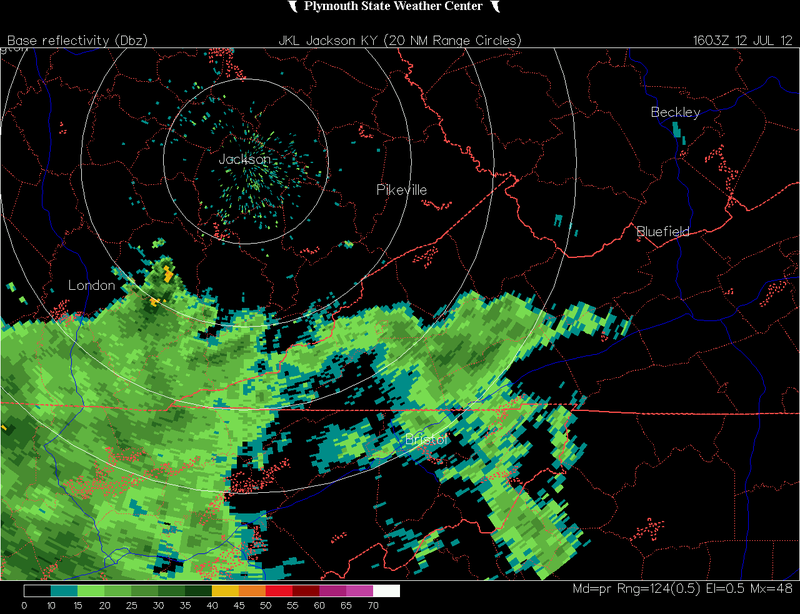 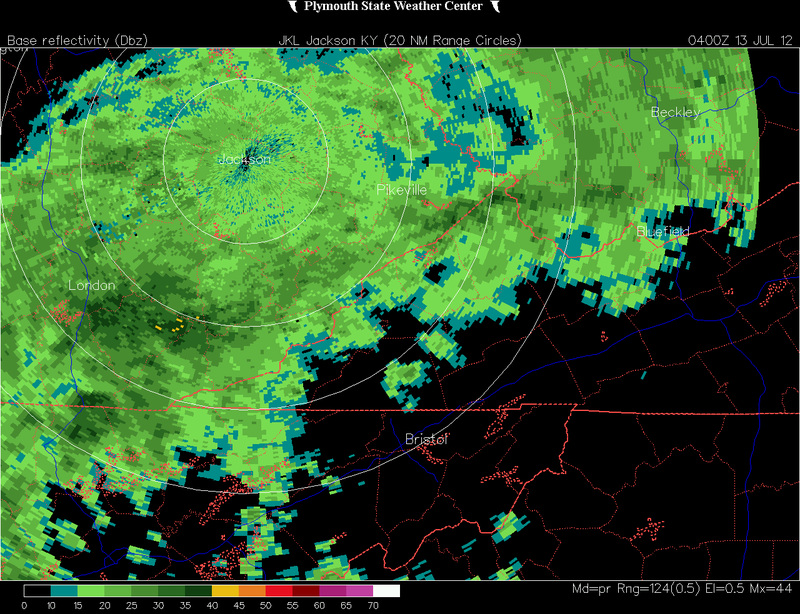 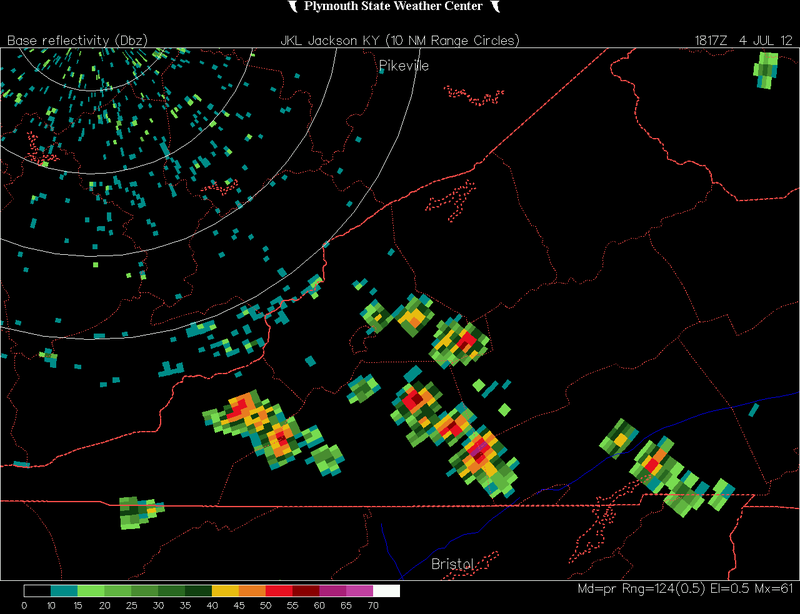 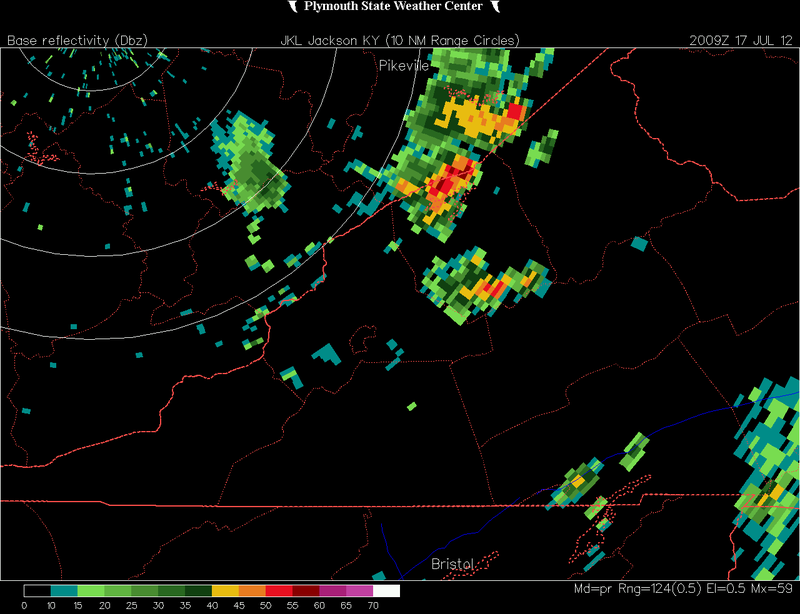 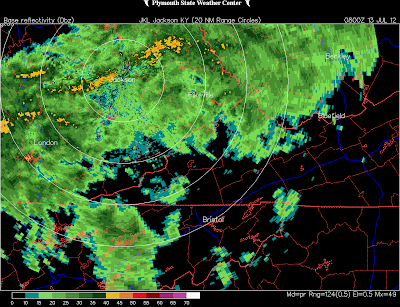 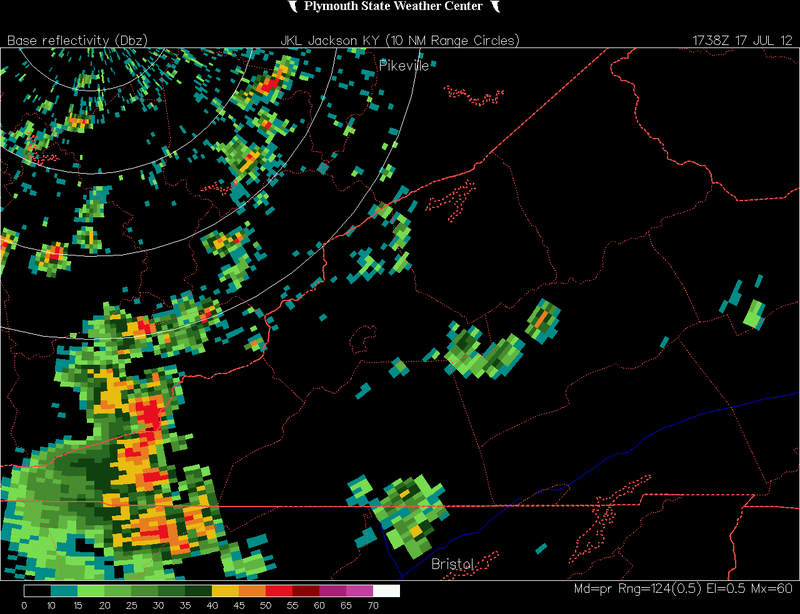 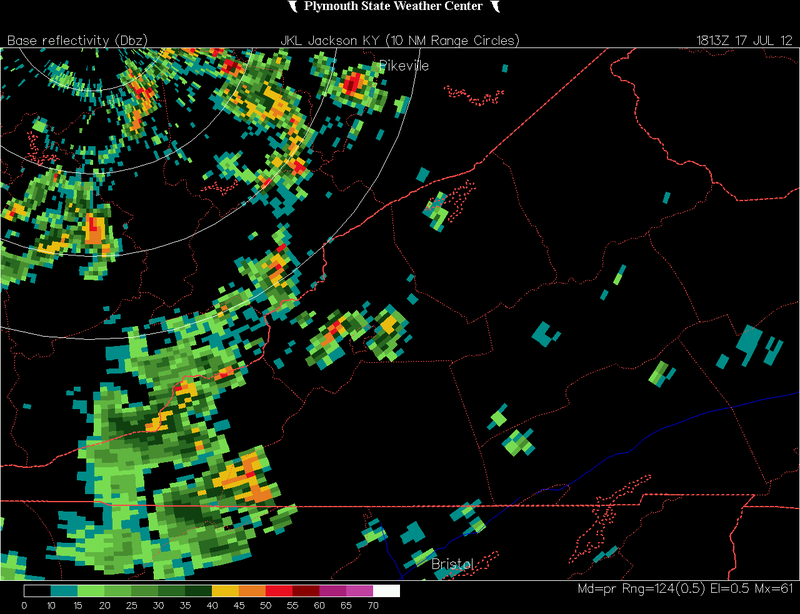 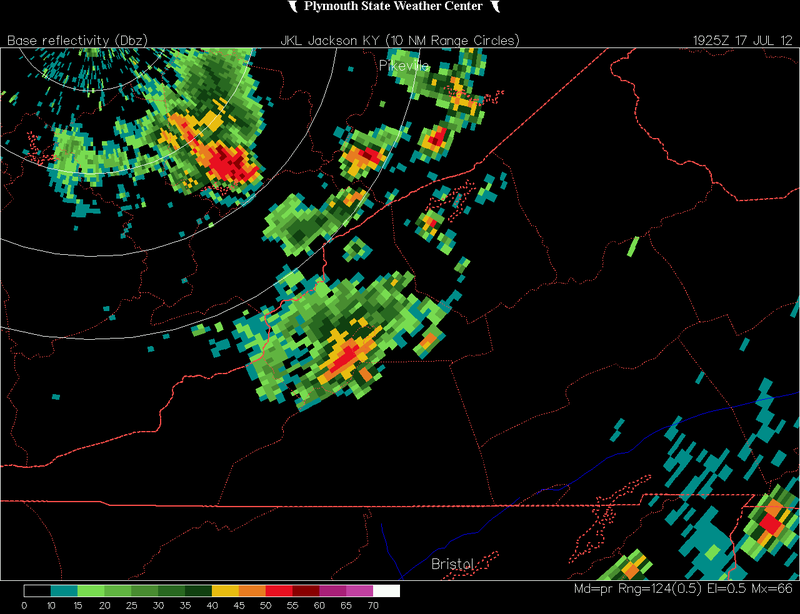 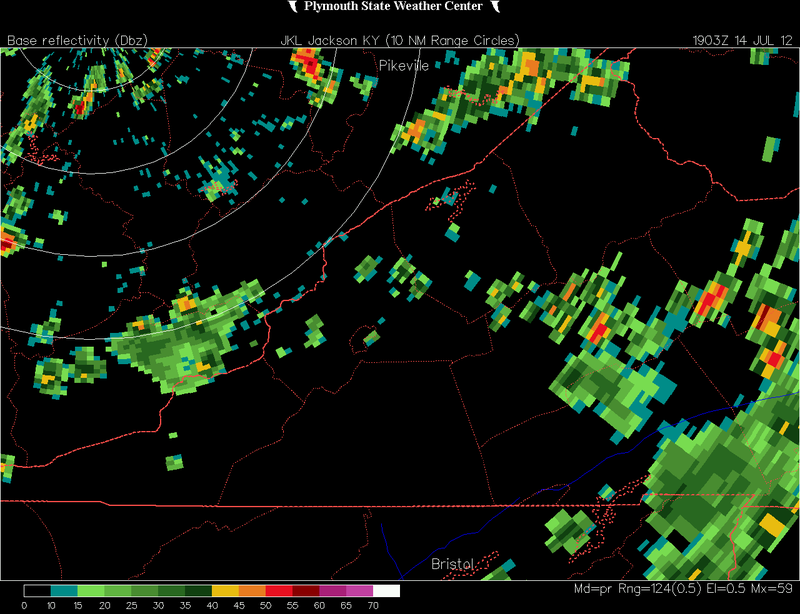 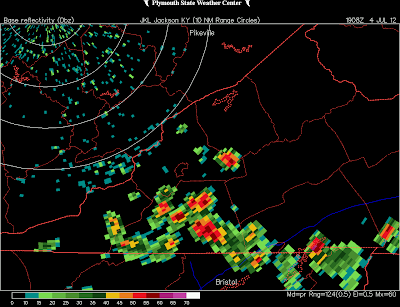 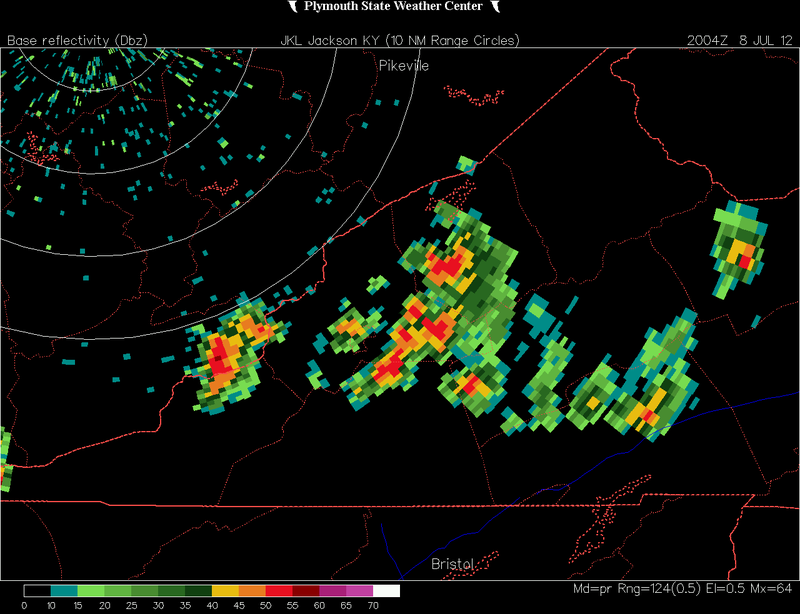 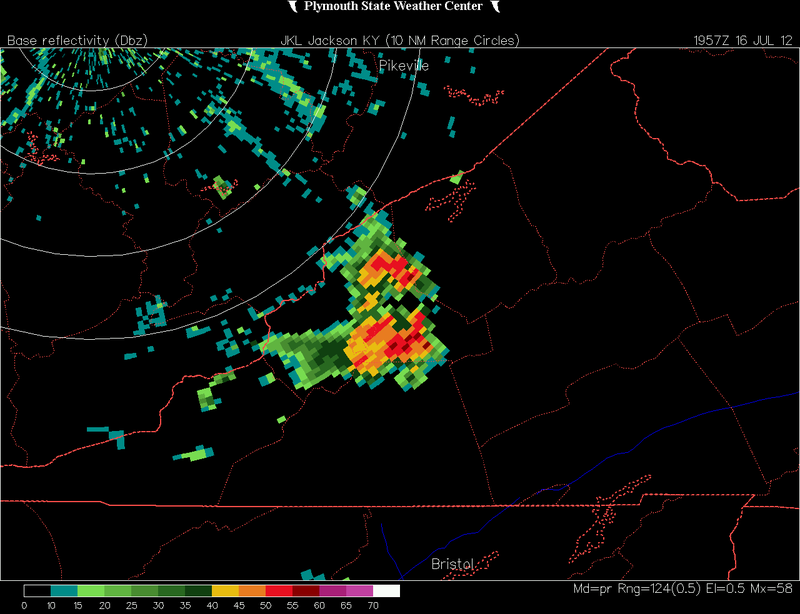 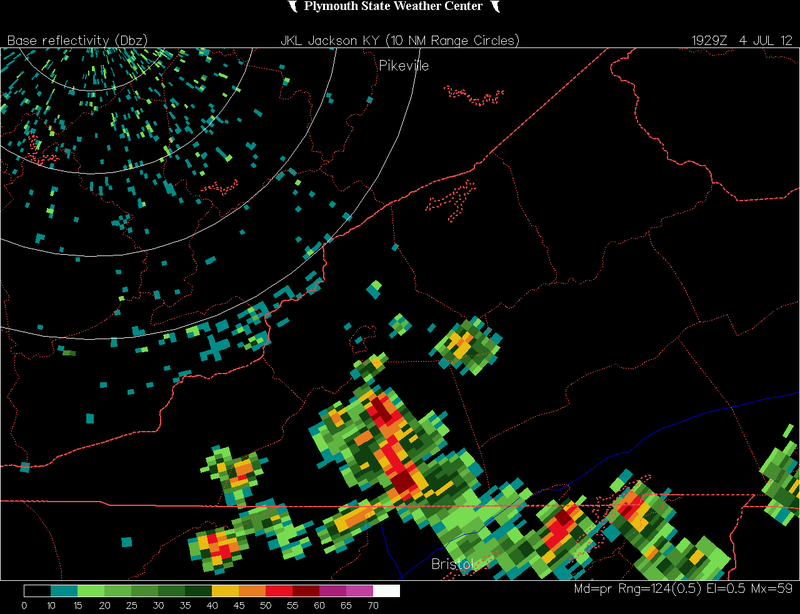 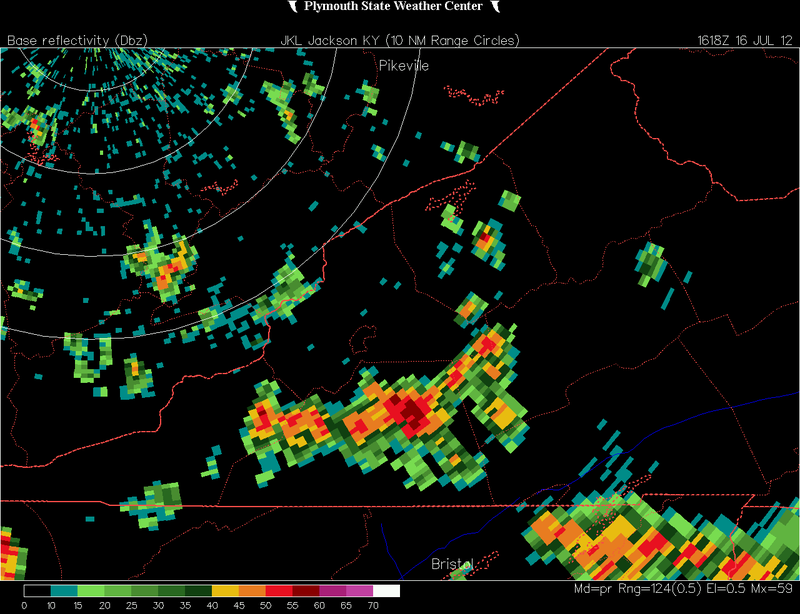 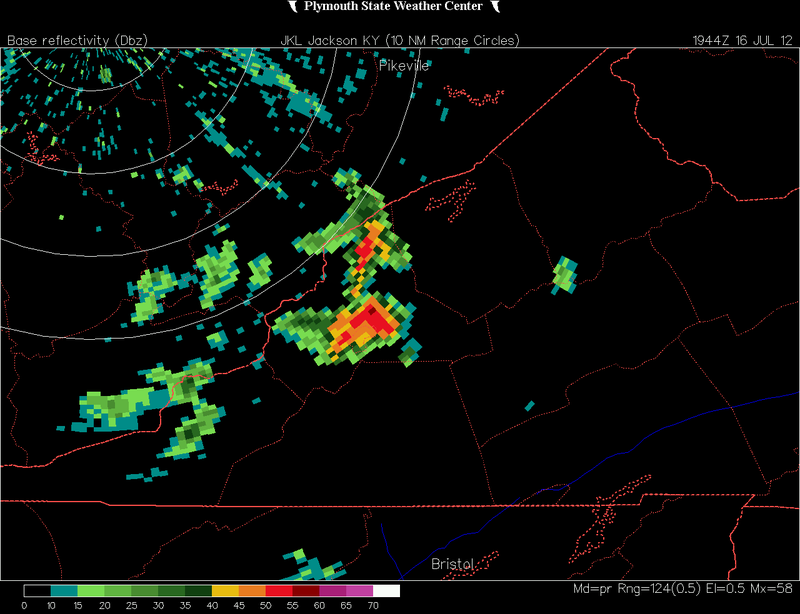 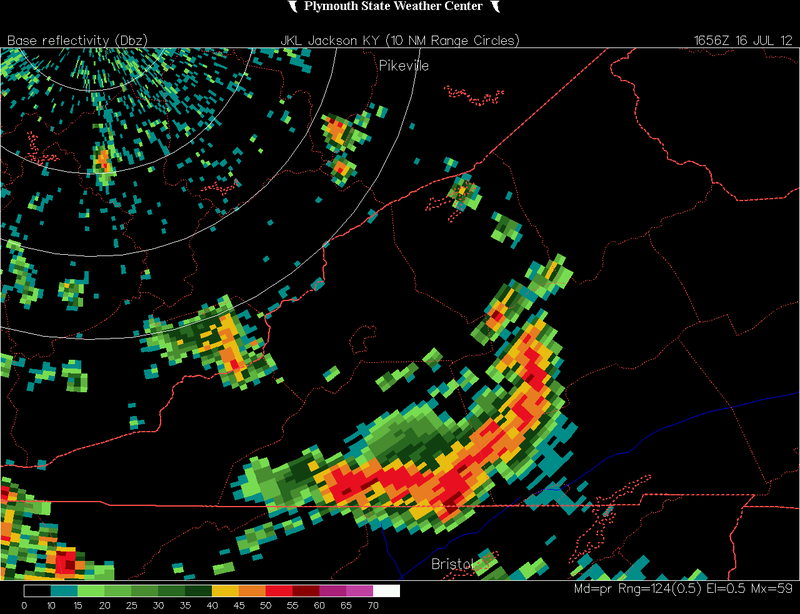 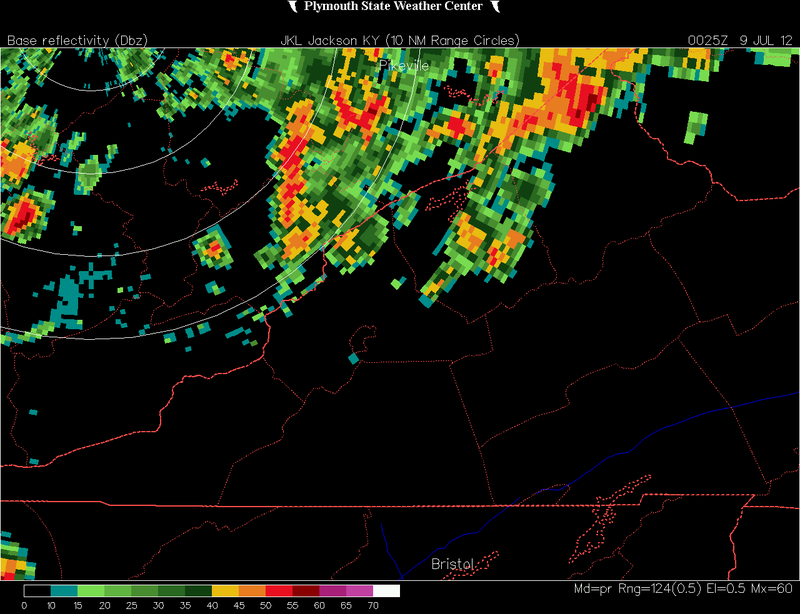 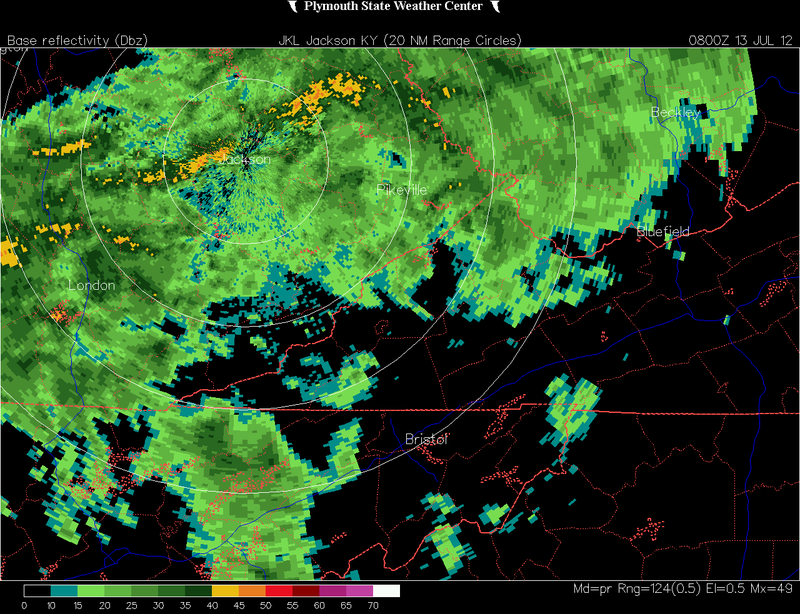 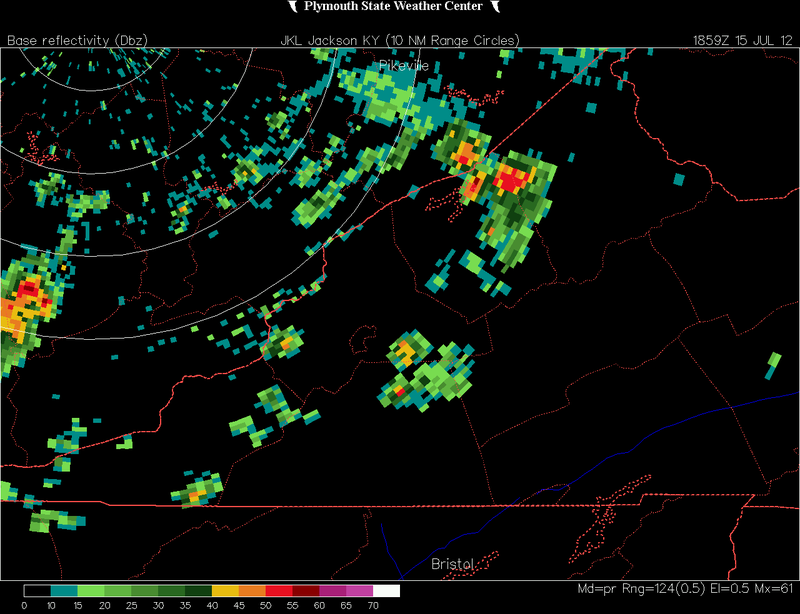 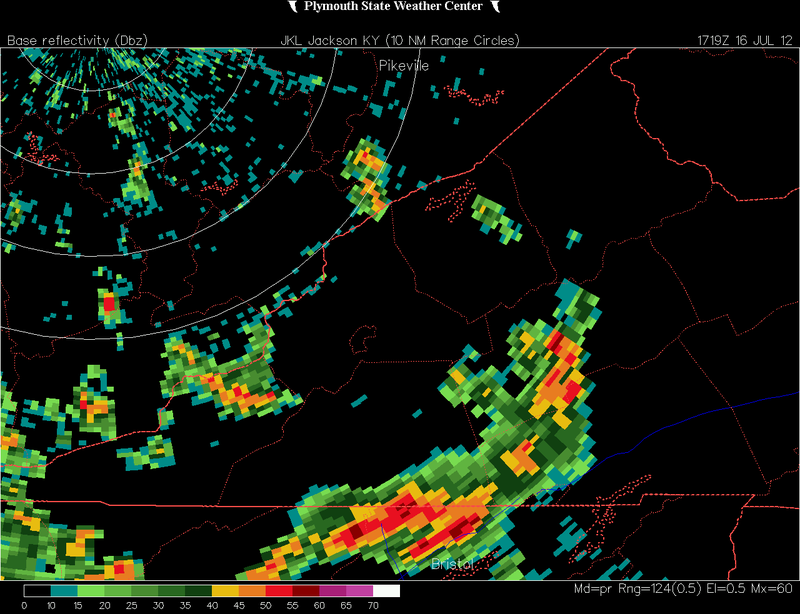 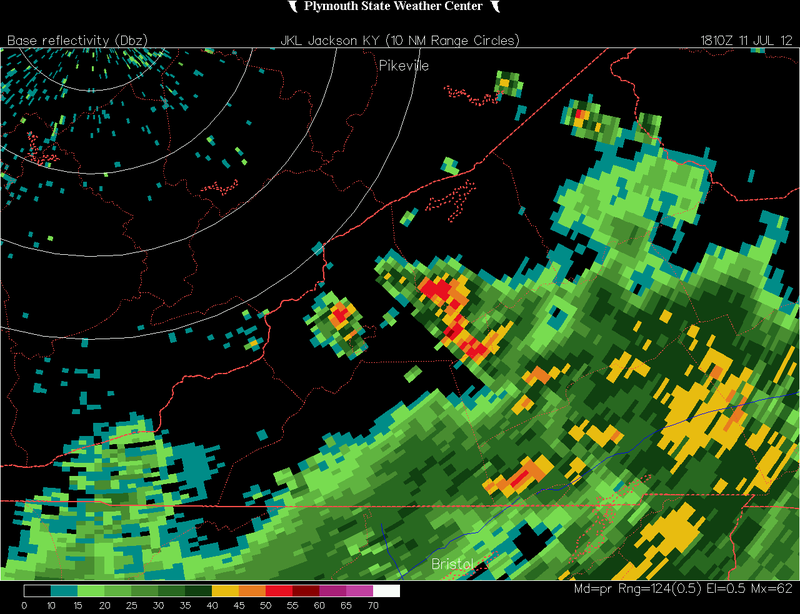 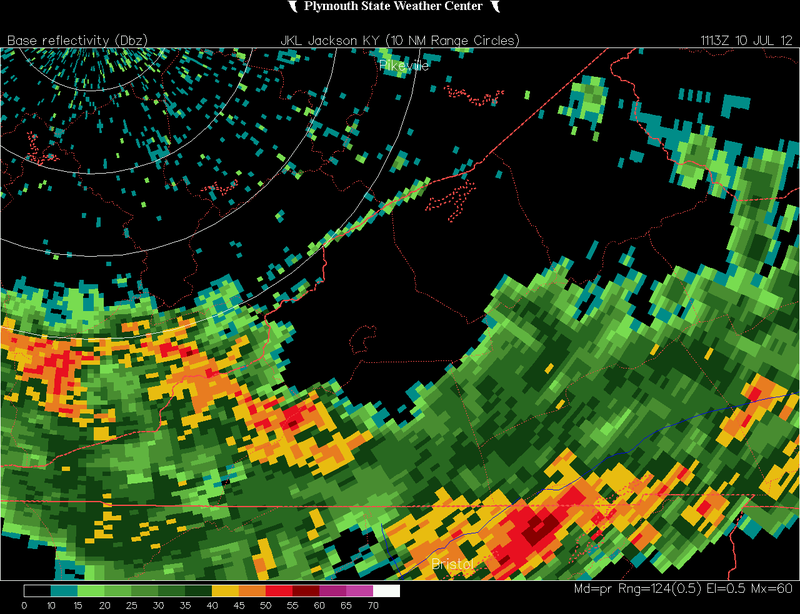 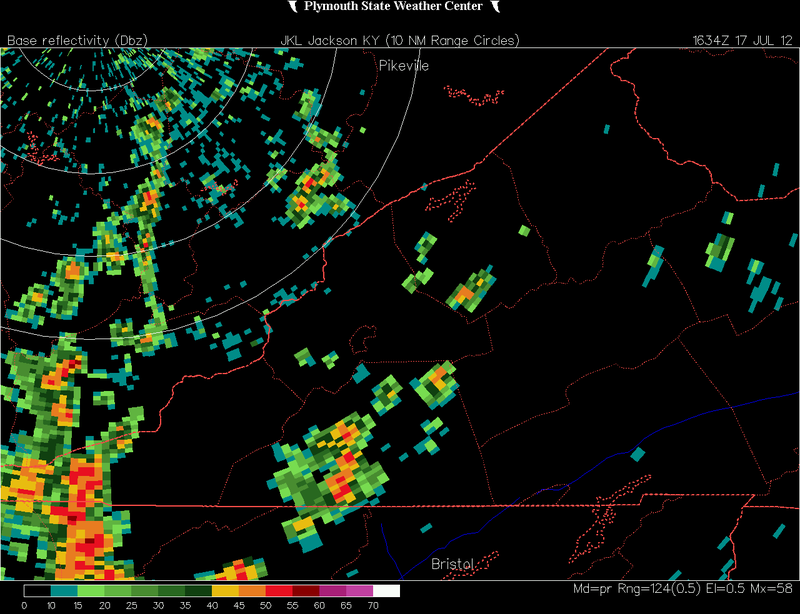 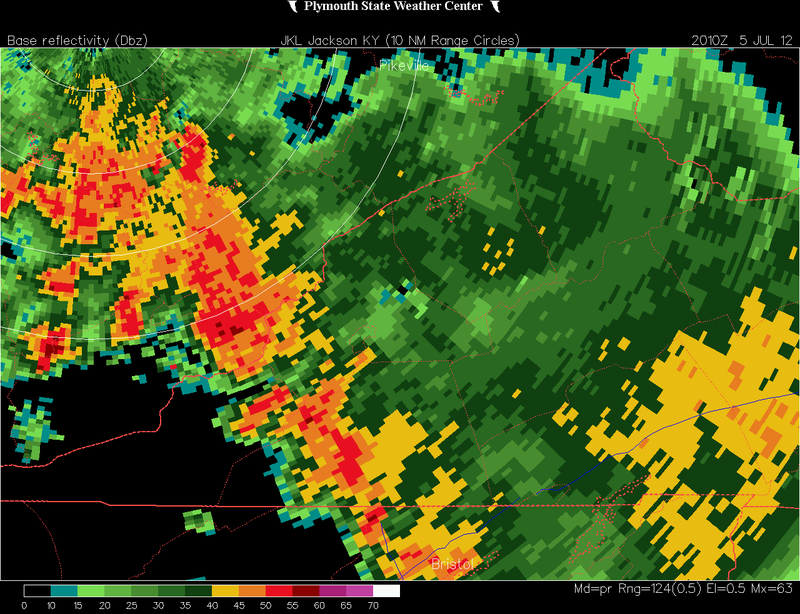 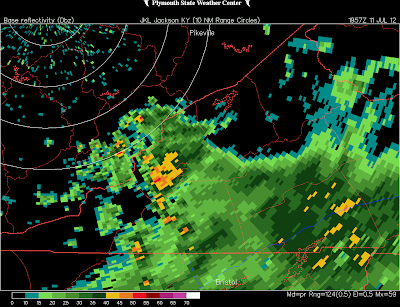 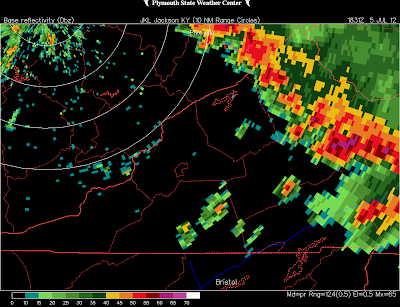 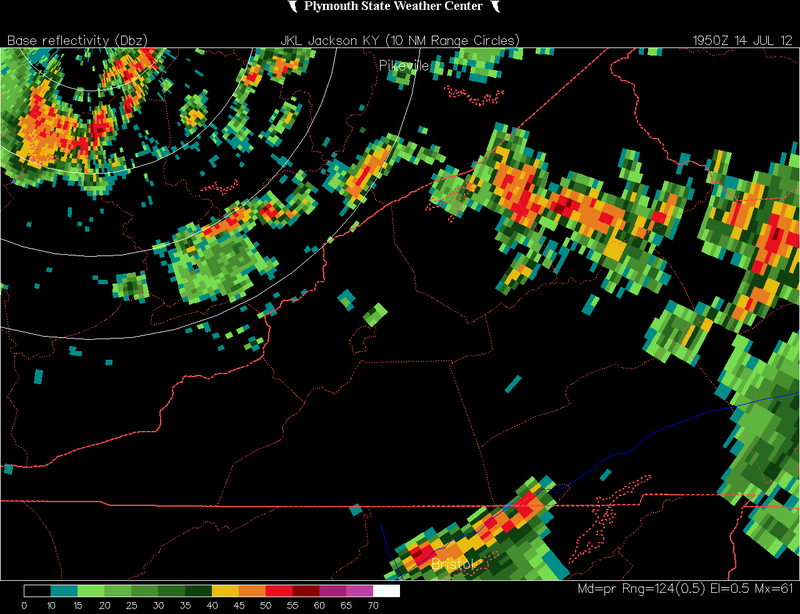 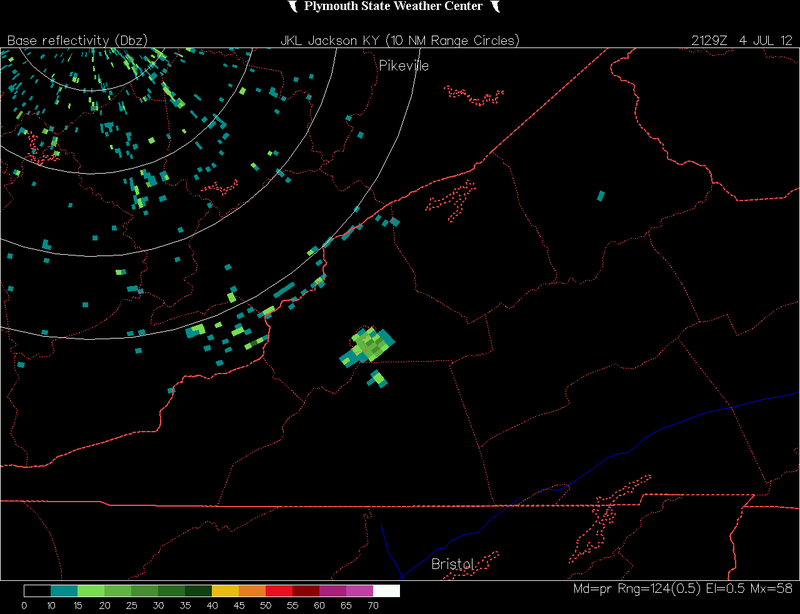 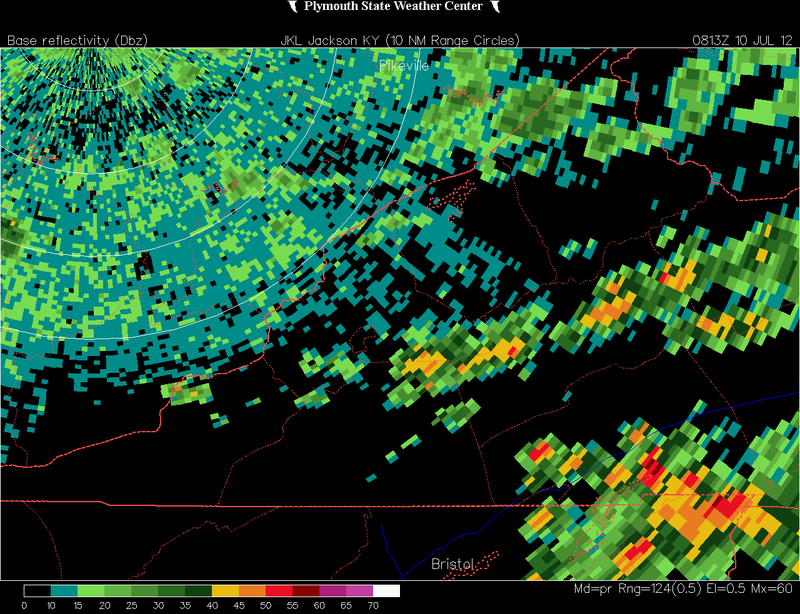 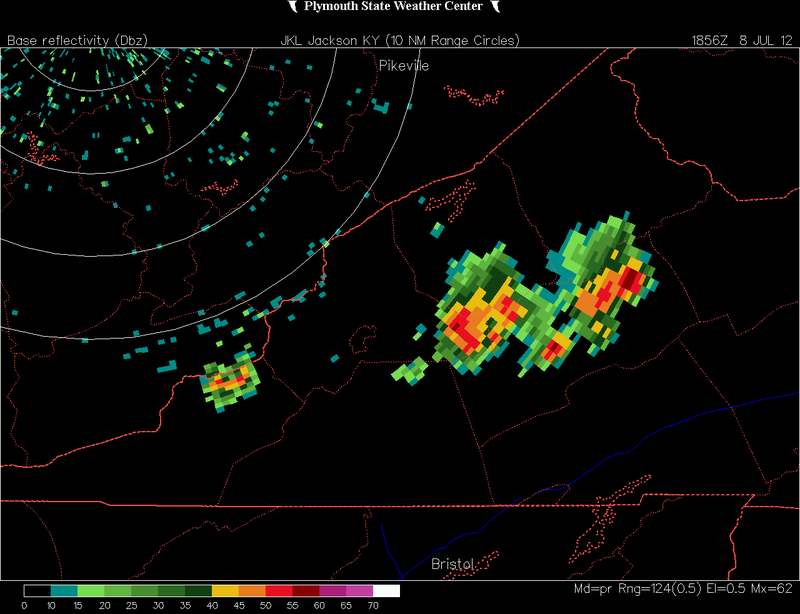 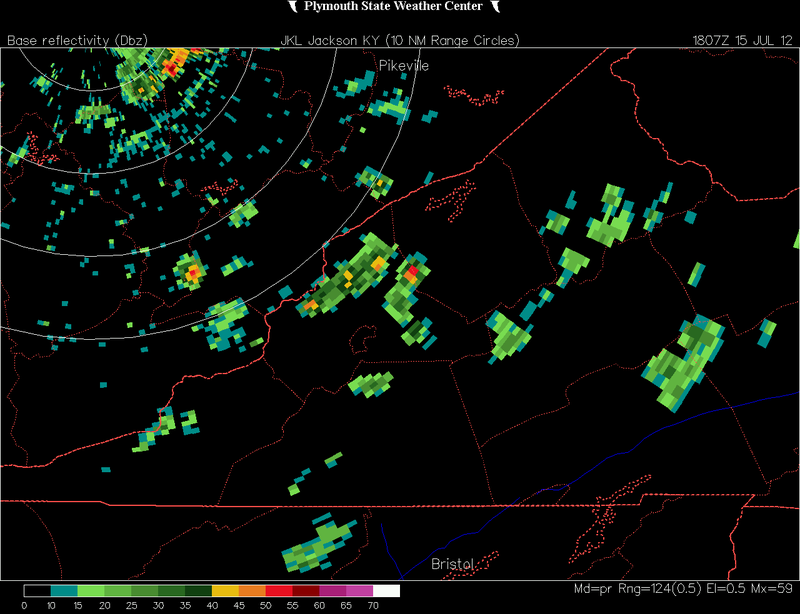 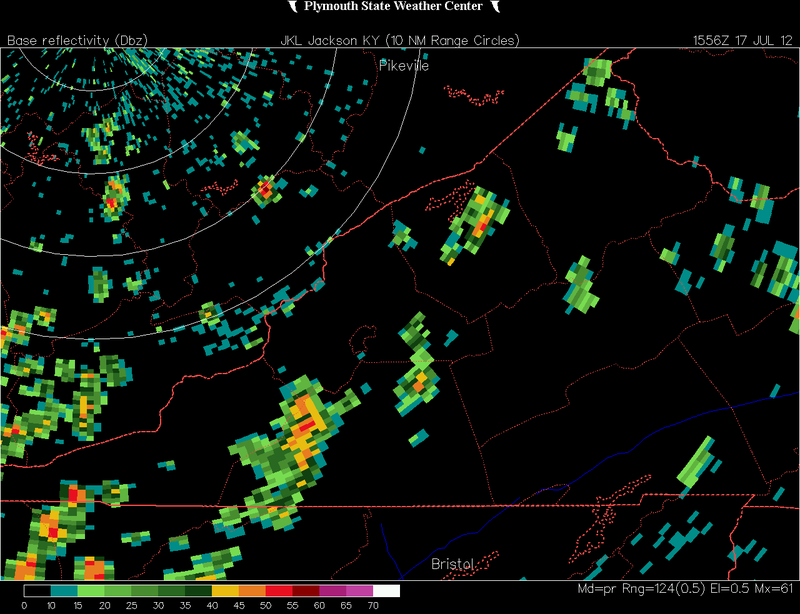 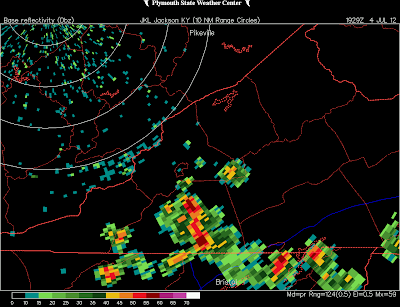 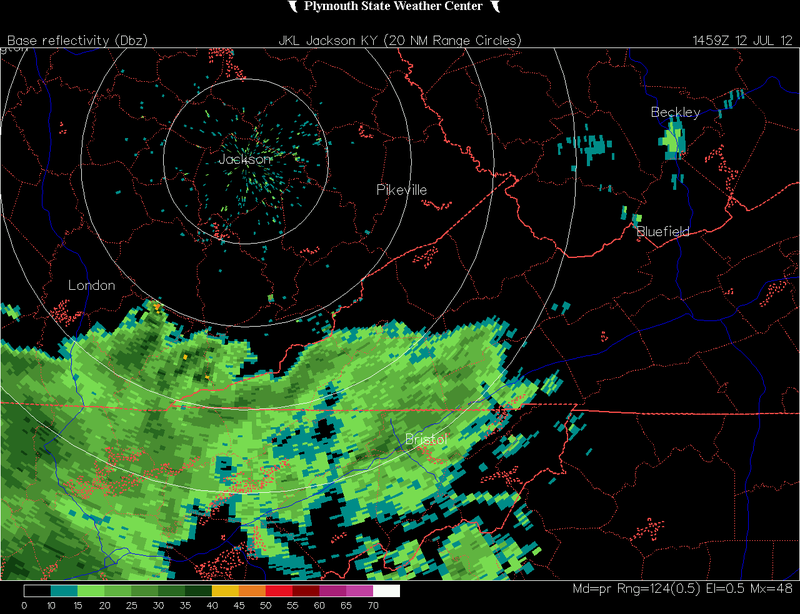 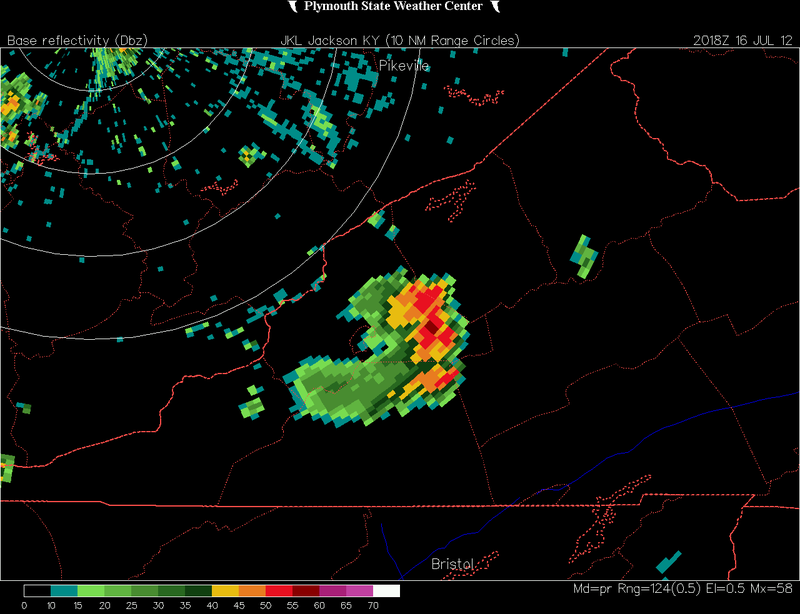 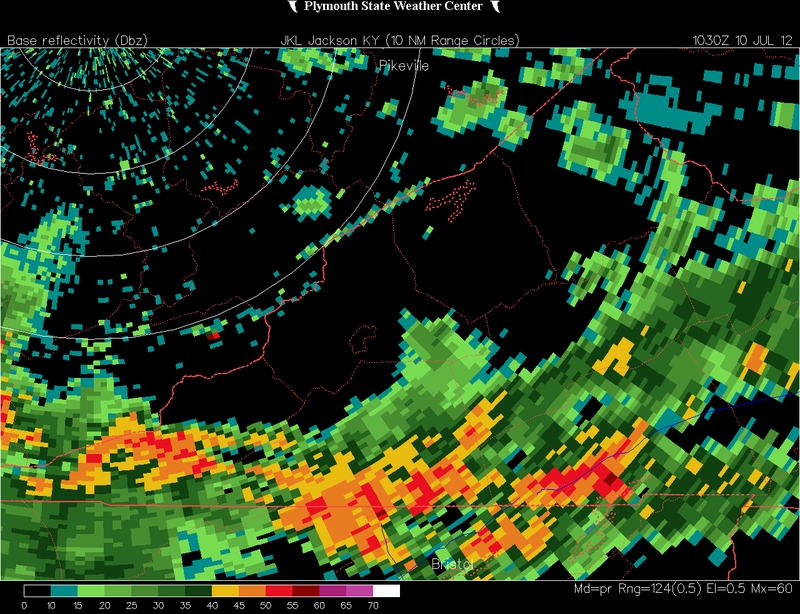 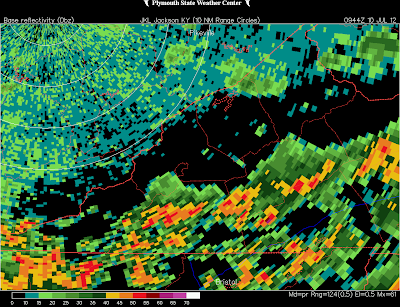 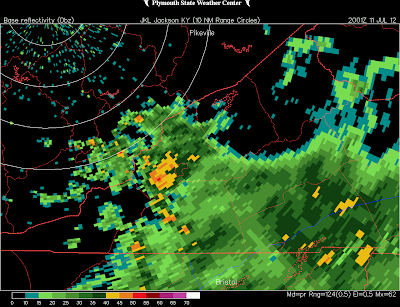 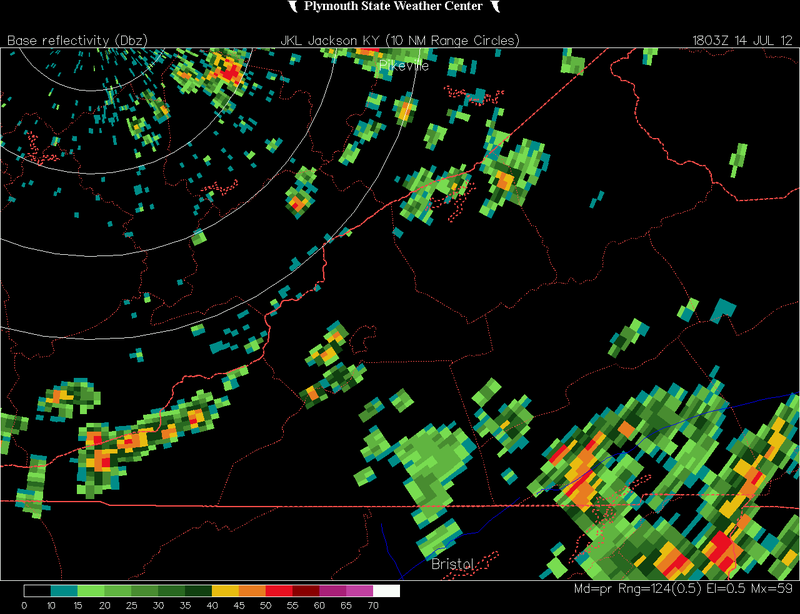 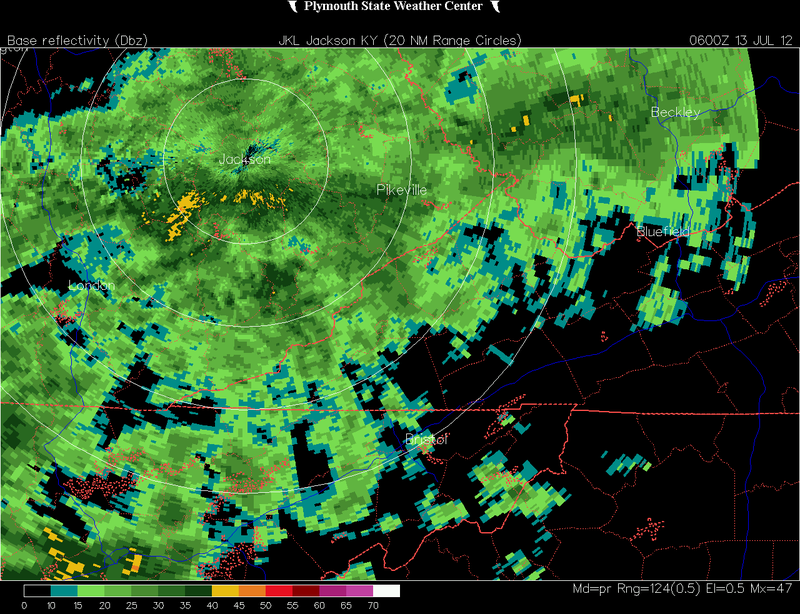 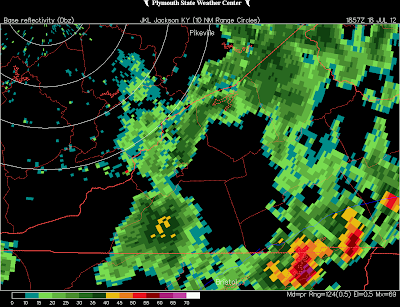 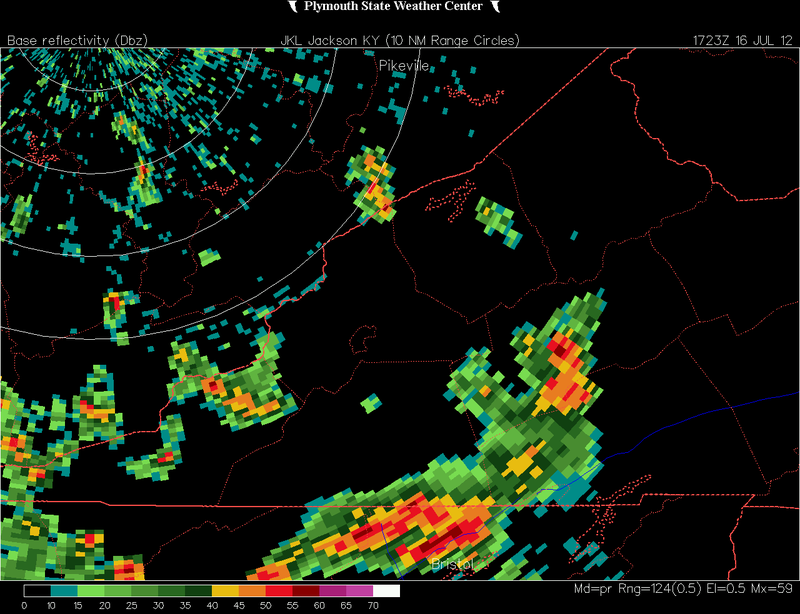 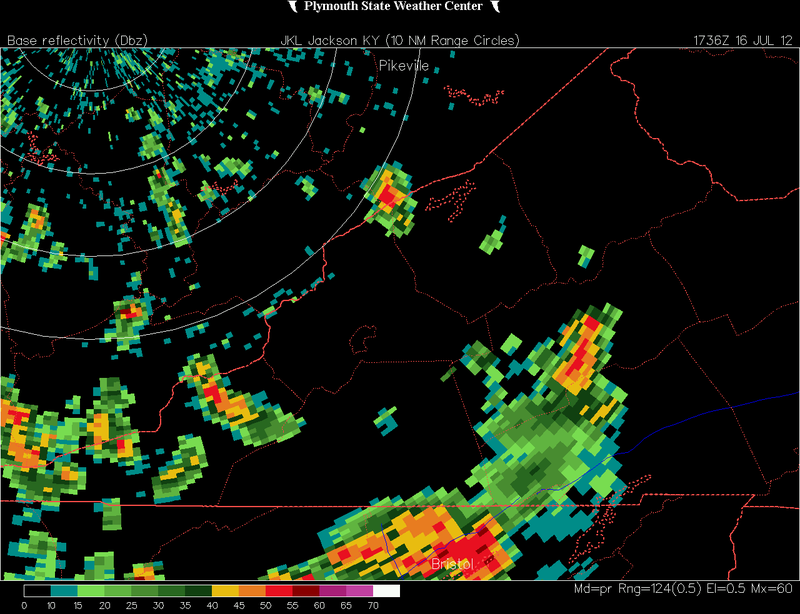 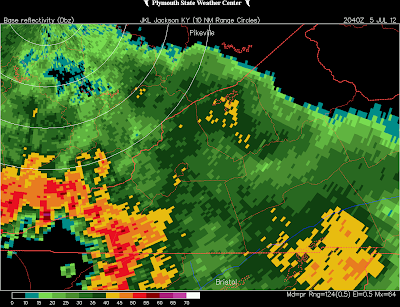 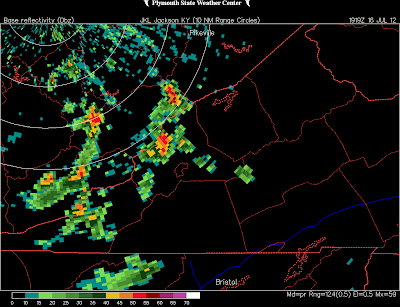 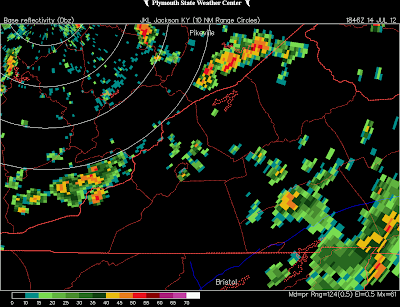 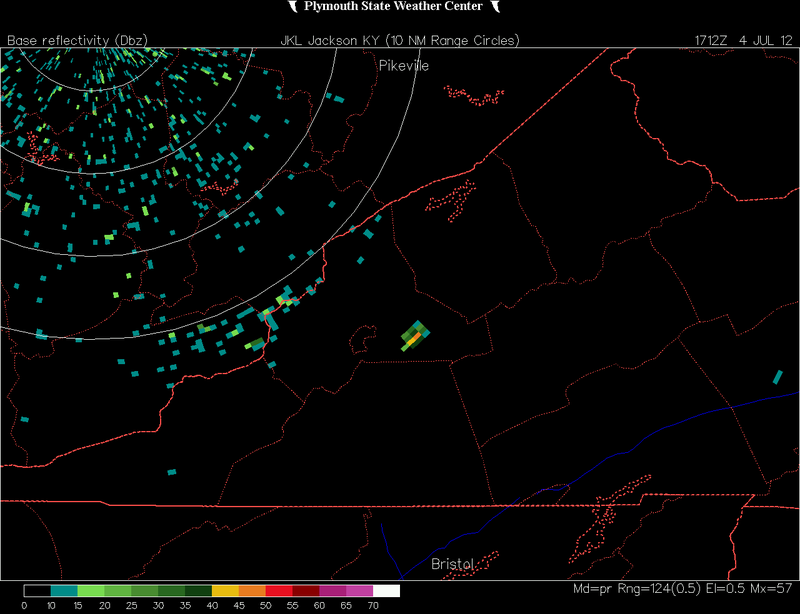 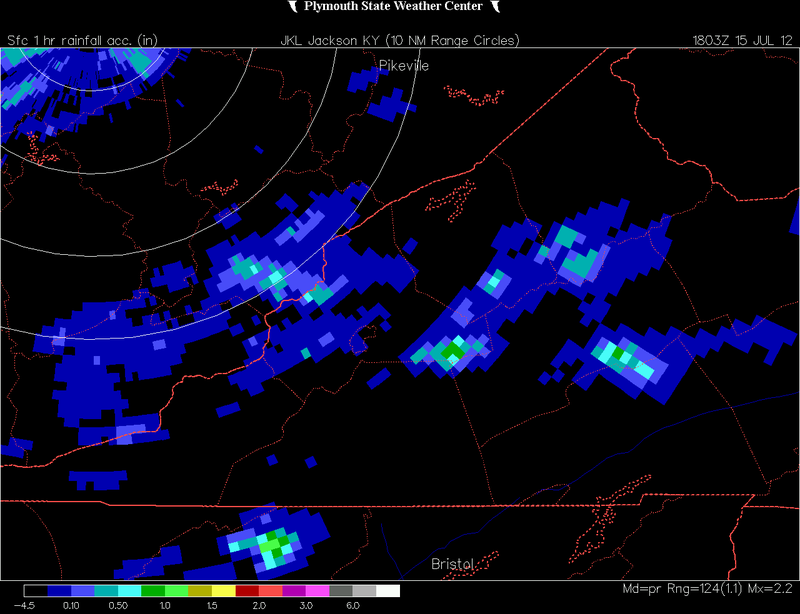 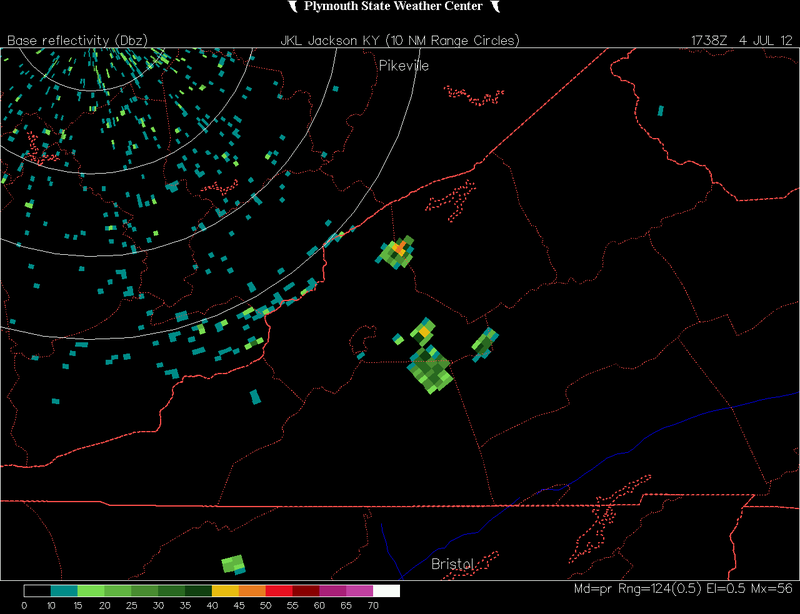 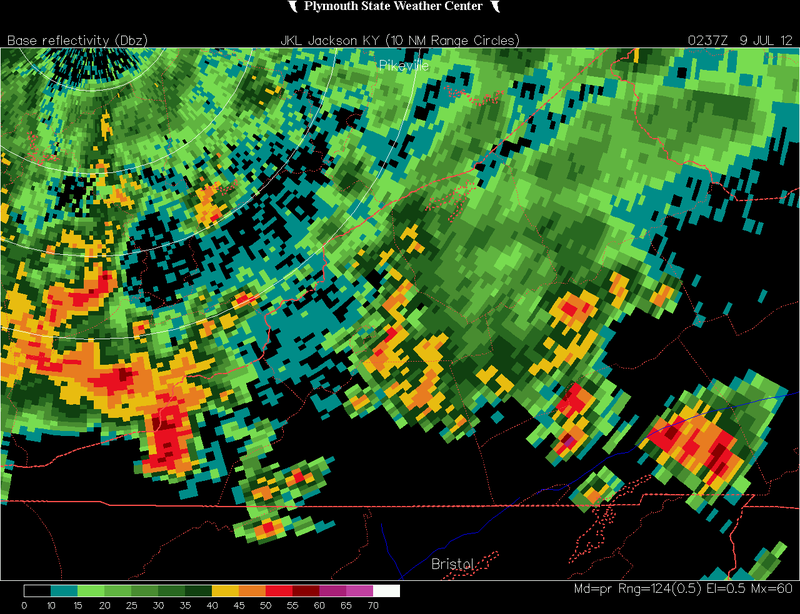 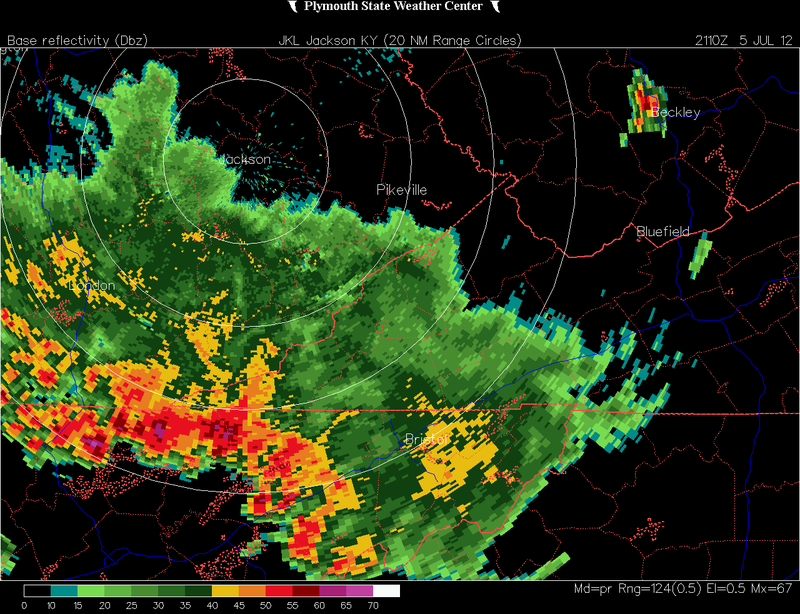 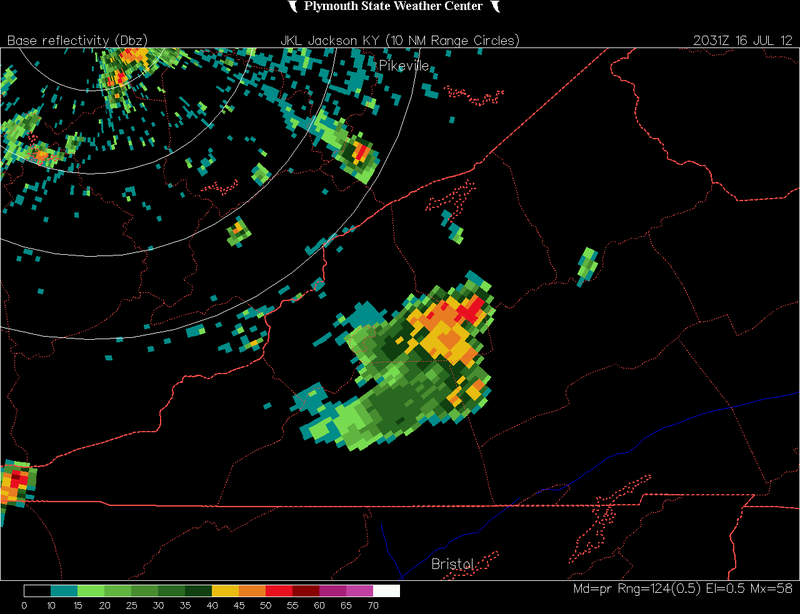 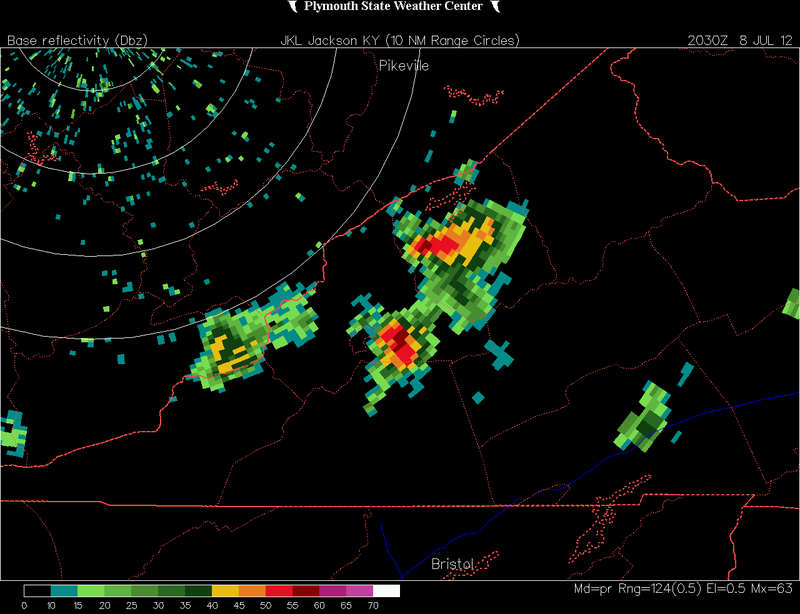 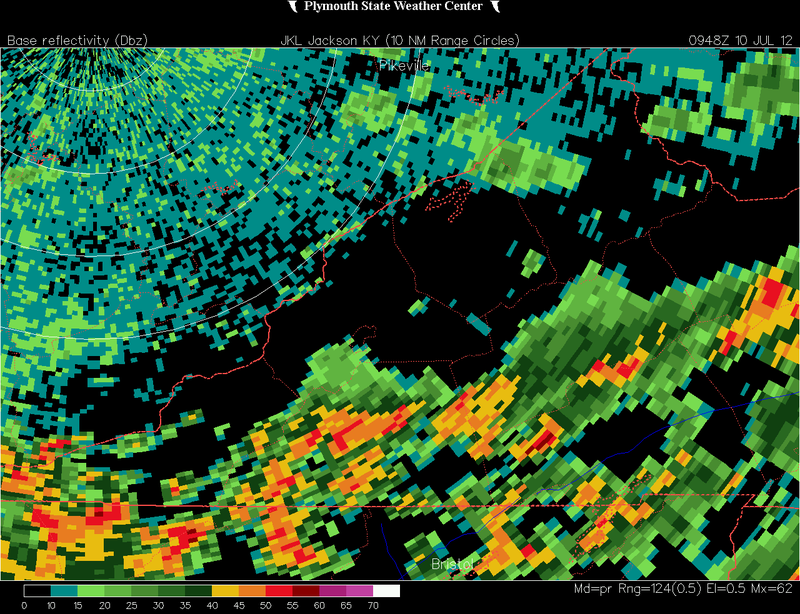 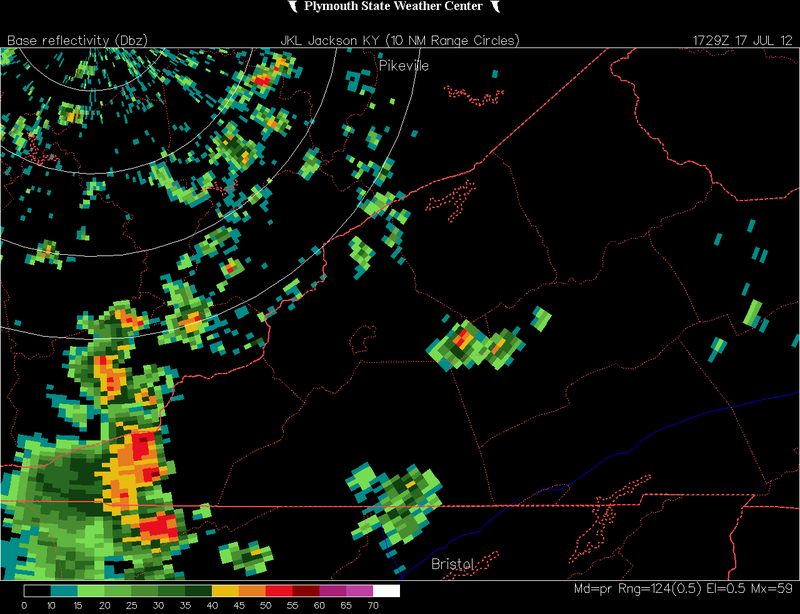 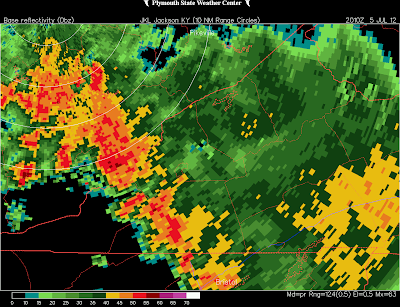 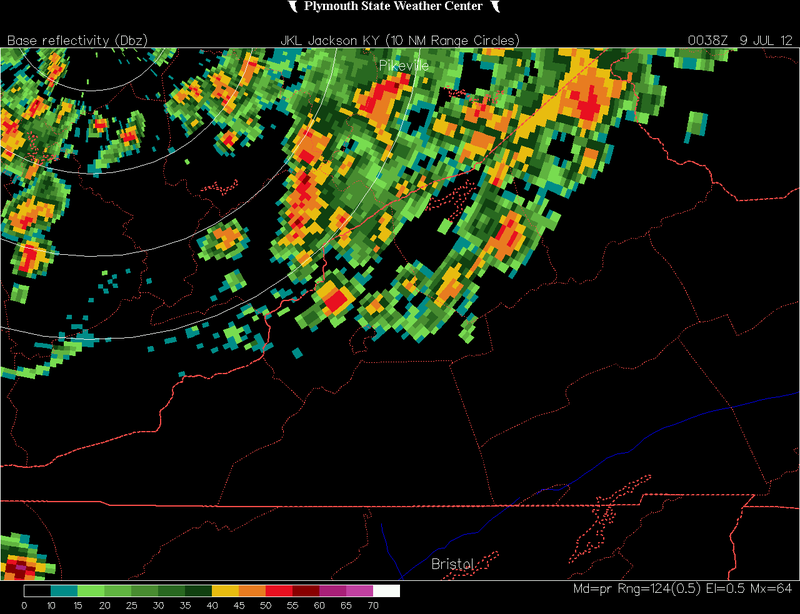 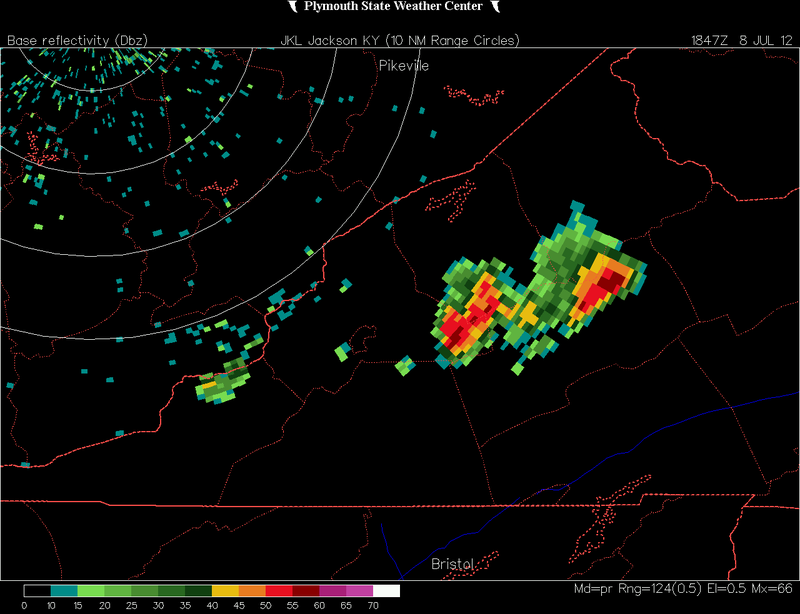 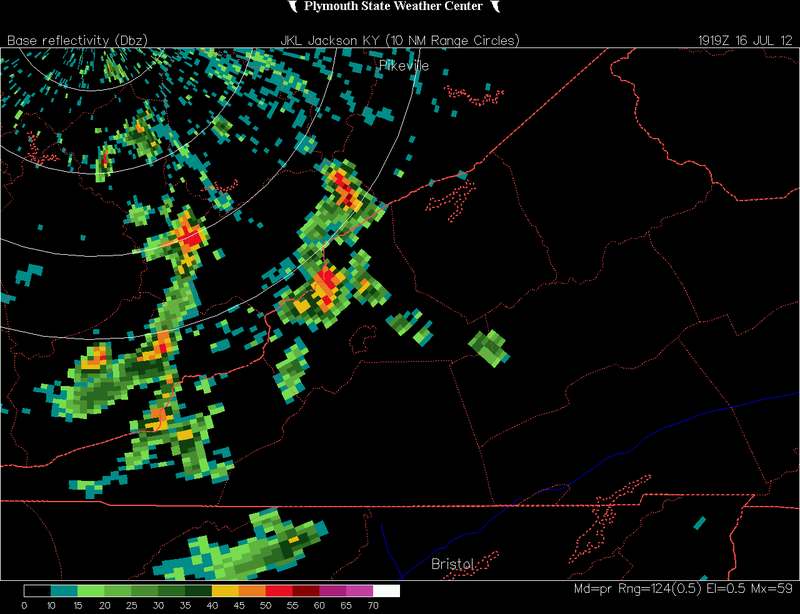 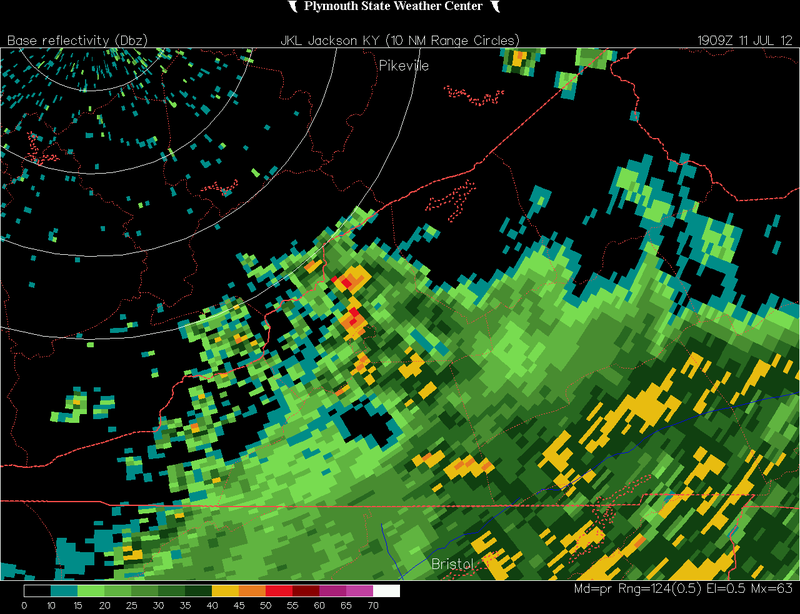 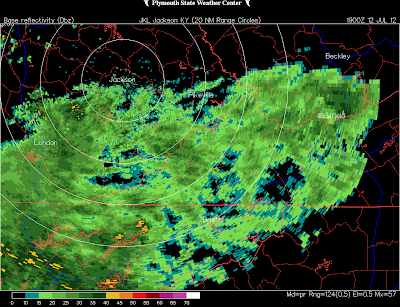 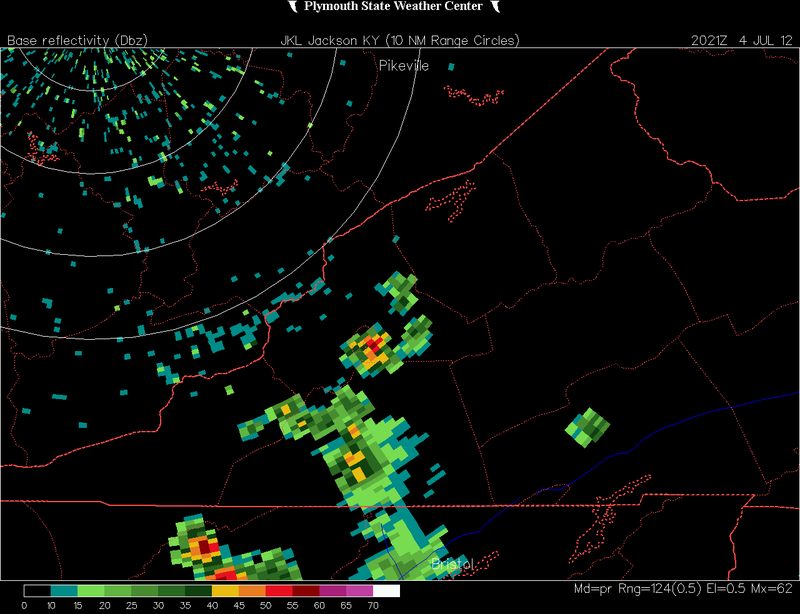 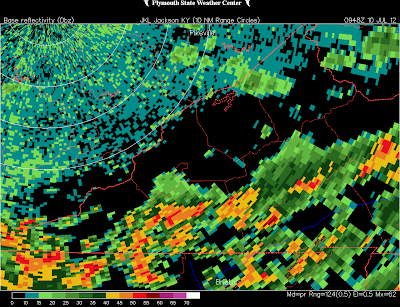 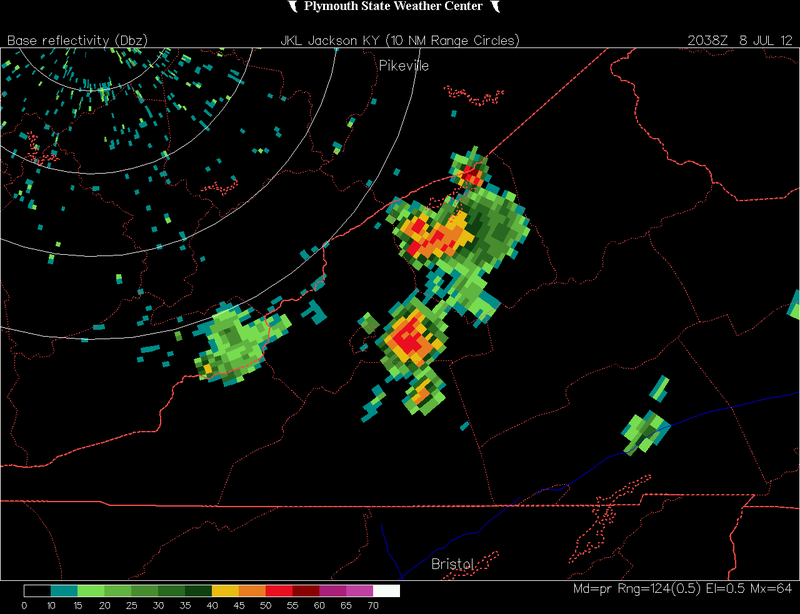 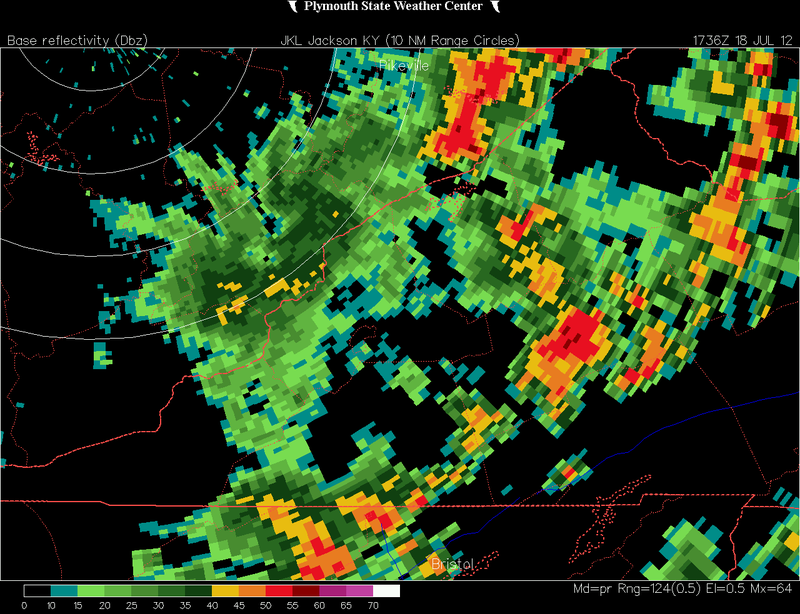 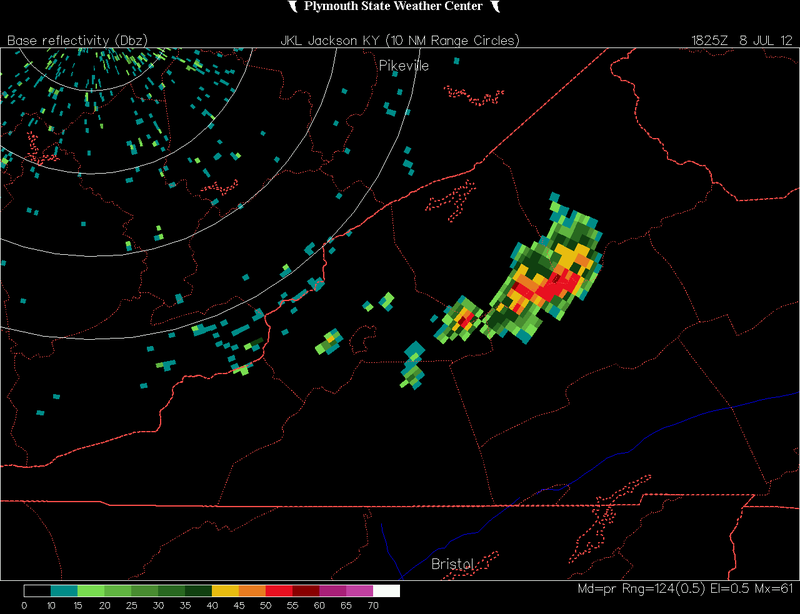 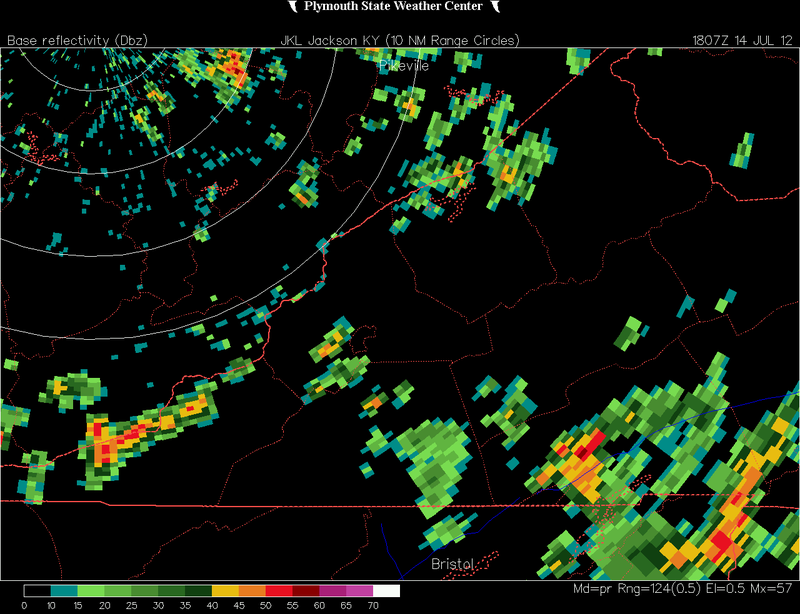 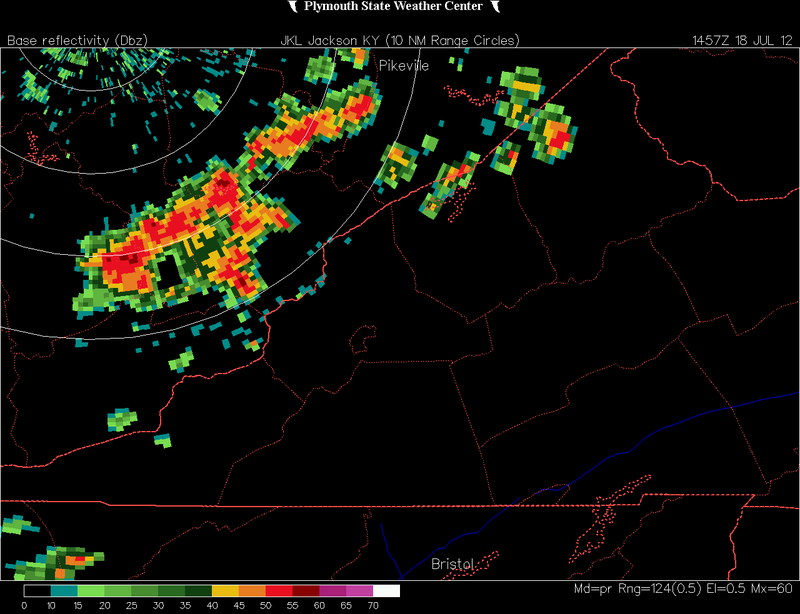 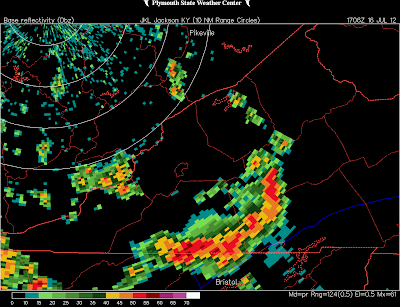 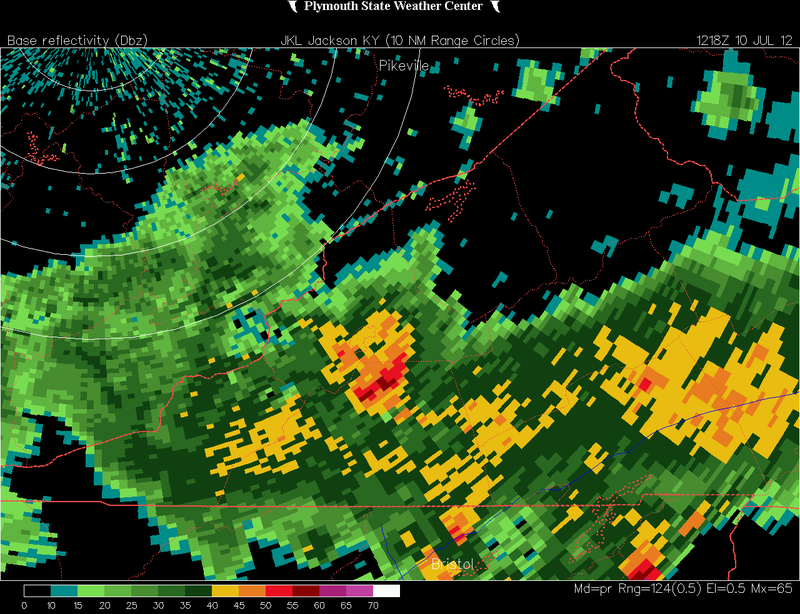 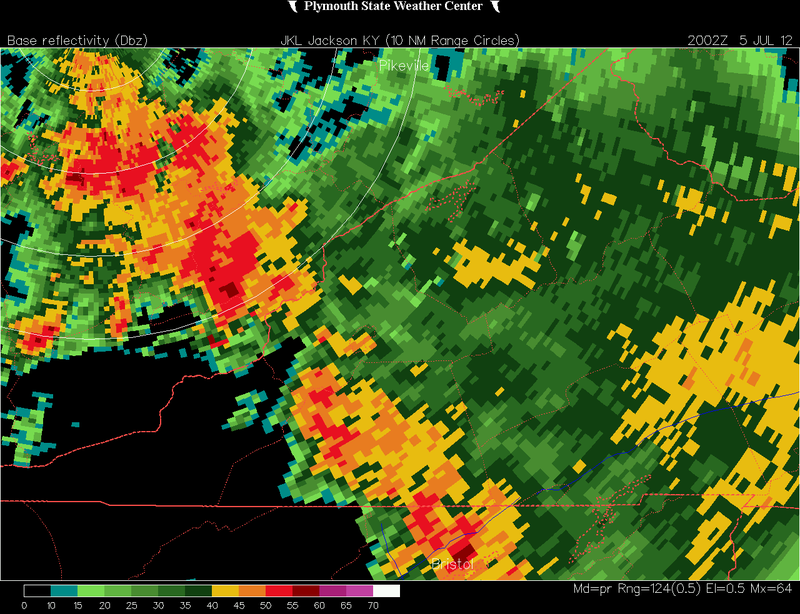 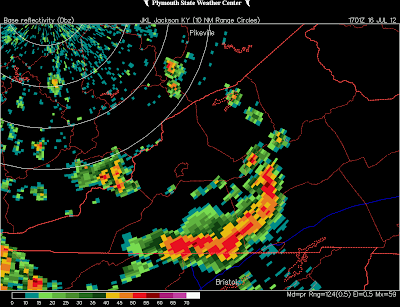 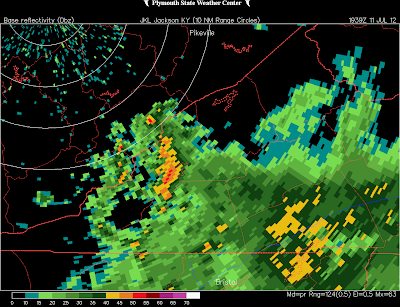 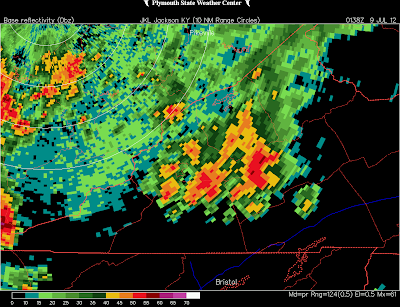 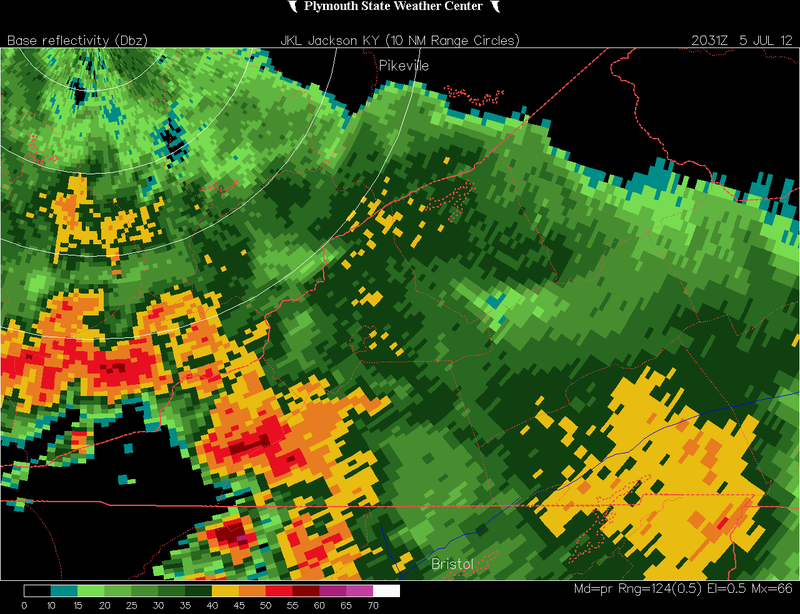 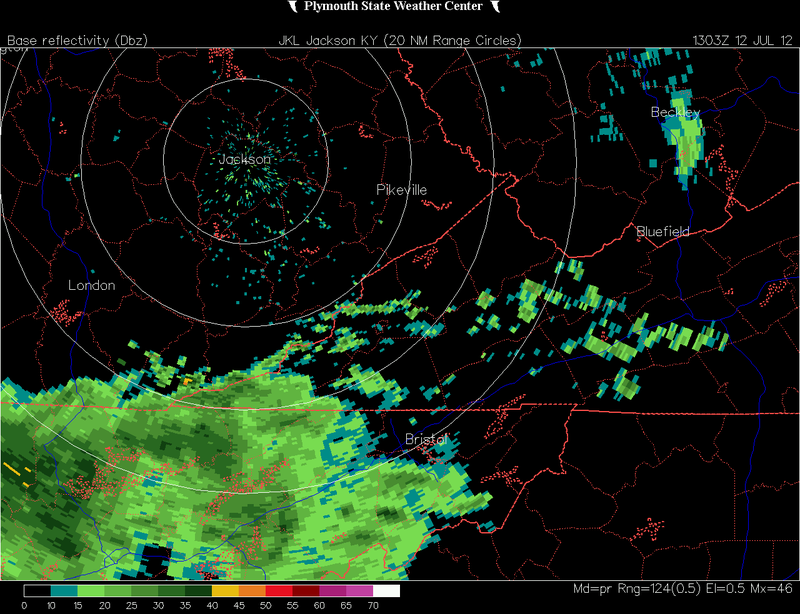 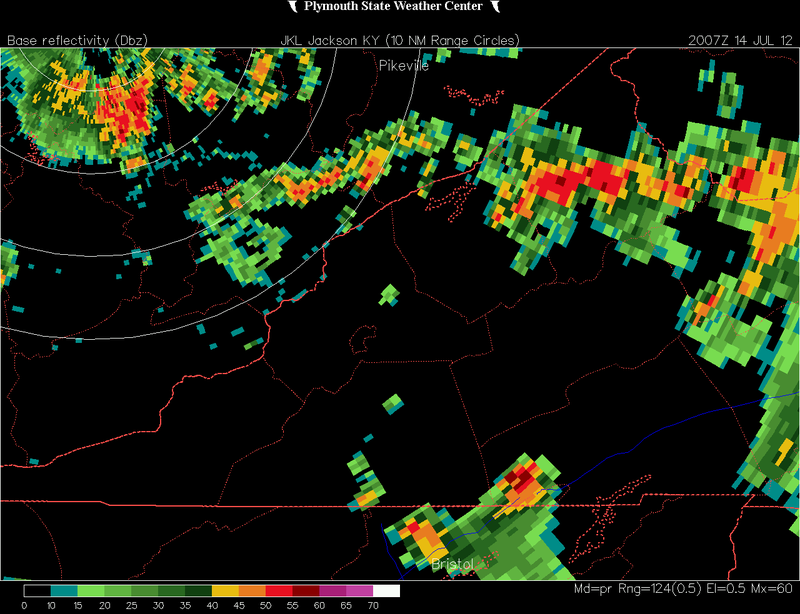 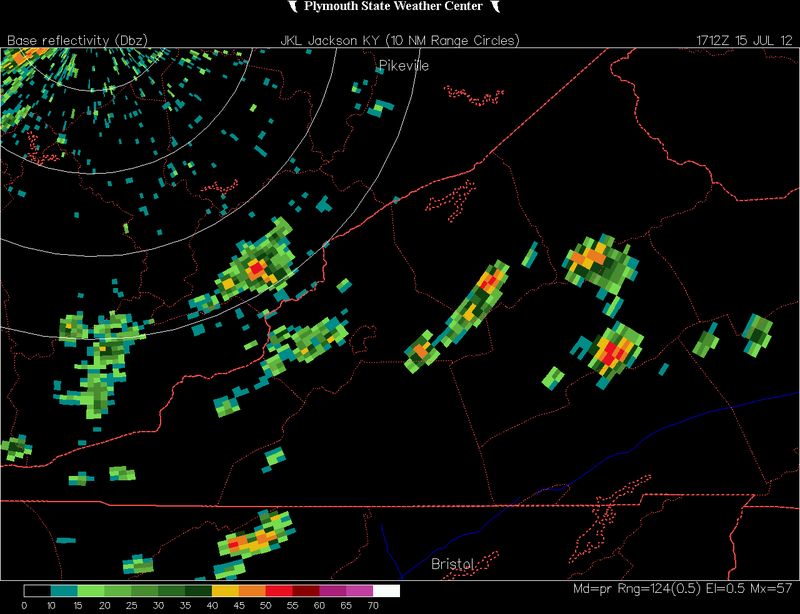 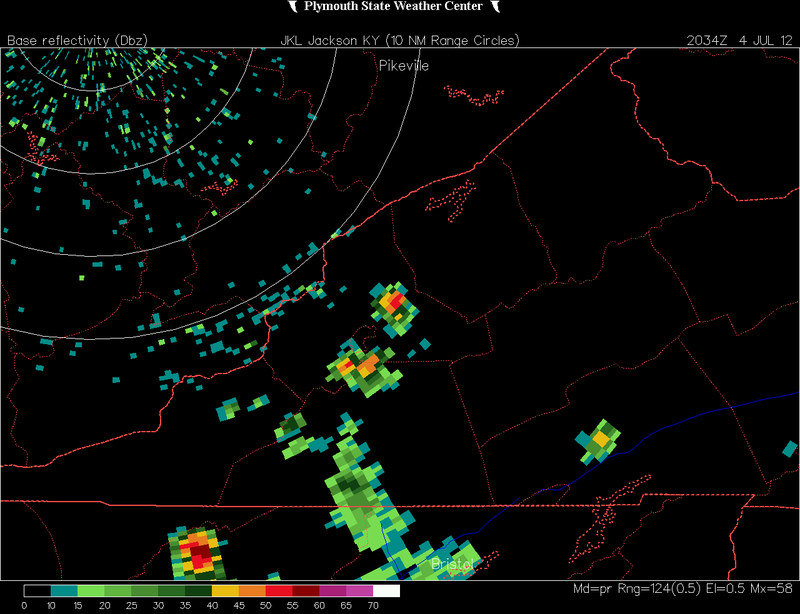 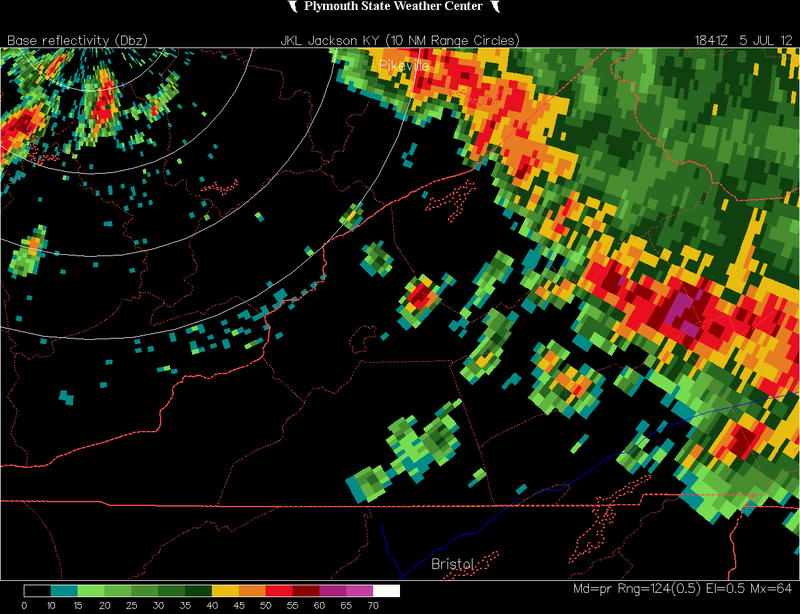 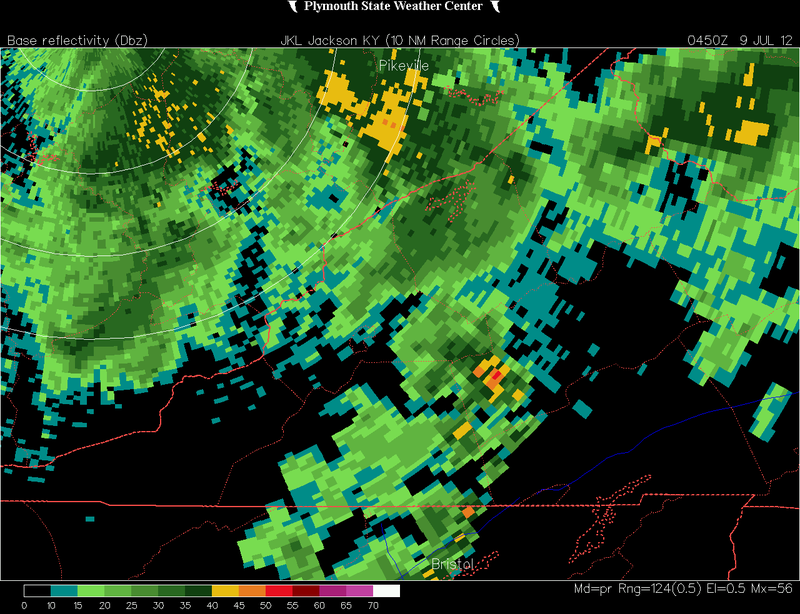 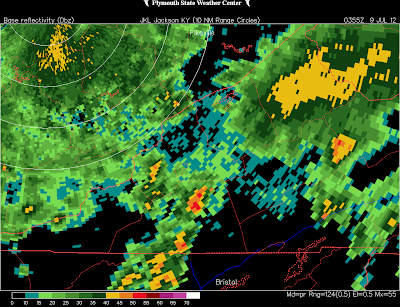 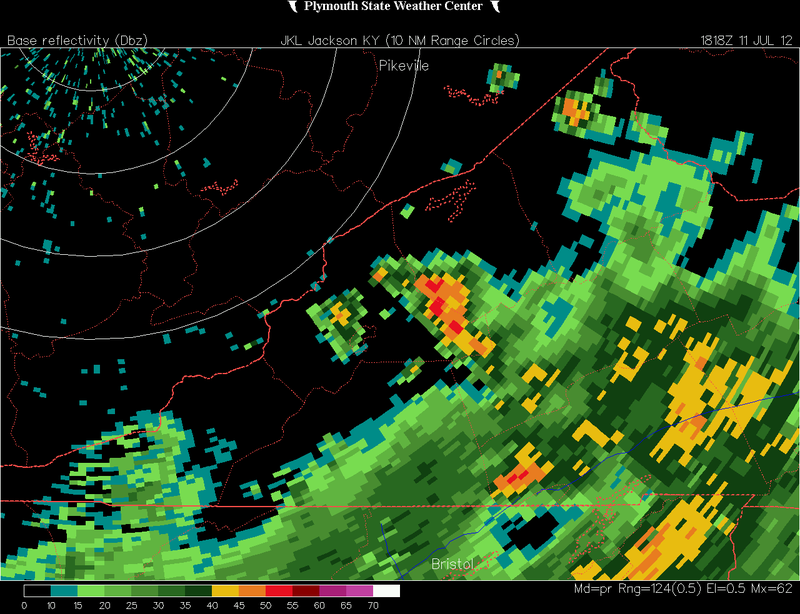 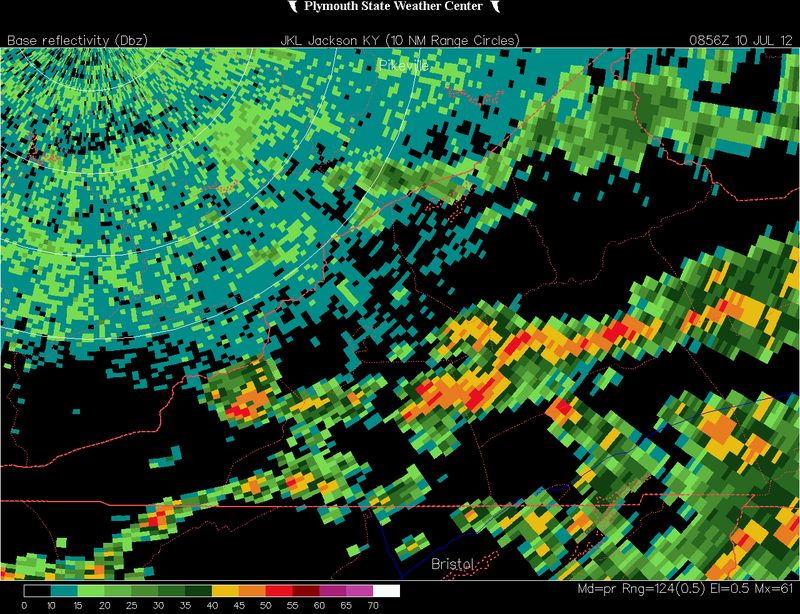 The first significant hit being over northeastern Dickenson County. 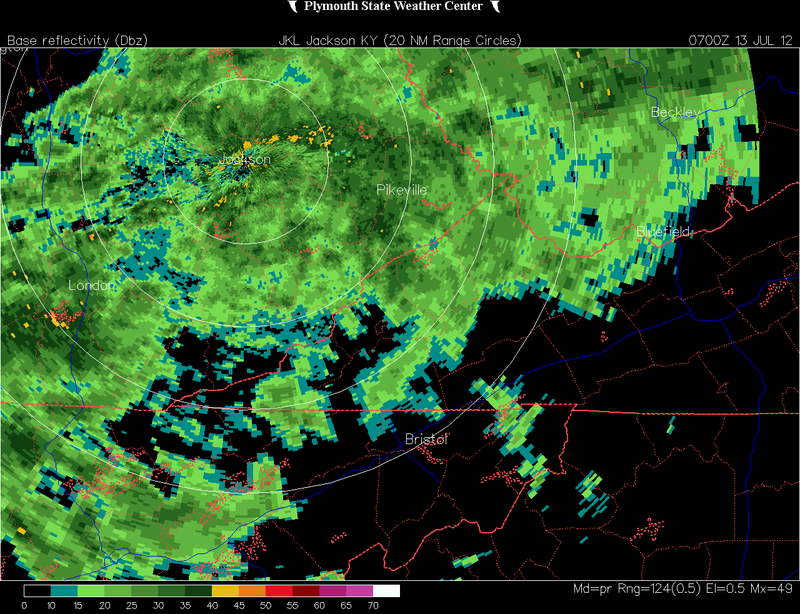 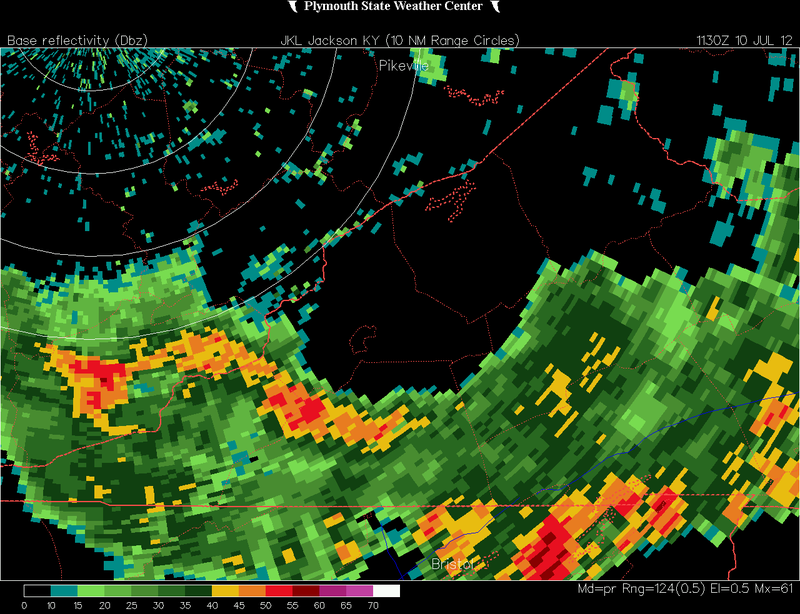 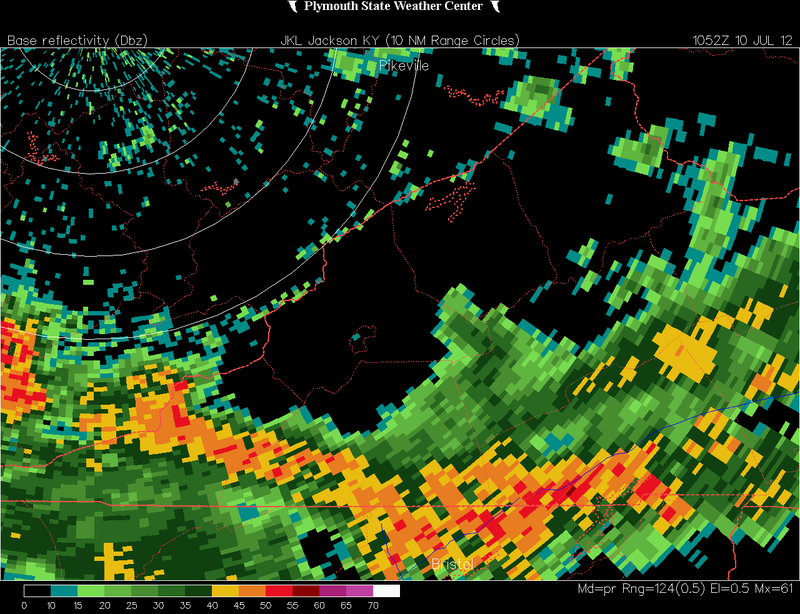 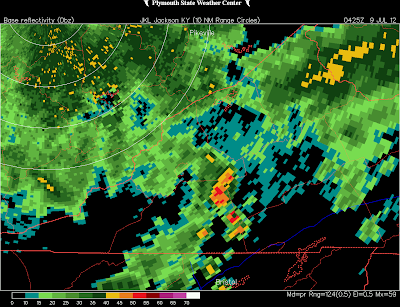 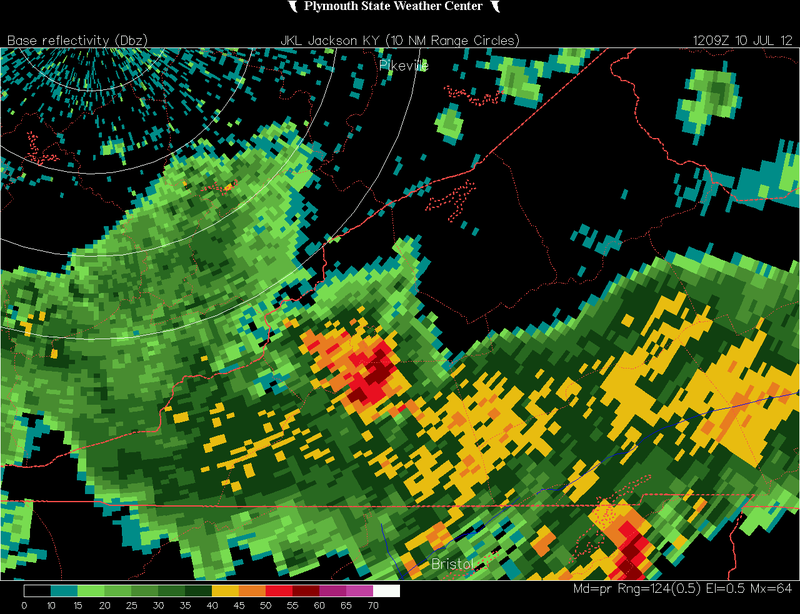 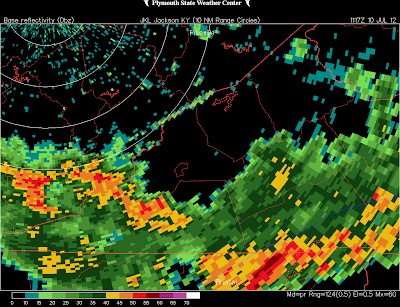 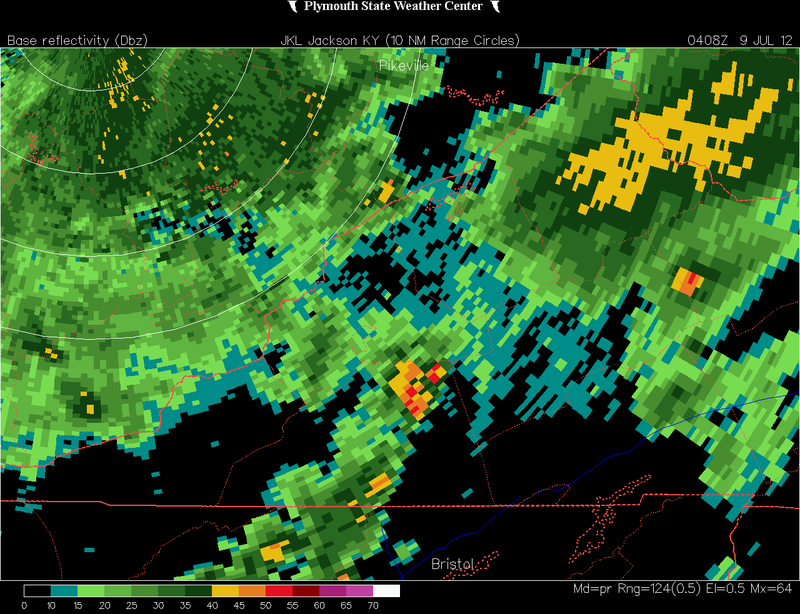 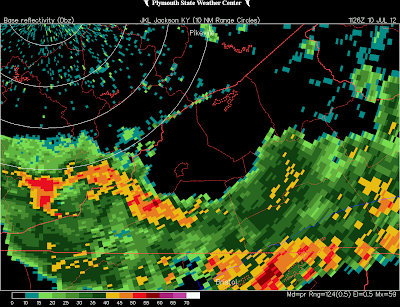 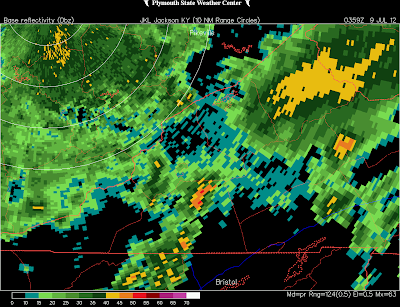 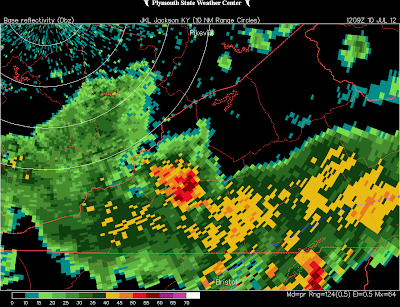 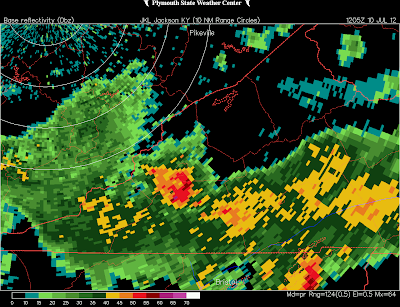 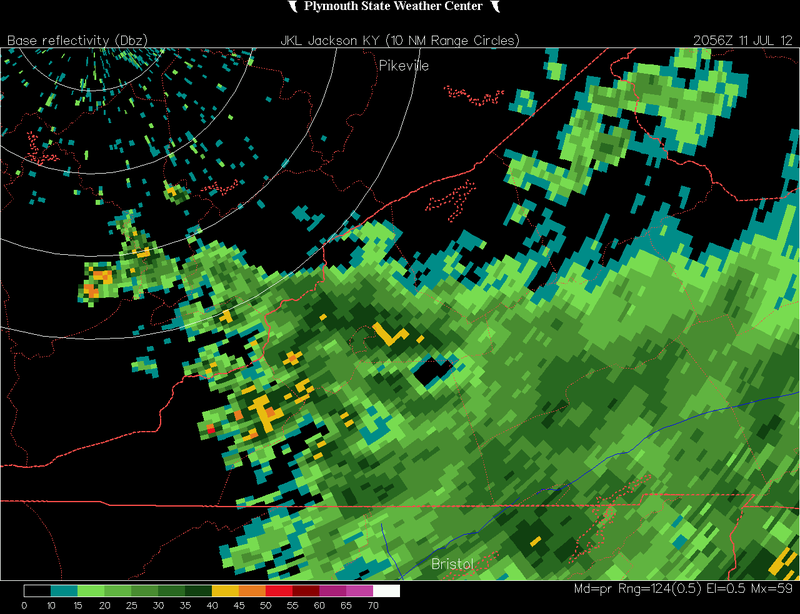 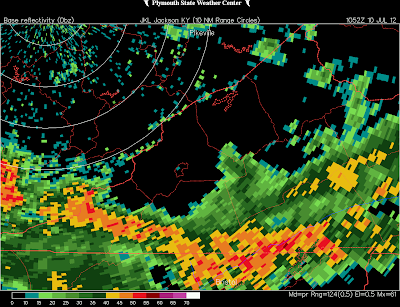 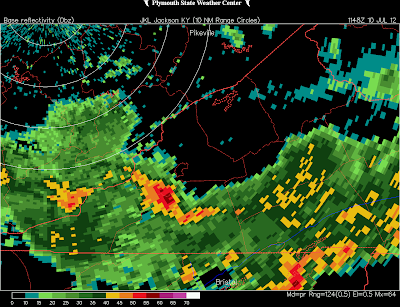 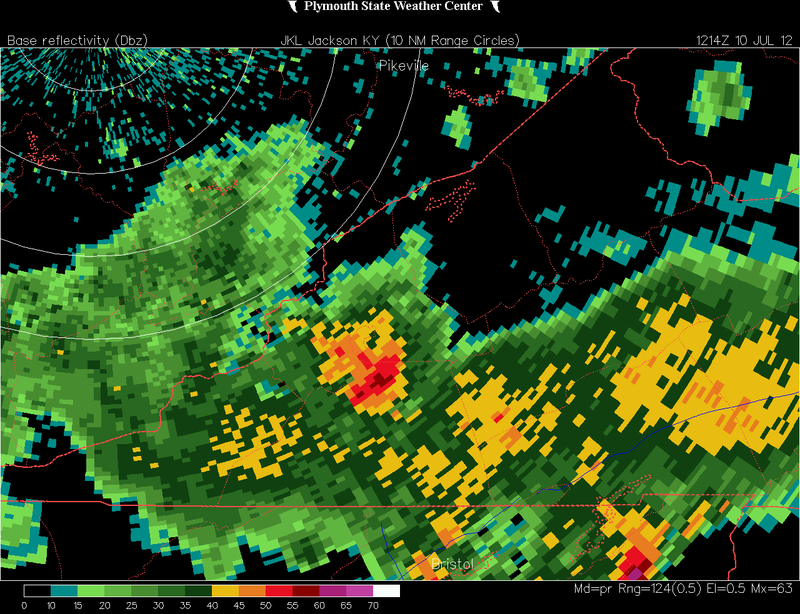 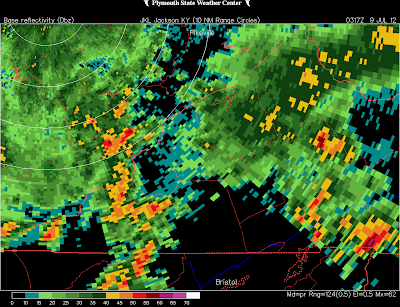 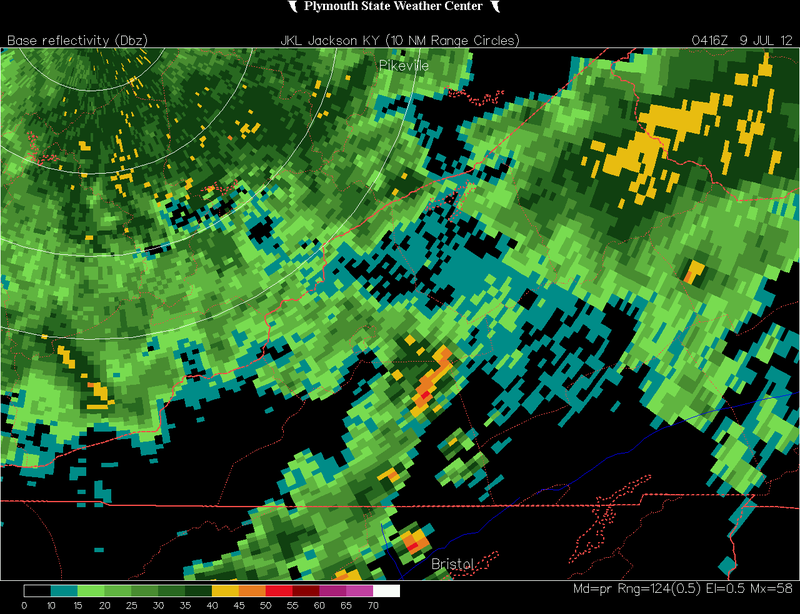 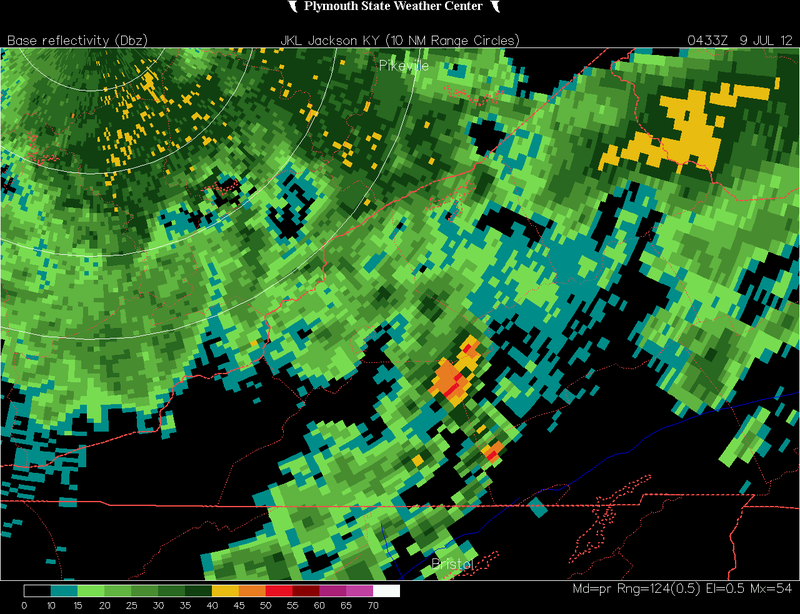 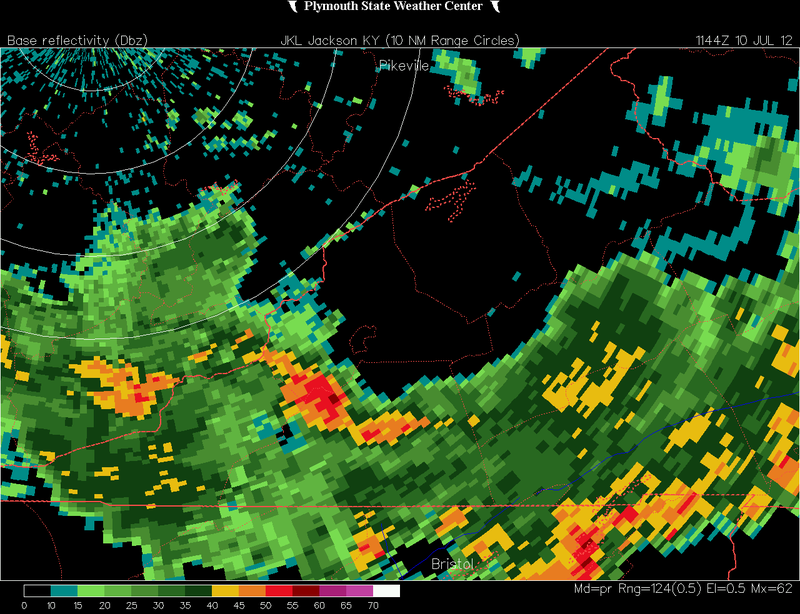 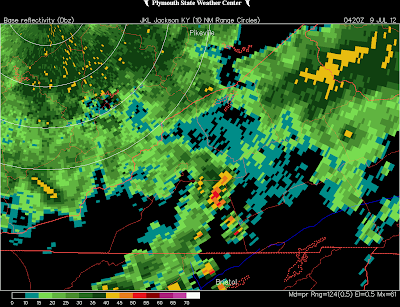 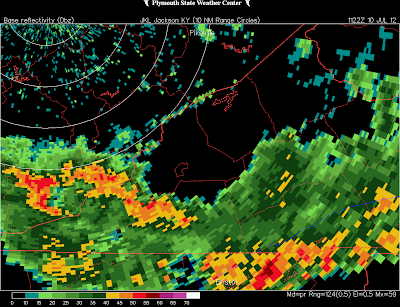 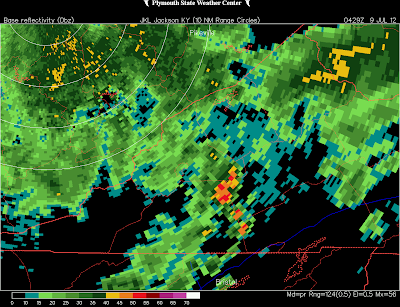 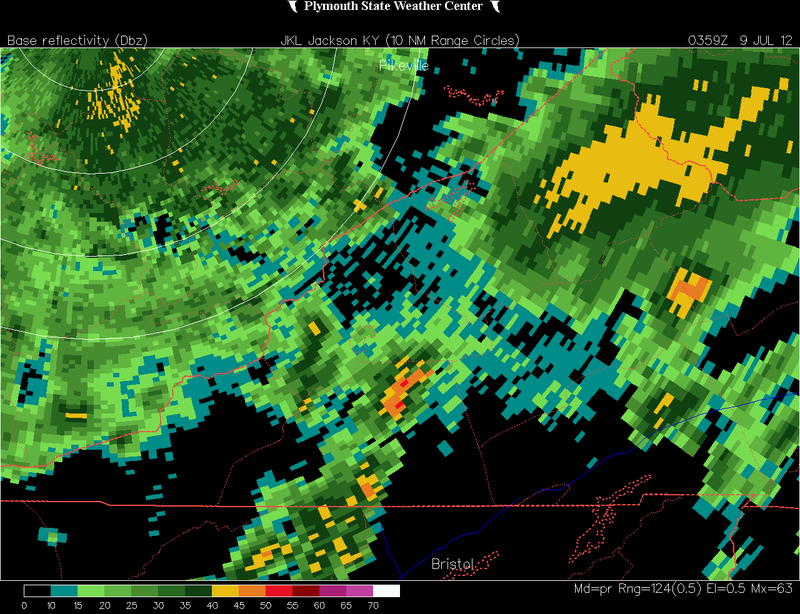 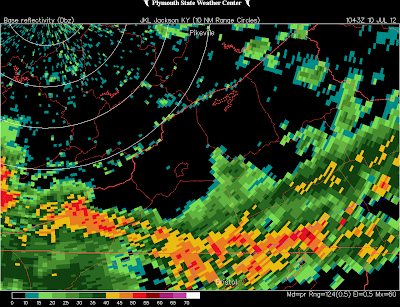 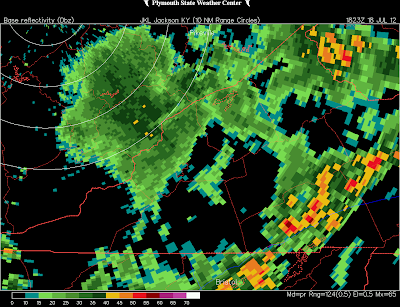 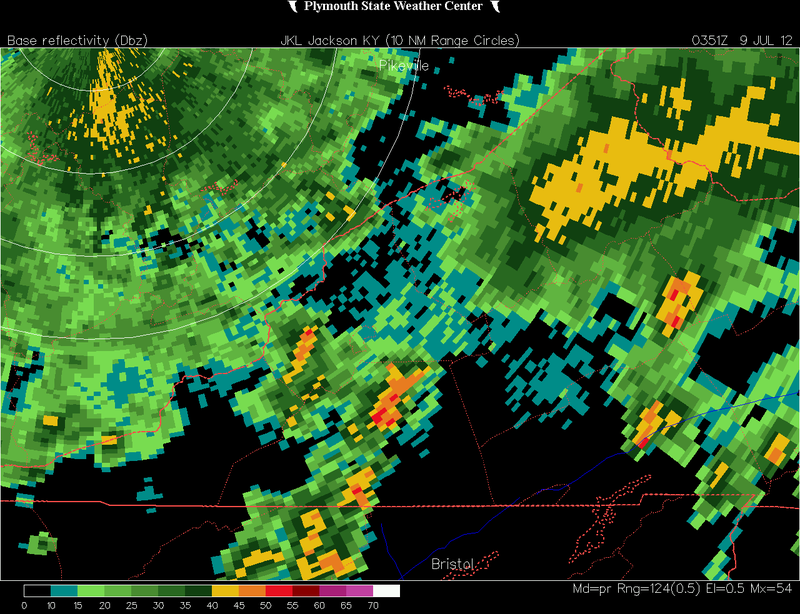 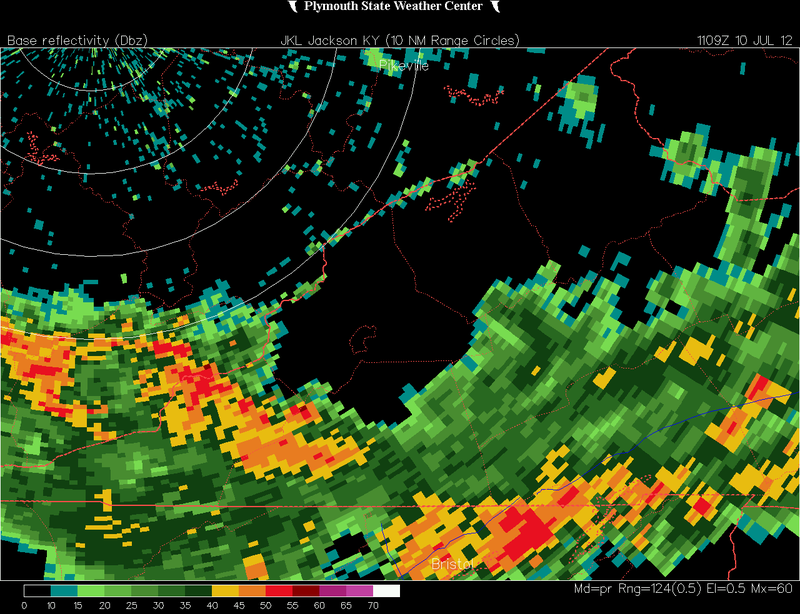 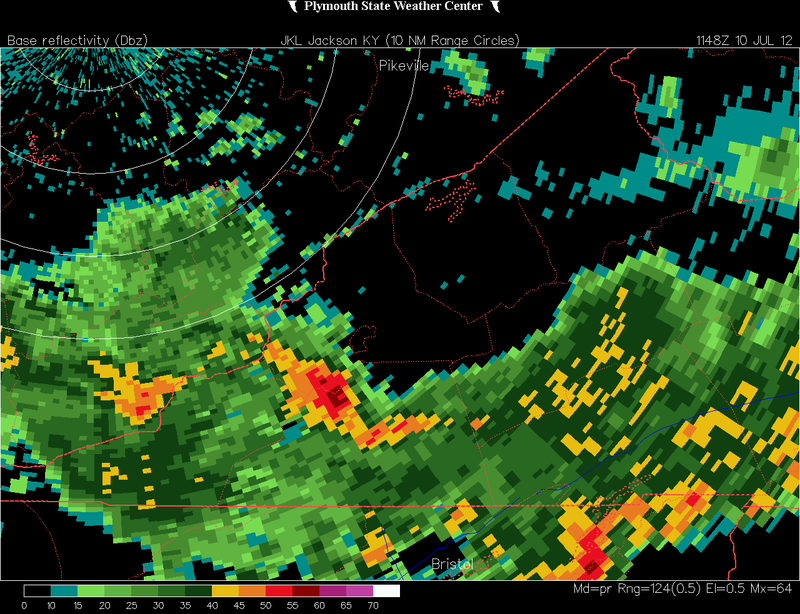 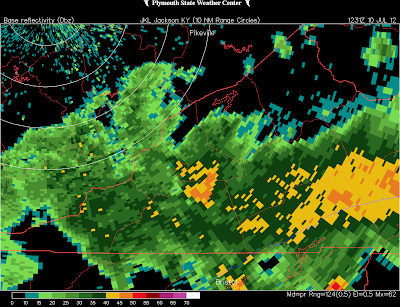 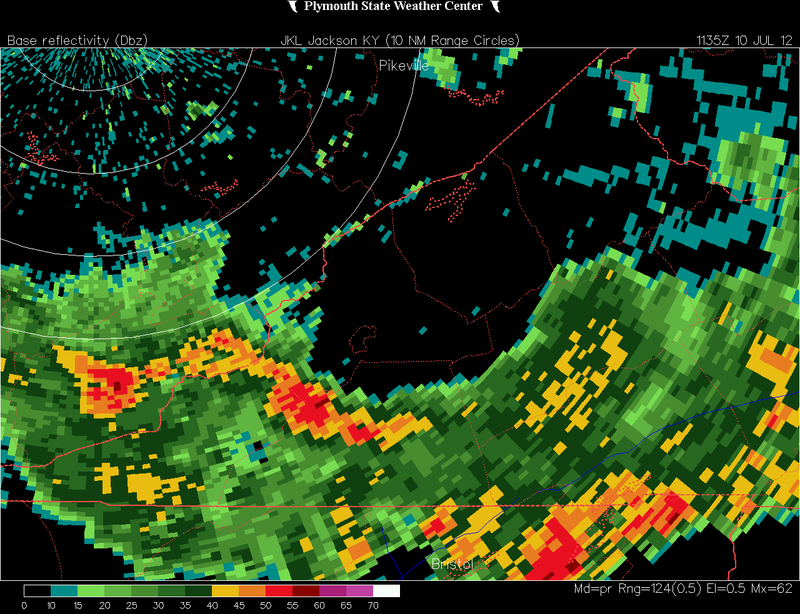 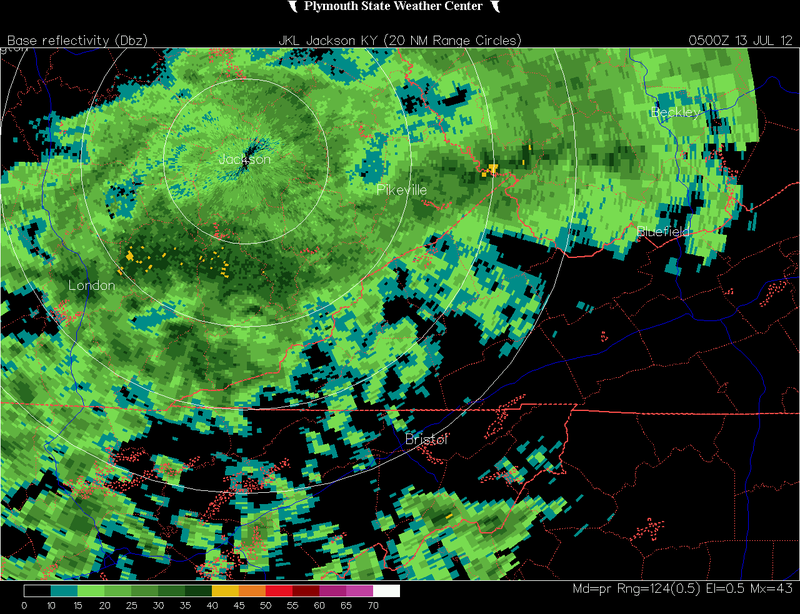 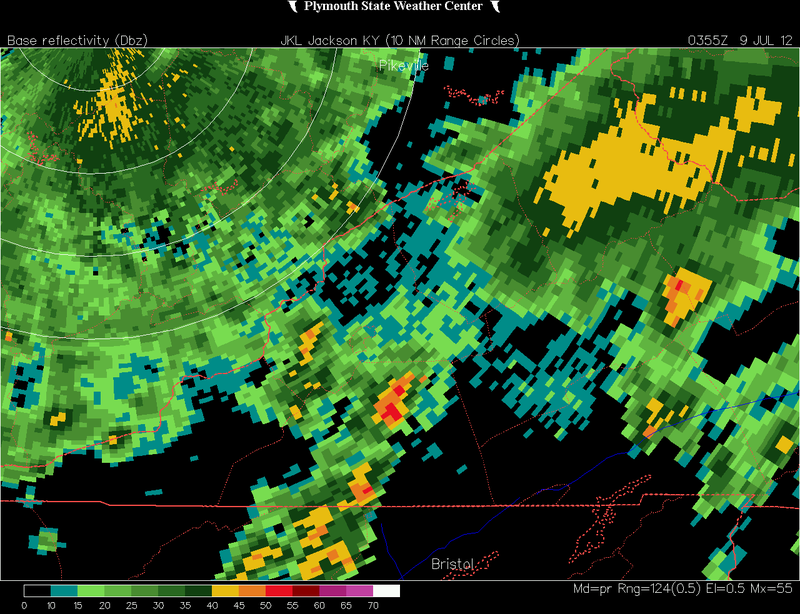 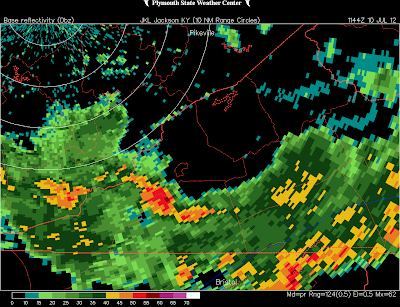 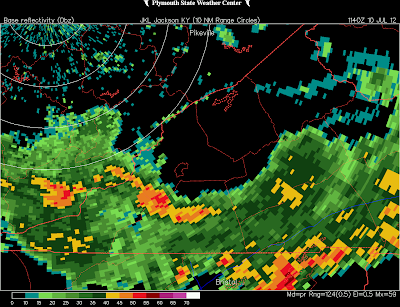 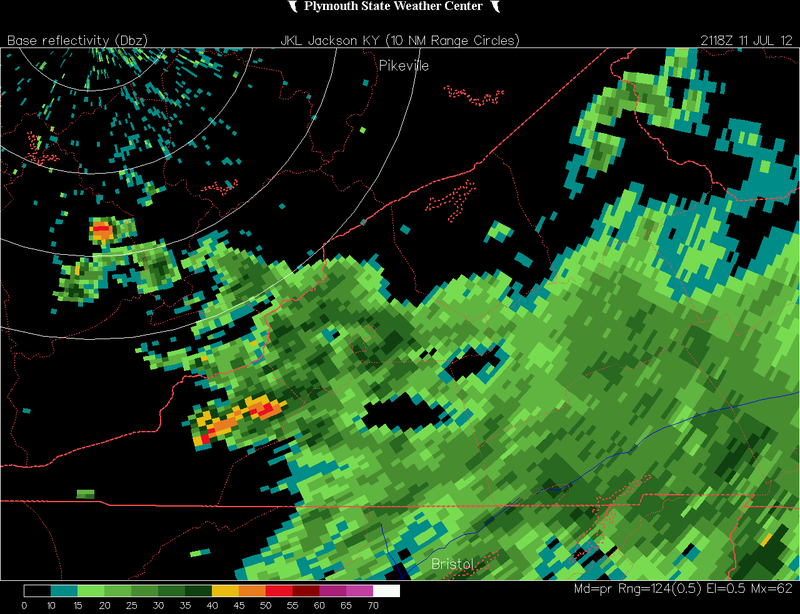 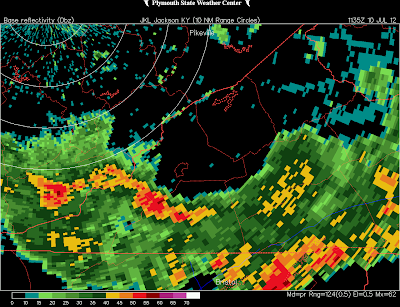 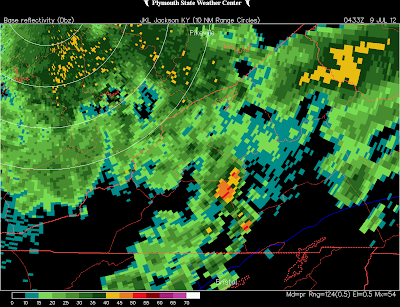 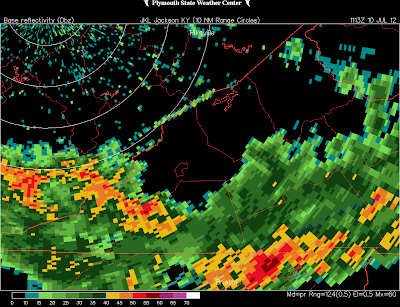 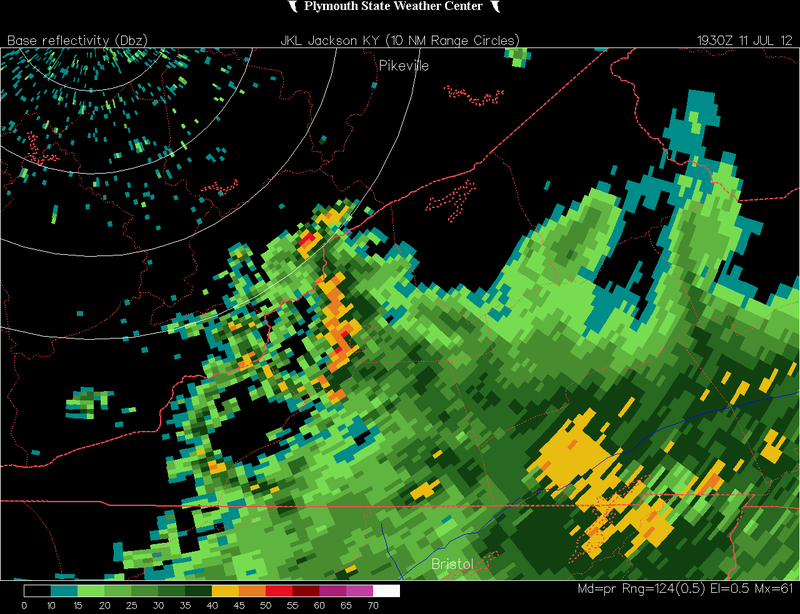 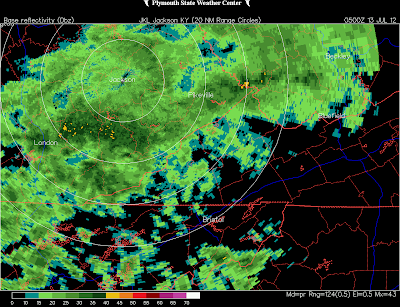 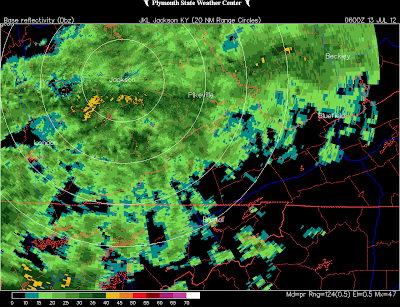 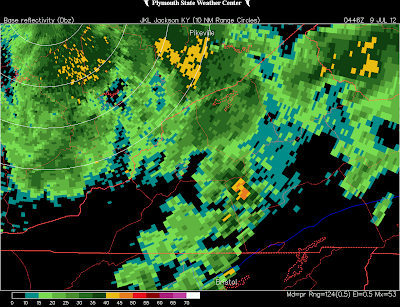 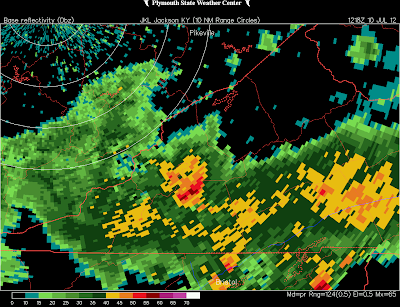 ( heaviest rainfall flanking Big Cherry Basin ). 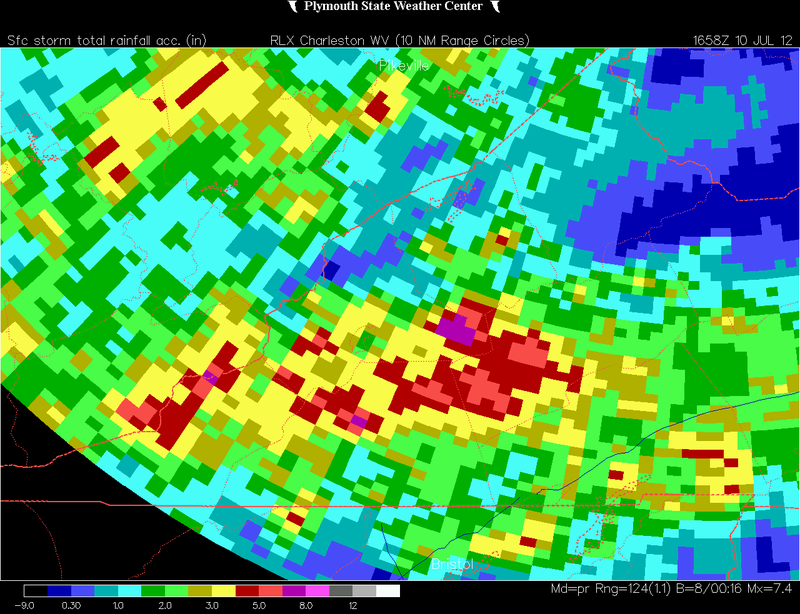 Another area of excessive rainfall was centered south of Darwin along the Dickenson-Wise border. is located at the Bristol label on the map near Boone Lake, with the actual City of Bristol to the northeast along the VA-TN border ). 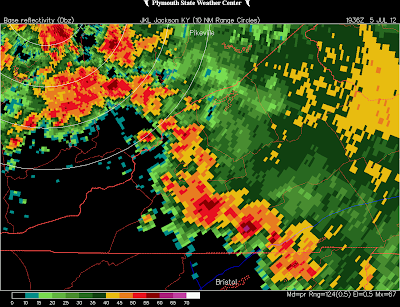 *The formation of bow echoes leeward of the High Knob Massif has been documented many times in the past amid this type of NW airflow pattern ( analogous to bows that develop leeward of the Blue Ridge into the Piedmont of Virginia-North Carolina given specific parameters ). 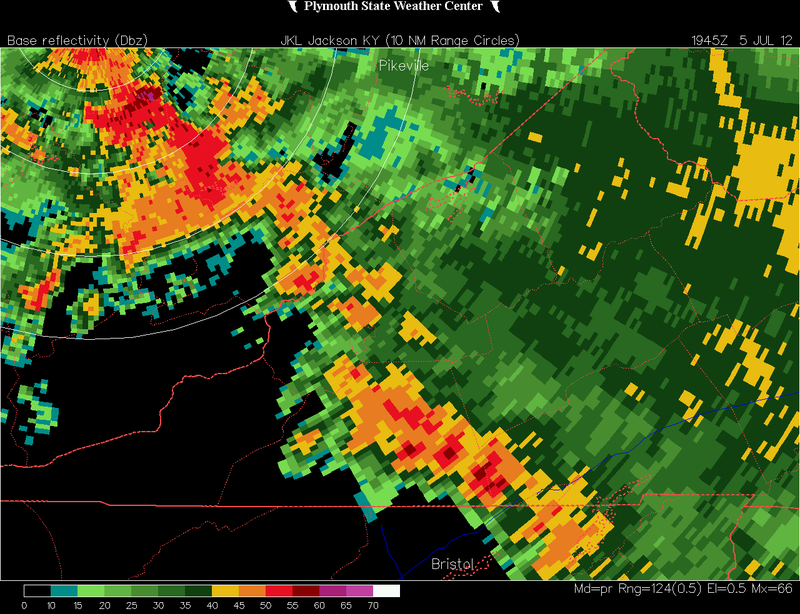 In other words, not all such thunderstorm clusters develop bows with vertical atmospheric conditions across the mountains, upstream and to their lee, modulating their behavior. 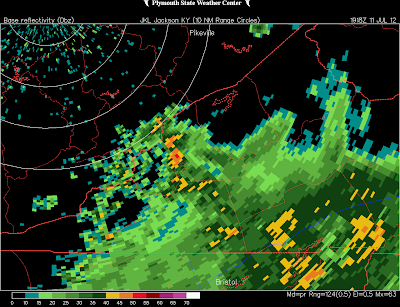 3:00 to 4:00 PM period over Wise County. ( visible at lower left on Doppler frames ). 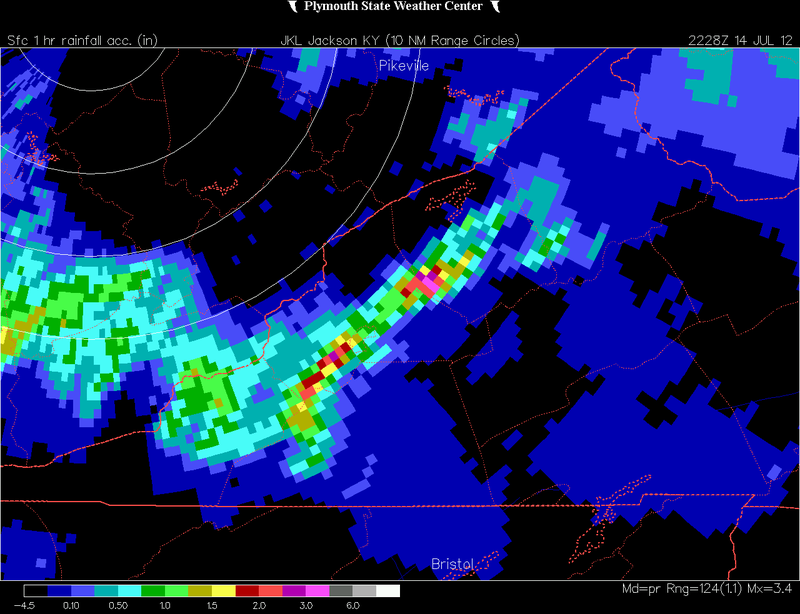 These torrential rainfall rates were well illustrated by Doppler radar, which estimated 1-hour rainfall maxs of more than 3.00" . 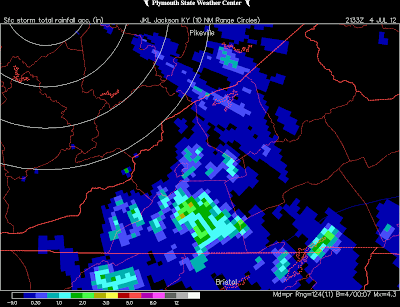 Appalachia Lake Water Plant: 0.83"
Robinson Knob of High Knob Massif: 0.94"
Big Stone Gap Water Plant: 1.68"
*The AWS Weatherbug station is located at Norton Elementary School, 1.4 air mile from the official NWS rain gauge at Norton Water Plant, and has a known under-catch on its rain gauge that averages 15-25% on any given event ( suggesting rainfall this period was in the 2.61" to 2.96" range to support the heavier Doppler estimates over the Norton AWS station ). 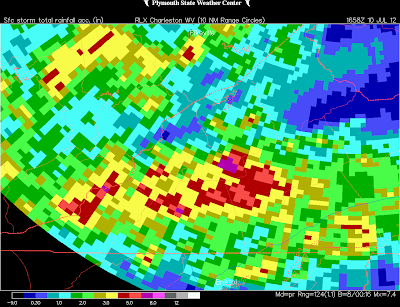 Rainfall once again varied wildly across the area during the July 14-18 period with some of the heaviest rains falling just southwest of the City of Norton, along portions of Little Stone Mountain and Powell Valley of the High Knob Massif, and across western Lee County where local totals reached 4.00"+ amid this time period. 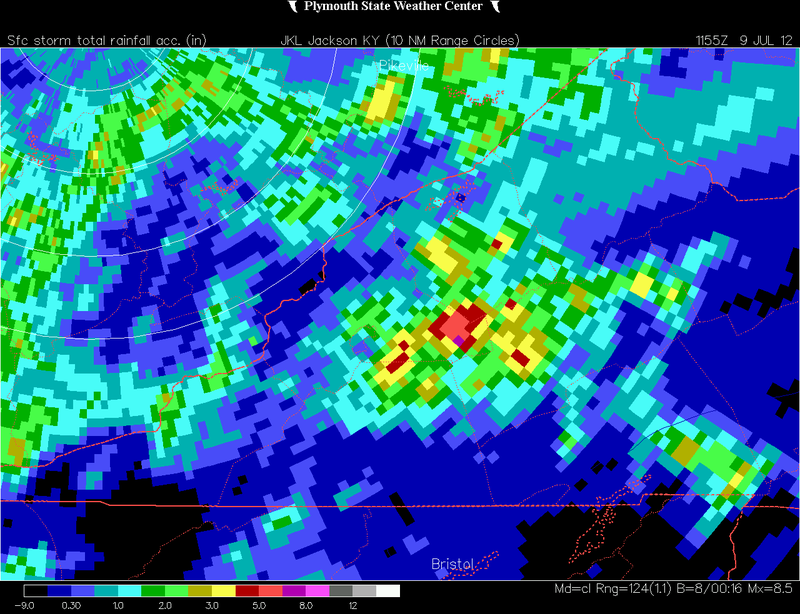 ( Above rainfall totals are not included in the event below ). Development of more heavy rain during July 18 generated a significant flash flood on the Kentucky side of the stateline where the foothills rise upward toward the mountains of the Cumberland Block, just northwest of Pine Mountain in southeastern Perry and Knott counties ( SE of Hazard ). 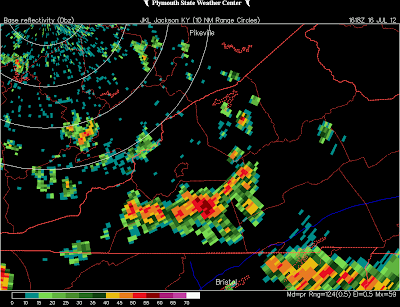 Although thunderstorms developed southeast across the mountains on the Virginia side of the stateline with time, note that a persistent area of heavy rains lingered with backbuilding storms along the northwest flank of an expanding precipitation field ( upshear development with nearly stationary motion along the southeastern edge of the Kentucky foothills, northwest of Pine Mountain and the Cumberland Overthrust Block ).